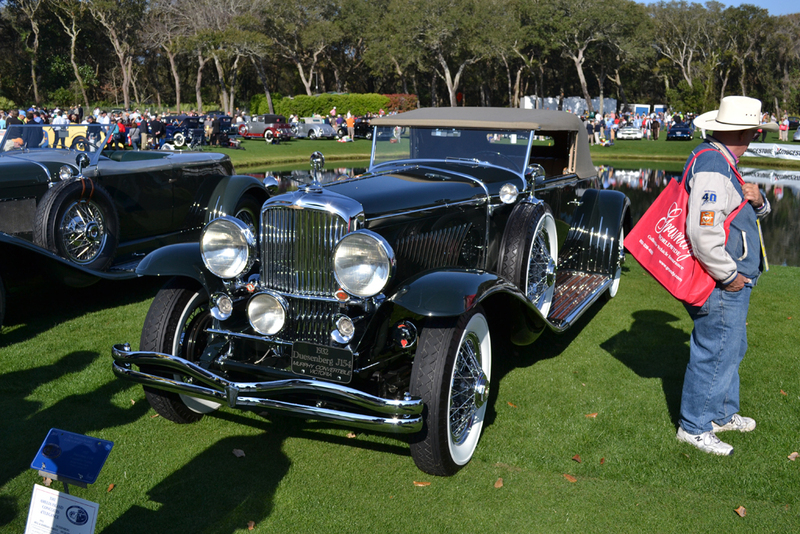 In the past several years I have been fortunate enough to take in the full experience of one of the world’s most prestigious automotive right here in Jacksonville, Florida’s back yard, Amelia Island. 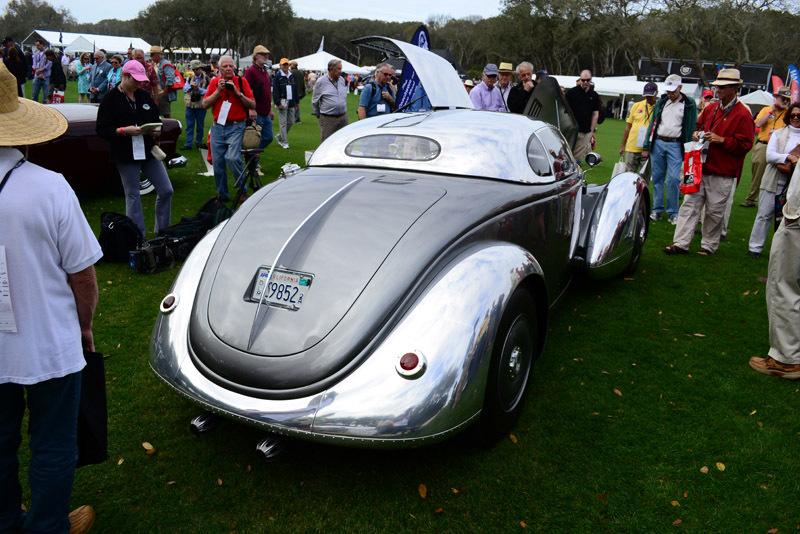 The Amelia Island Concours d’Elegance doesn’t only attract automotive enthusiasts and those who are truly addicted to the automotive culture, you can expect to see curiosity at an unprecedented level from virtually every walk of life. 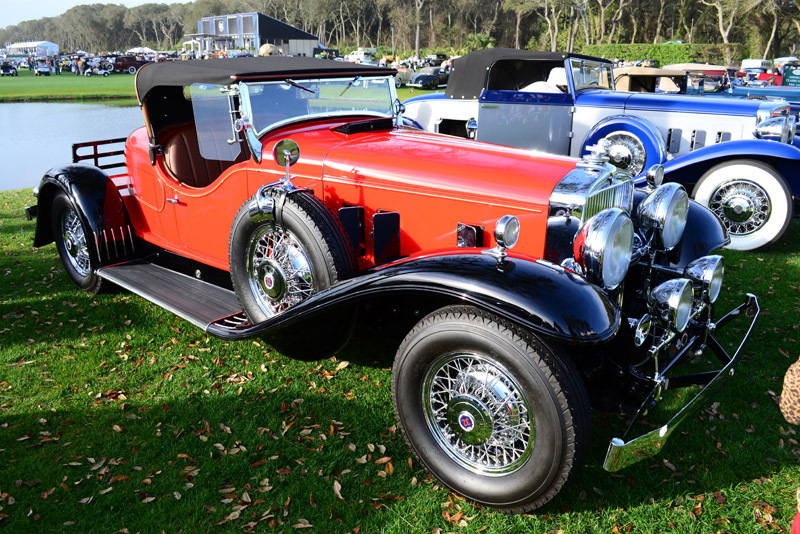 Mostly due to the stature of the vehicles on display, dating back from the conception of the automobile to the year 1972, there is something for everyone who has even the slightest recognition of automotive history. 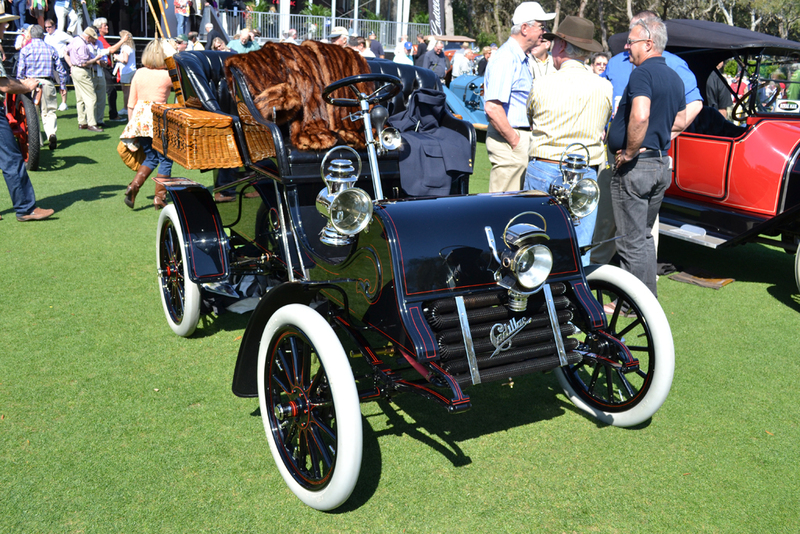 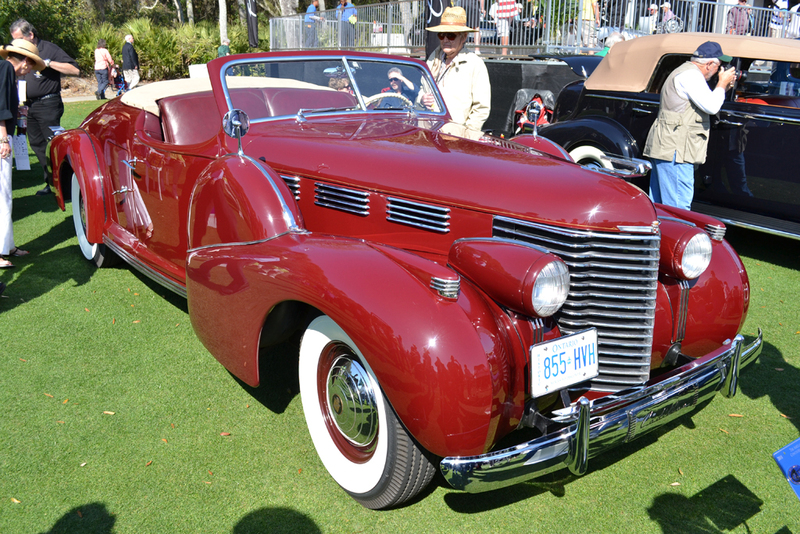 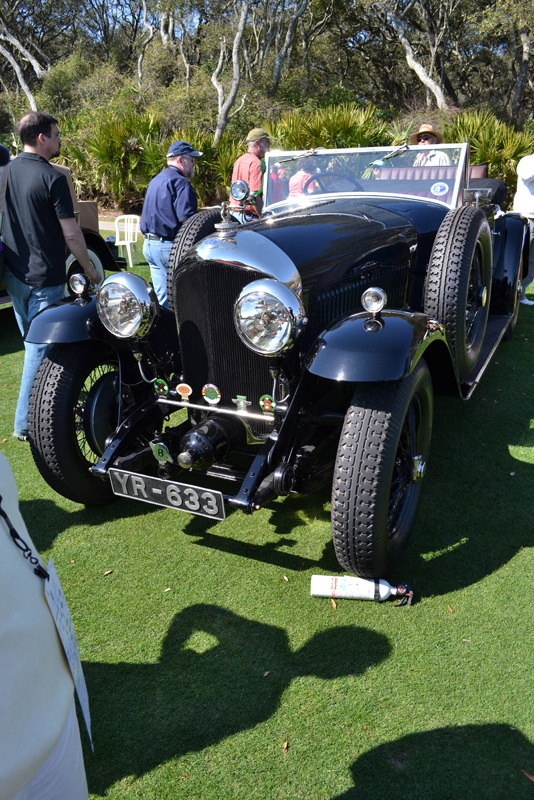 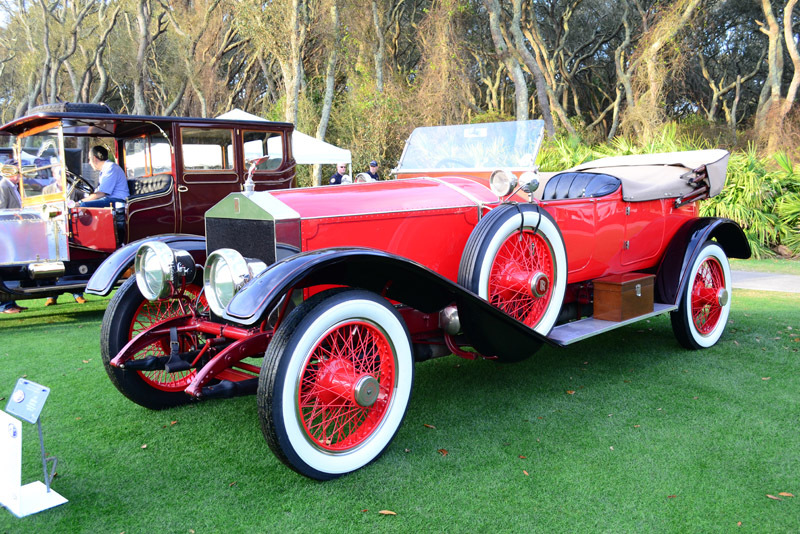 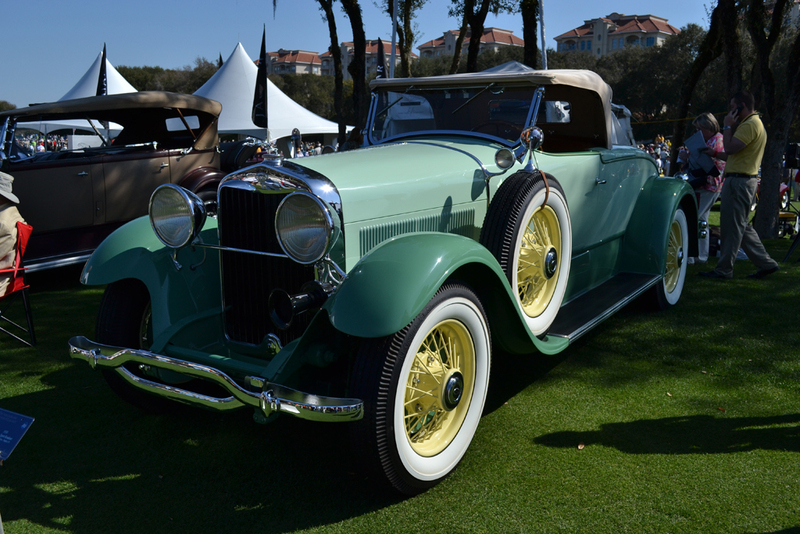 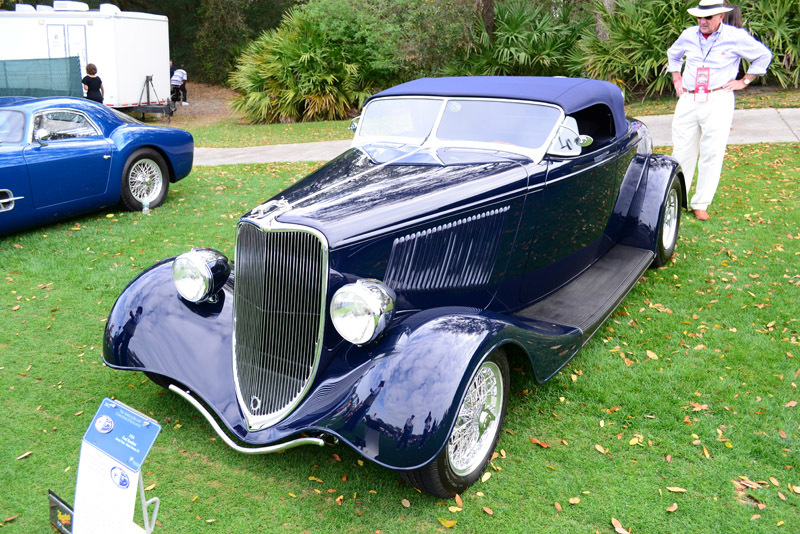 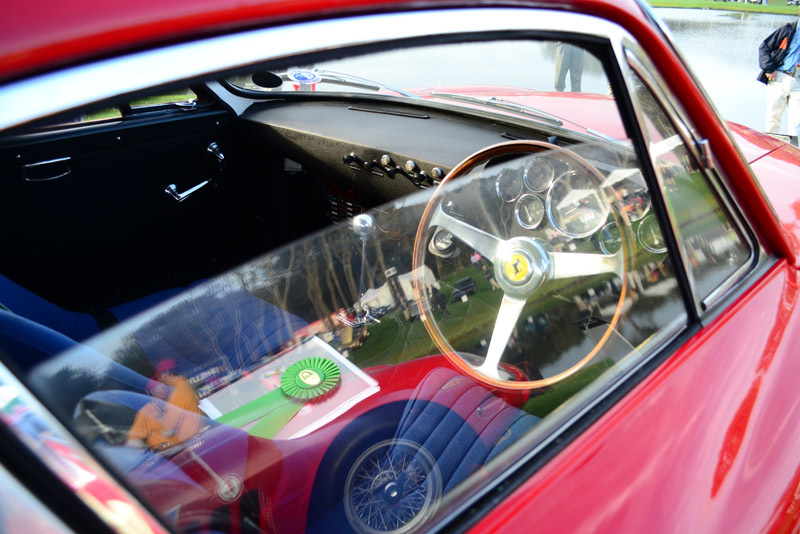 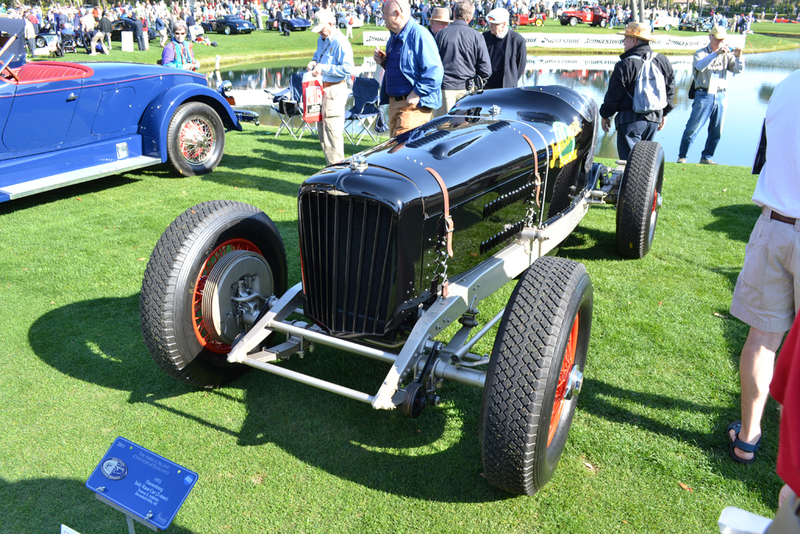 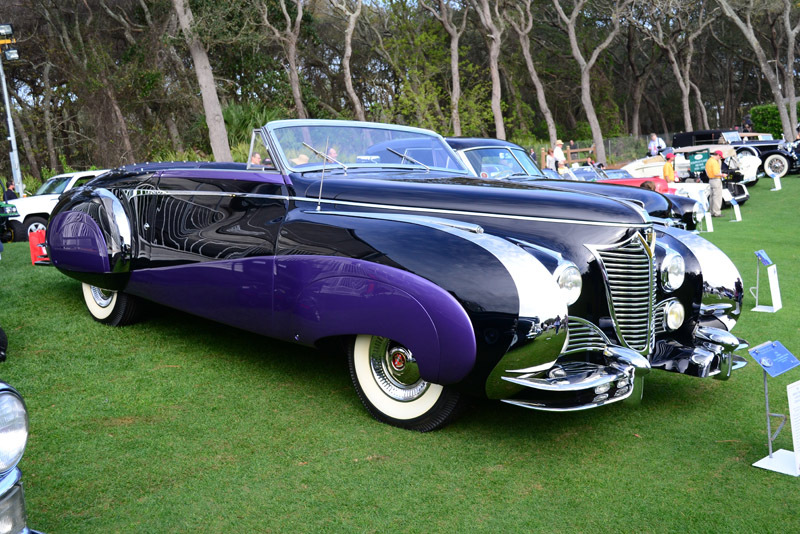 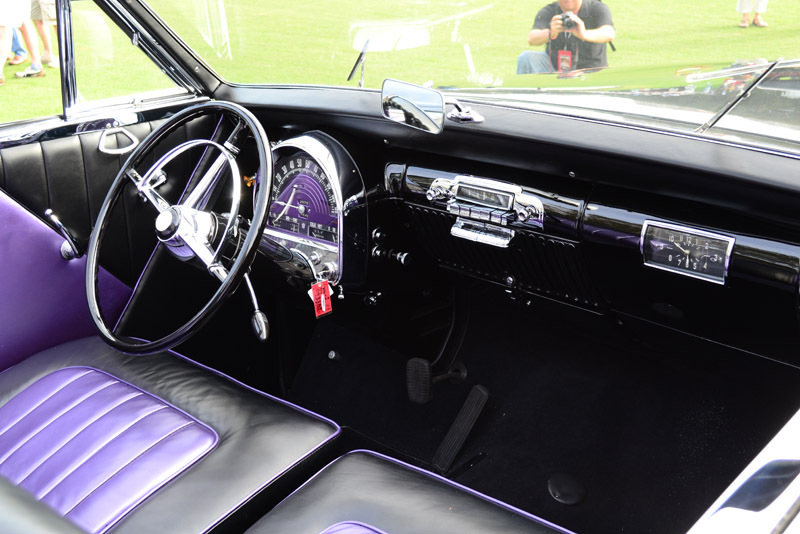 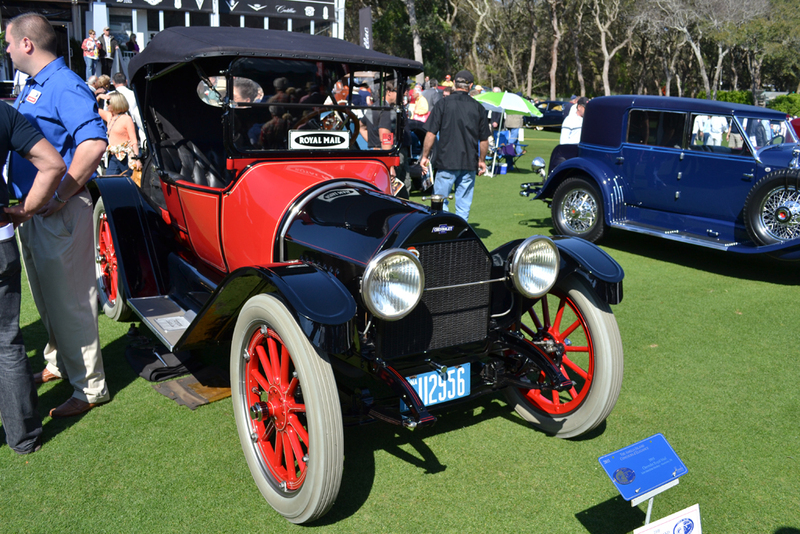 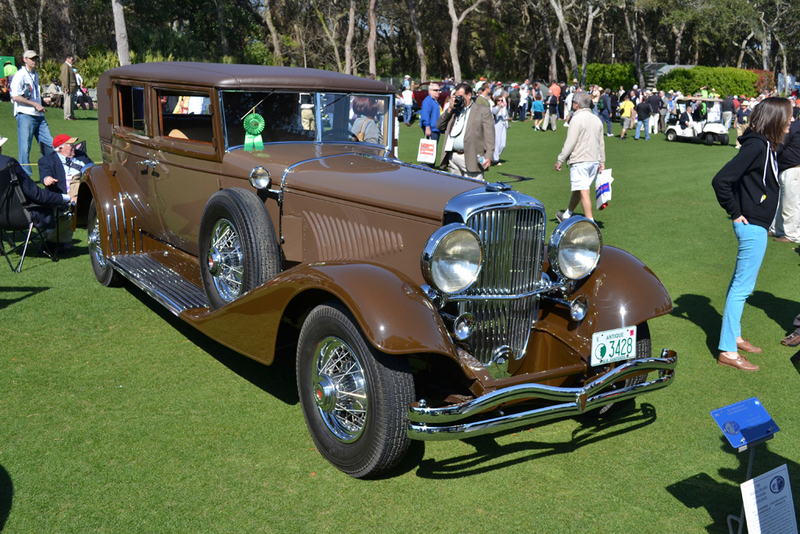 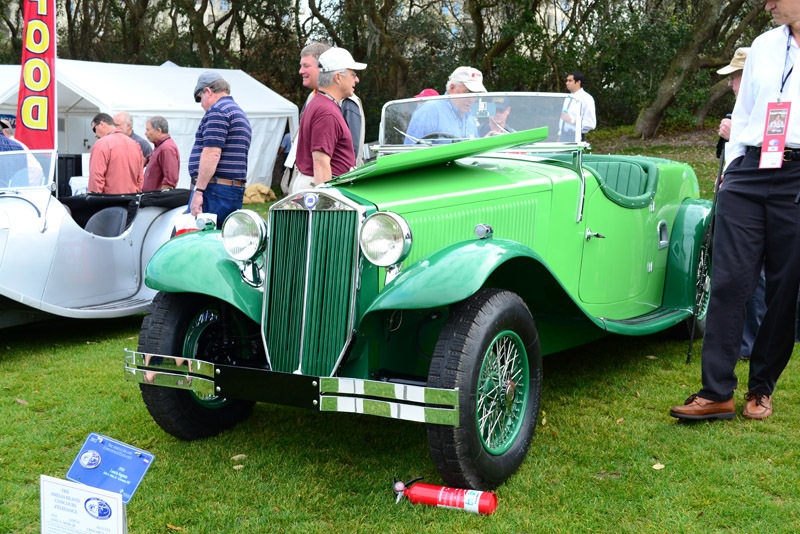 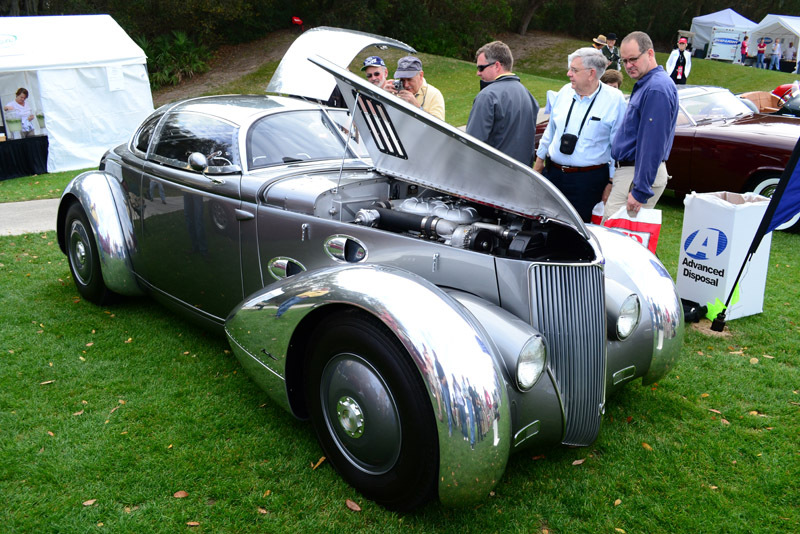 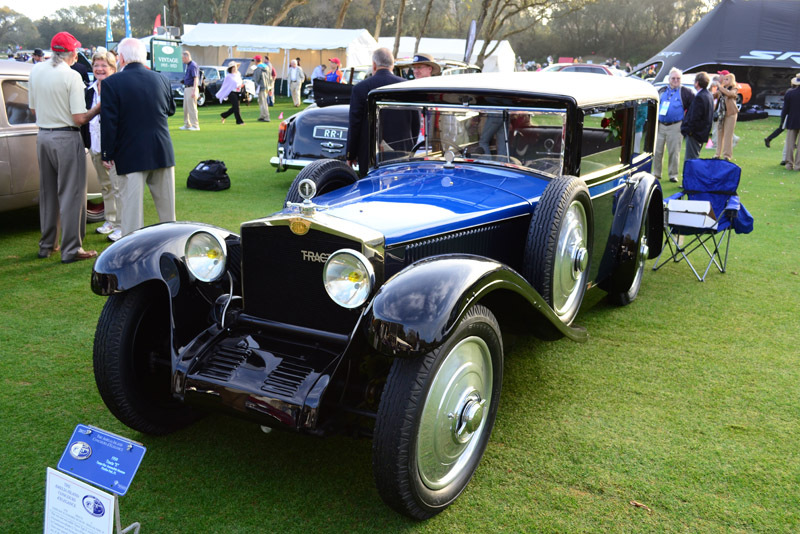 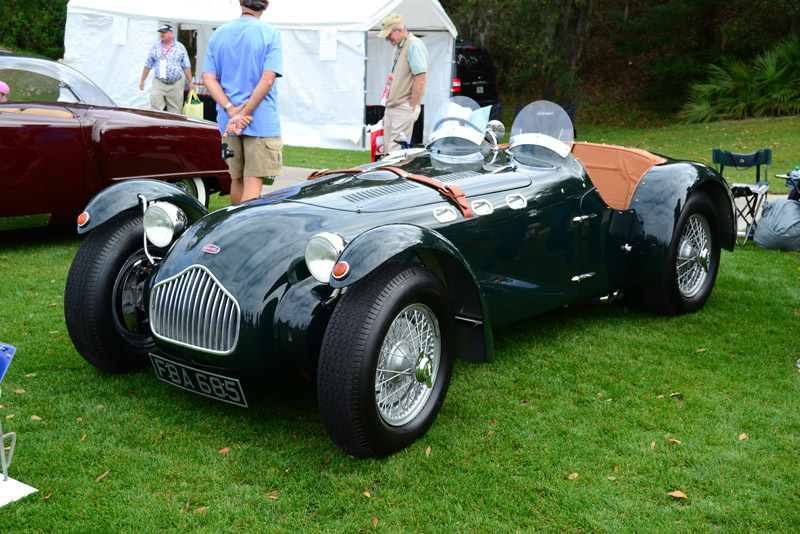 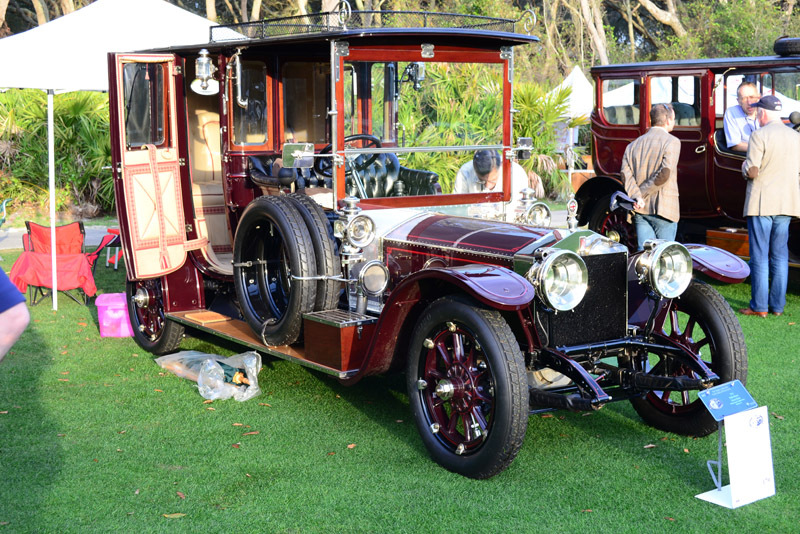 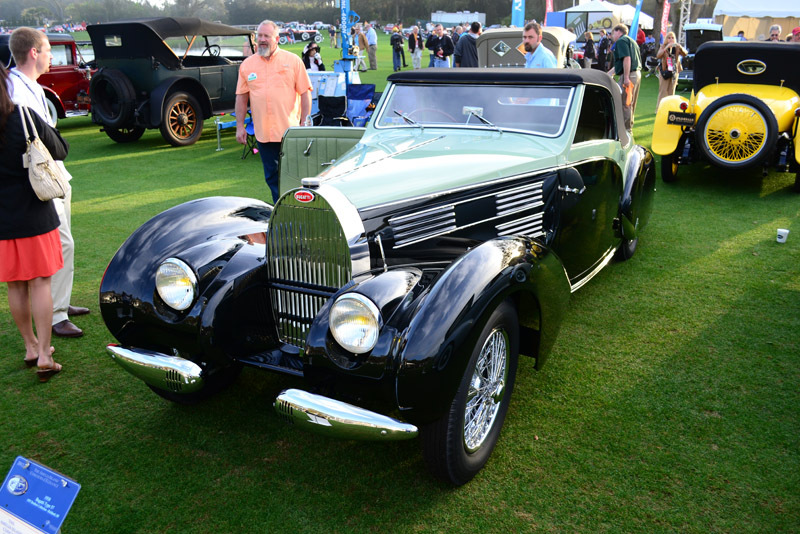 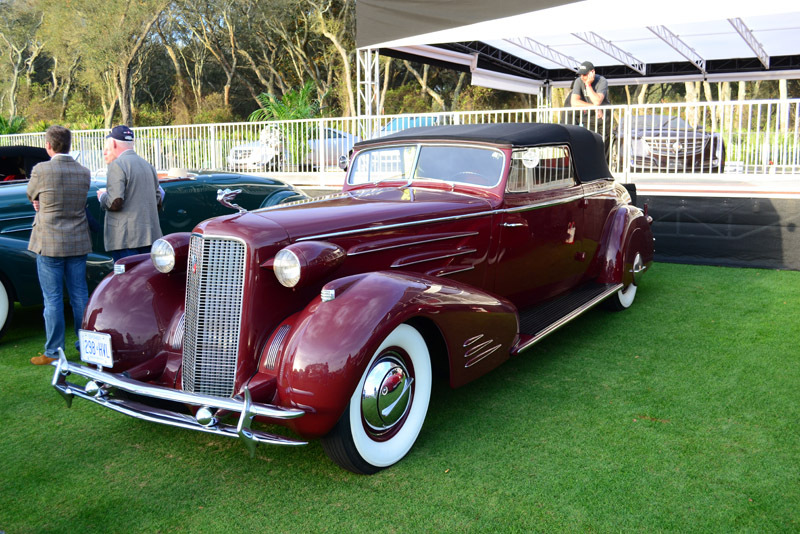 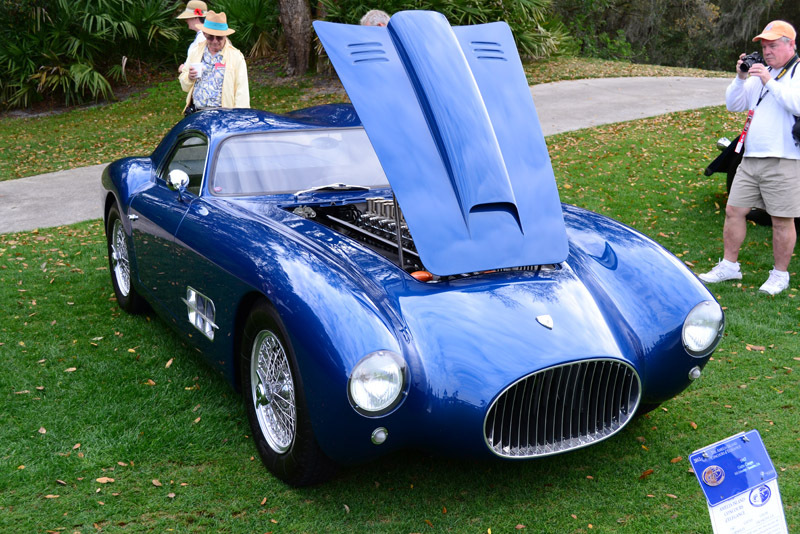 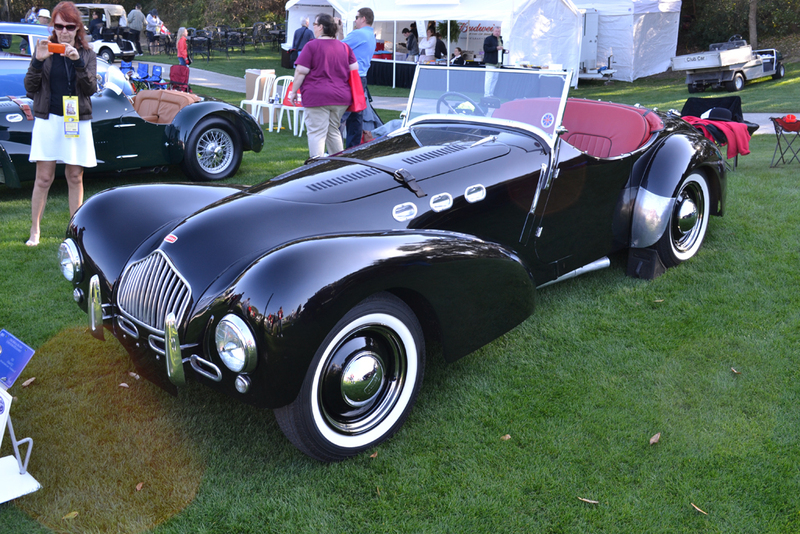 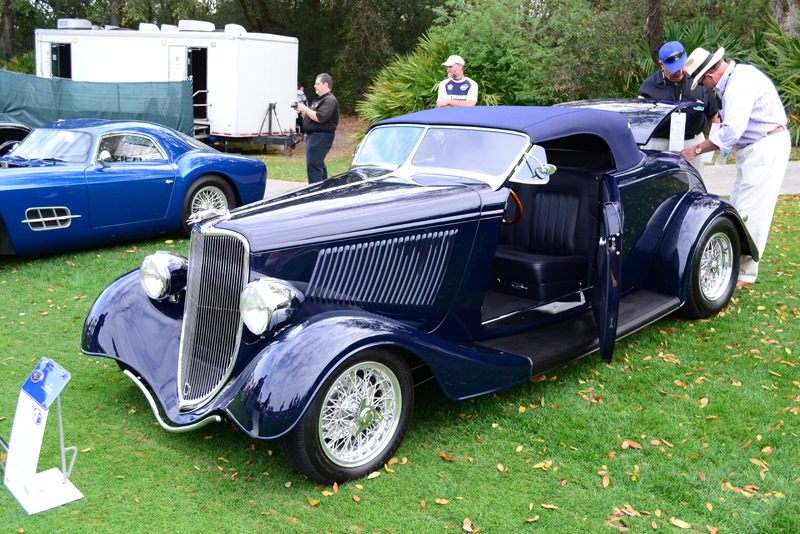 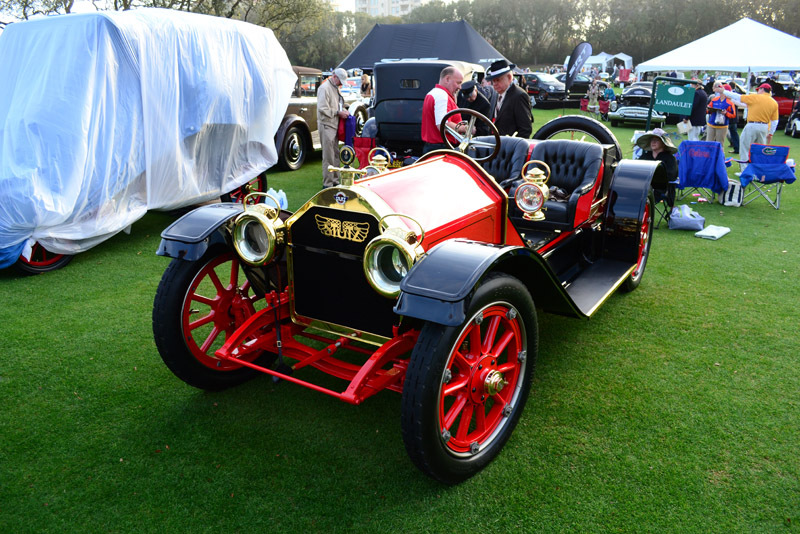 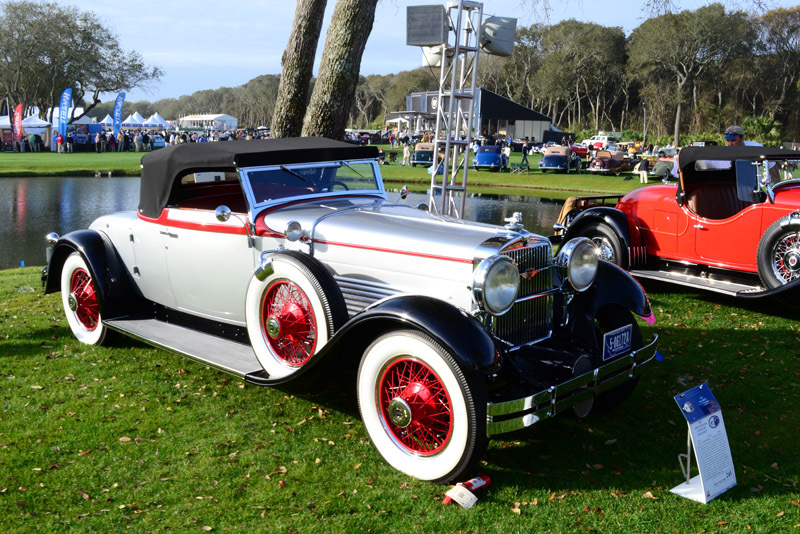 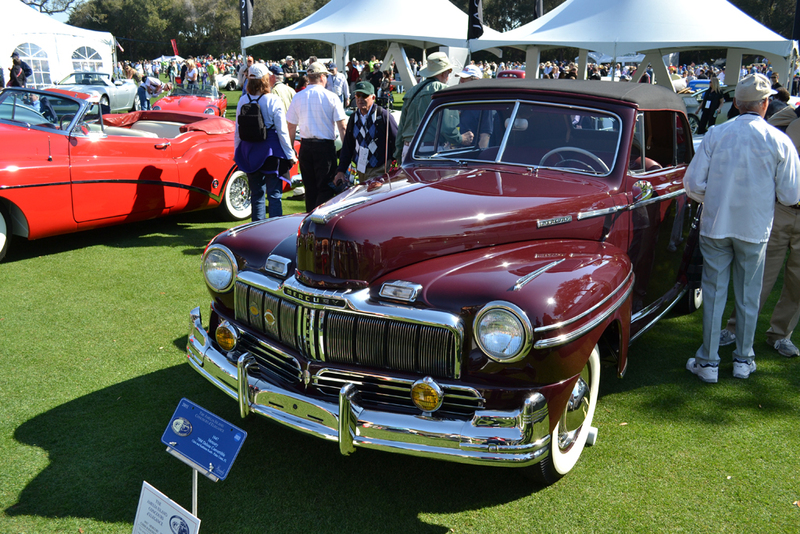 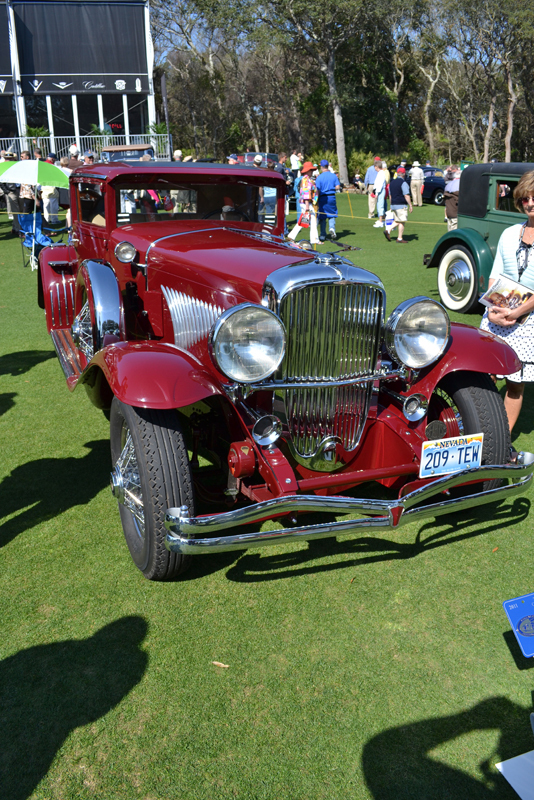 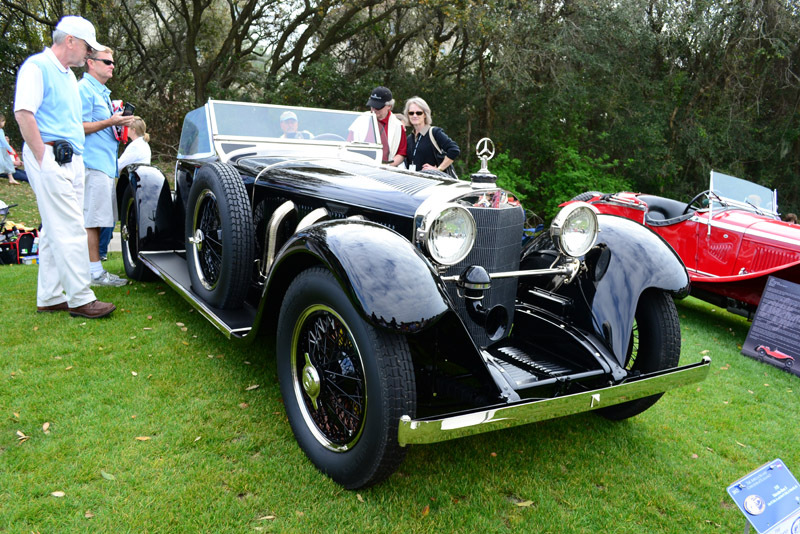 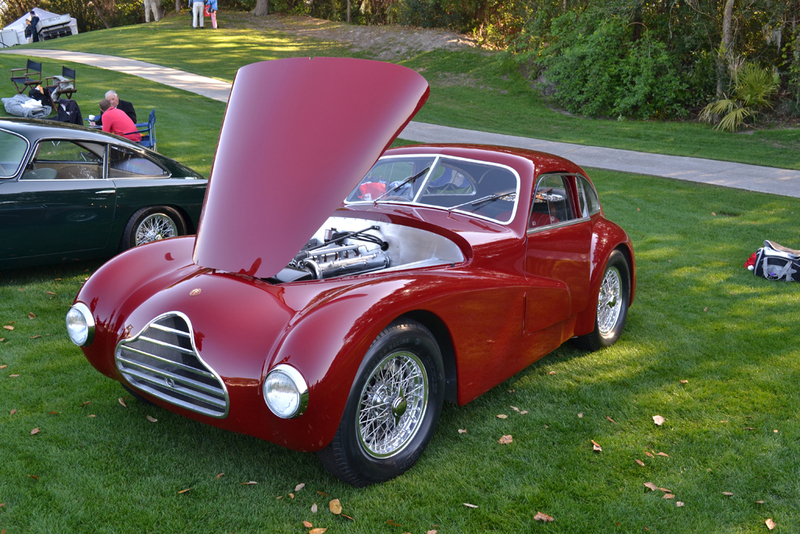 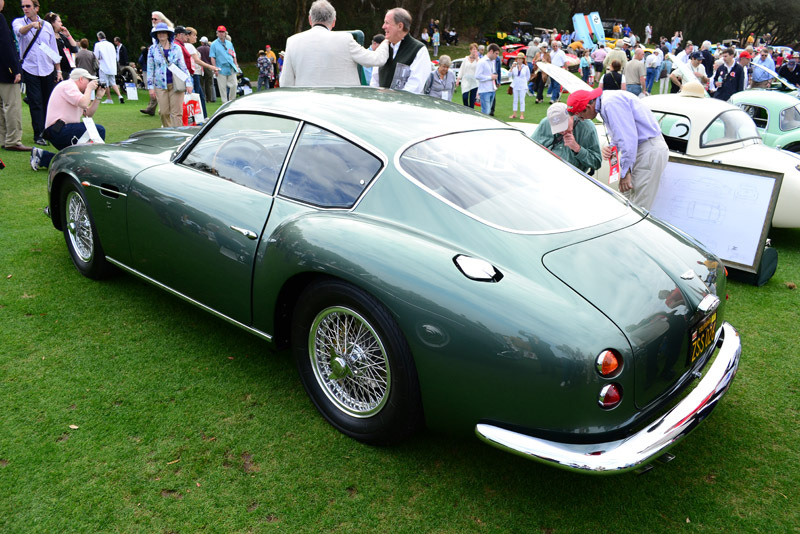 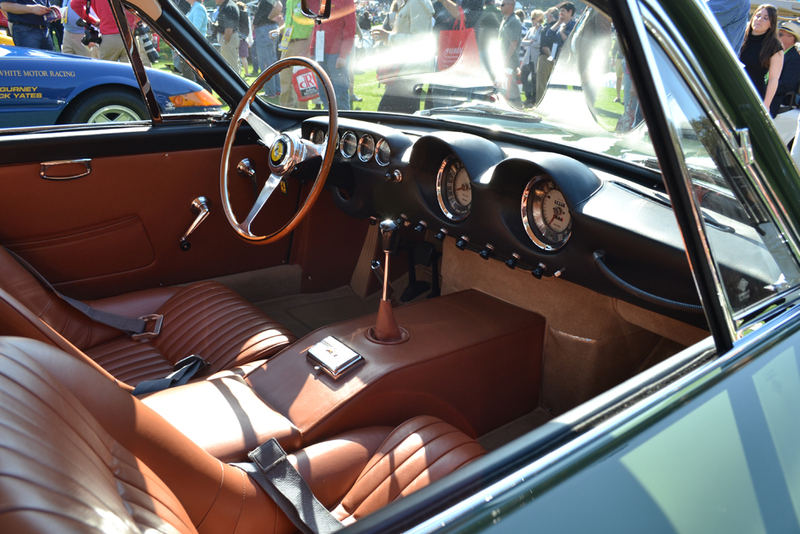 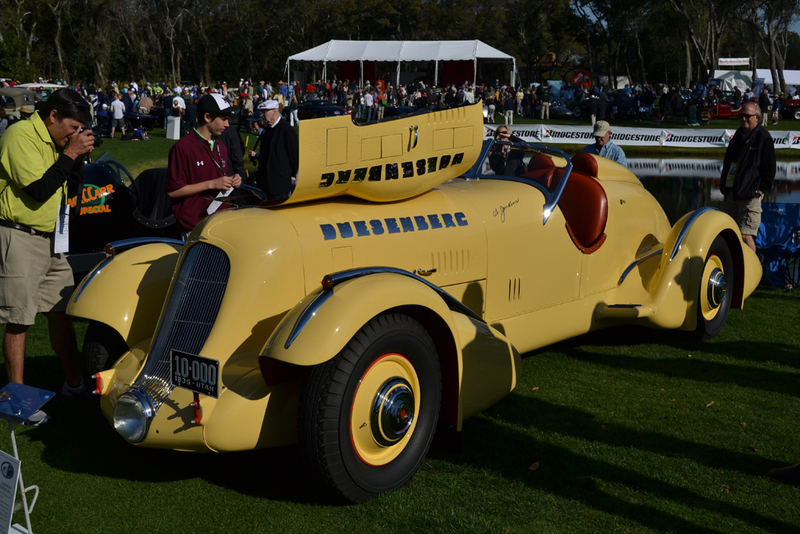 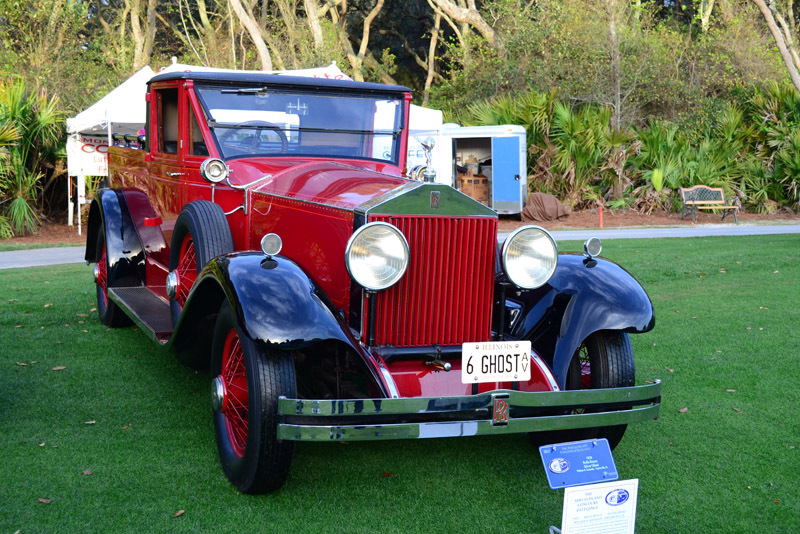 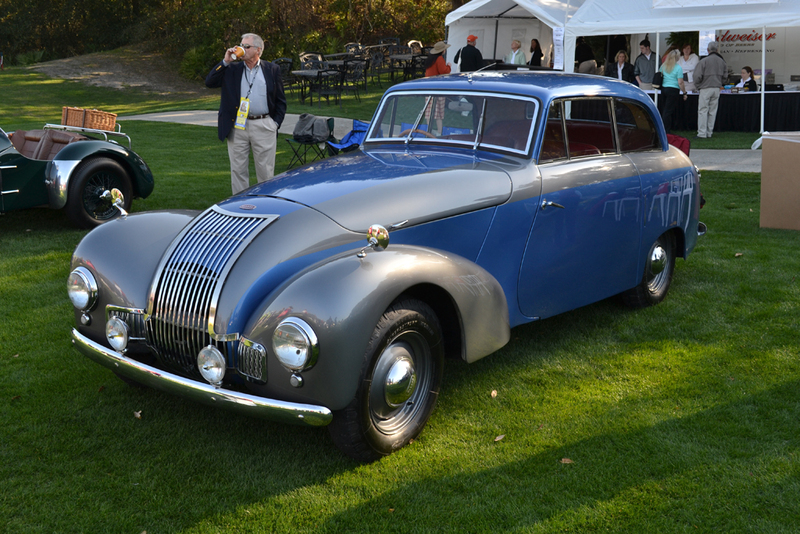 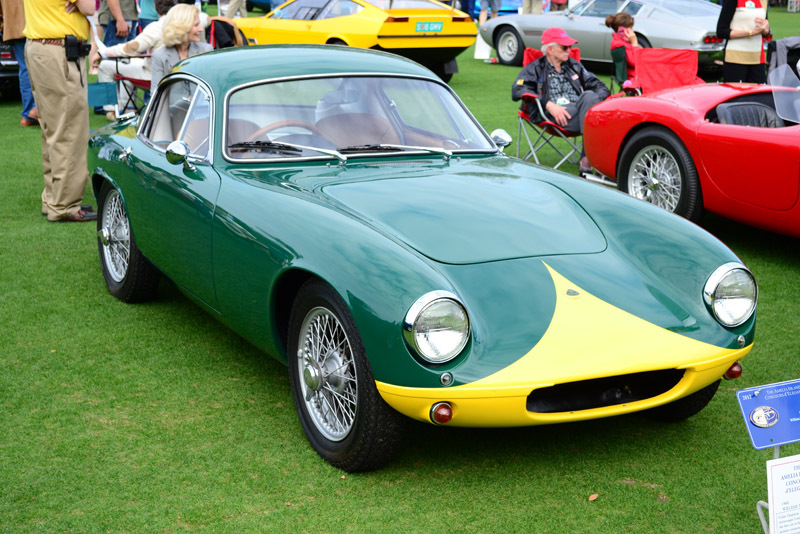 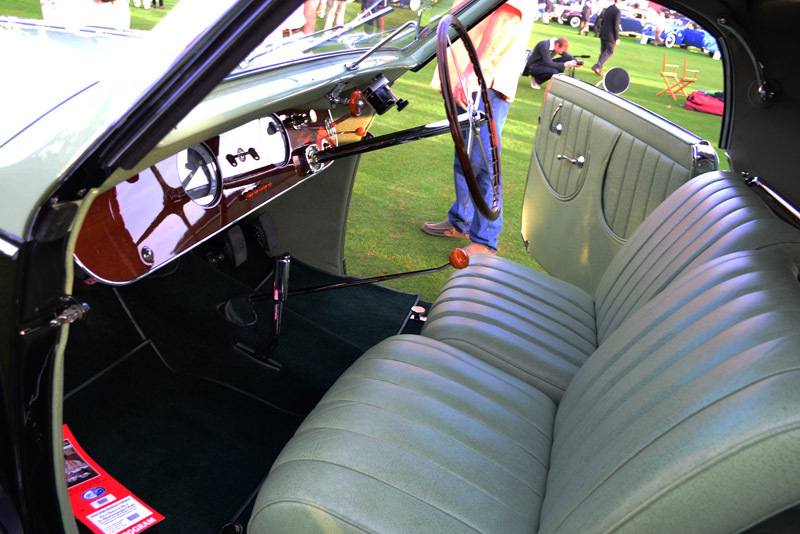 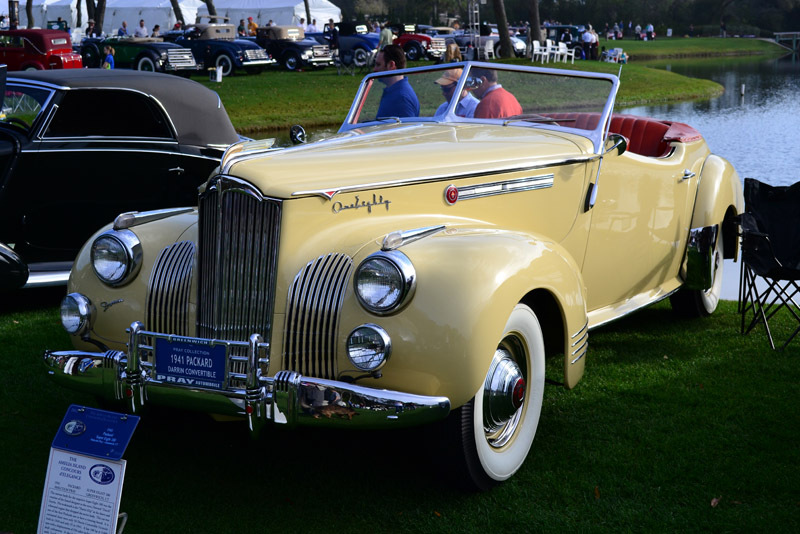 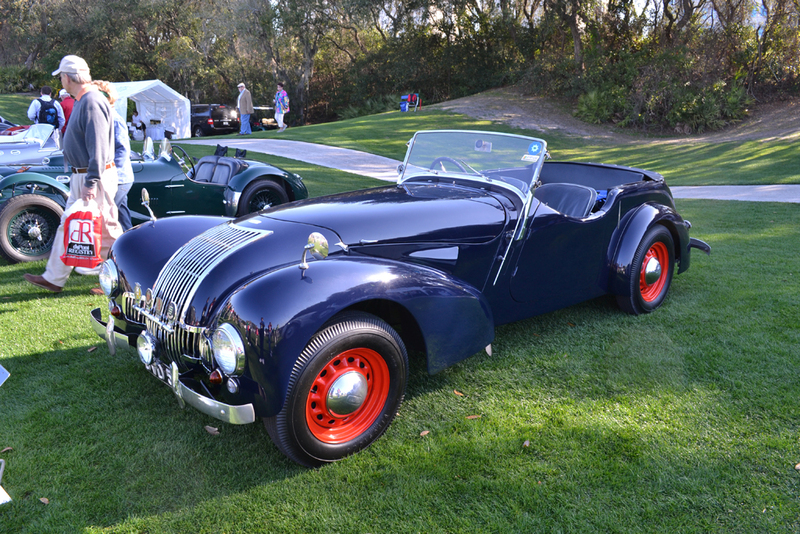 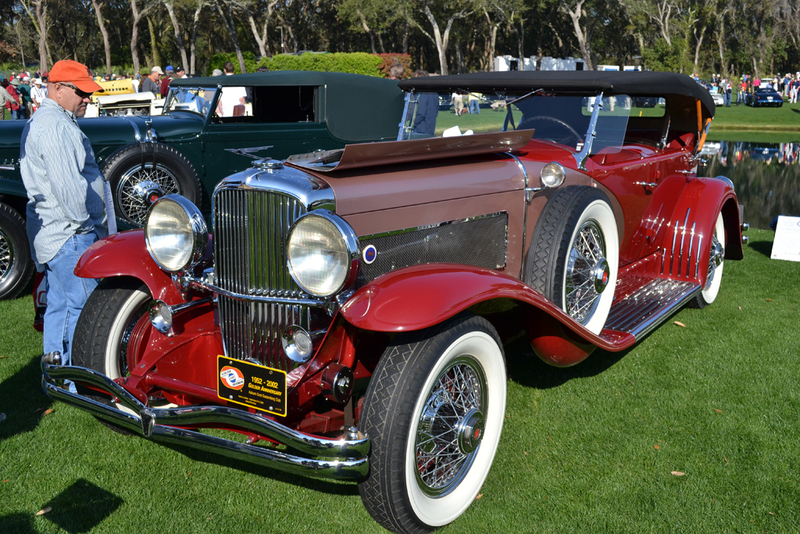 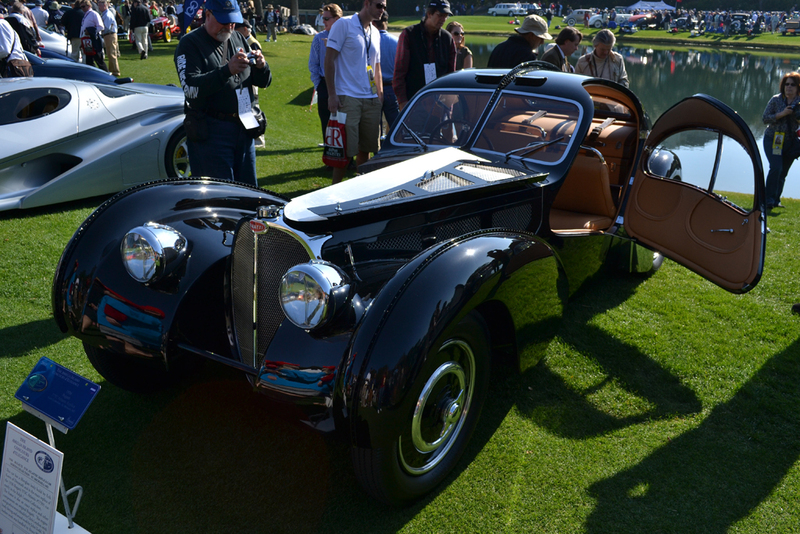 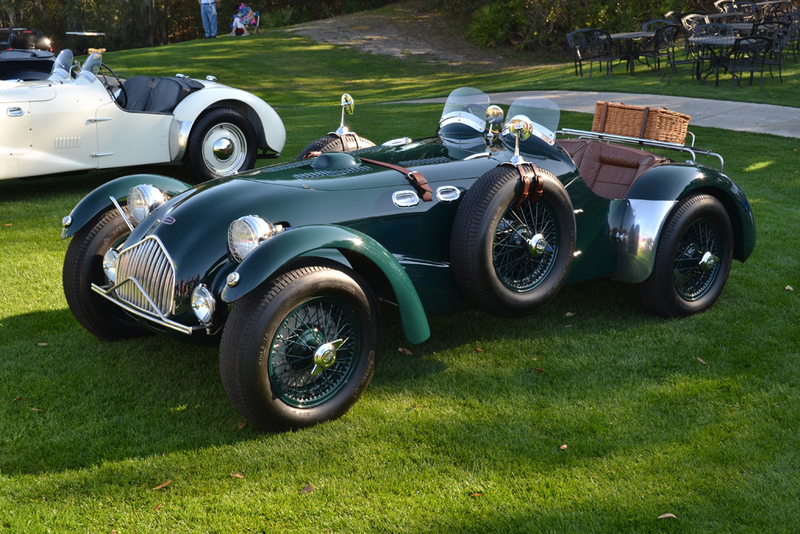 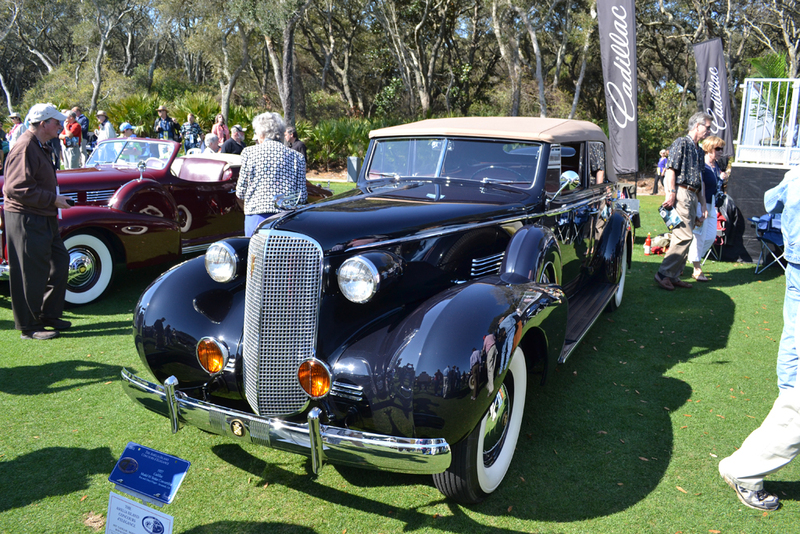 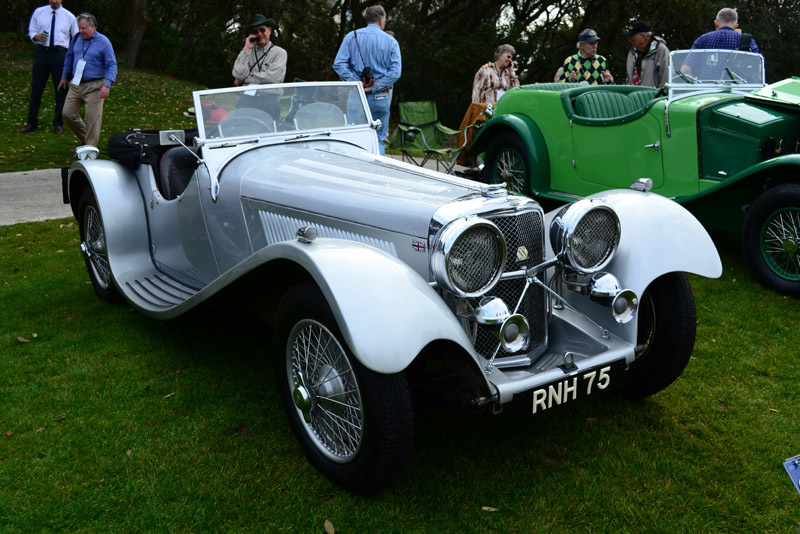 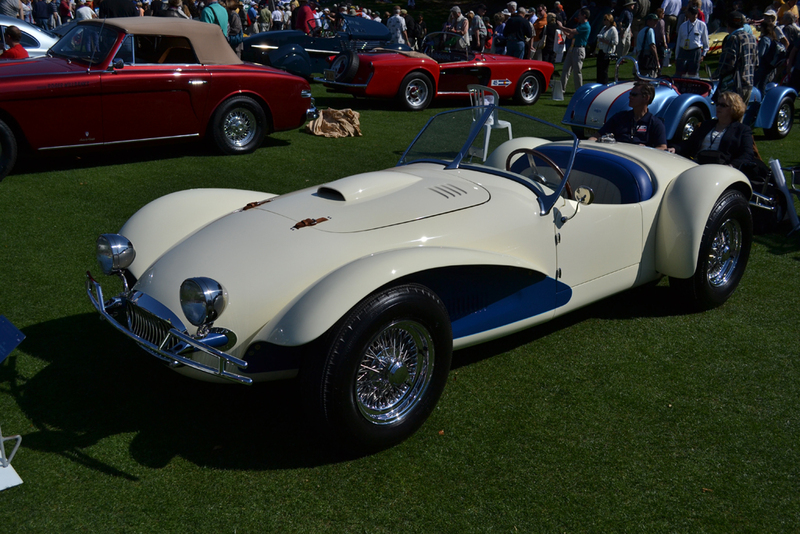 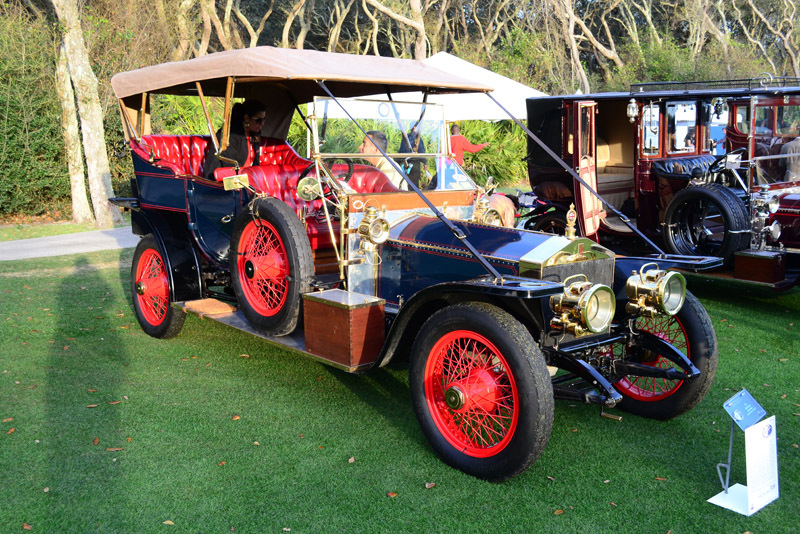 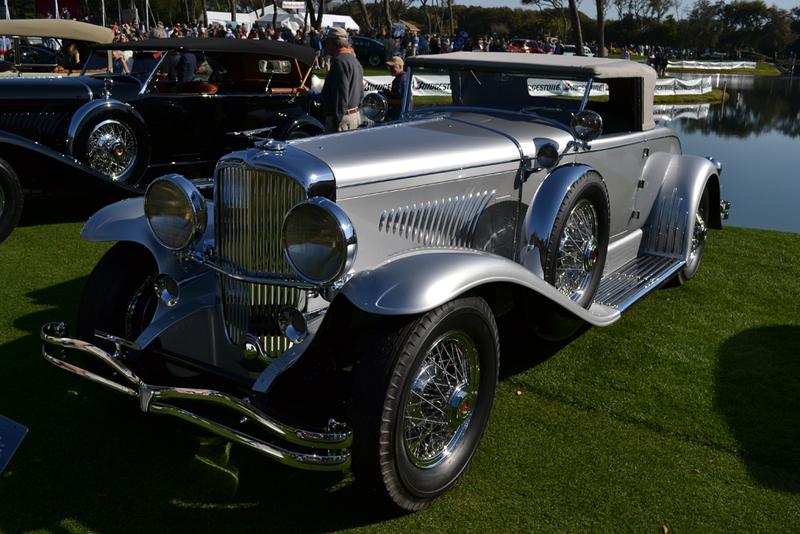 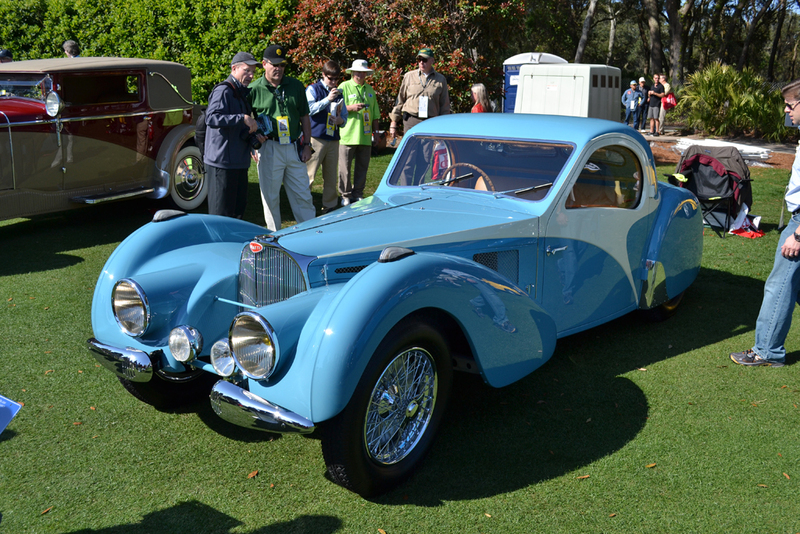 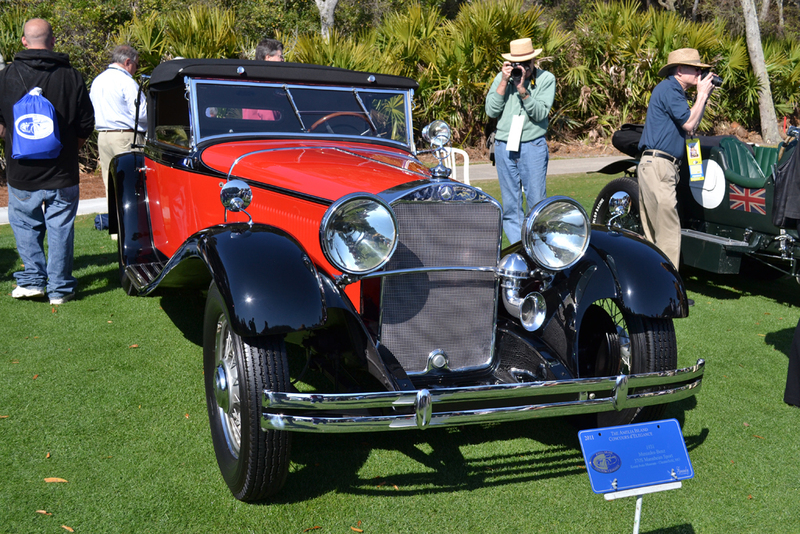 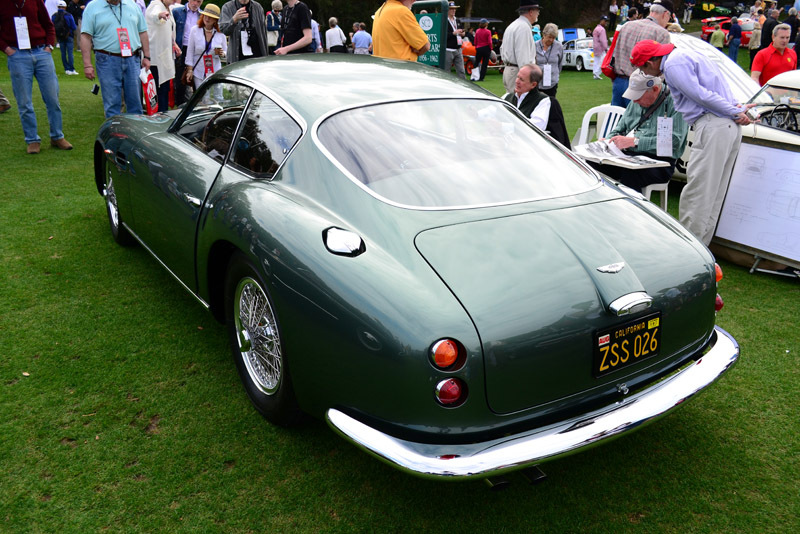 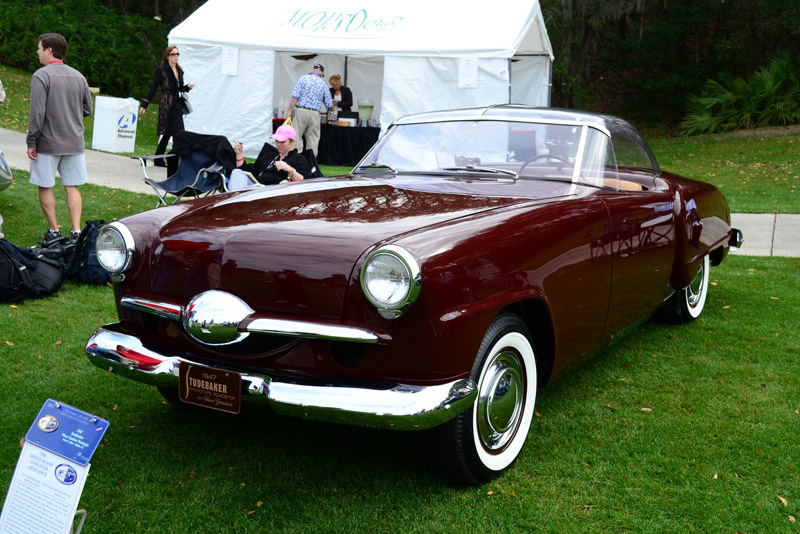 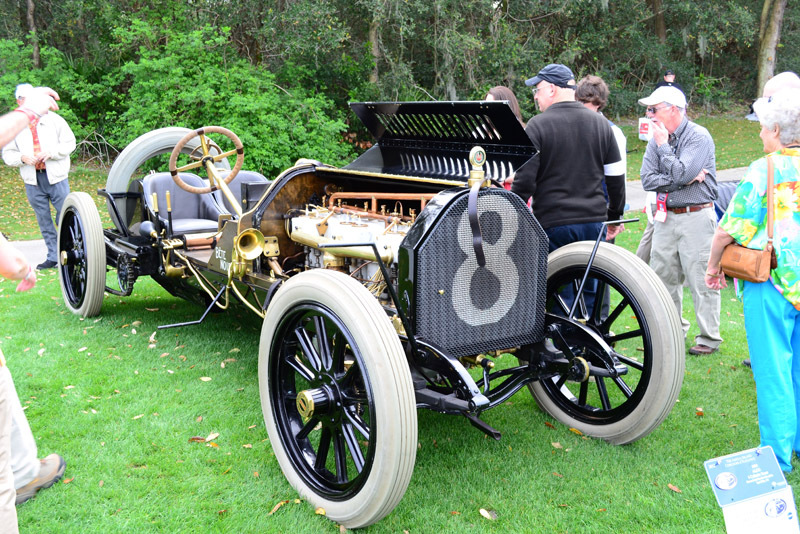 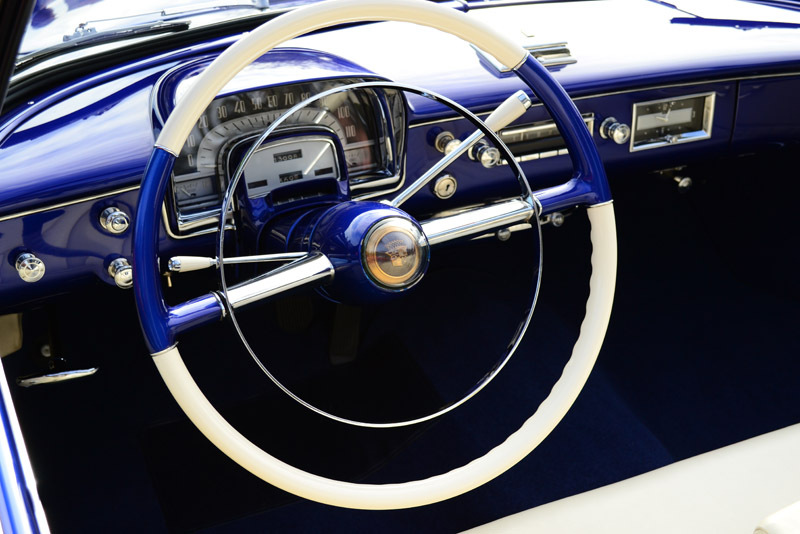 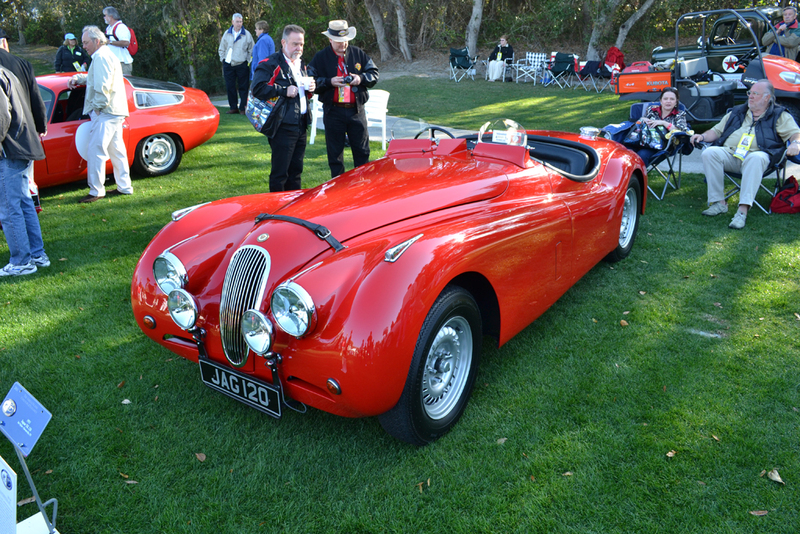 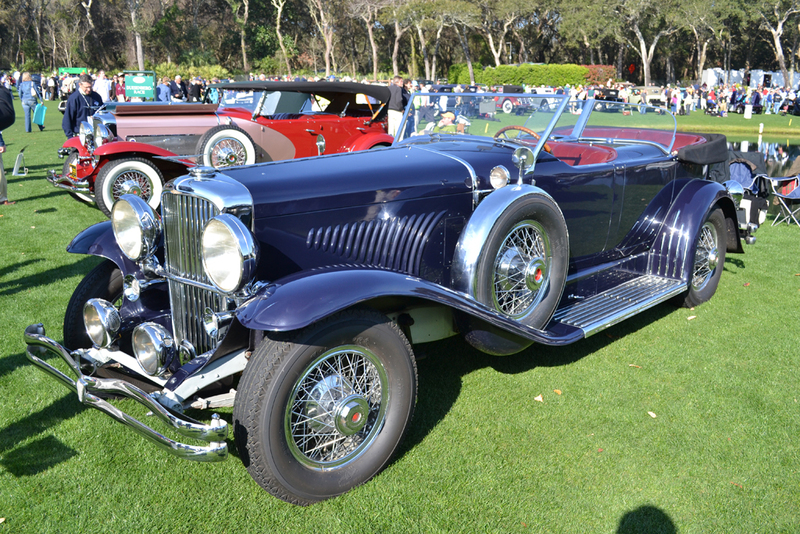 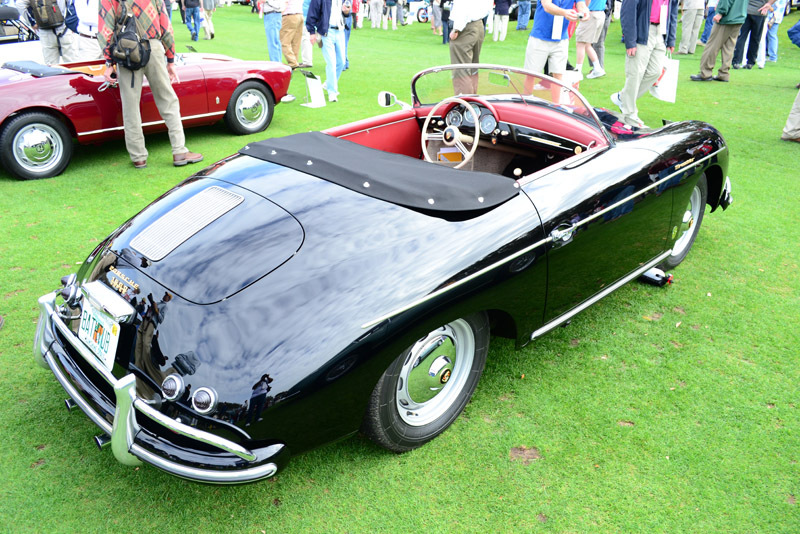 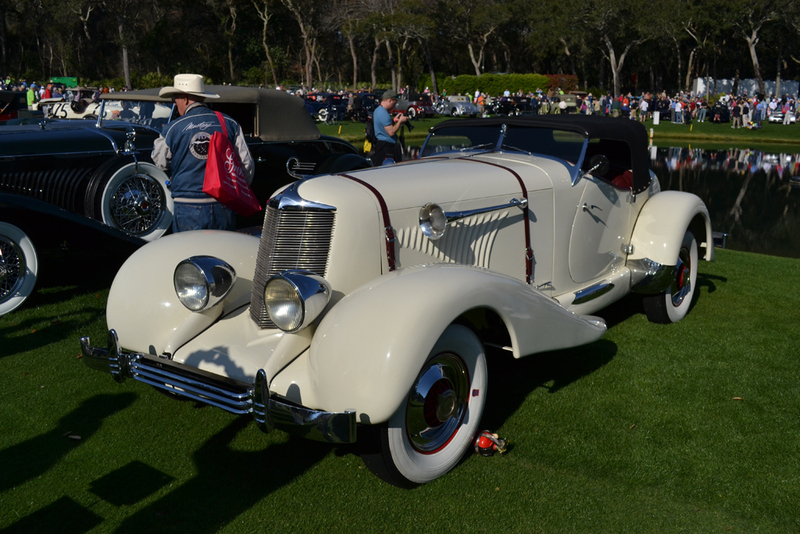 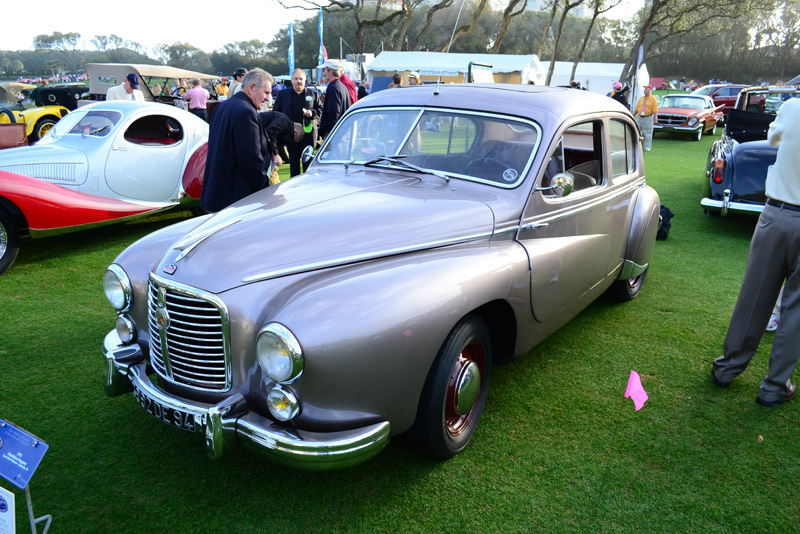 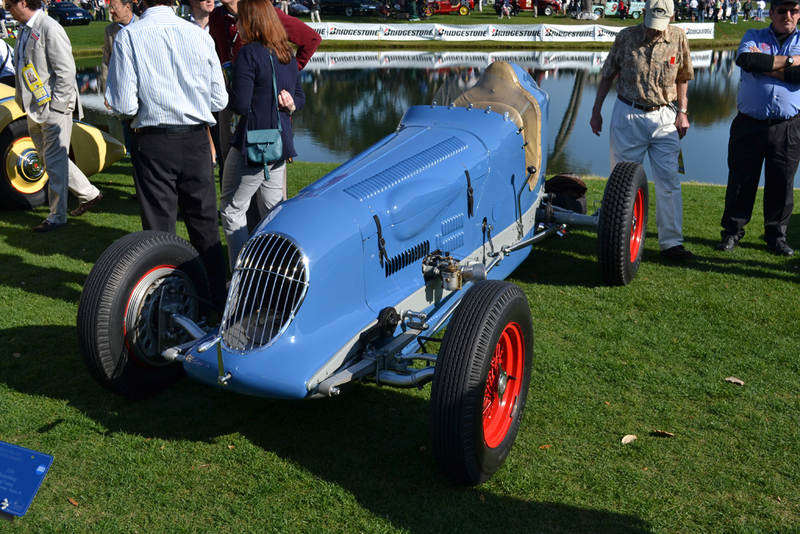 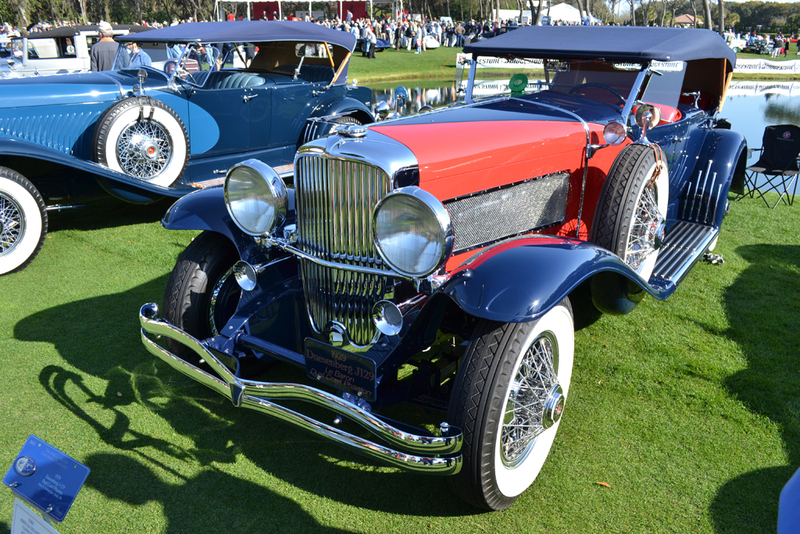 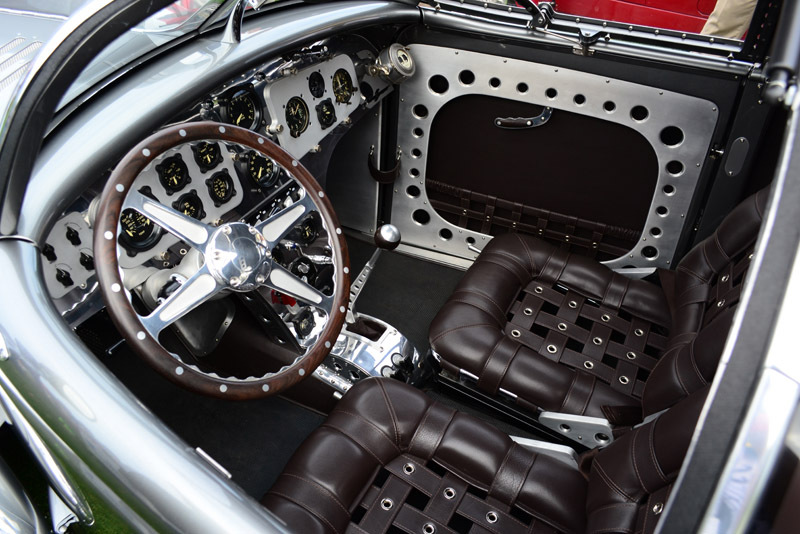 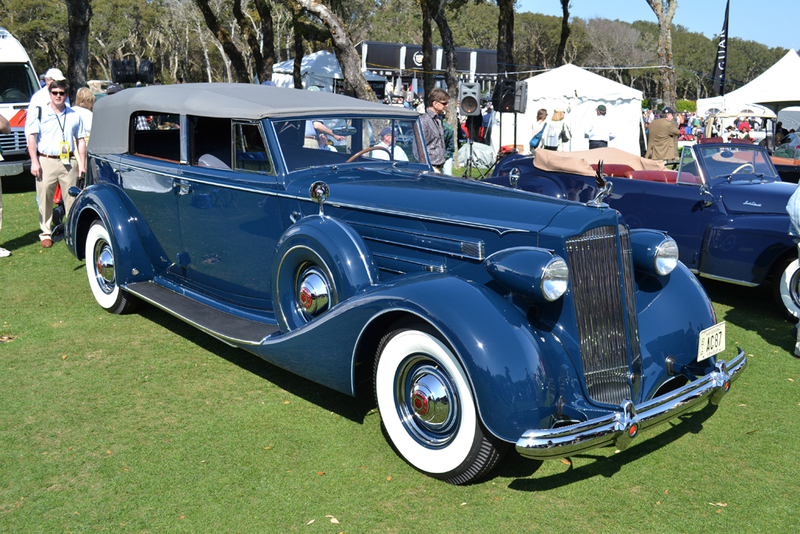 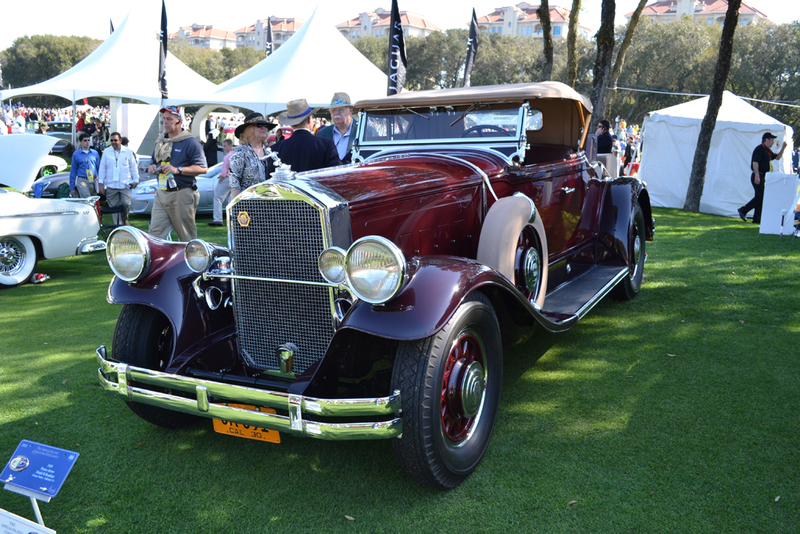 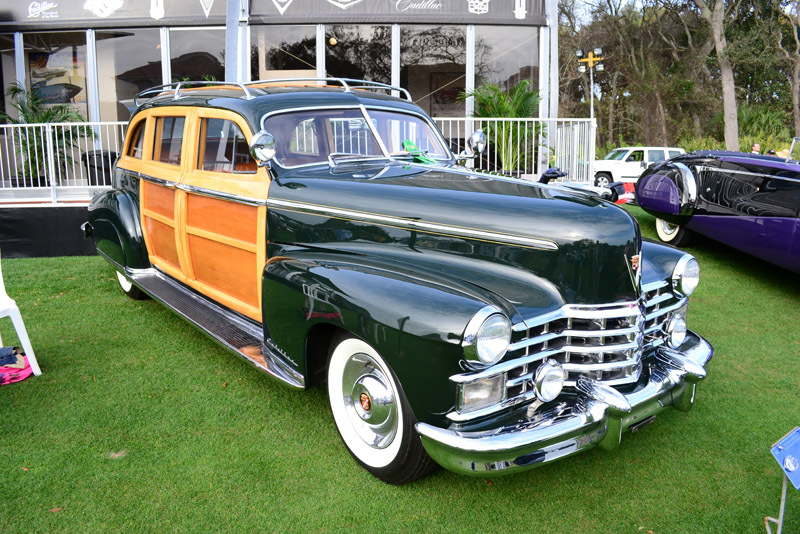 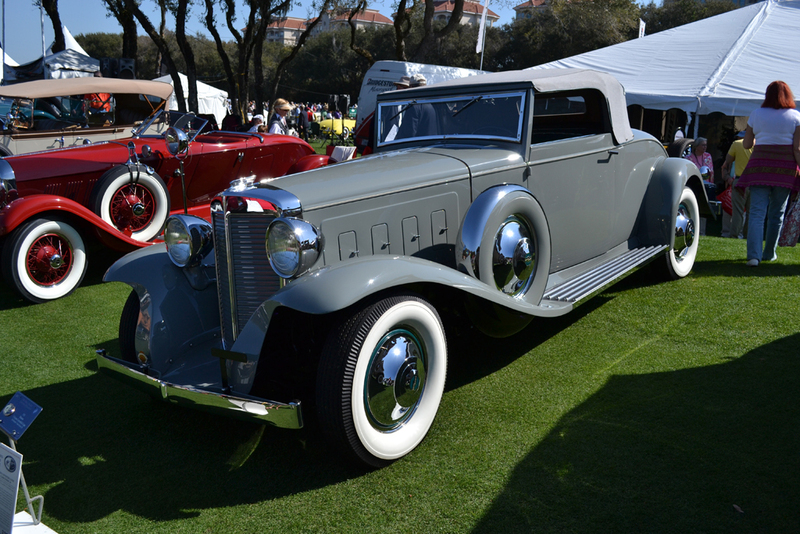 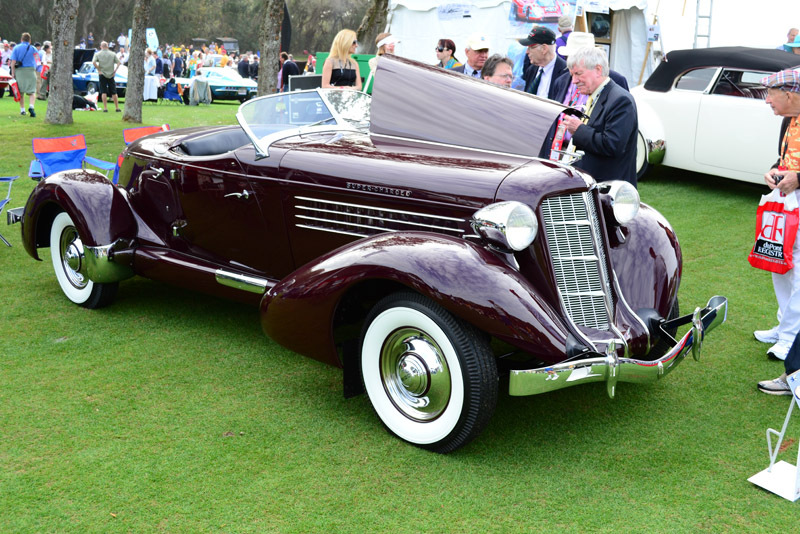 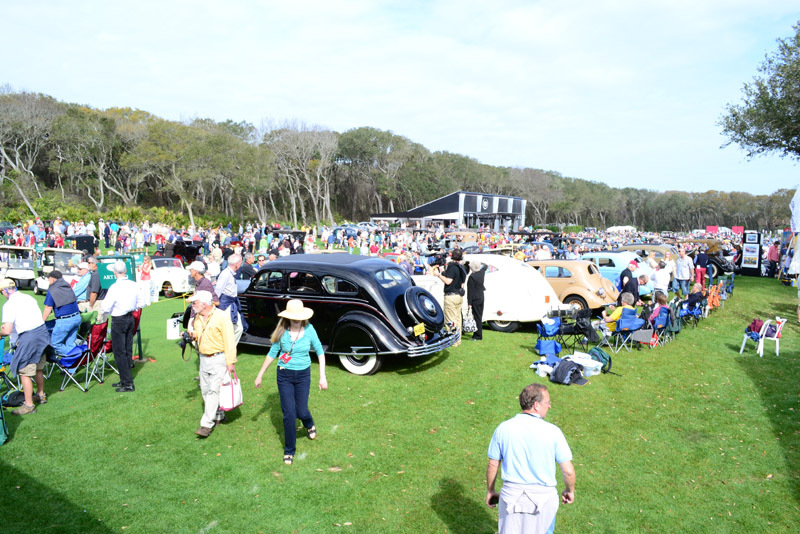 The Amelia Concours is a treat for everyone, providing discoveries for those who are new to the world of vintage automobiles and offering surprises to enthusiasts who pride themselves in an extensive knowledge of automotive history. 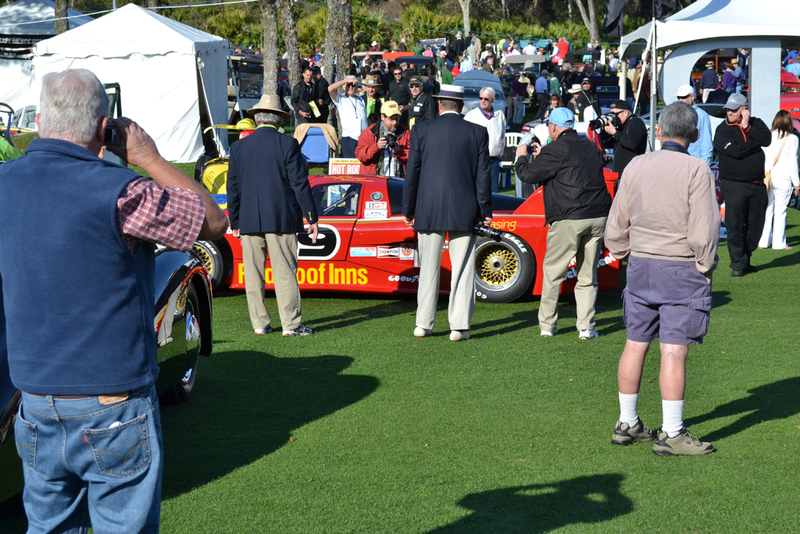 This is part of the uniqueness of the Amelia Island Concours d’Elegance, the show can catch an automotive veteran off guard while steadying others on a walk down memory lane. 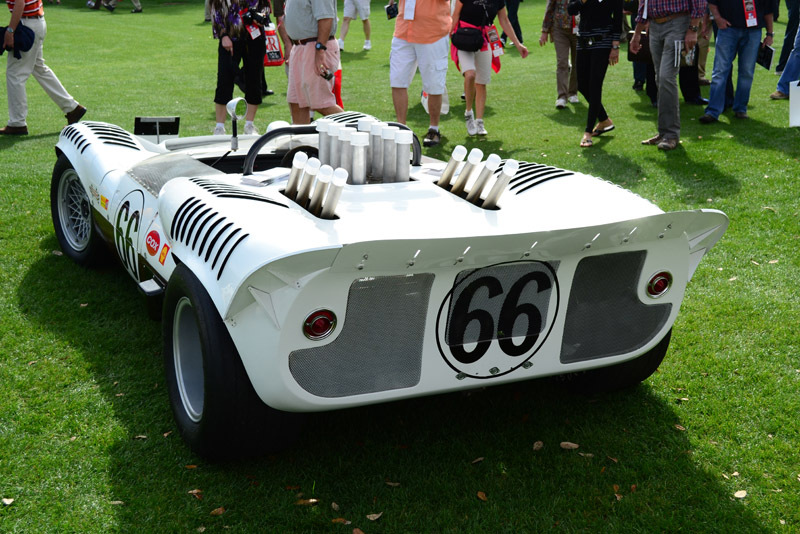 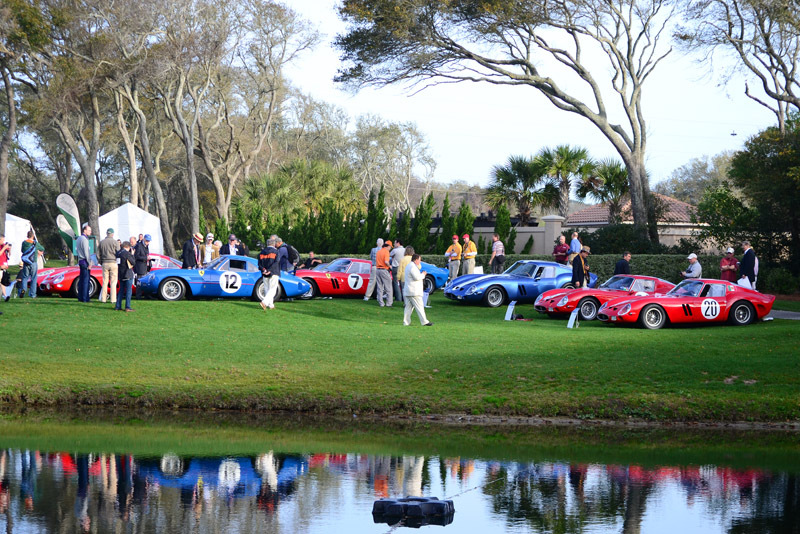 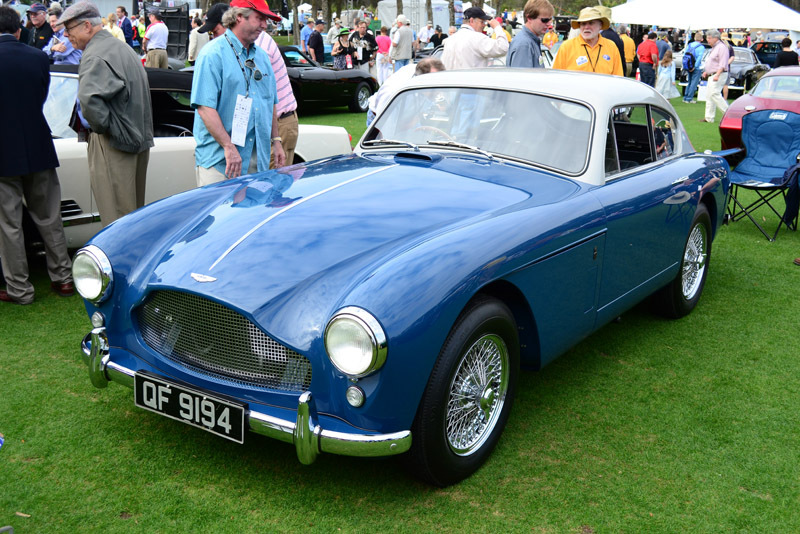 For many, the Amelia Concours is a “bucket list” event, a once in a lifetime experience. 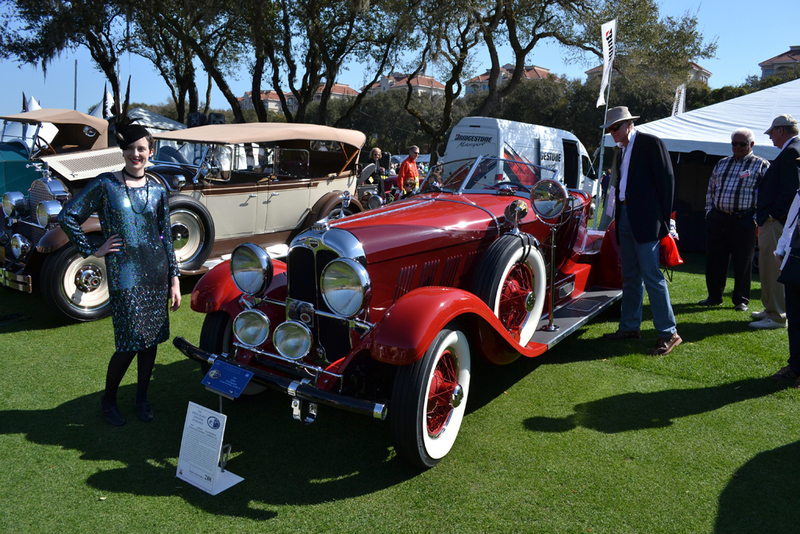 In the past few years of covering the Amelia Island Concours d’Elegance, I have taken away cherished memories of the people I have met and the cars on display. 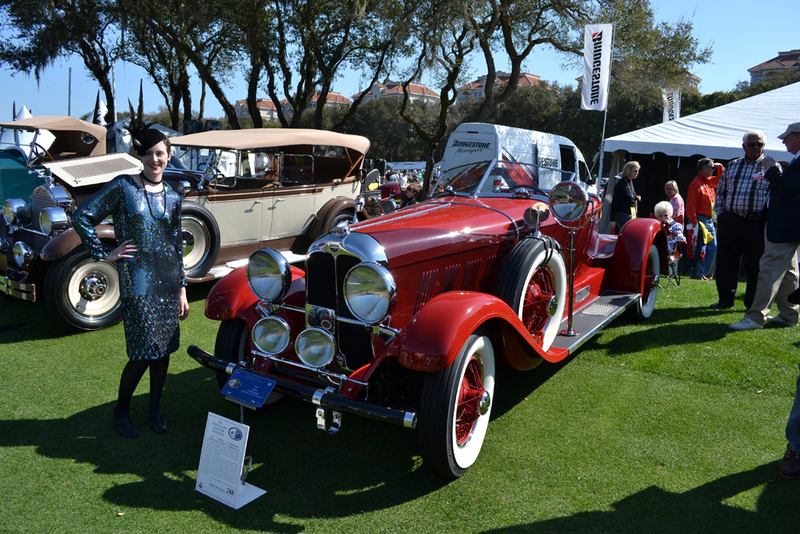 In a way, for me the Amelia Island Concours d’Elegance is a dream come true, yes, even in the limelight of driving a different new vehicle each week and spending countless hours at auto shows around the world. 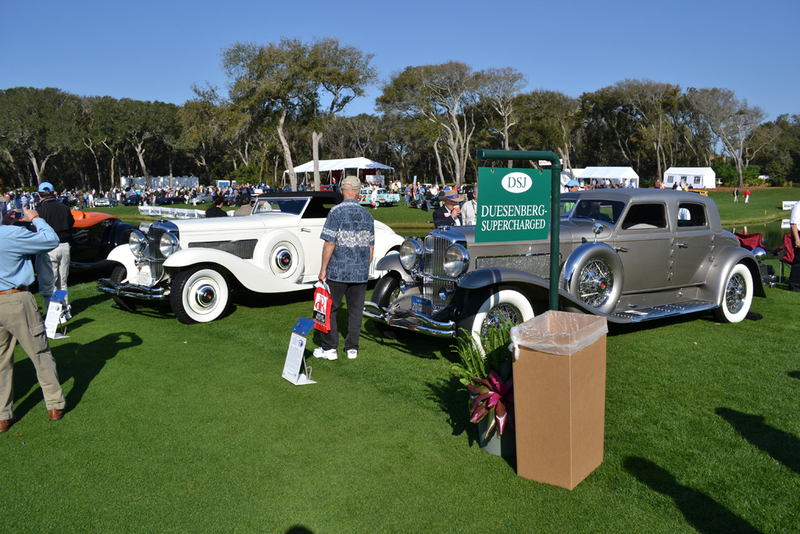 For someone like my mother, a respected grade school teacher who hasn’t the slightest clue about the historical significance of the 1936 Duesenberg SJN or the driving experience associated with the Ferrari 250 GTO, the show is equally treasured and meaningful. 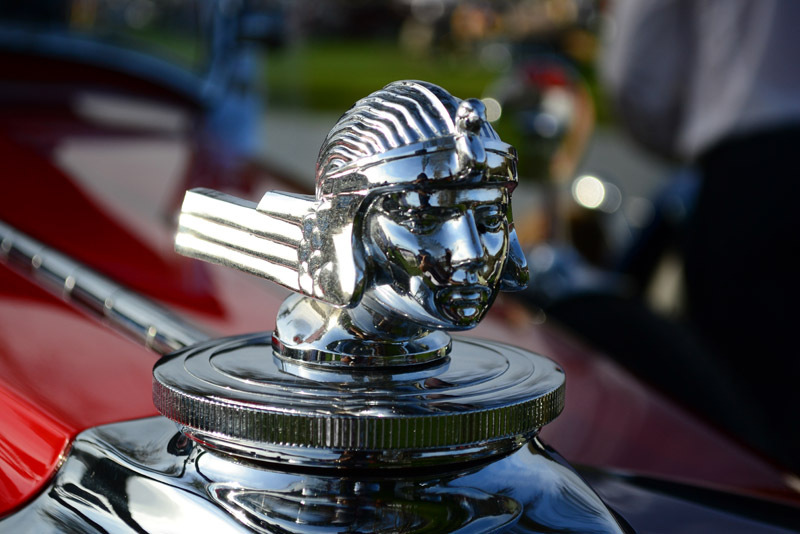 She gets it, walking from car to car with a big smile on her face, glancing at each uniquely sculpted body and stopping to take in the short backstory listed on the show plaque. 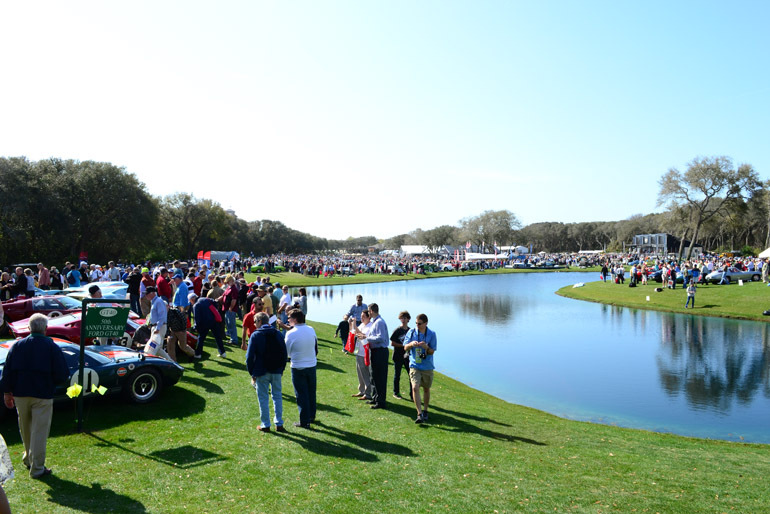 There really is nothing else like thousands of spectators walking on one of the world’s most beautiful golf courses filled with the most esteemed vehicles from around the world. 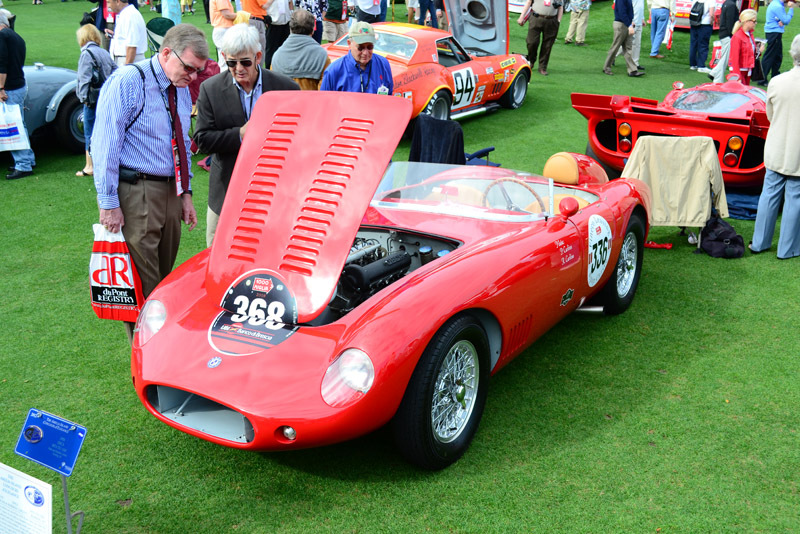 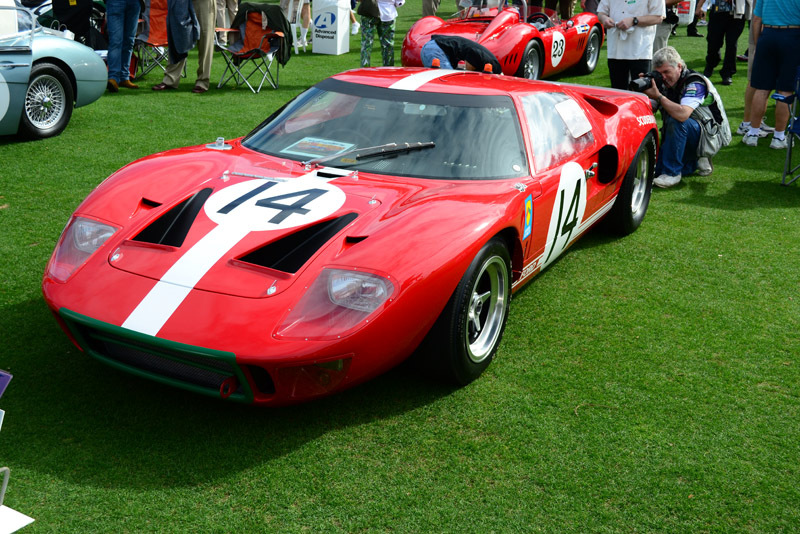 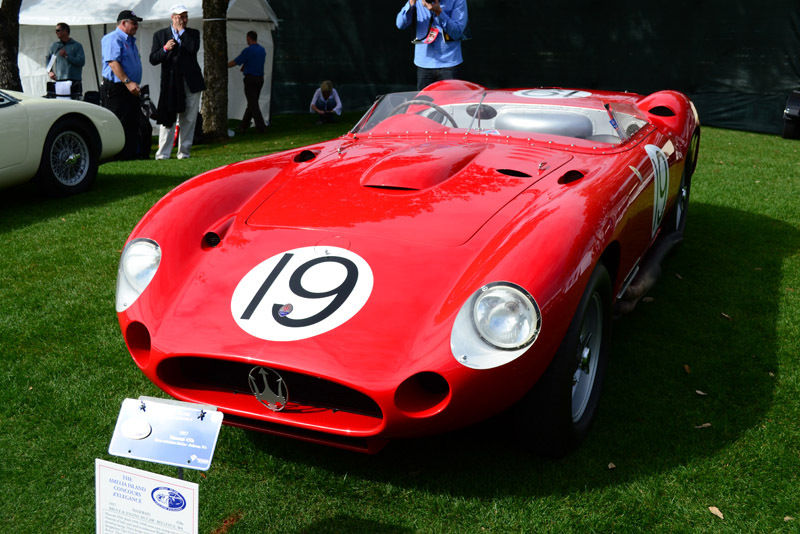 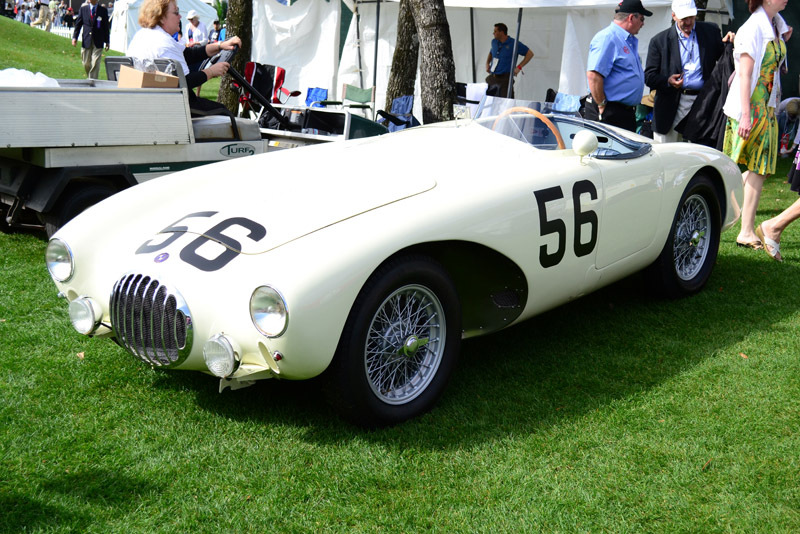 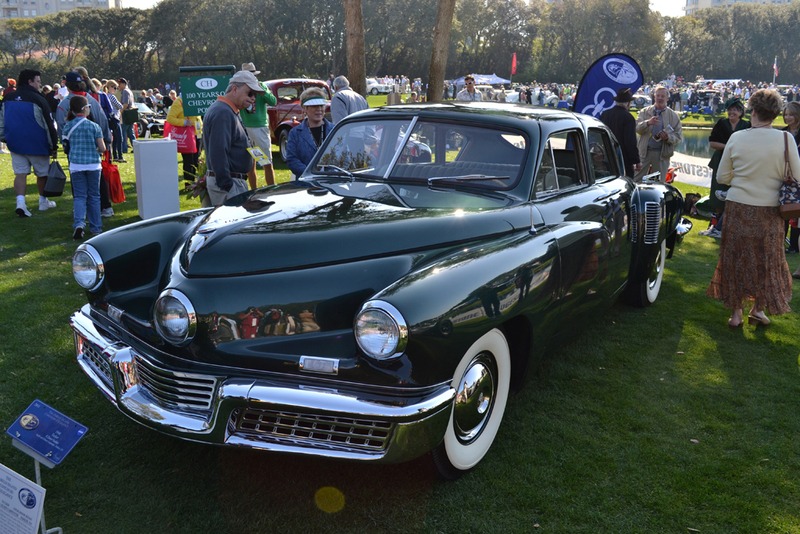 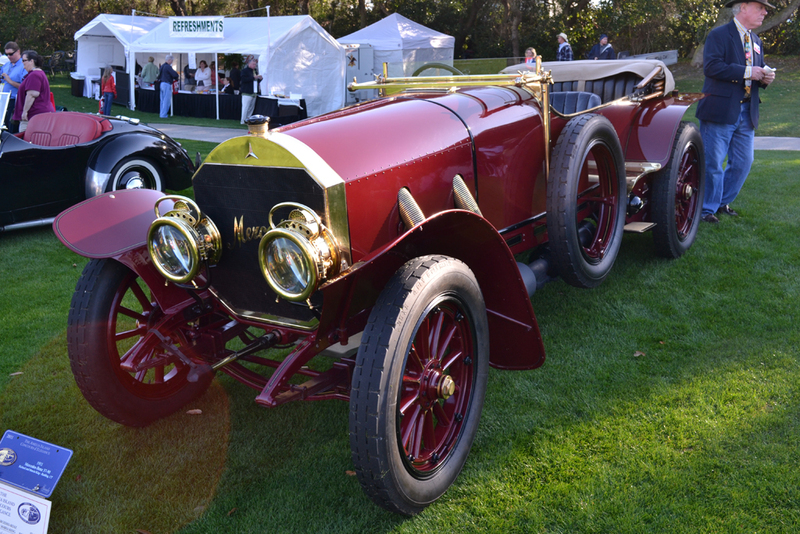 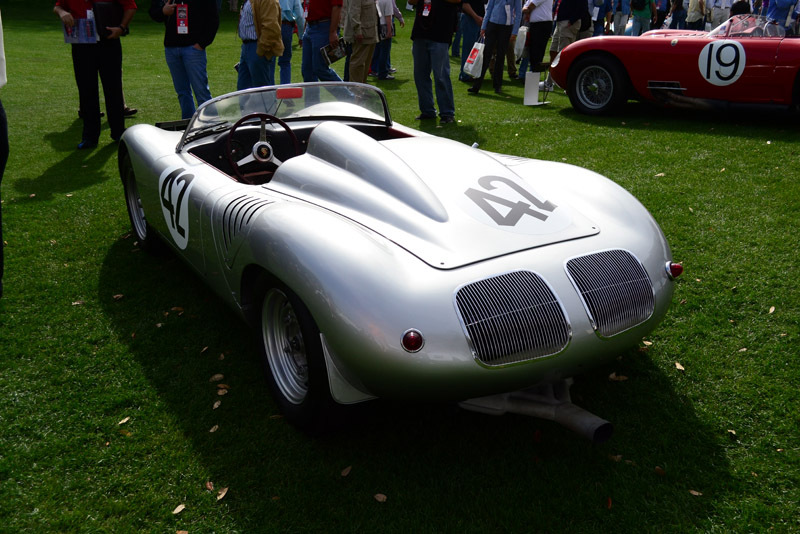 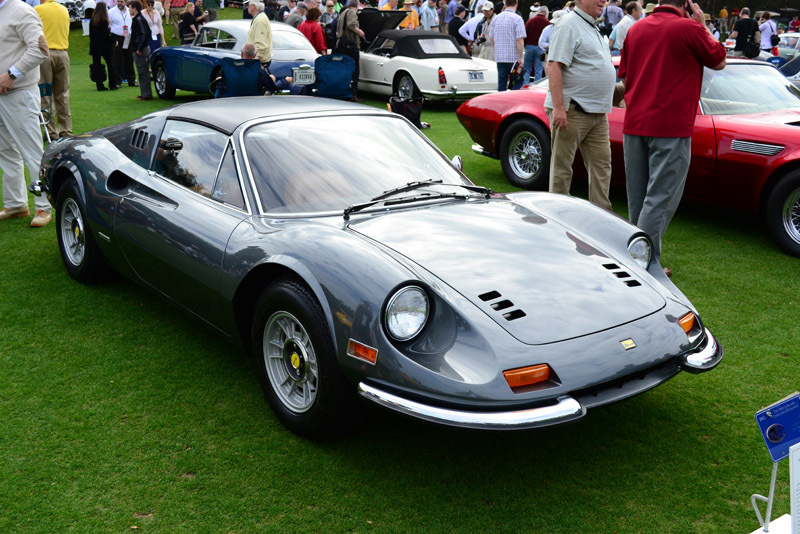 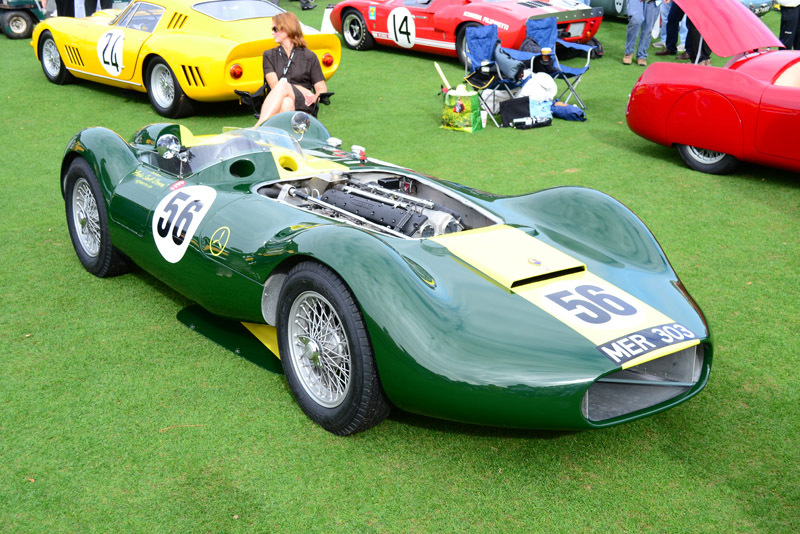 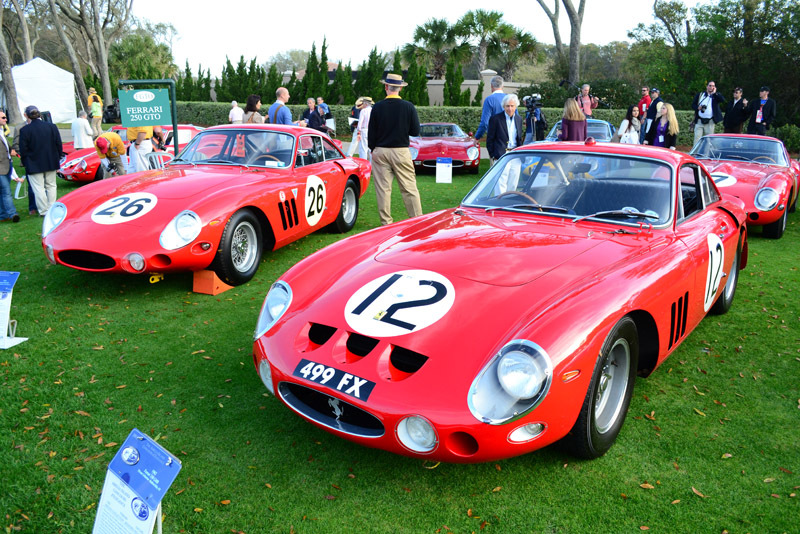 Each year the Amelia Island Concours d’Elegance selects an honoree and pays homage to the accomplishments of the selected honoree and how it correlates to theme and automotive history of the event. 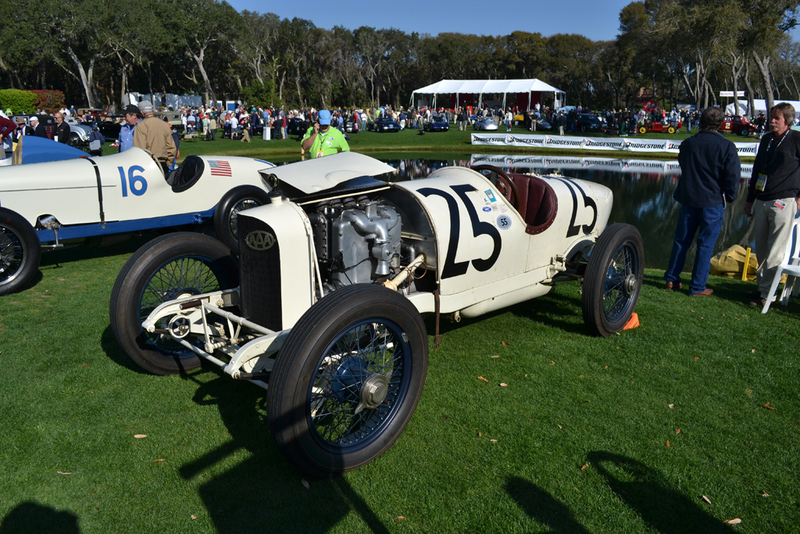 Last year (2013) the Amelia Island Concours d’Elegance featured Sam Posey, who is one of America’s most articulate representatives of motorsports. 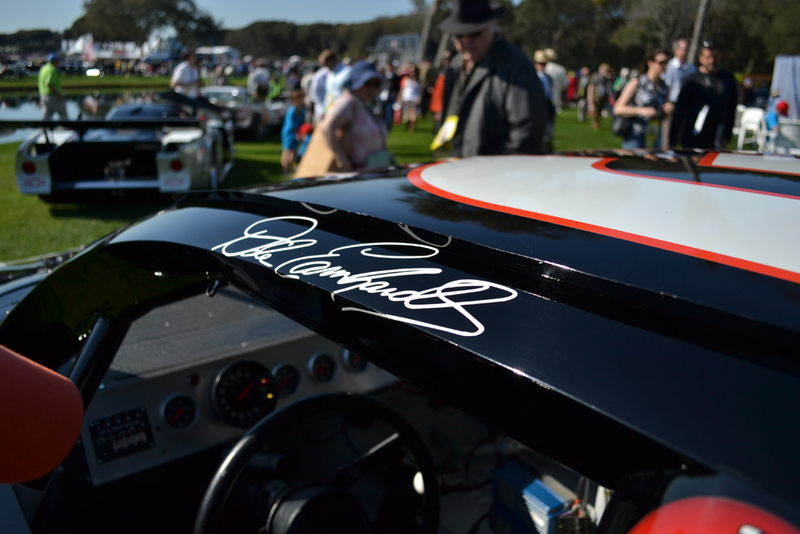 His wide range of skills apart from racing is also a tribute and hat tip to the amalgamation of the show. 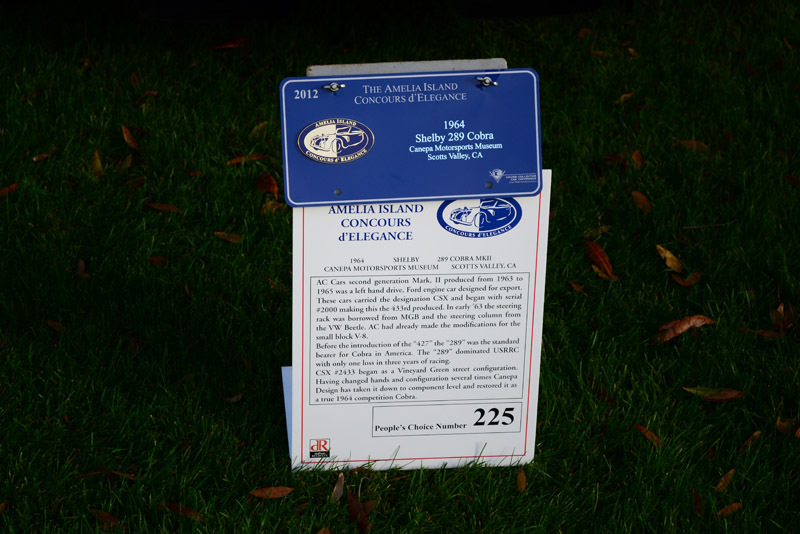 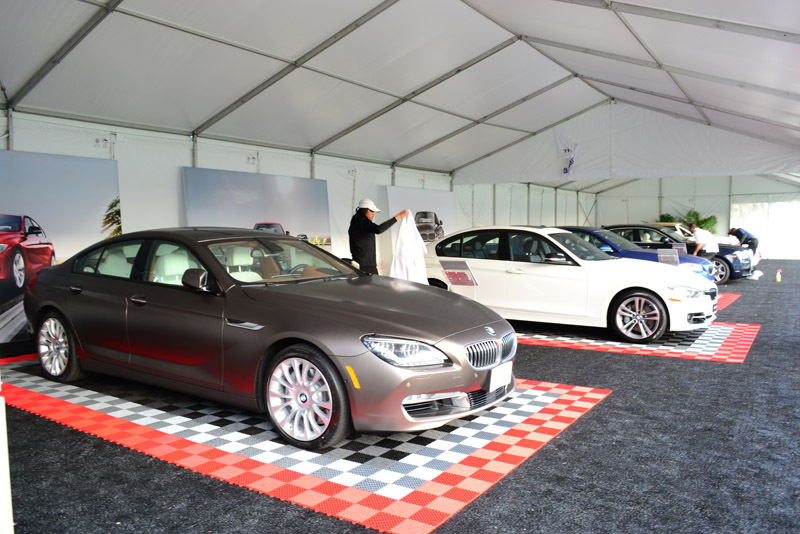 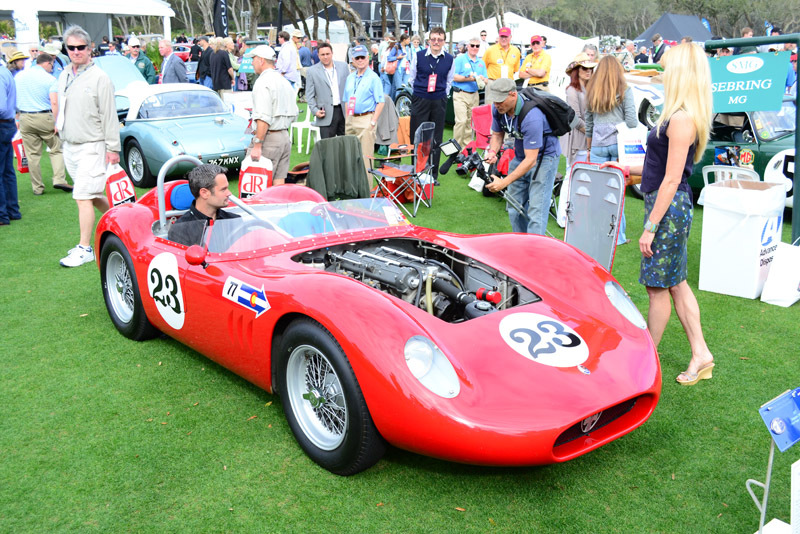 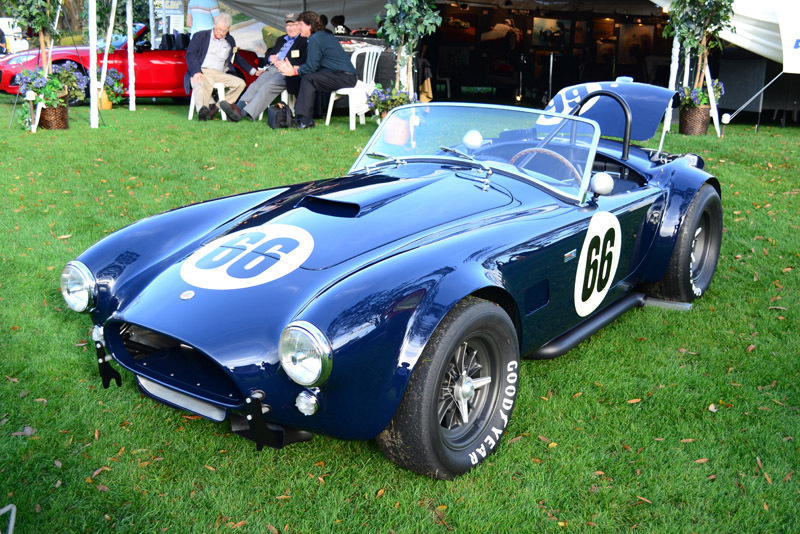 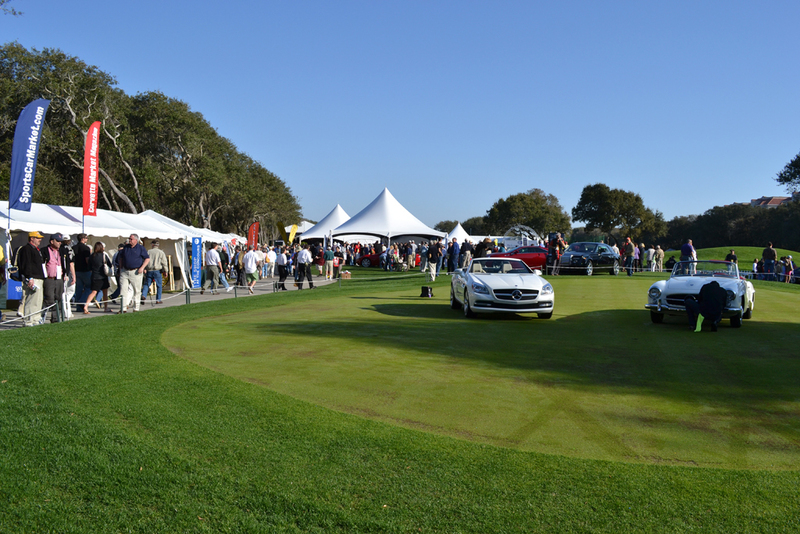 Other events during the weekend of the Amelia Island Concours d’Elegance, such as Silent Auctions, RM Auctions, and exclusive displays put on by various manufactures, all plays a part in the versatility and having something for everyone to enjoy. 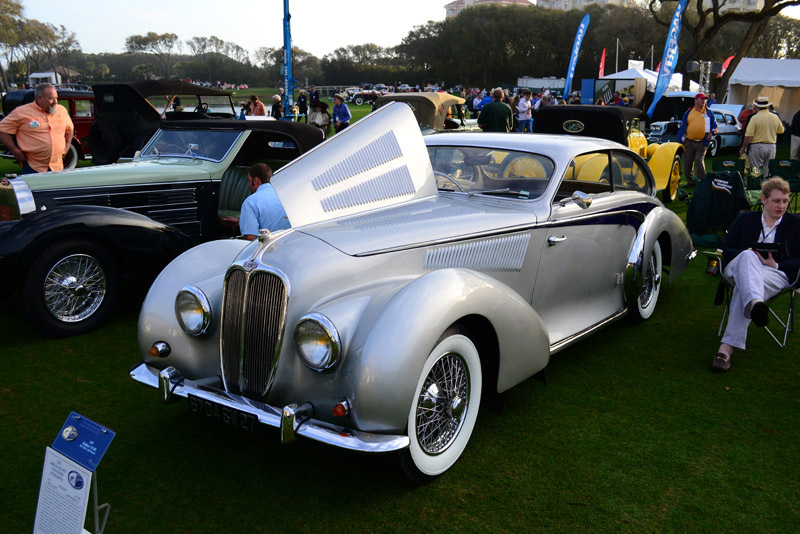 Leading up to this year’s Amelia Island Concours d’Elegance, my staff and I had the opportunity to sit down with founder, Bill Warner. 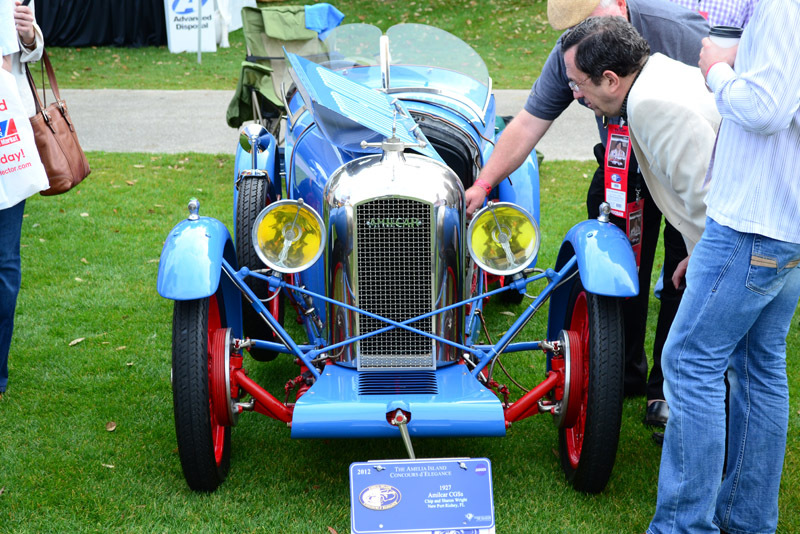 In our discussions we were overwhelmed with his warm and heartfelt passion for helping others, which truly determines that the Concours is much more than just a car show. 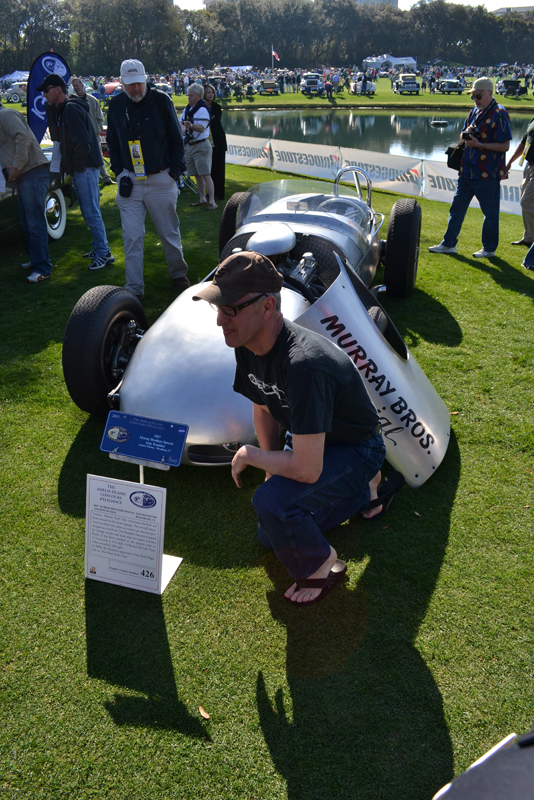 The local community is a big influence in Warner’s passion. 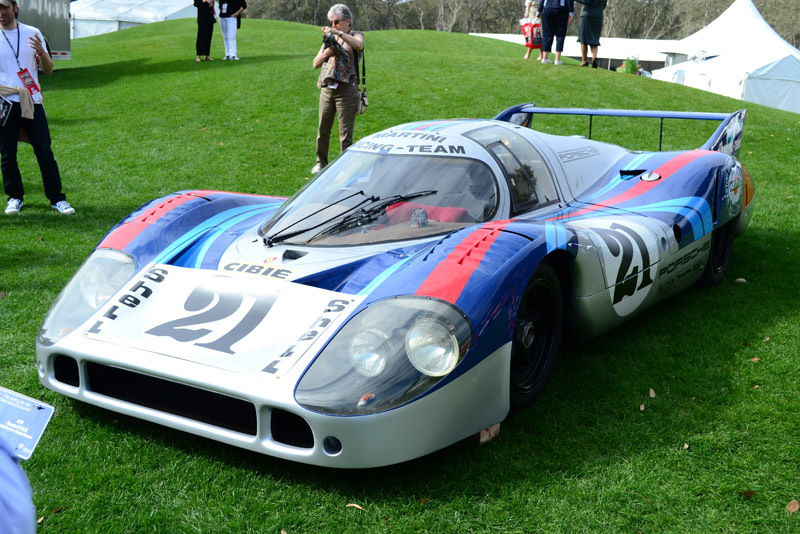 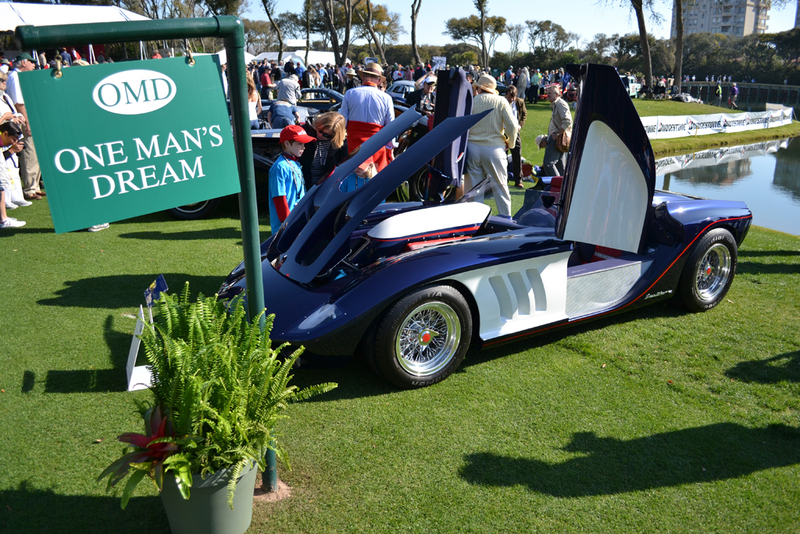 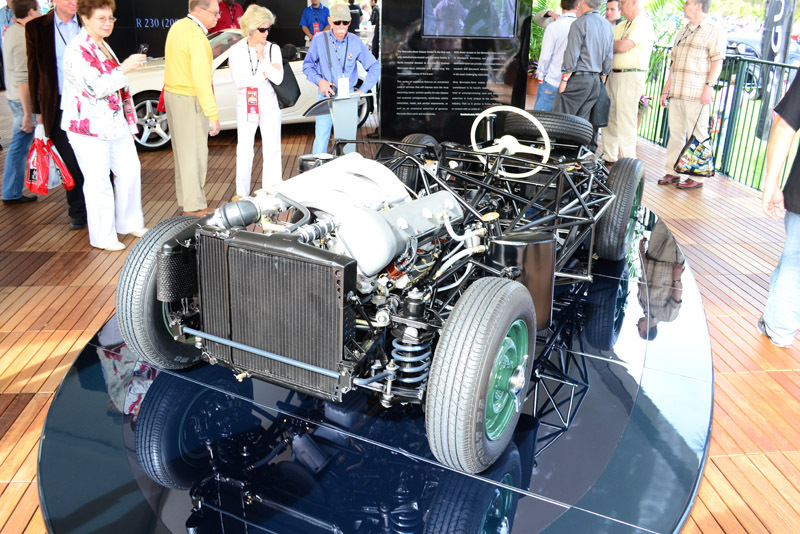 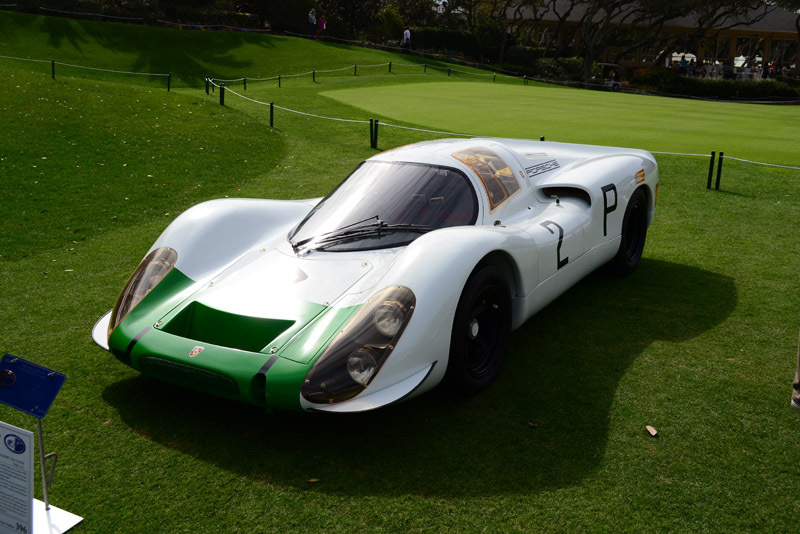 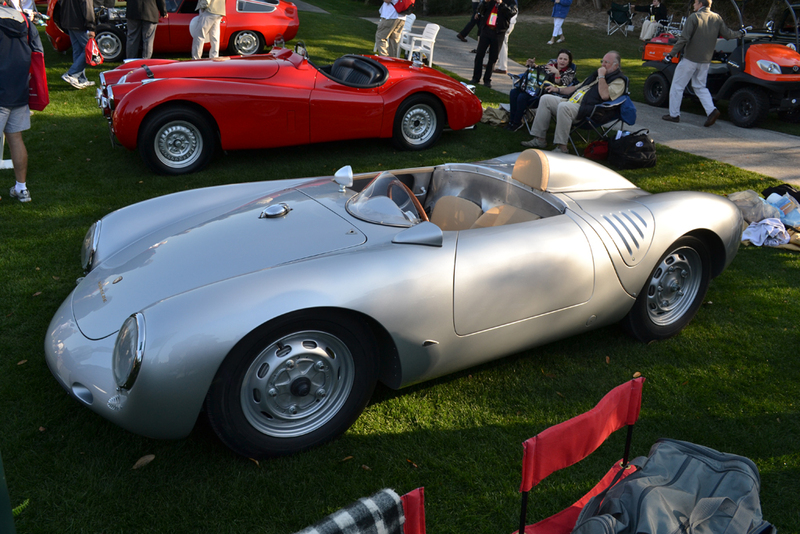 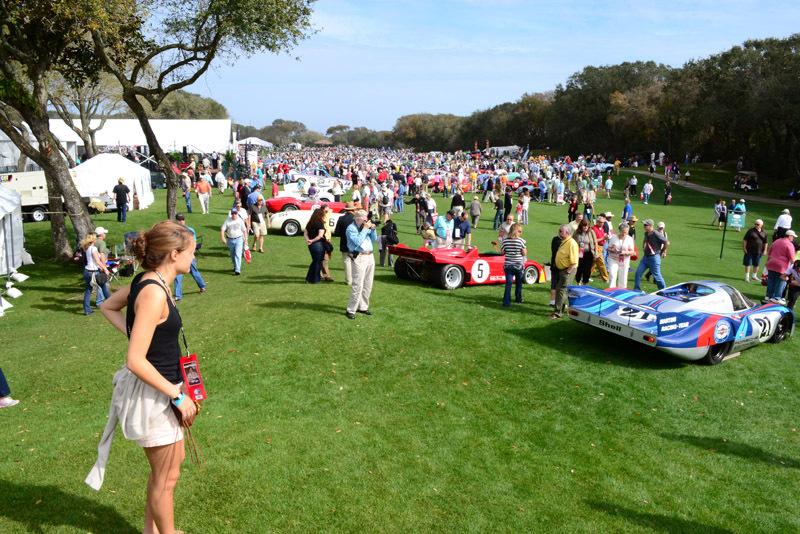 The Amelia Island Concours d’Elegance donates millions of dollars to charity. 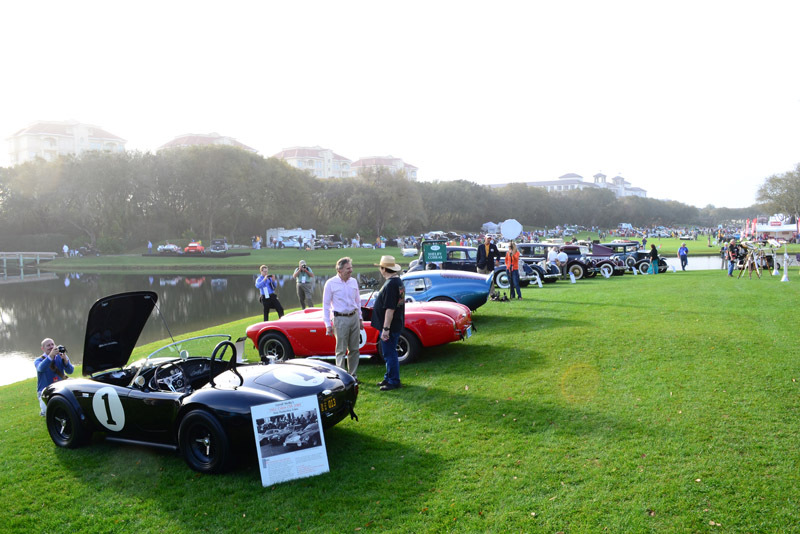 Warner welcomed our local Automotive Addicts Cars and Coffee venue to join his Saturday Amelia Island Cars and Coffee, asking us to help select local participants. 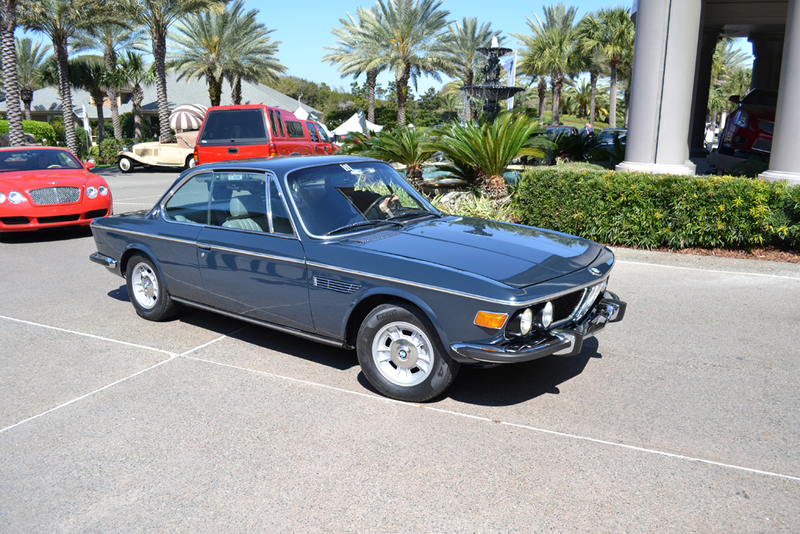 Usually, our event is held at The Florida Times-Union every second Saturday of the month averaging about 400 vehicles in attendance representing everything from million-dollar exotics and resto/modified VW buses to American muscle cars. 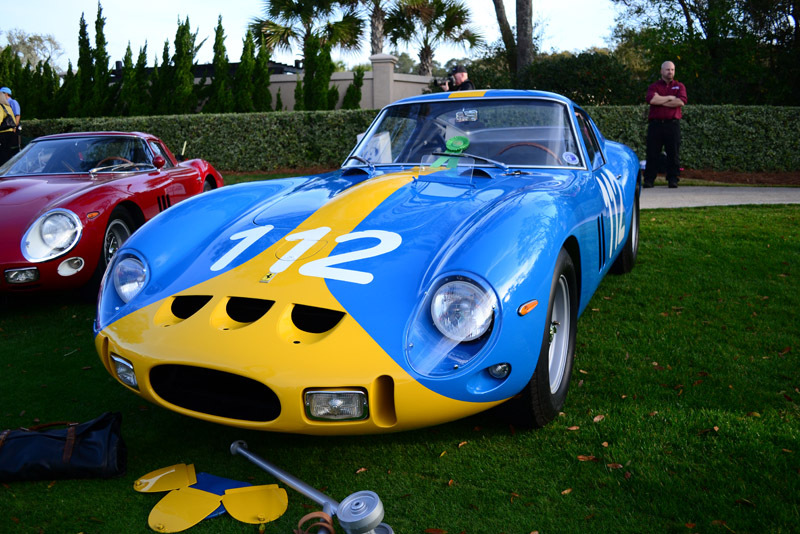 For our Cars and Coffee venue in March, we are joining the Amelia Island Cars and Coffee event welcoming our local participants to spectate the nice field of vehicles Amelia Island Concours has invited. 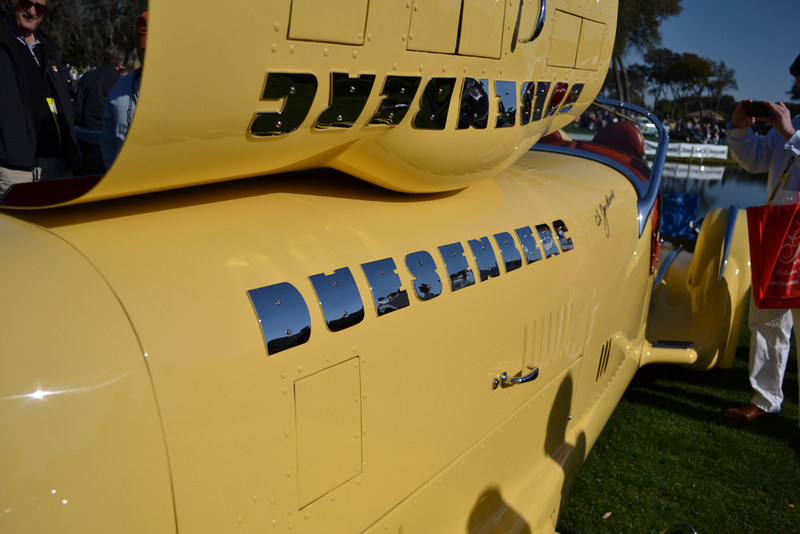 It is a pleasure and honor to be part of Saturday’s event and we look forward to covering the Sunday vehicle display. 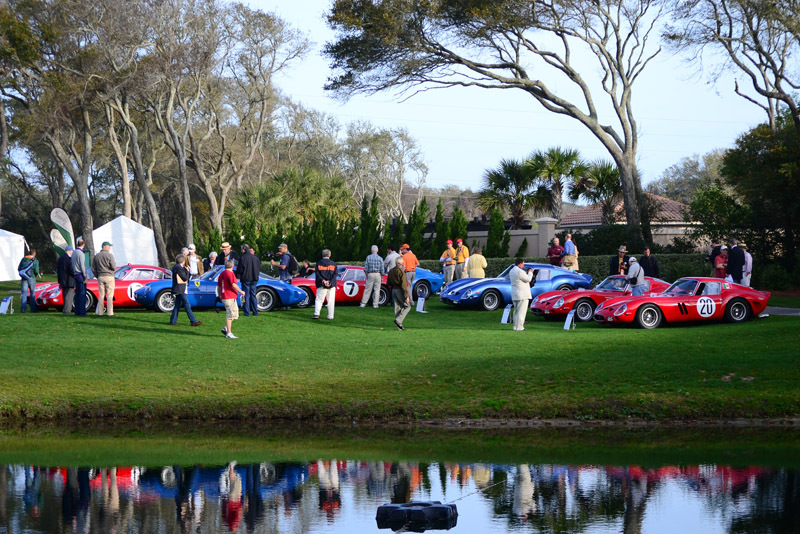 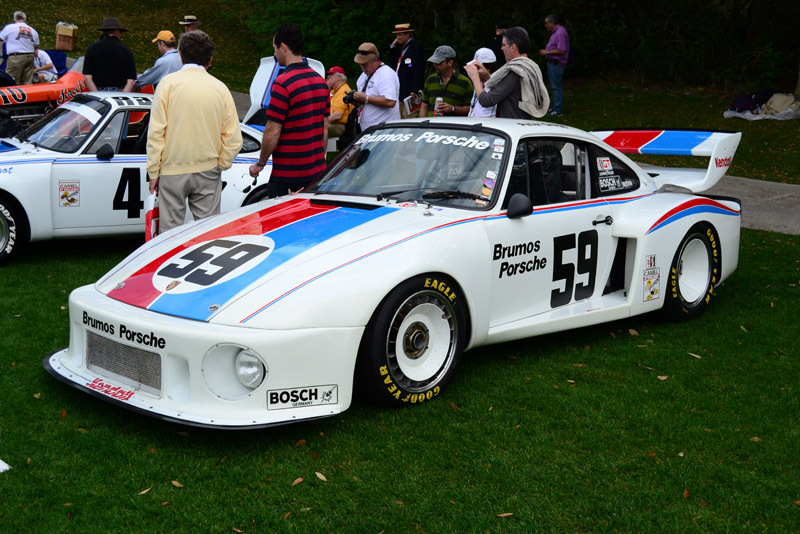 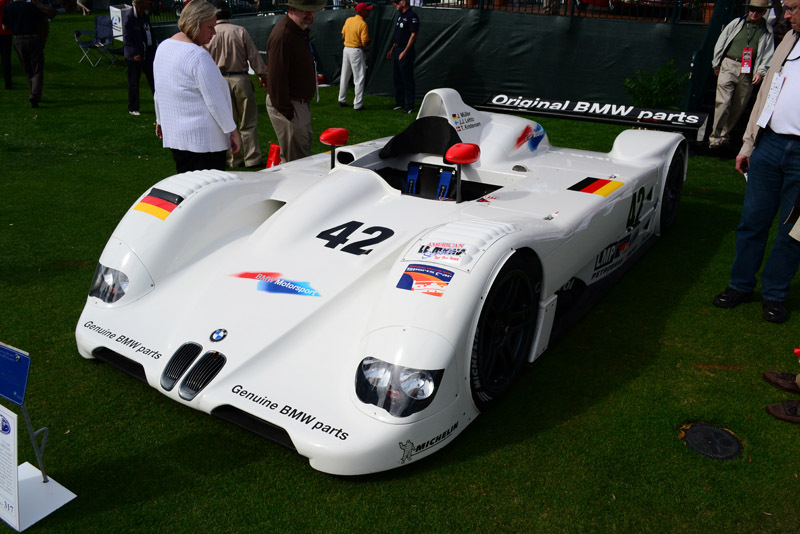 The 19th Amelia Island Concours d’Elegance with Honoree Jochen Mass takes place this weekend with the Amelia Island Cars and Coffee running Saturday from 9am till 1pm, various other lifestyle events, and concludes with the official vehicle display at The Golf Club of Amelia Island on Sunday from 9:30am till 4pm. 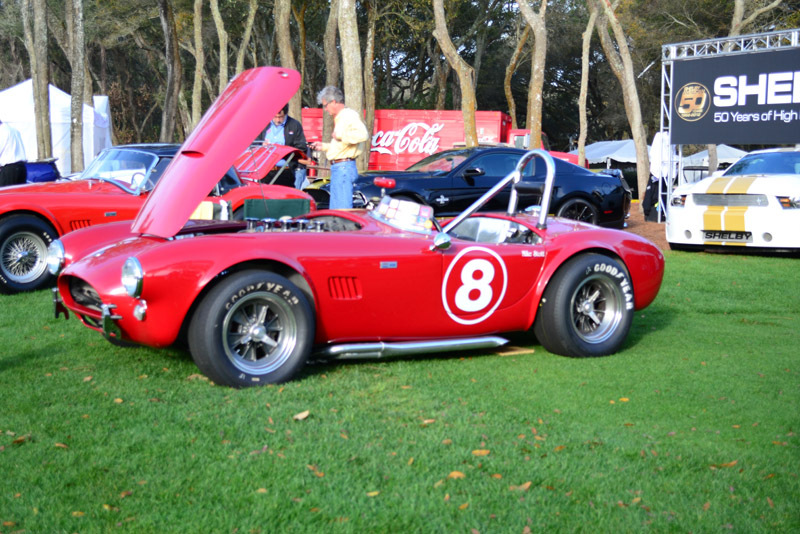 AutomotiveAddicts.com will bring to you exclusive coverage following the event in addition to images from Saturday’s Amelia Island Cars and Coffee, which we will be participating in with local vehicle entrants. 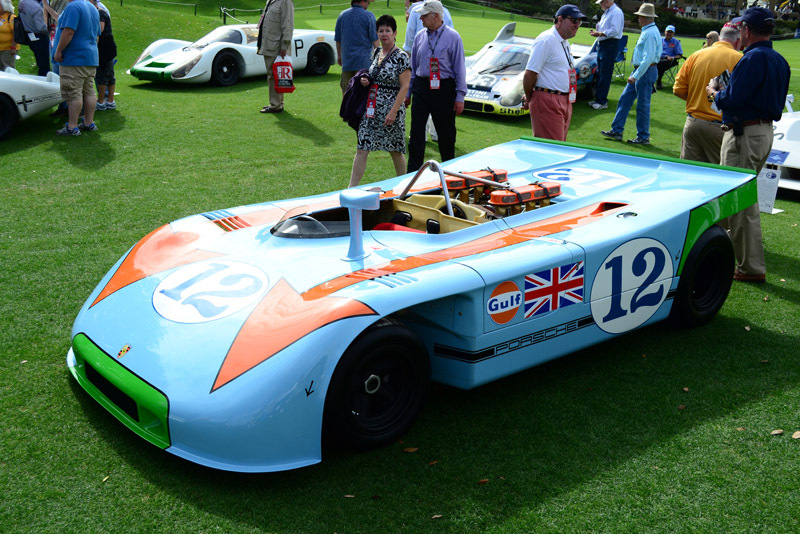 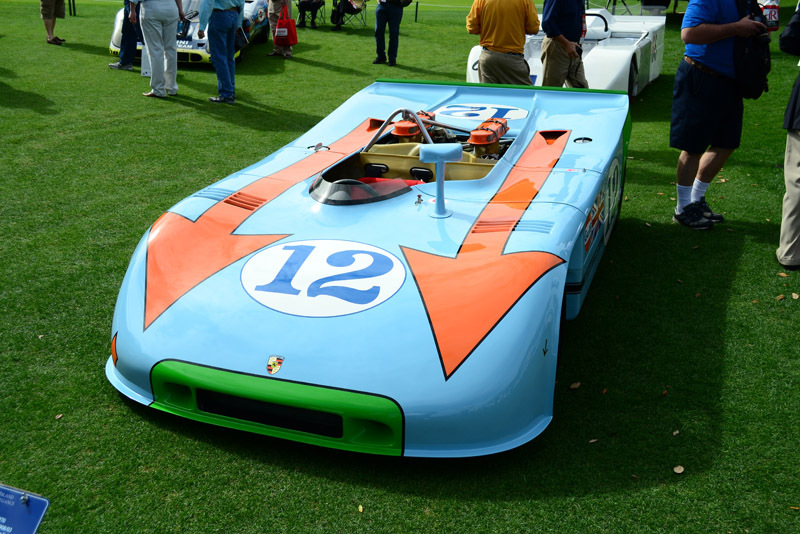 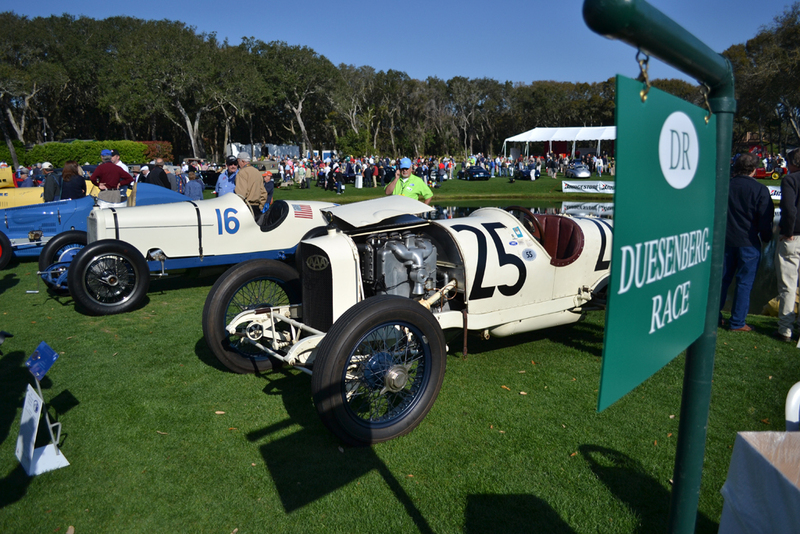 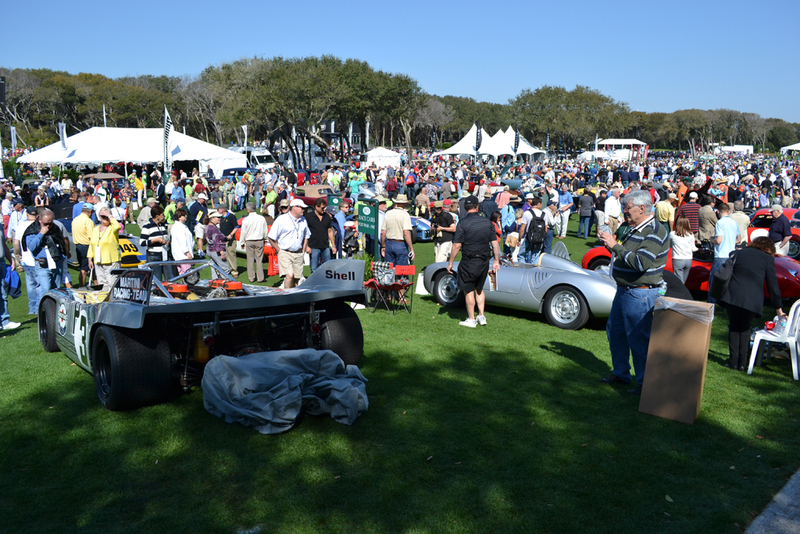 Our exclusive coverage of the 19th Annual Amelia Island Concours d’Elegance will be live following the show. 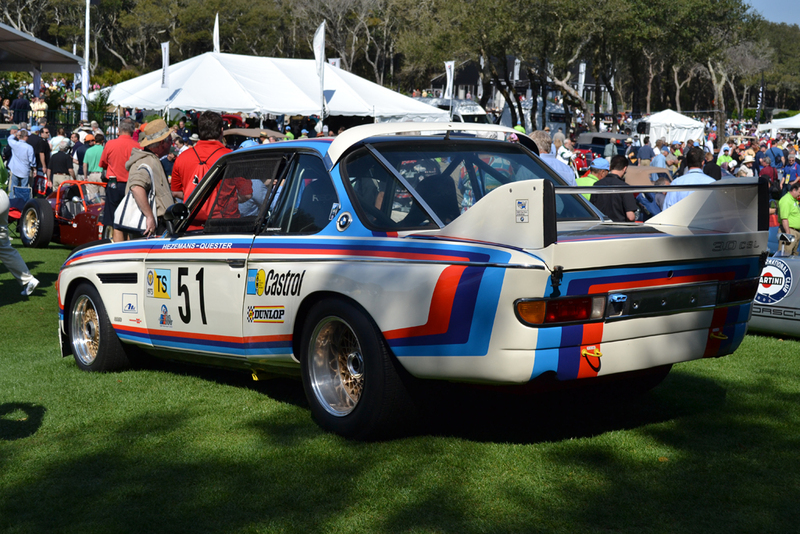 You may view previous year Amelia Island Concours d’Elegance coverage here. 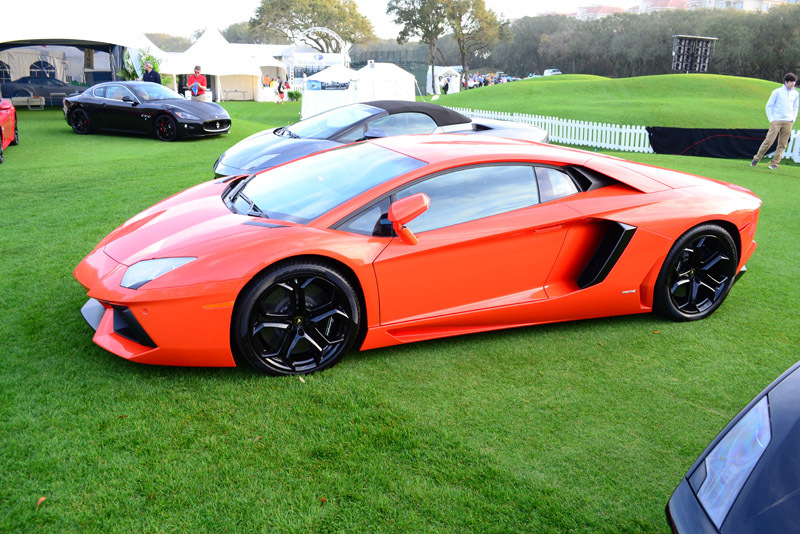 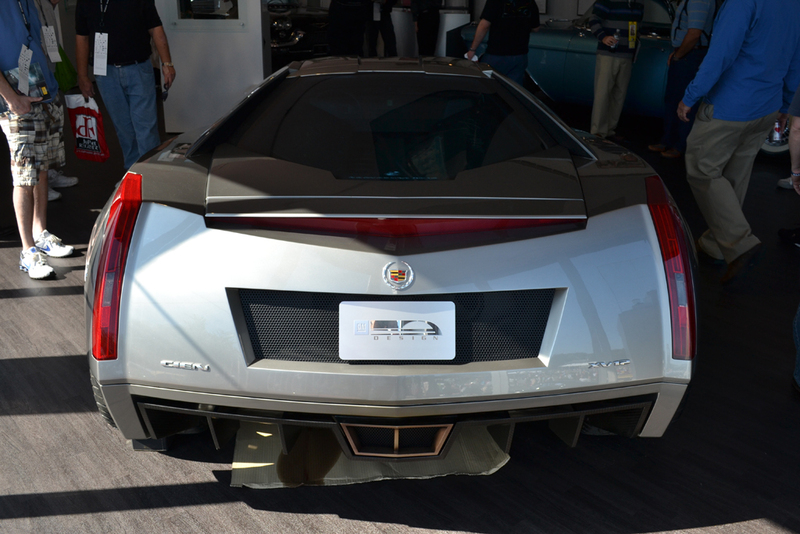 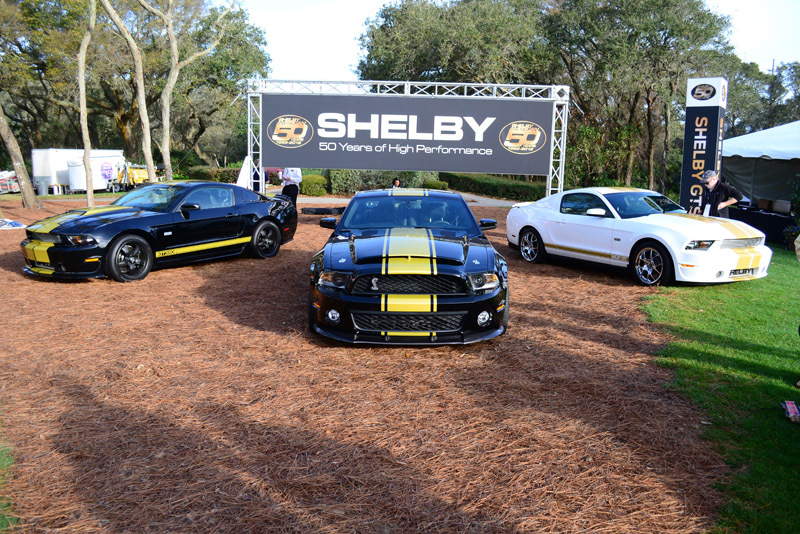 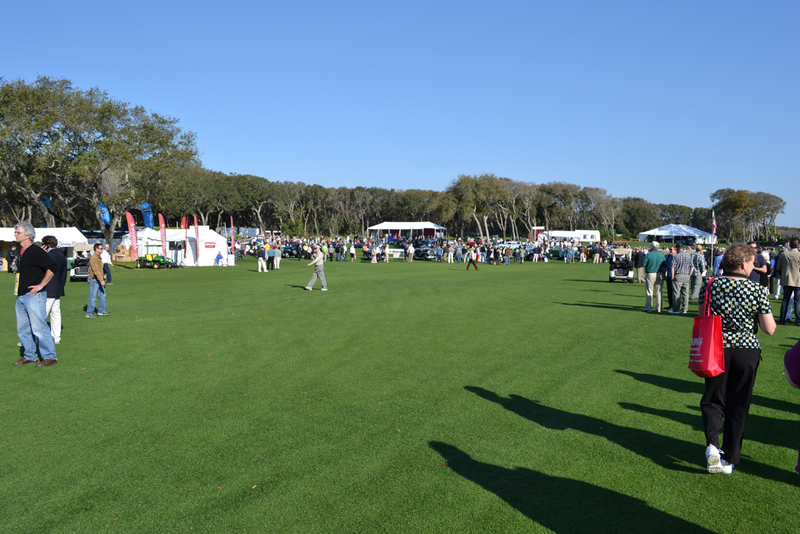 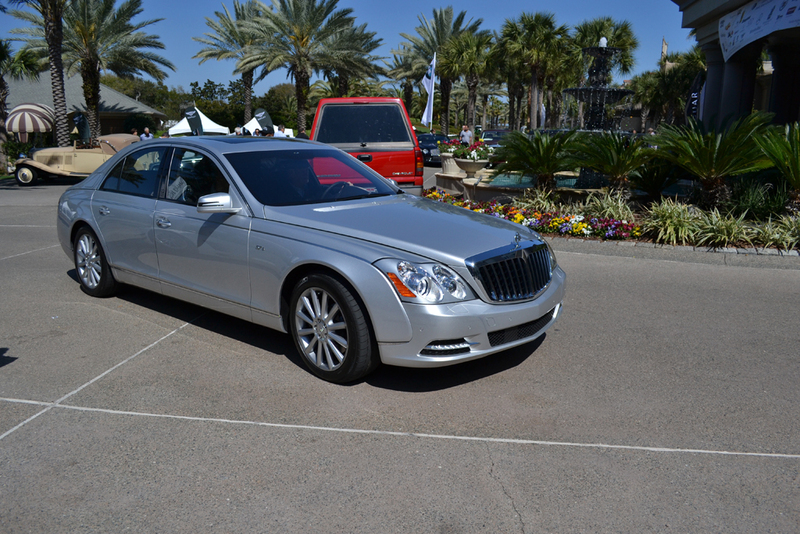 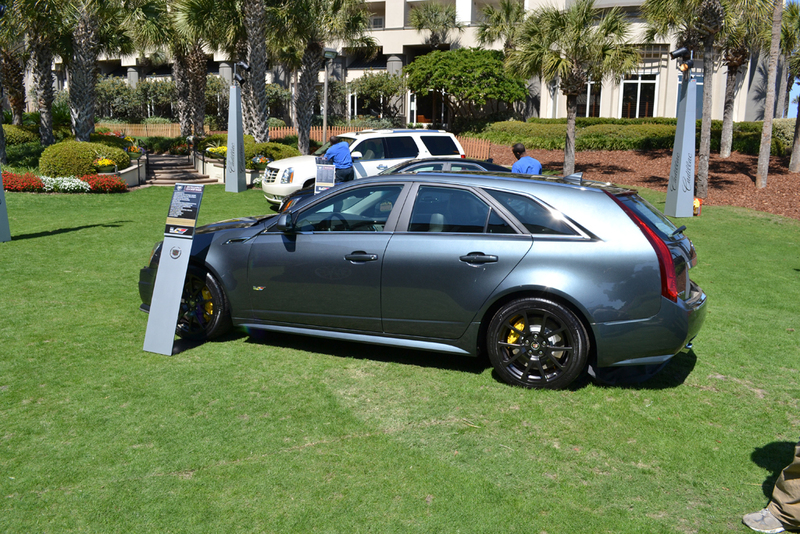 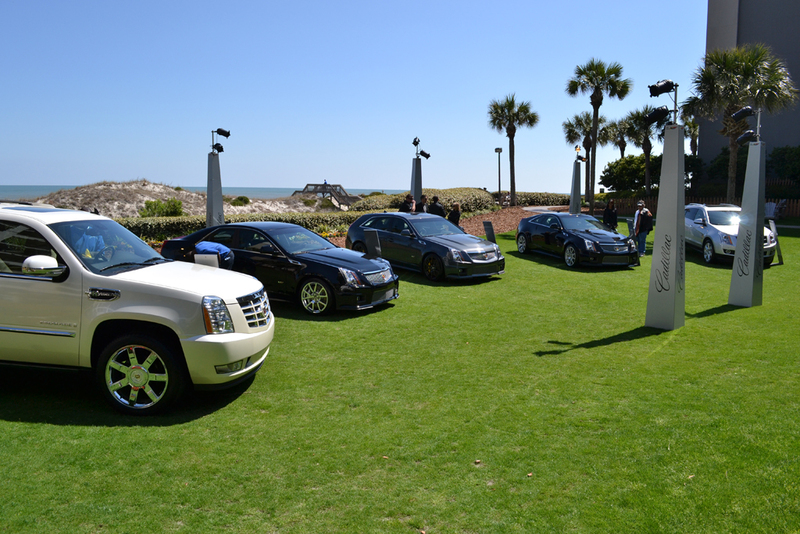 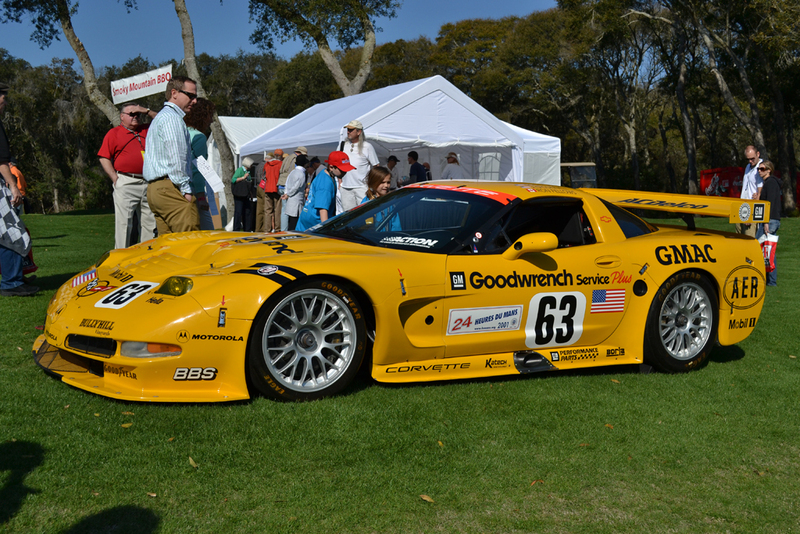 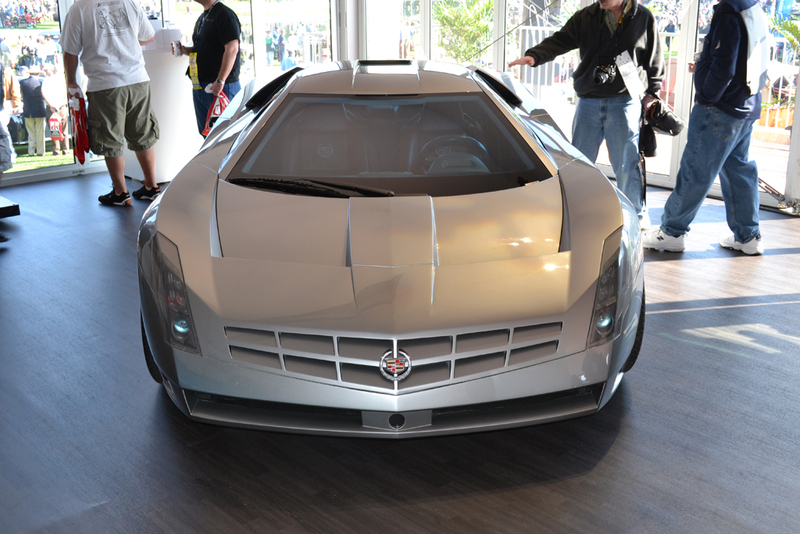 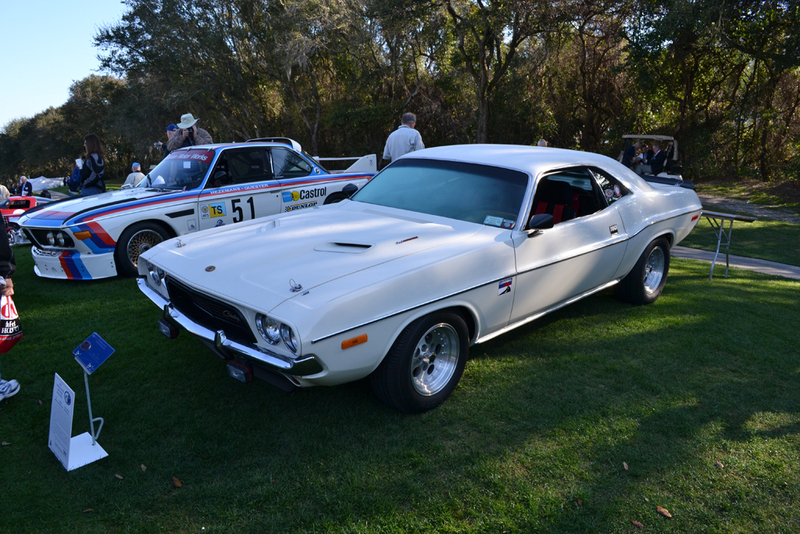 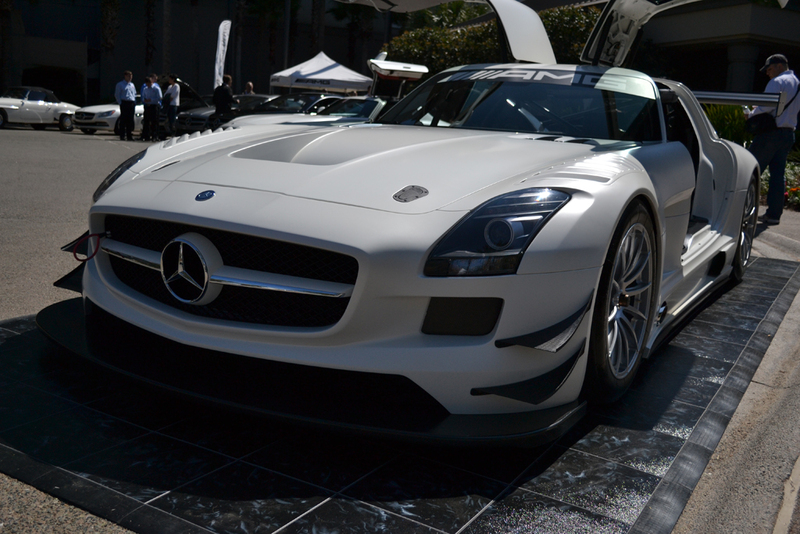 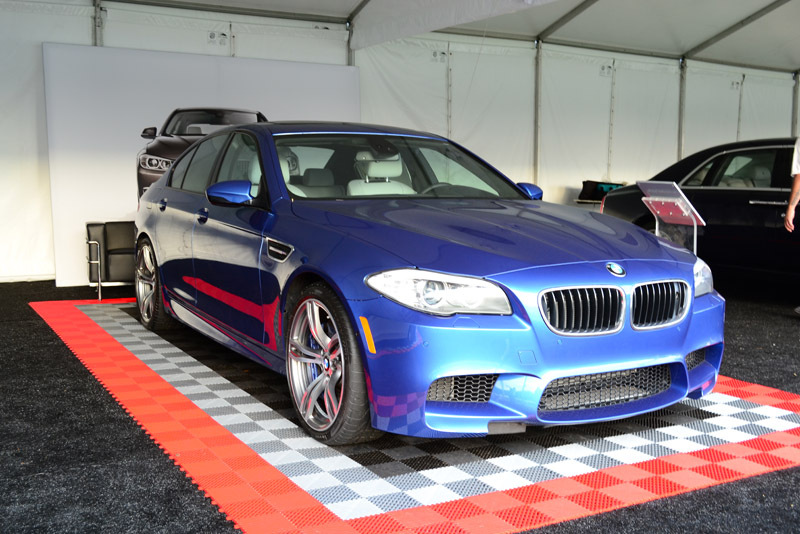 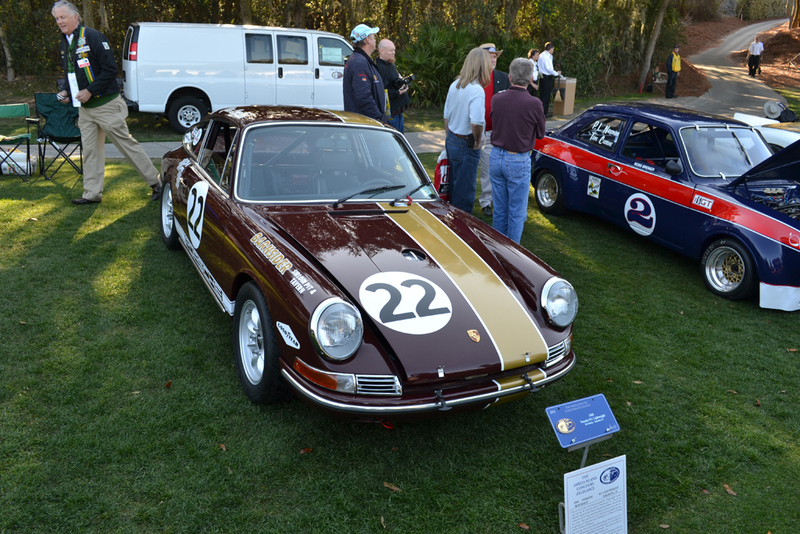 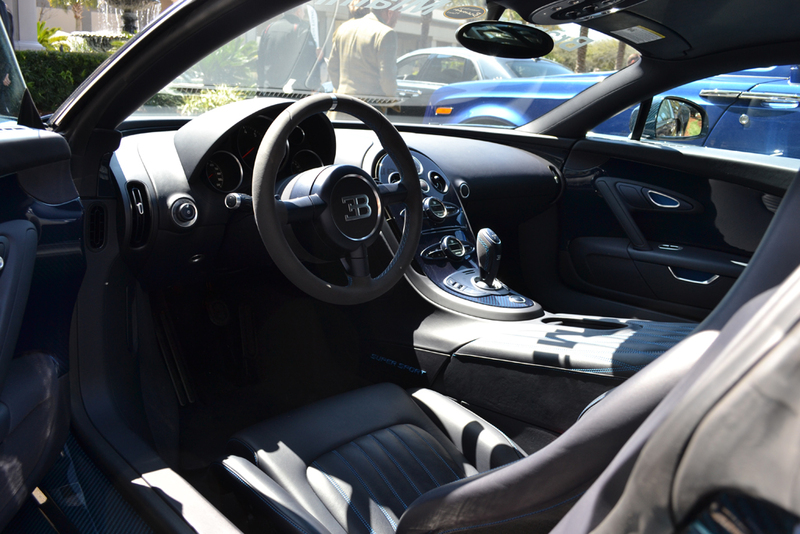 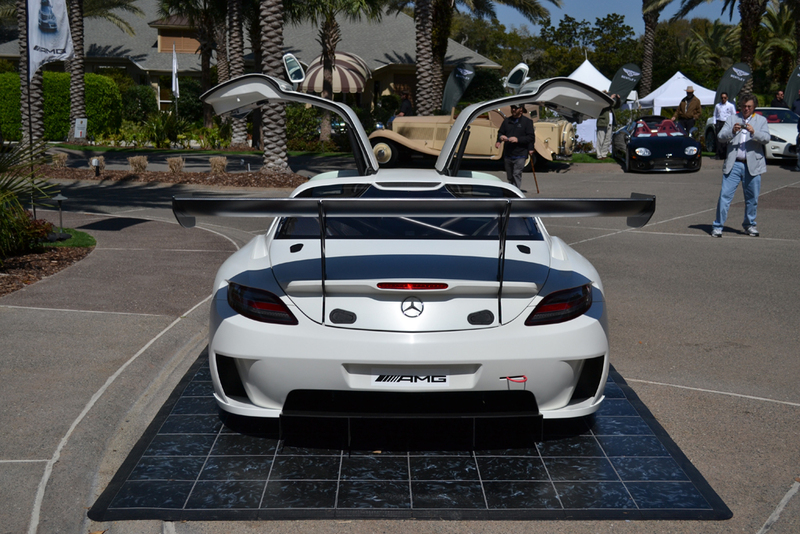 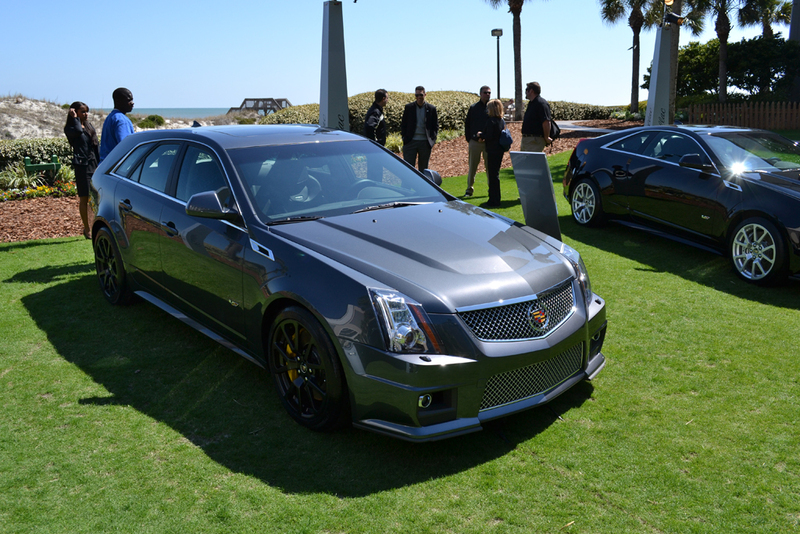 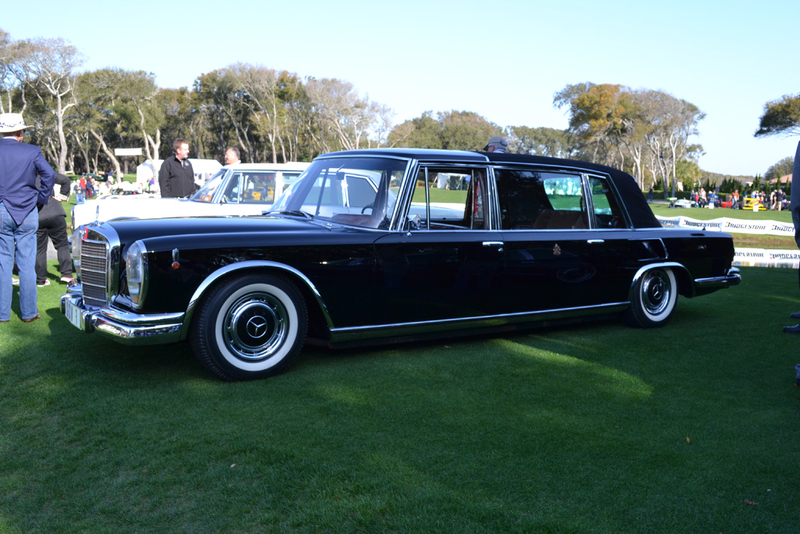 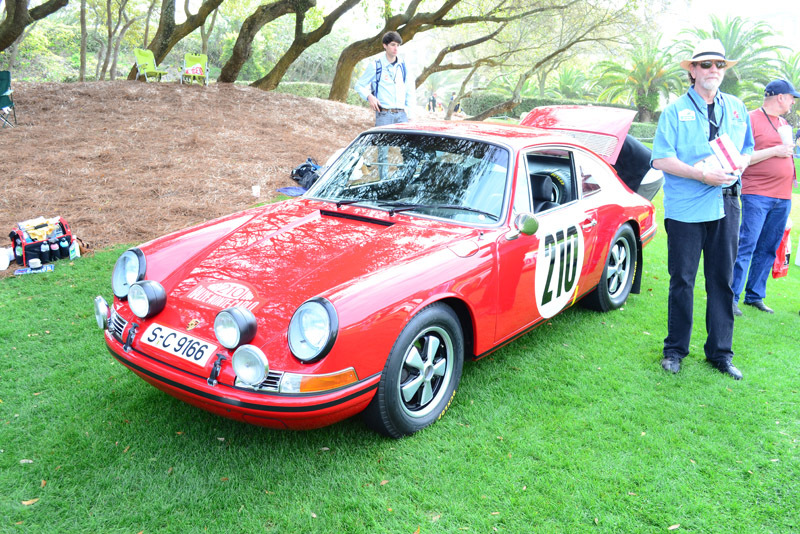 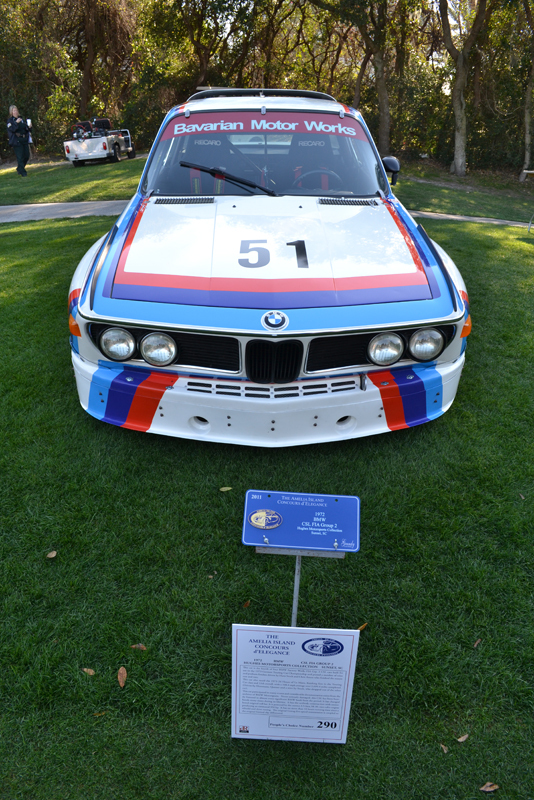 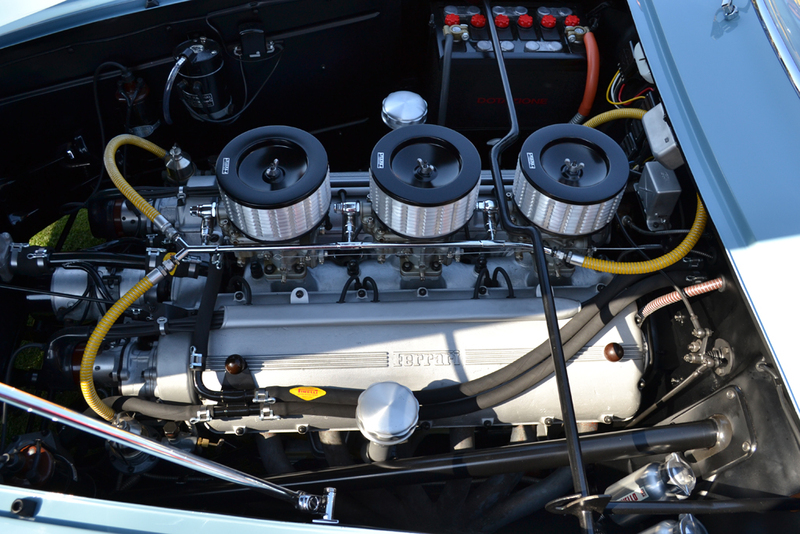 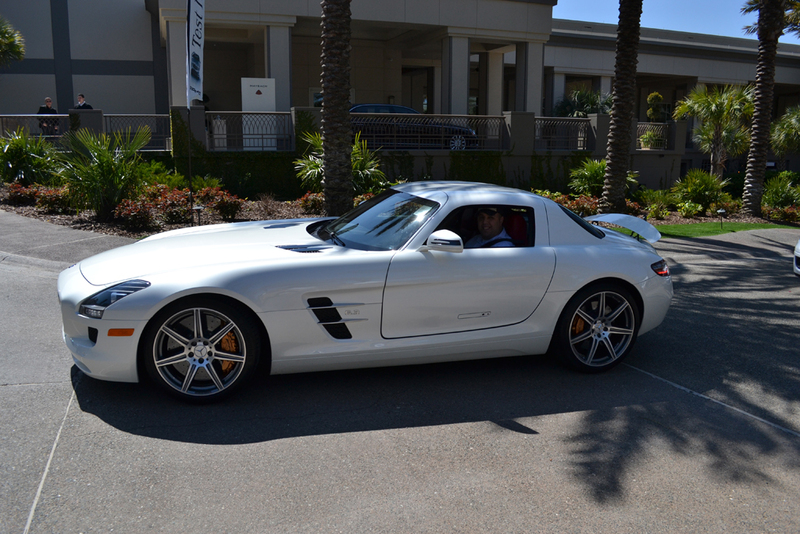 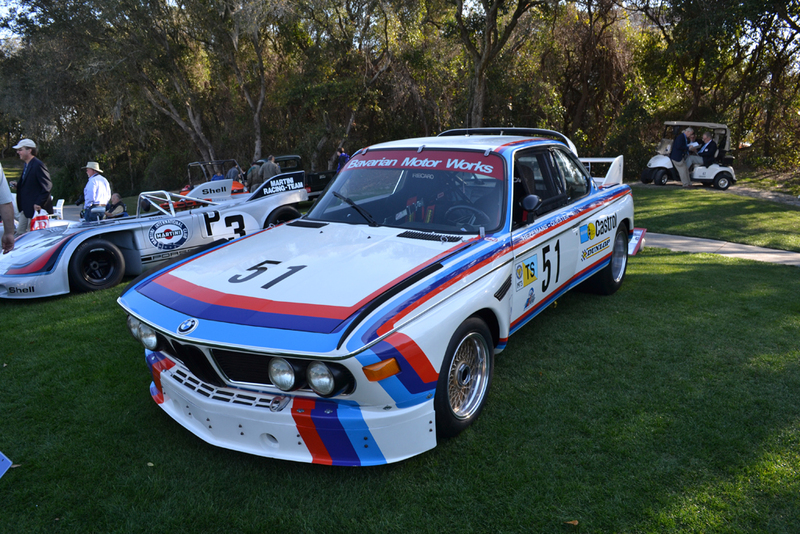 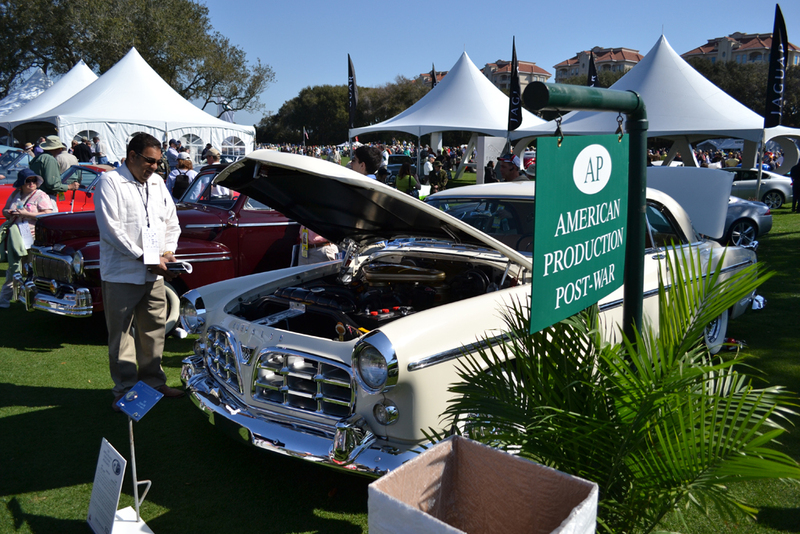 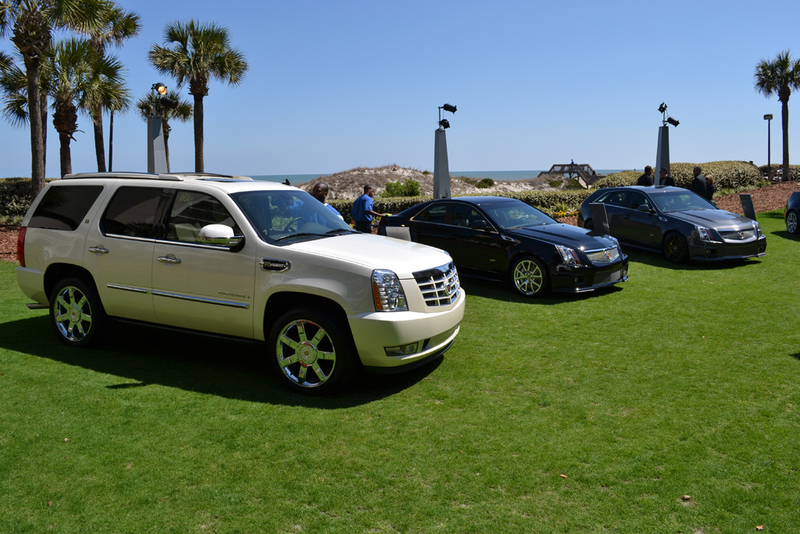 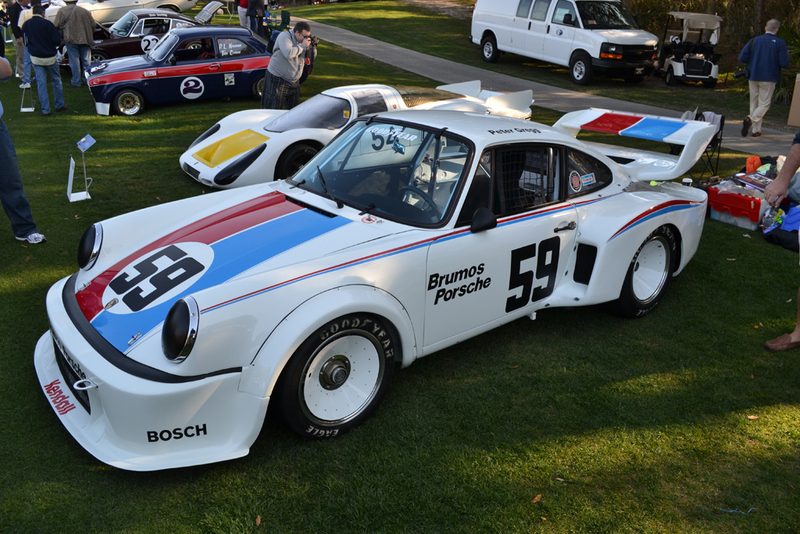 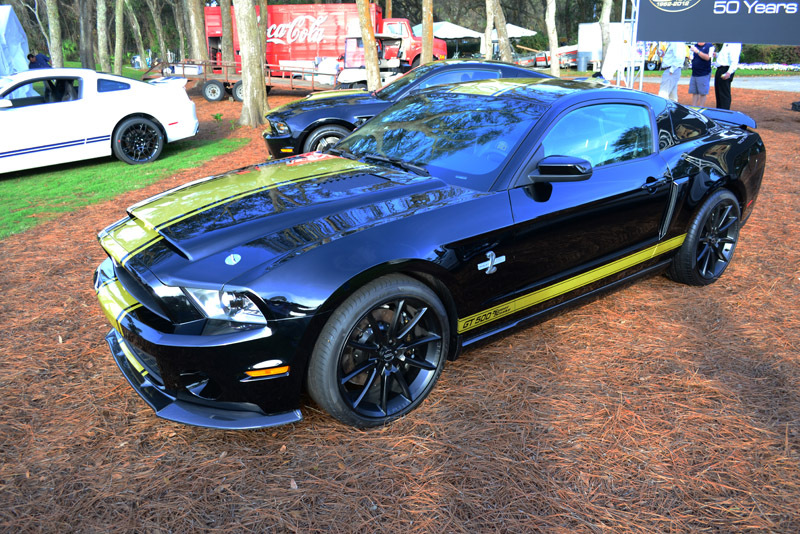 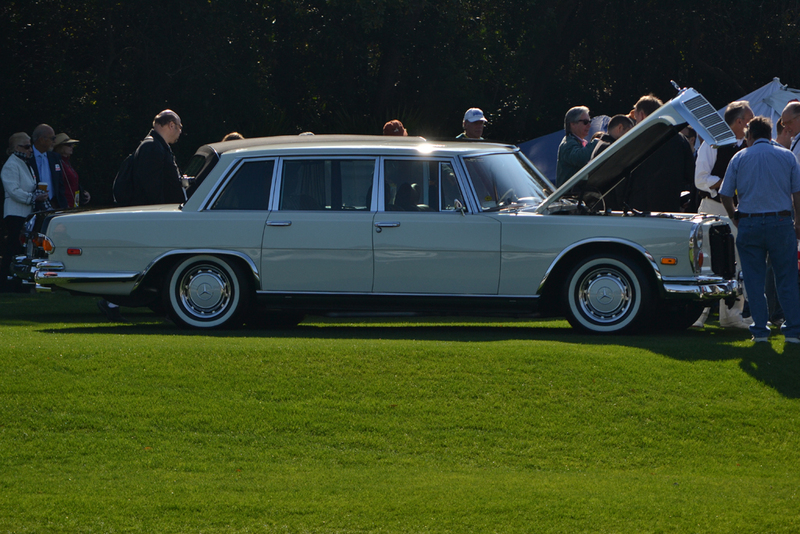 Once again, we were on the scene for the Annual Amelia Island Concours d’Elegance. 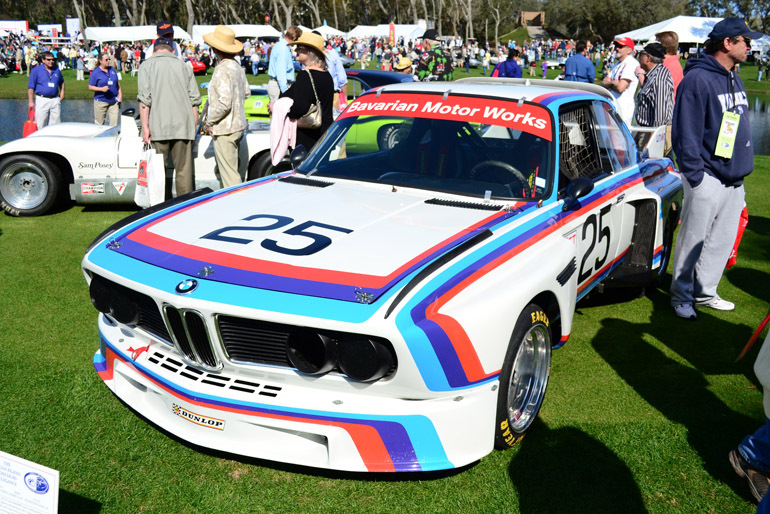 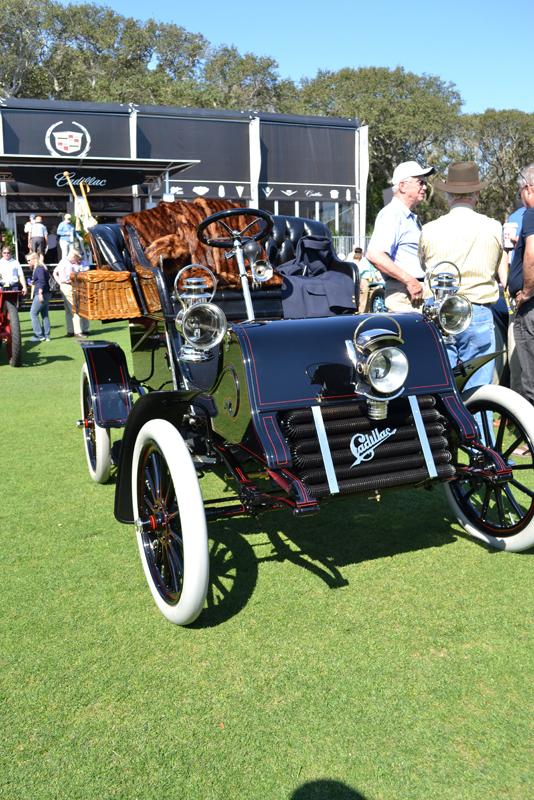 The spectacle of this truly prestigious event, marking the 18th year, kicked off the weekend to a pleasant sunny field highlighting some of the finest automobiles in the world. 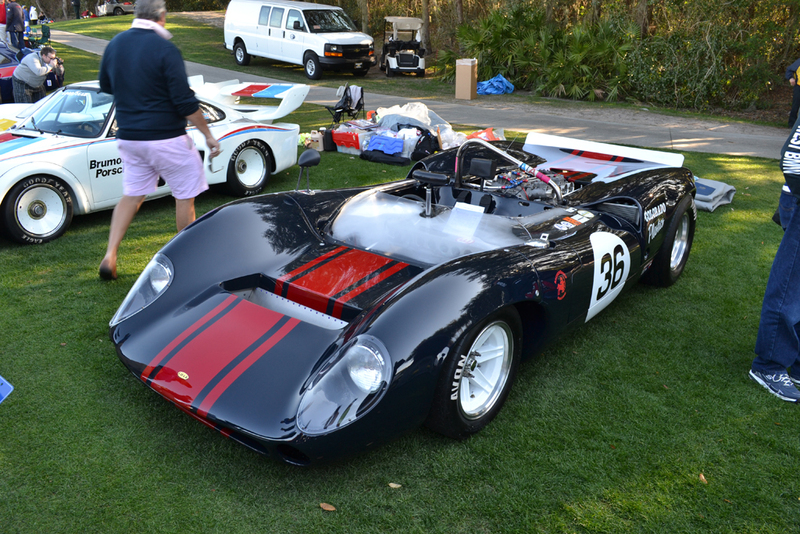 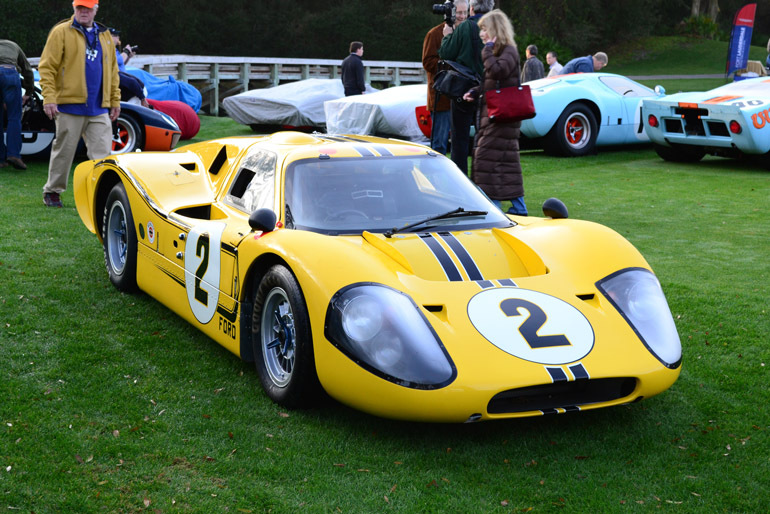 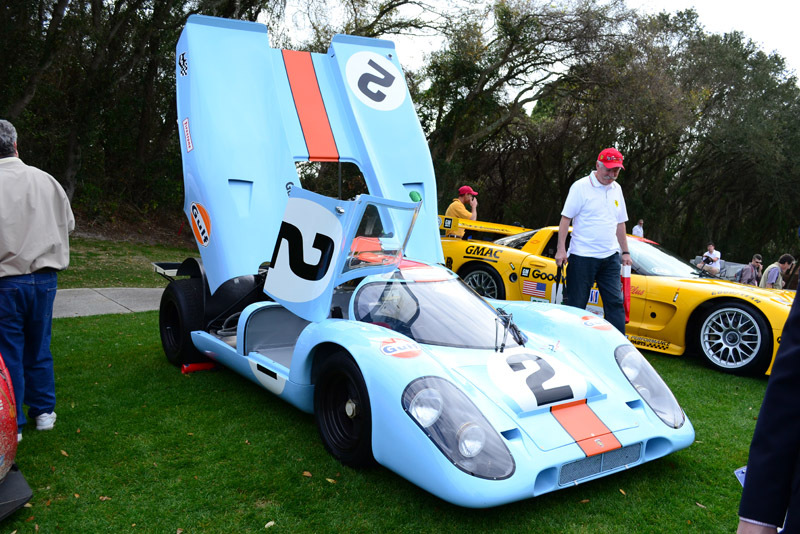 This year the Concours celebrated the 50th Anniversary of the Porsche 911 and Ford GT40 along with the cars of Harry Miller. 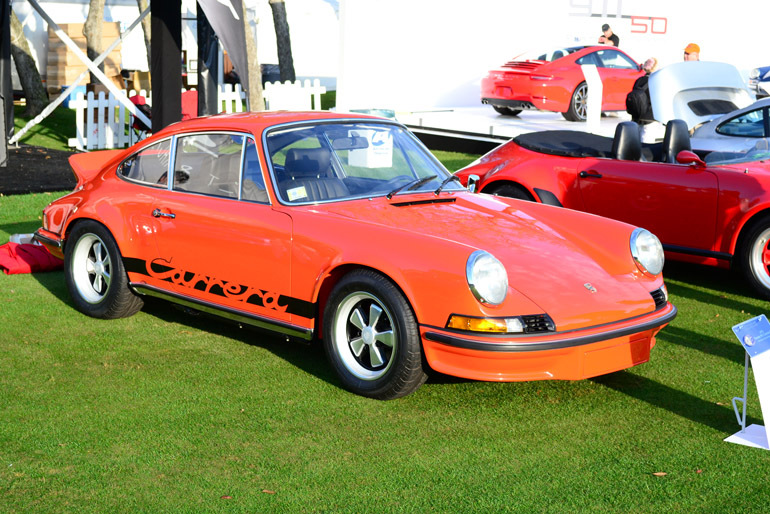 Some of the displays of Porsche 911’s were something to cherish with just about every variation of the German classic on display including a couple one-off all-wheel-drive rally 911s. 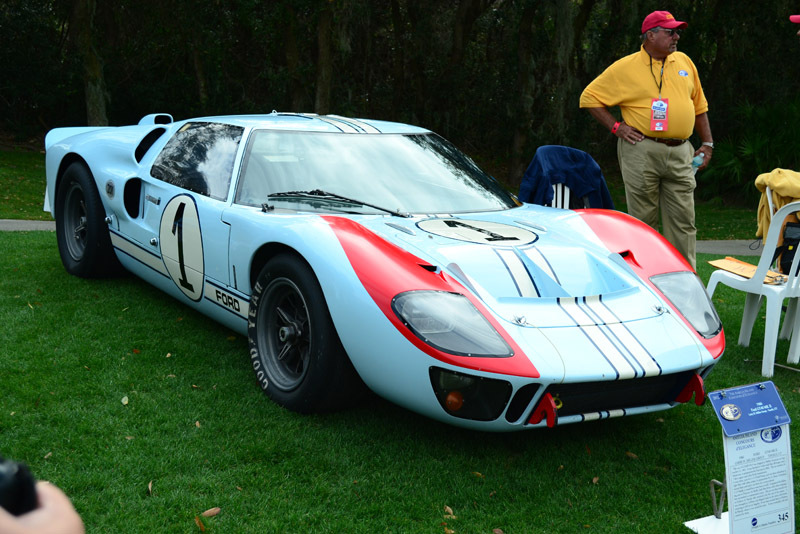 On the other end of the spectrum several iconic Ford GT40’s laced the field with their one-off displays with vast collections from Harry Miller and a few for the honorary chairman Sam Posey. 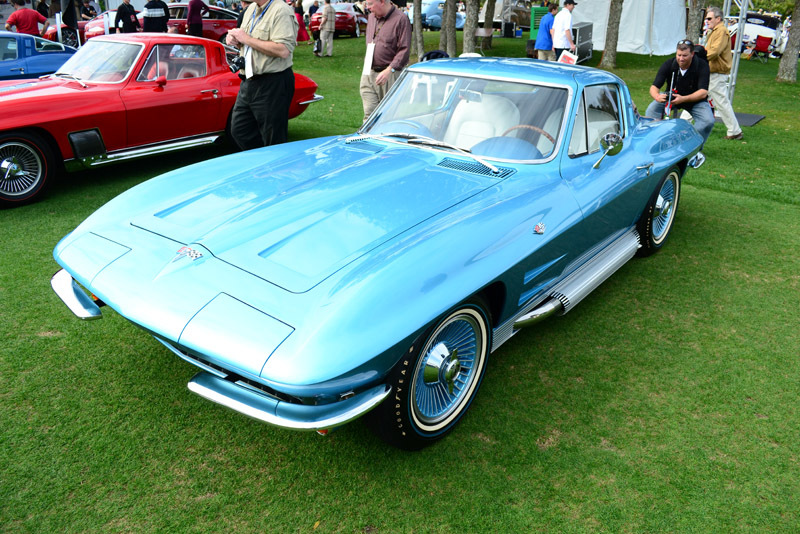 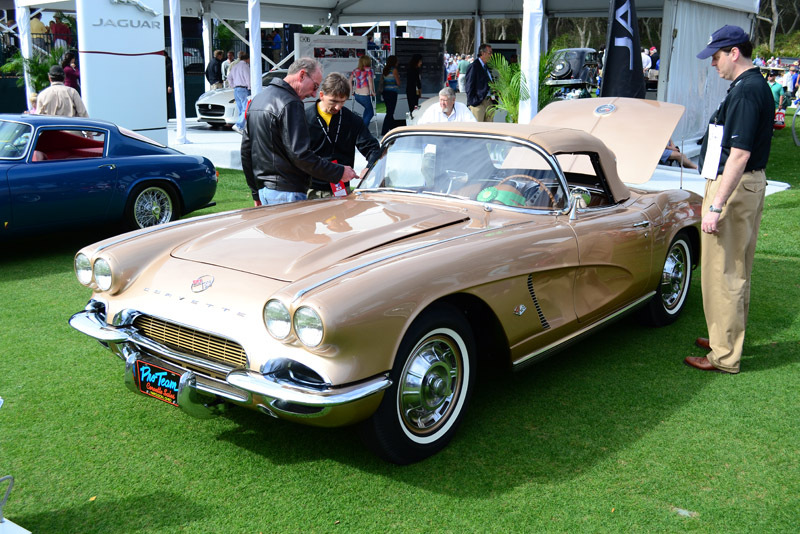 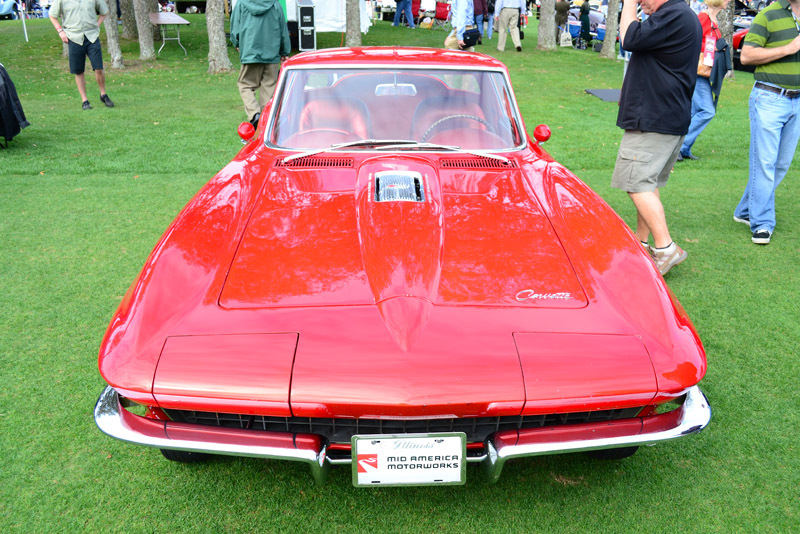 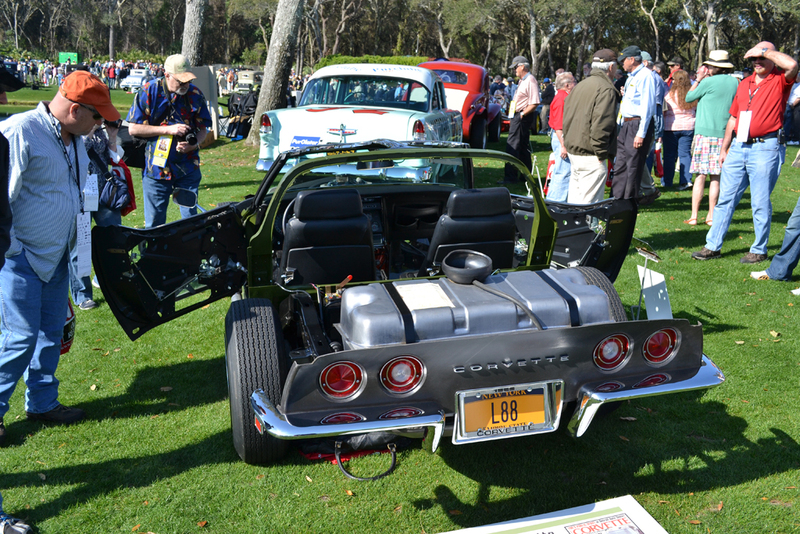 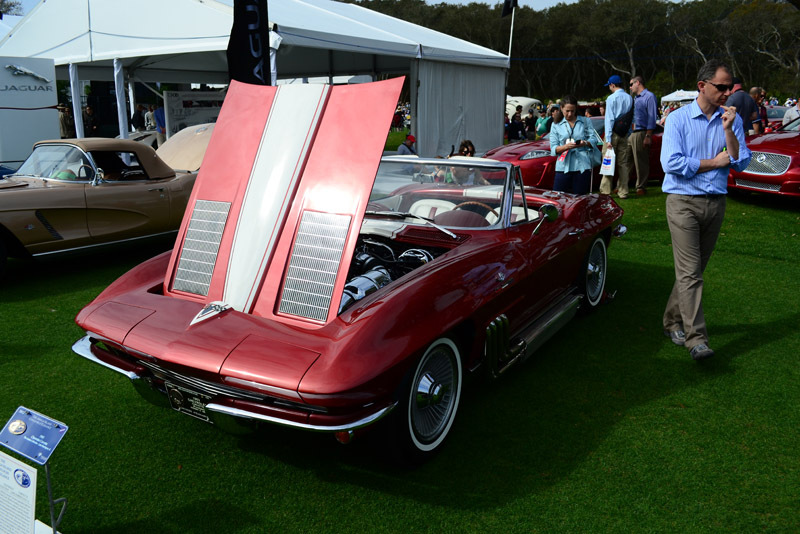 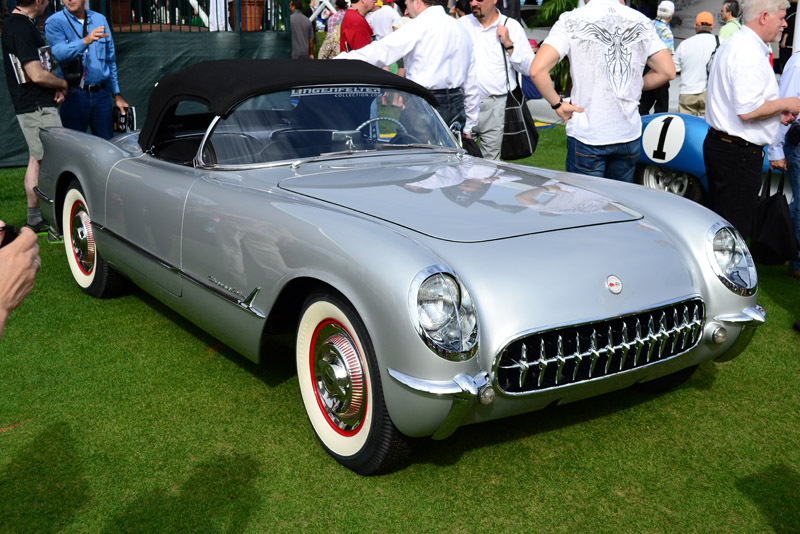 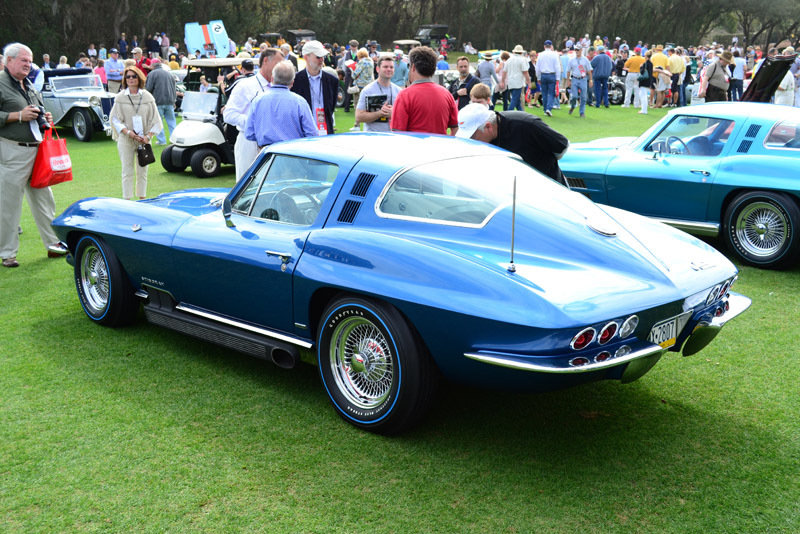 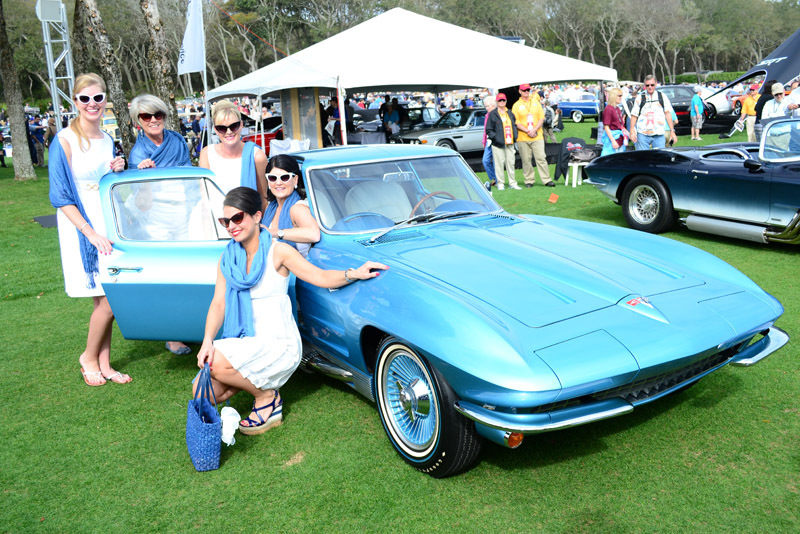 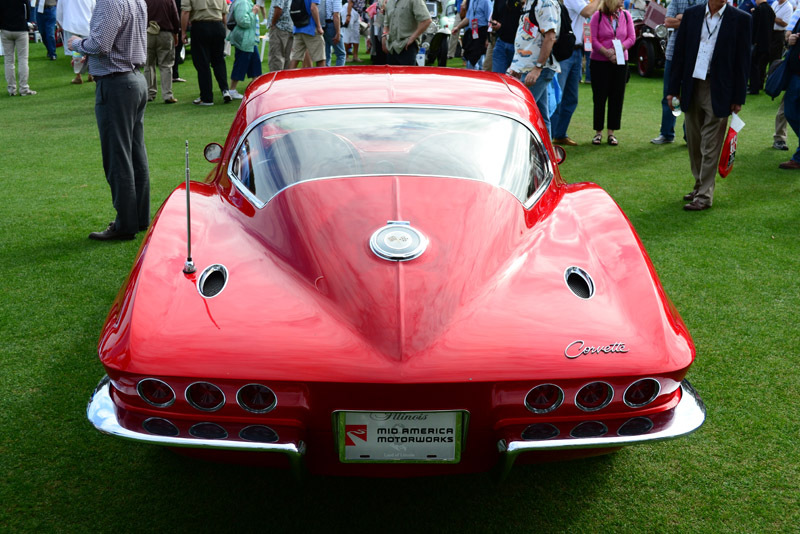 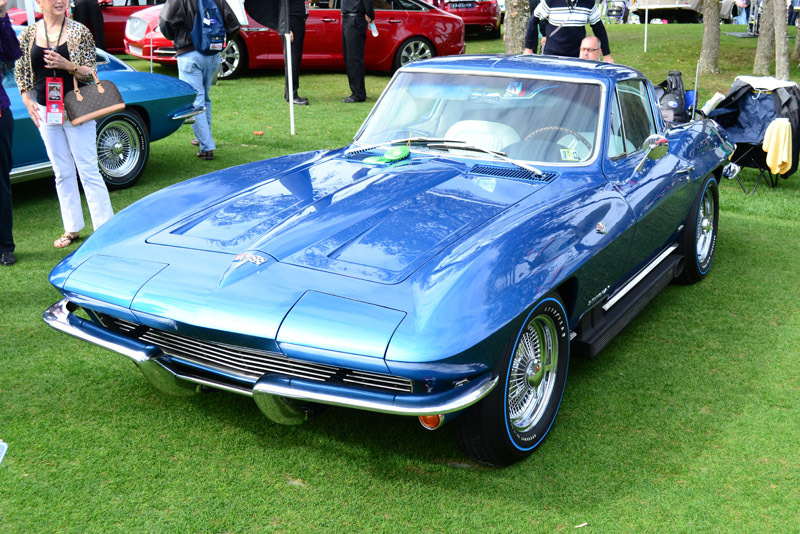 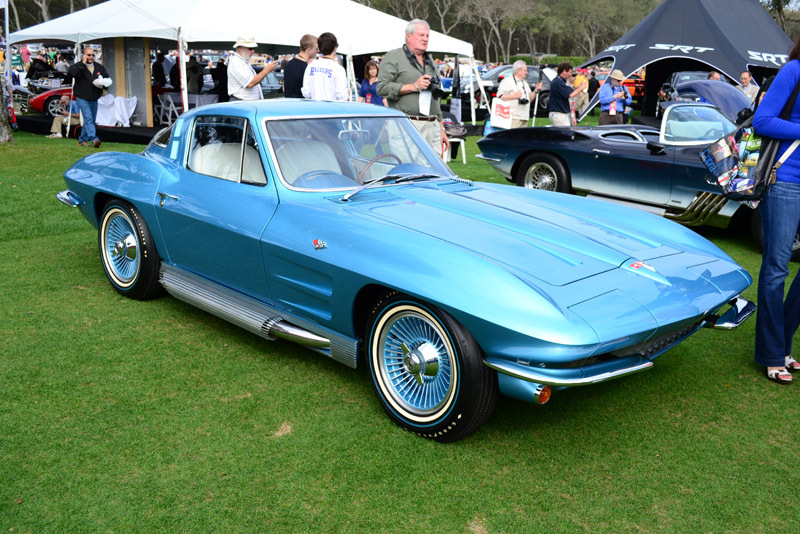 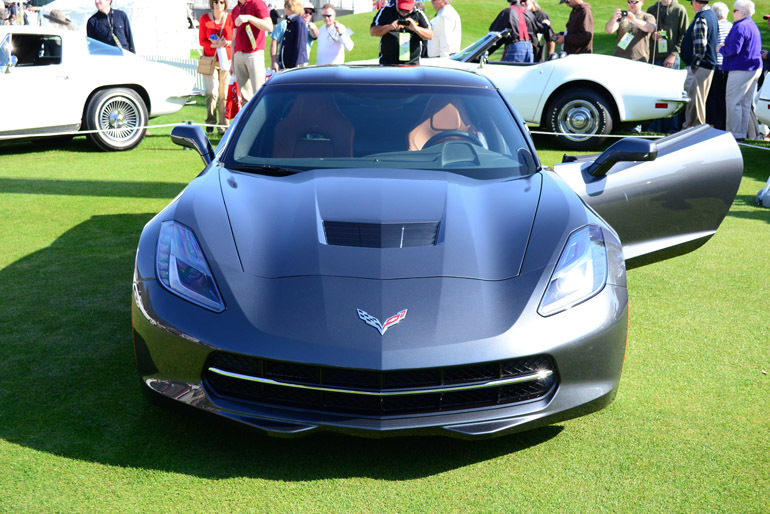 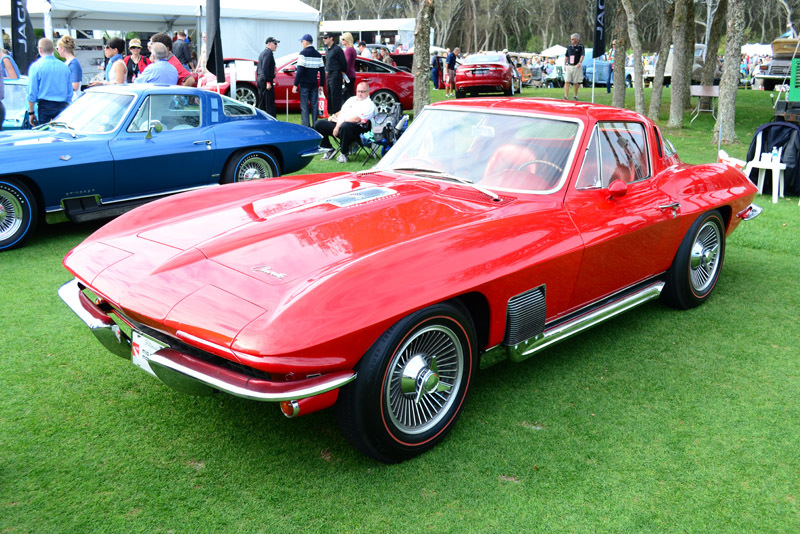 The Amelia Island Concours d’Elegance also highlighted over 60 years of the Corvette with the all-new 2014 Corvette Stingray on display surrounded by notable Corvette models through the years. 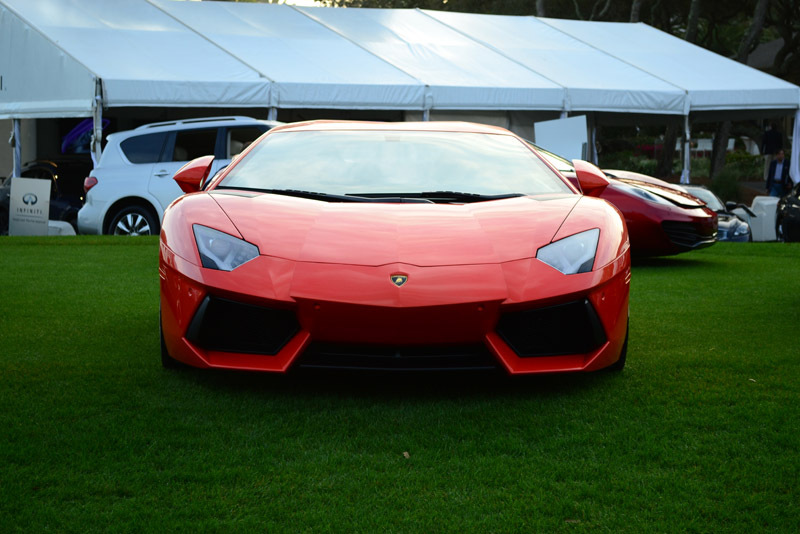 We didn’t forget the astonishing Lamborghini’s at the start of the field to really get your motors running. 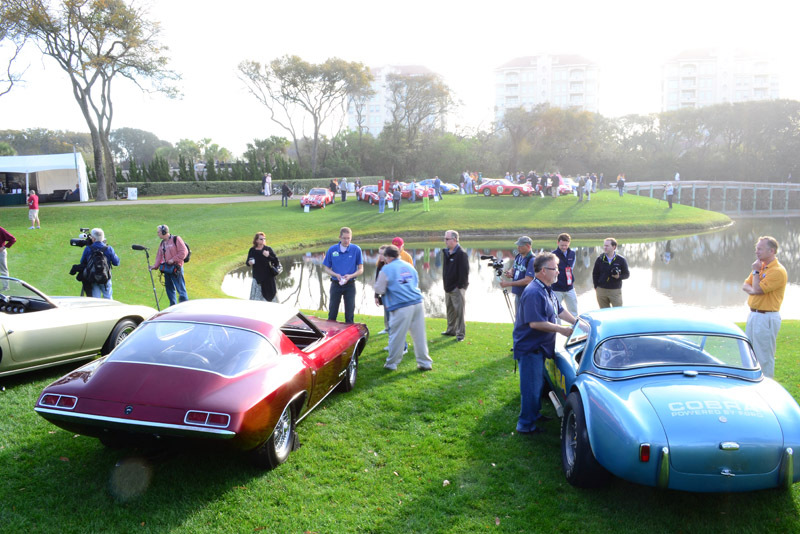 Seminars featured Ed Welburn, Vice President Global Design at General Motors, 1963 Sting Ray designer Peter Brock and the GT40 racing tales by Dan Gurney, David Hobbs, Brian Redman and others. 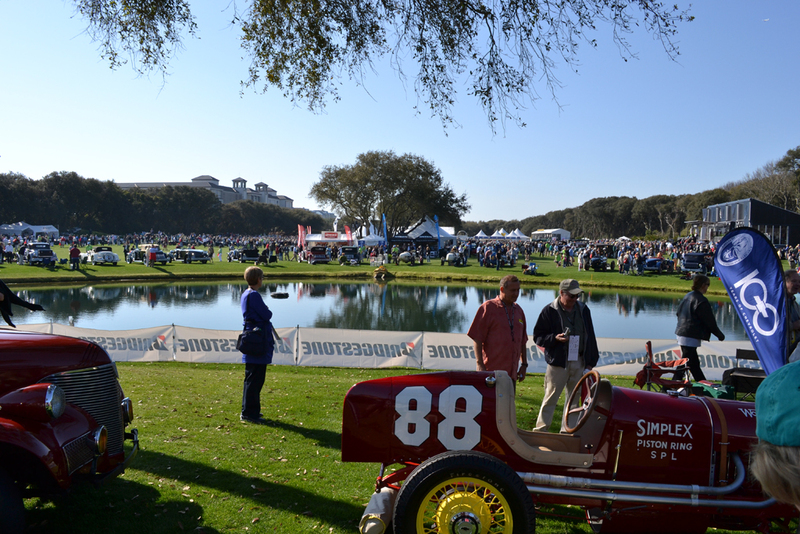 Every year the Amelia Island Concours d’Elegance gets better and better, the images below that we captured is further proof of concept. 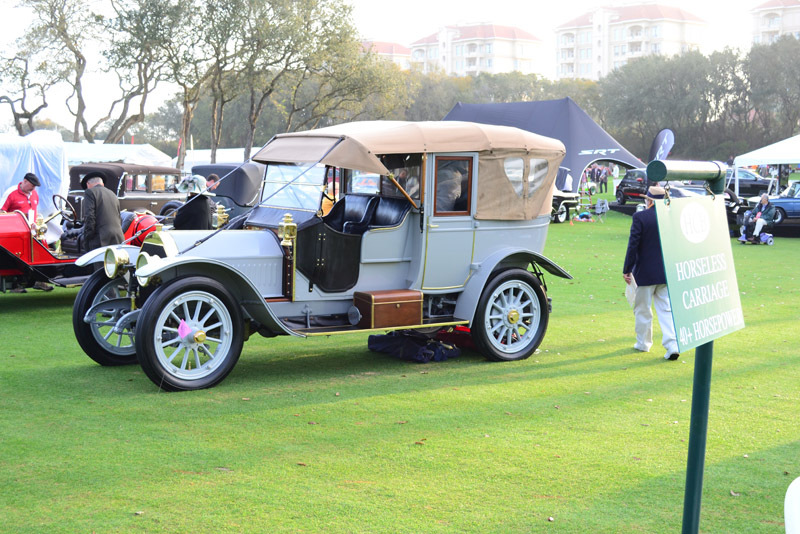 We look forward to joining the festivities once again next year and sharing many of these stunning automobiles with you. 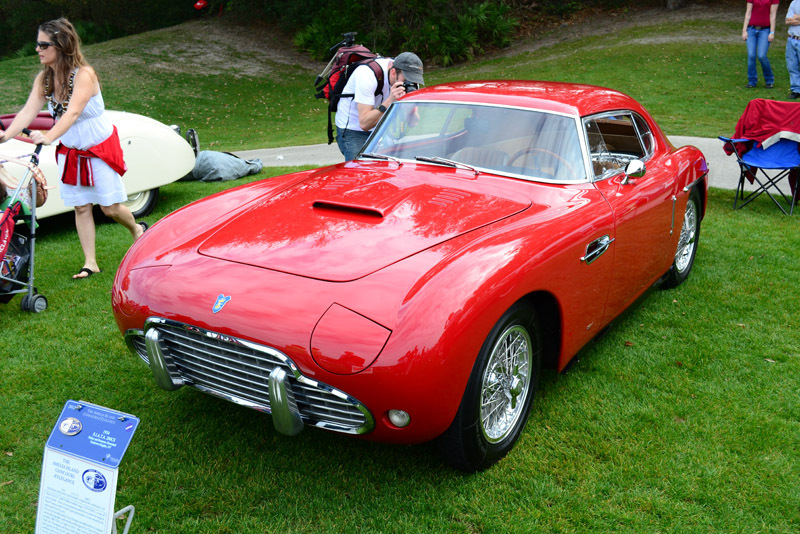 In modern times, Italian design firm Zagato is perhaps most closely associated with Aston Martin, but the Milan-based company has a lengthy history with Alfa Romeo as well. 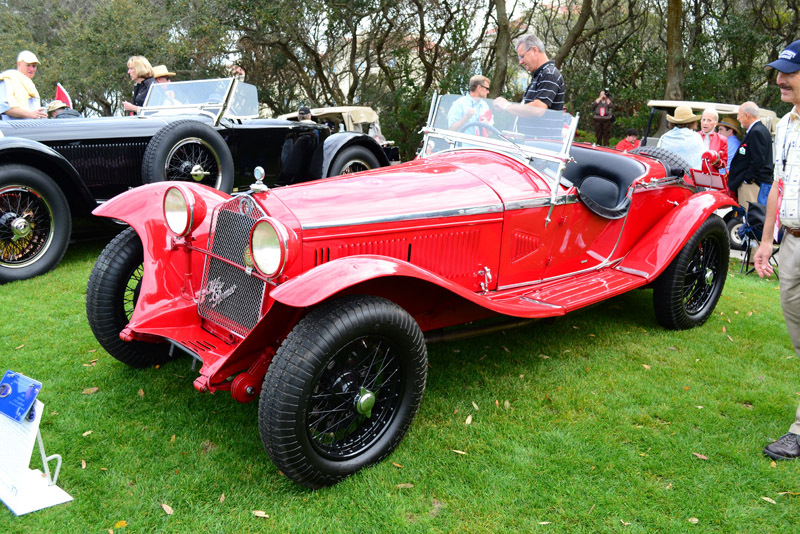 Through the 1930s, the vast majority of its creations were branded as Alfa Romeos, and the tradition has carried over to the present day. 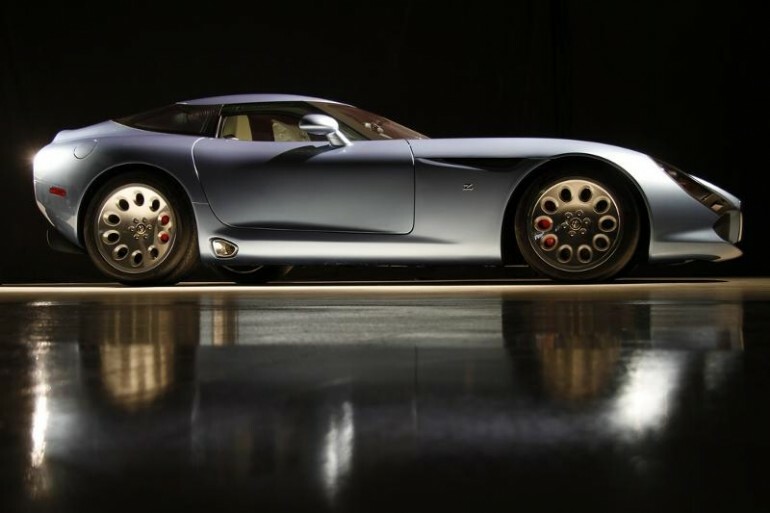 At the 2010 Villa d’Este, Zagato showed a concept track car honoring 100 years of Alfa Romeo racing heritage. Though the Alfa Romeo Zagato Corsa TZ3 never saw production, a road-going variant was built in a limited quantity of just nine units. 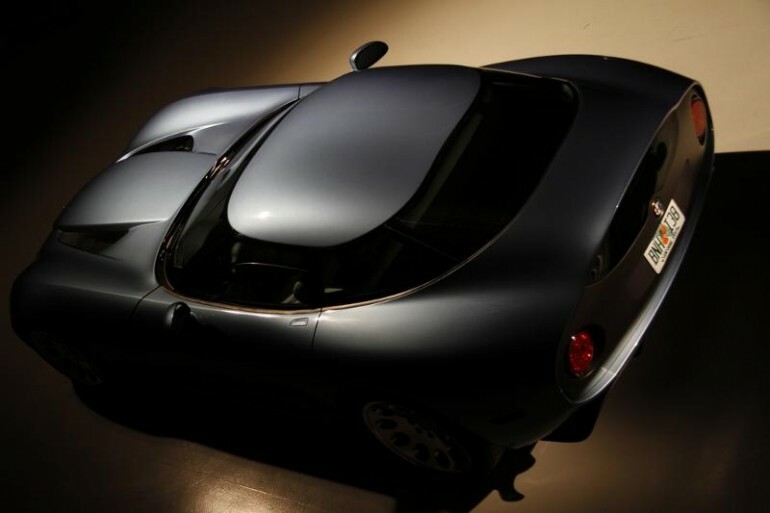 Based on a Dodge Viper ACR chassis and mechanicals, the first Alfa Romeo Zagato Stradale TZ3 was delivered in 2011. 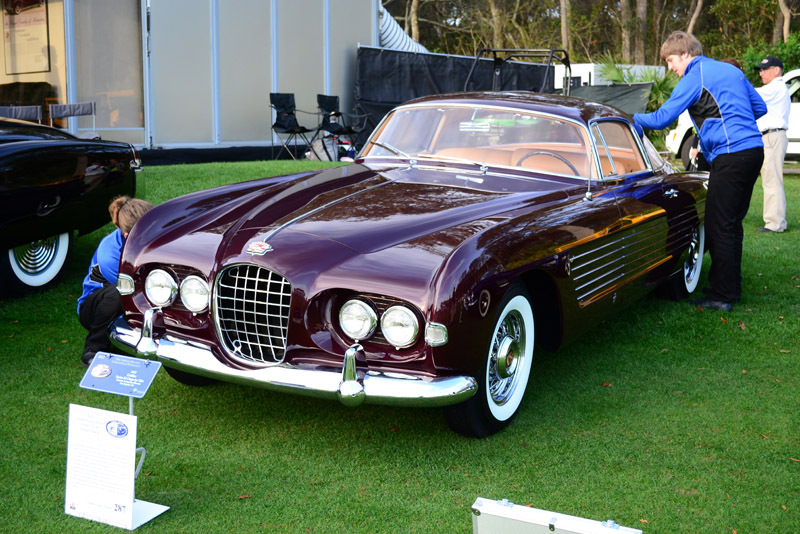 Production of the stunning Italian-American masterpiece has now ended, and the last car built will make its official debut at this year’s Amelia Island Concours d’Elegance. 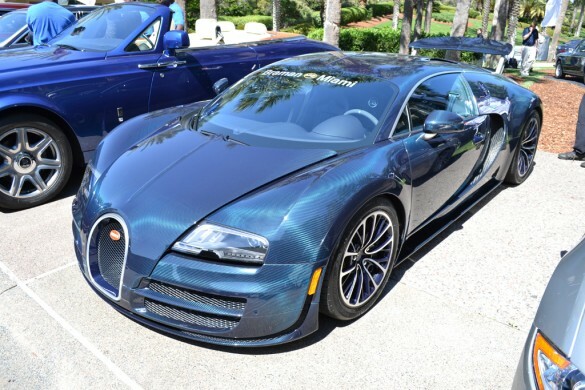 Painted in Azzurro Californina (“California Blue,” if you don’t speak Italian), the carbon fiber-bodied masterpiece is capable of sprinting from 0-60 mph in just 3.5 seconds, thanks to the 600-horsepower, 8.4-liter Viper V-10 beneath its hood. 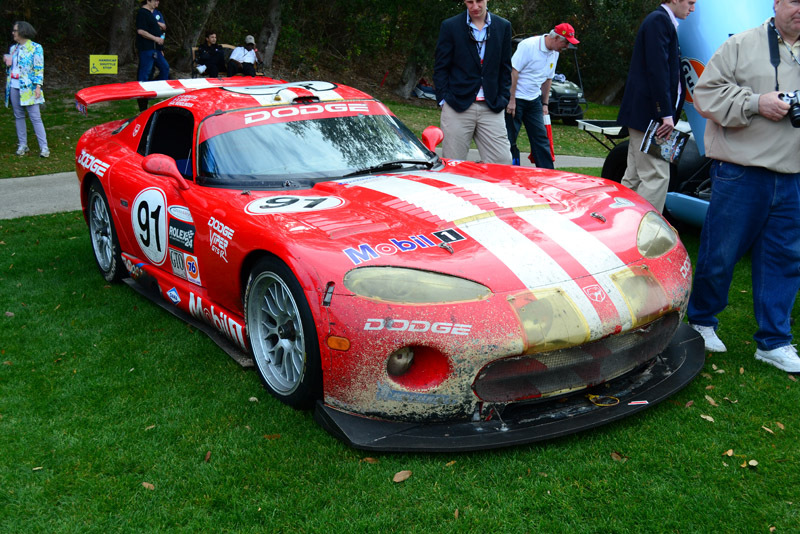 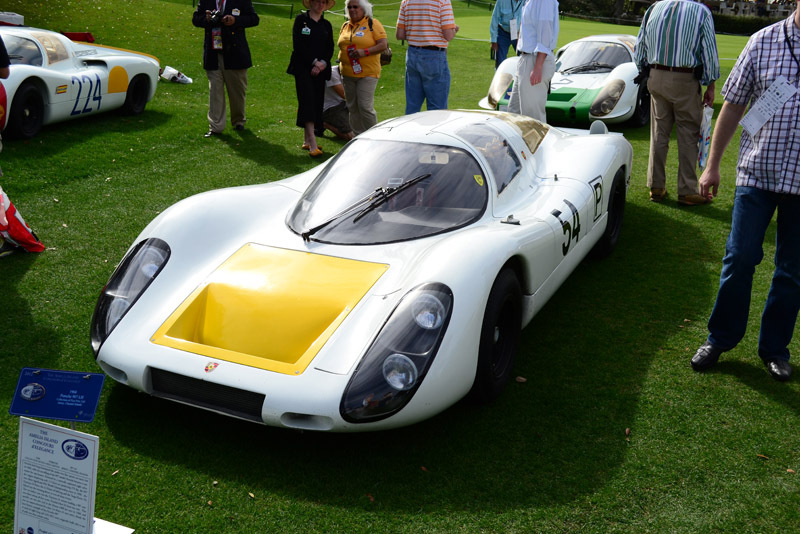 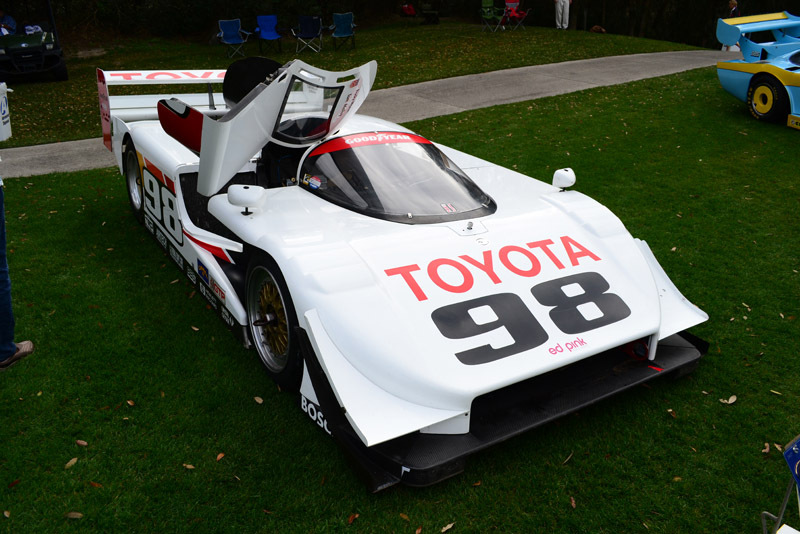 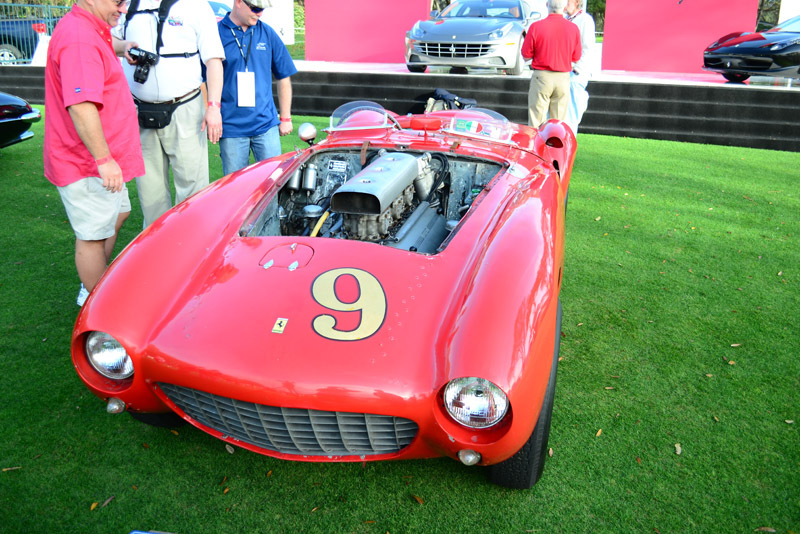 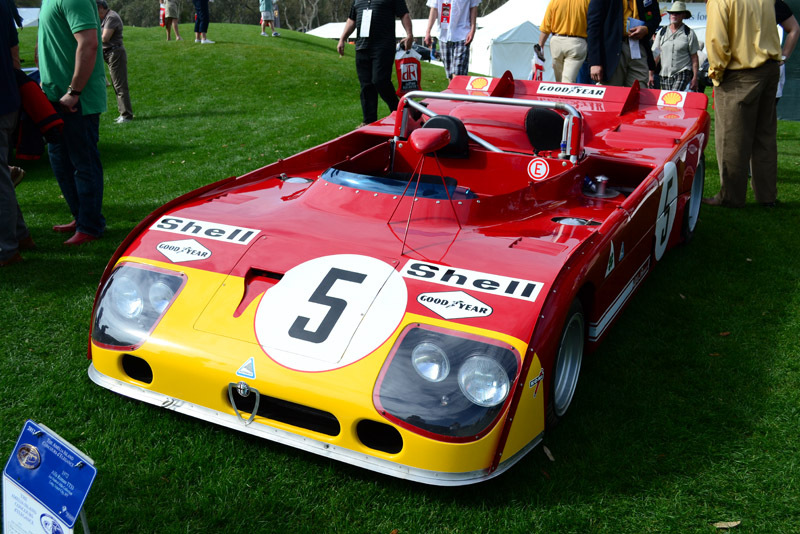 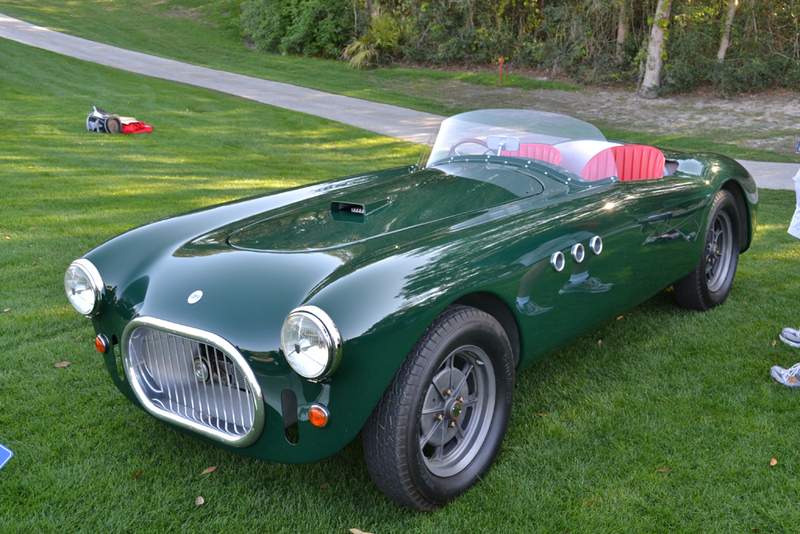 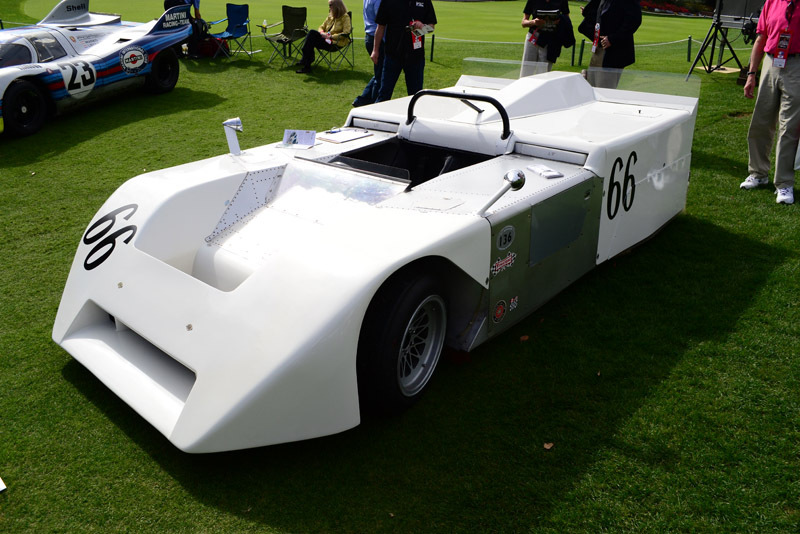 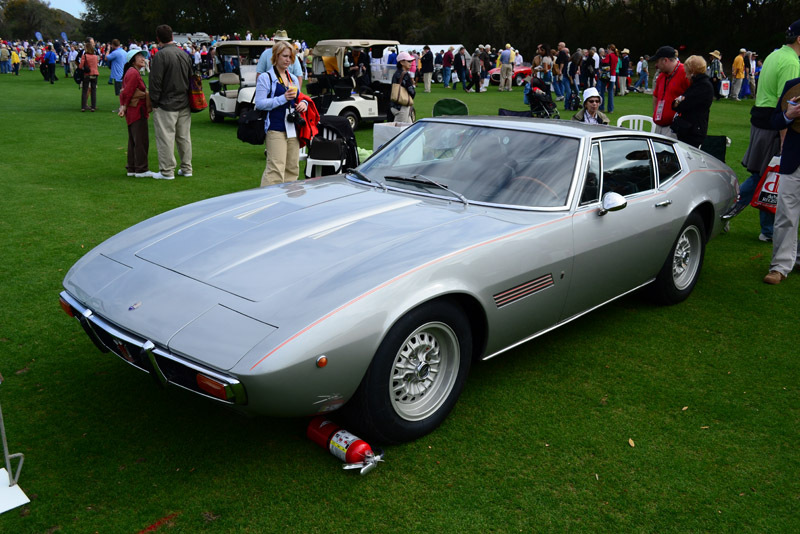 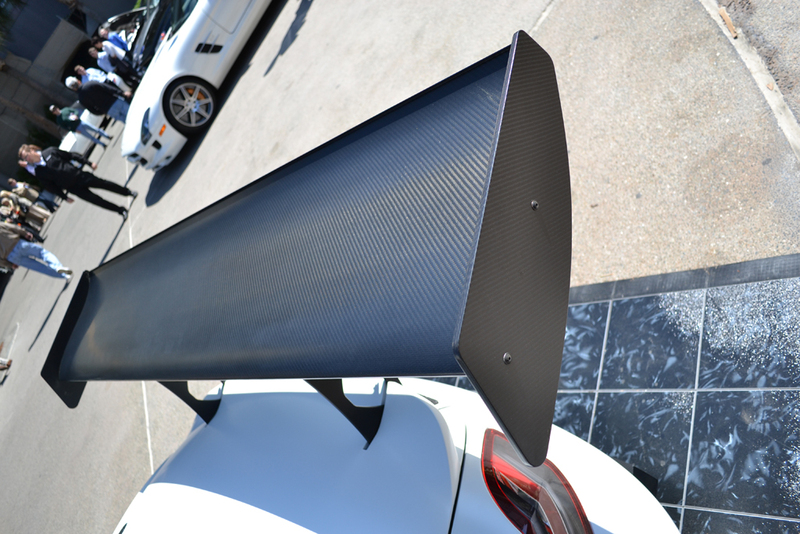 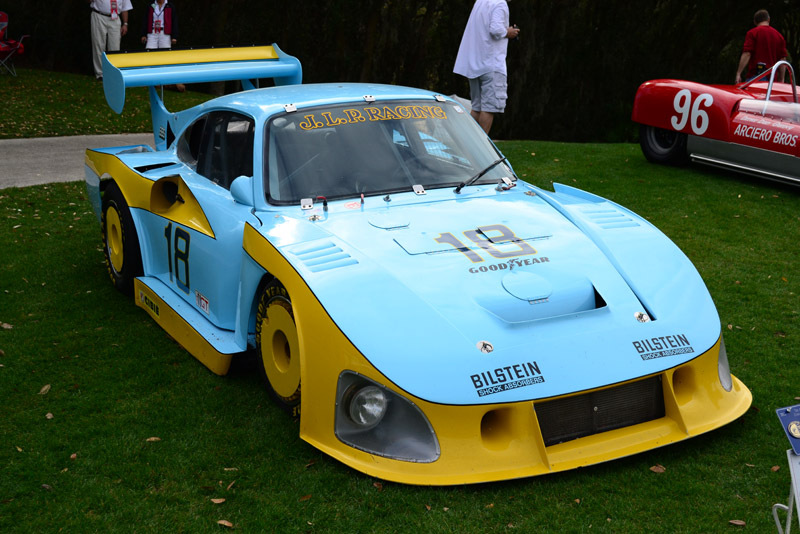 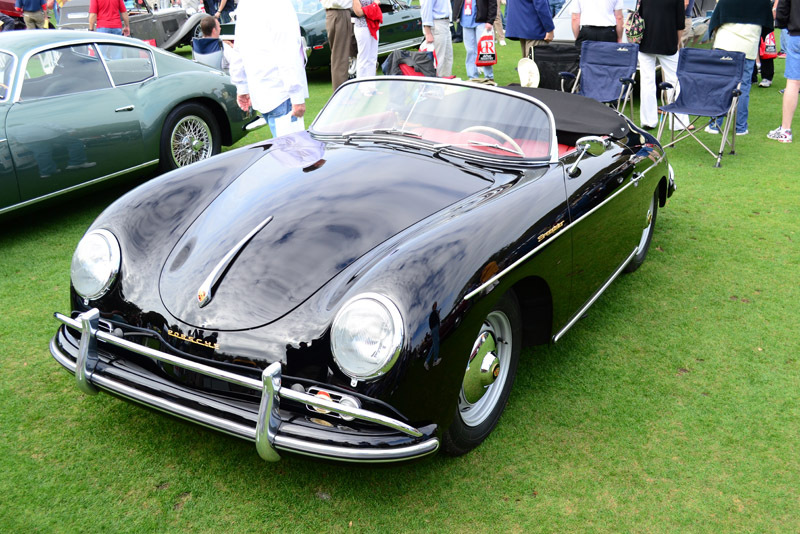 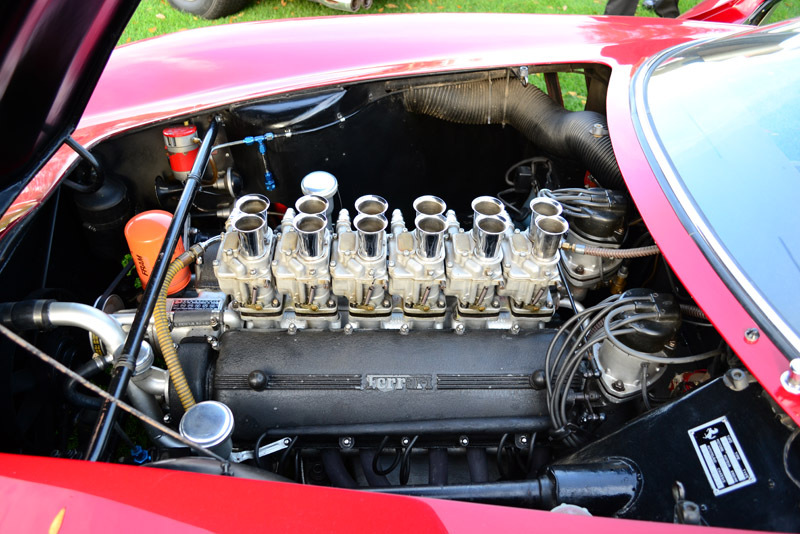 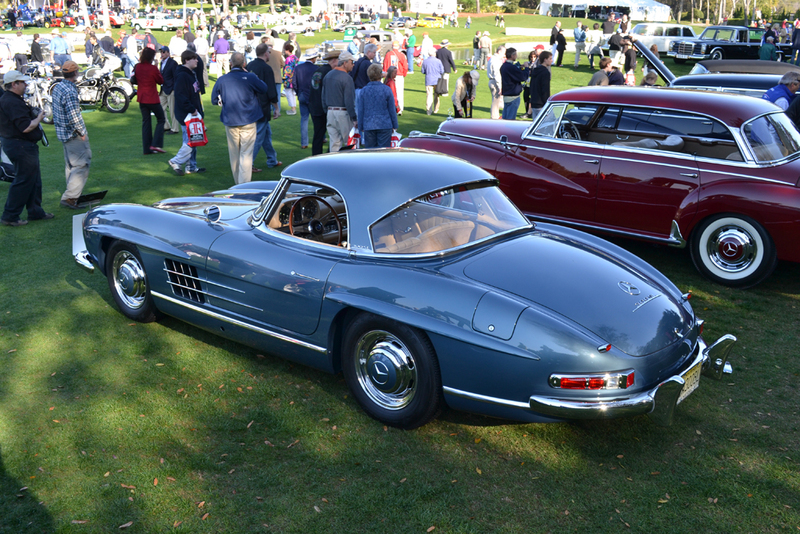 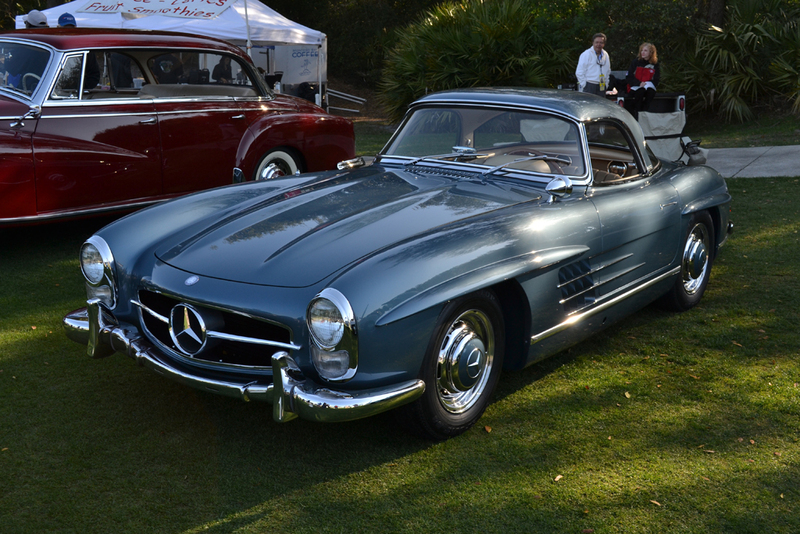 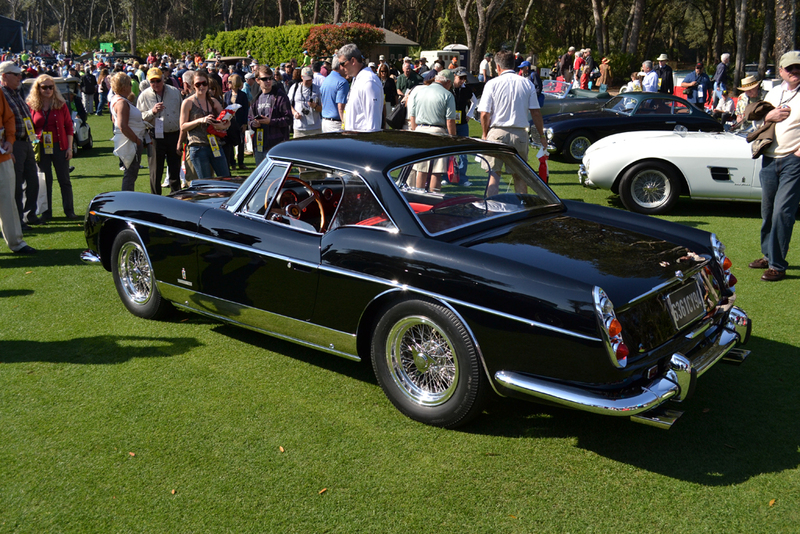 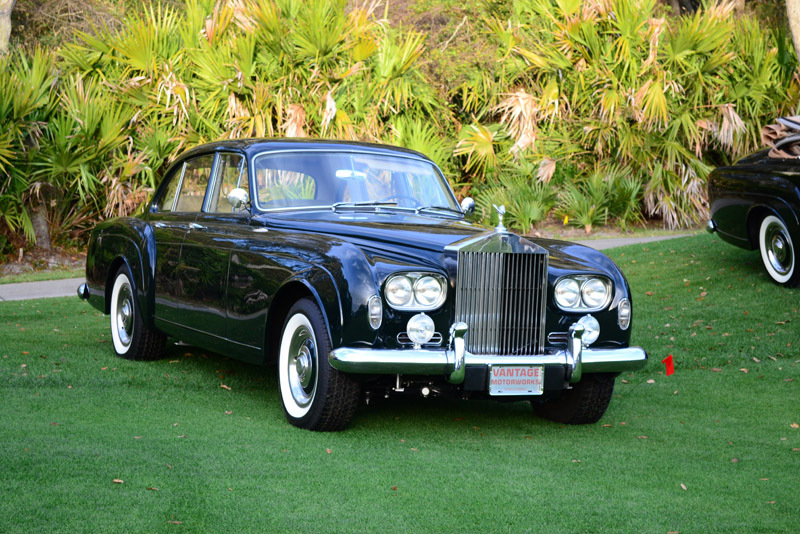 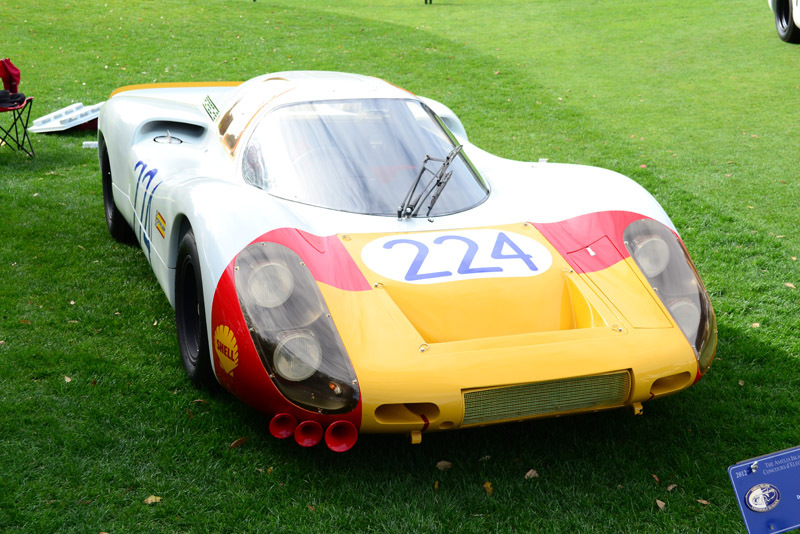 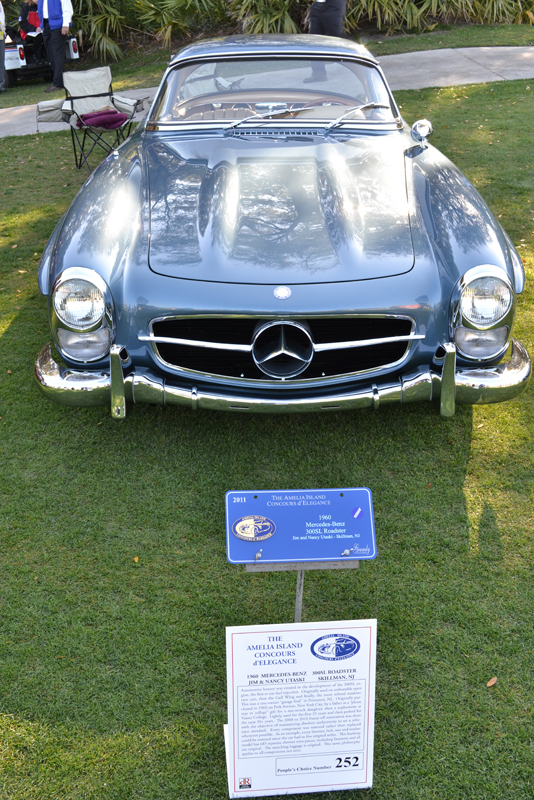 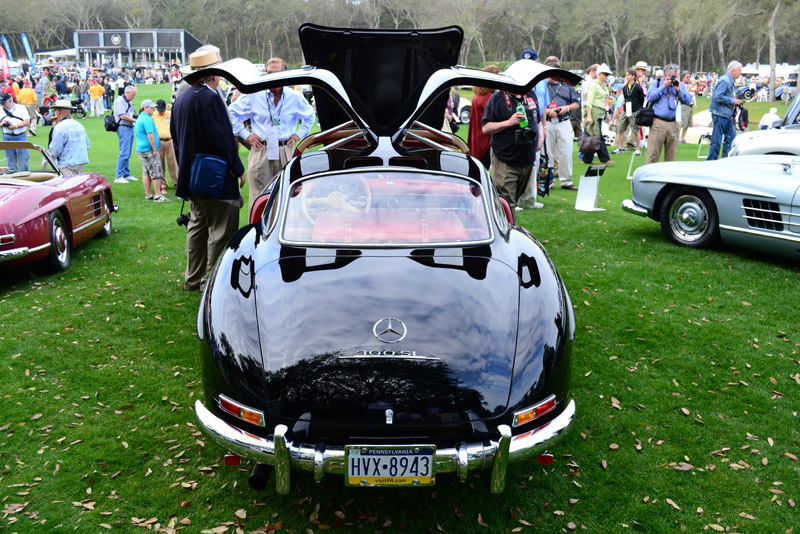 We see this as just one more reason to attend the 18th annual Amelia Island Concours d’Elegance. 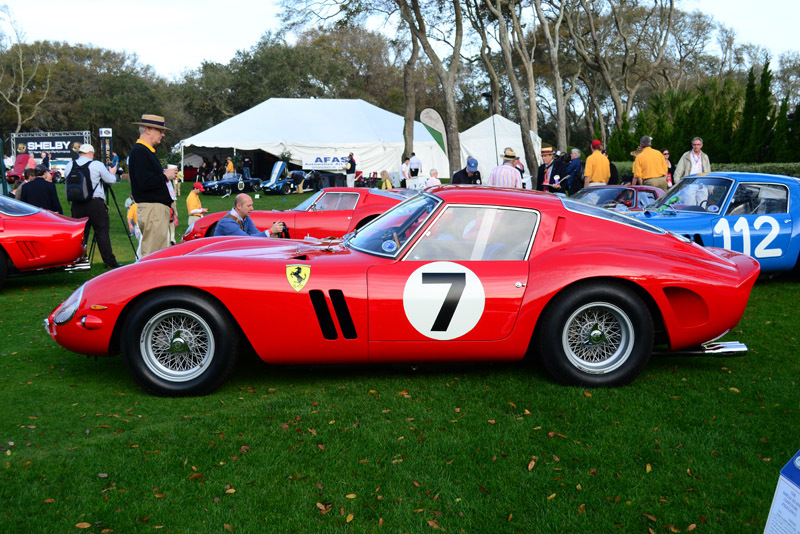 For ticket information, or a list of associated events, head on over to the Amelia Island Concours d’Elegance website. 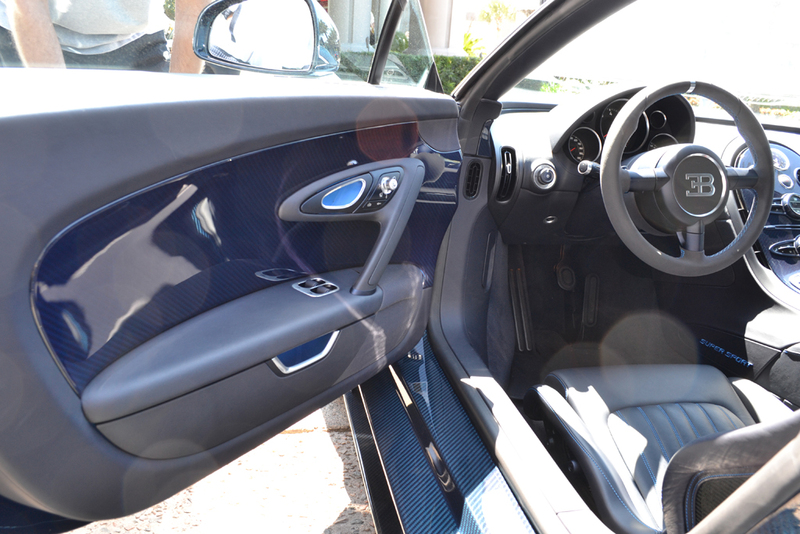 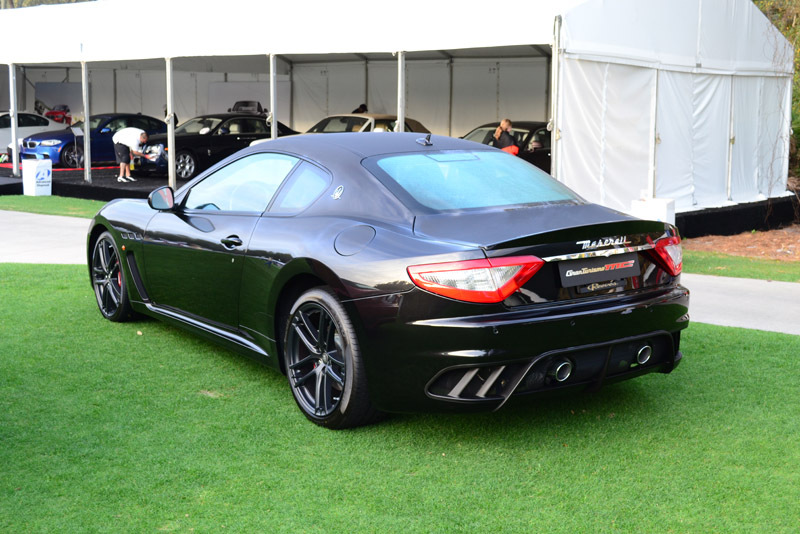 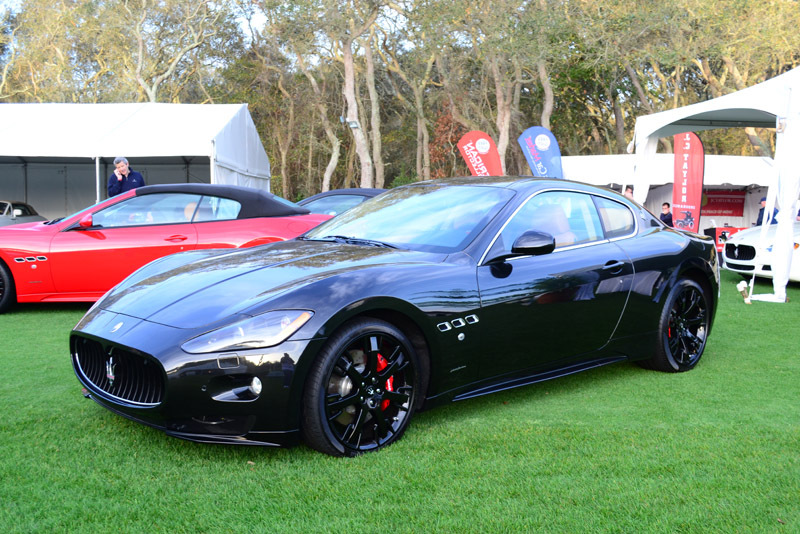 In addition to taking many pictures at the 17th Annual Amelia Island Concours d’Elegance, we captured videos of many all-new vehicles to recently hit the automotive market such as the new Range Rover Evoque, Jaguar XKR-S, Maserati GTS Convertible and McLaren MP4-12C. 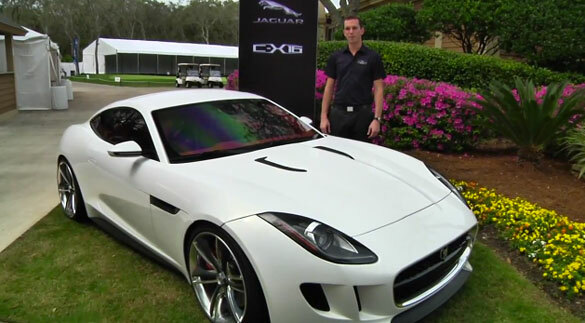 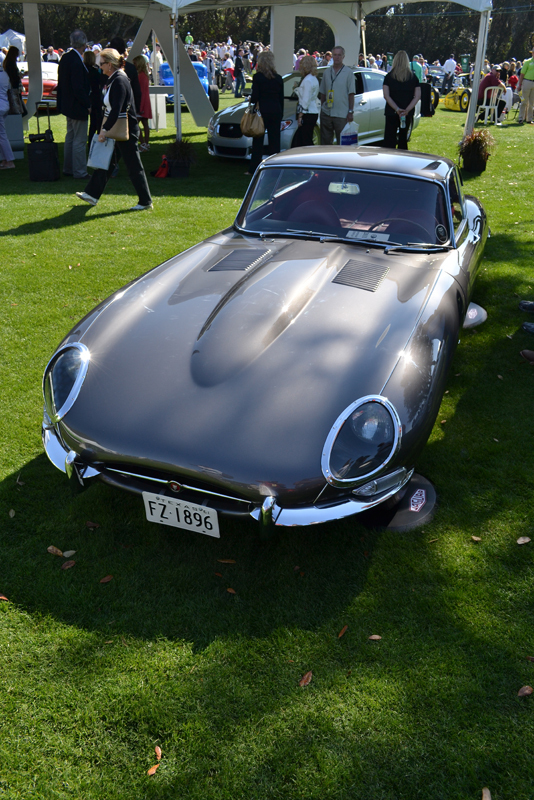 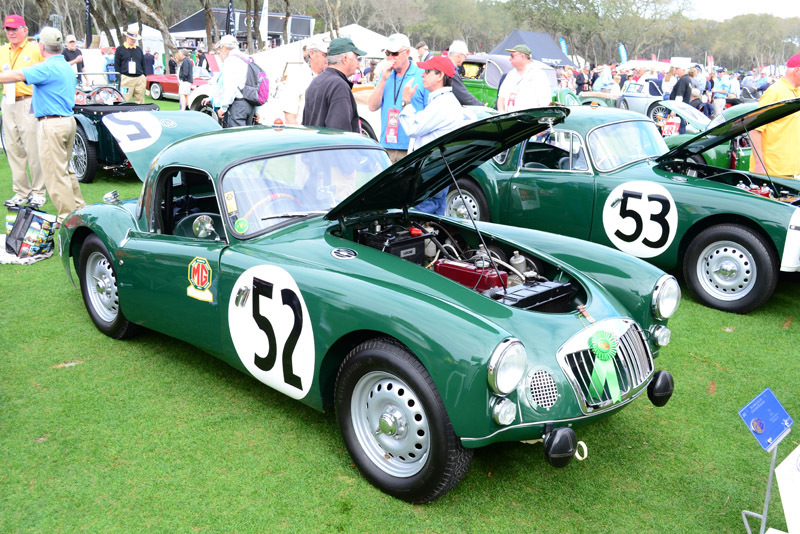 Below are several introduction videos, including one to the Jaguar C-X16 Concept car, with a quick over-view from the respective representatives on site at this year’s Amelia Island Concours d’Elegance. 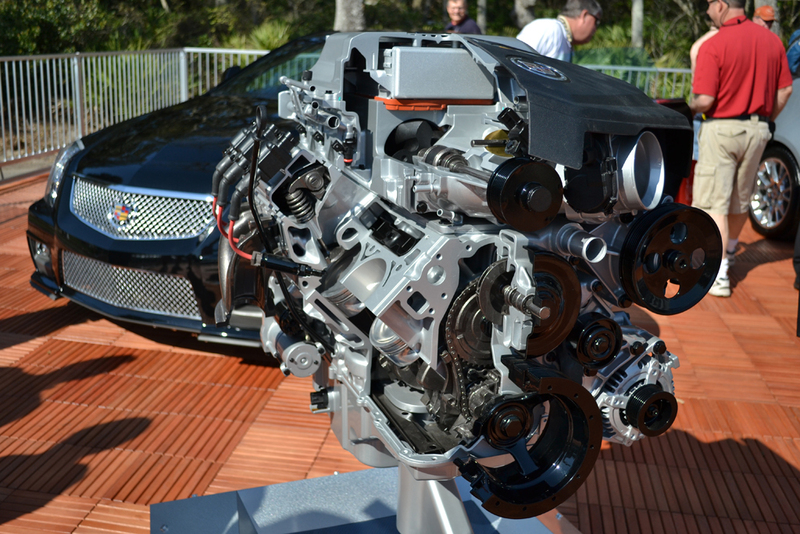 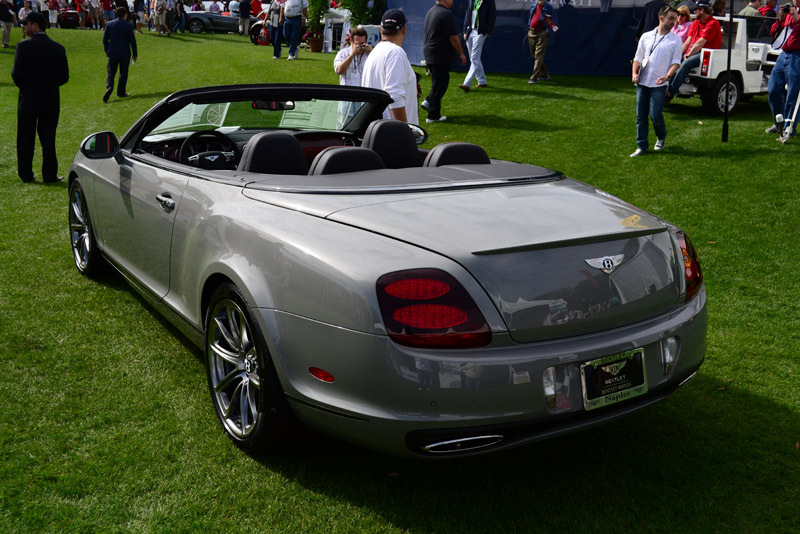 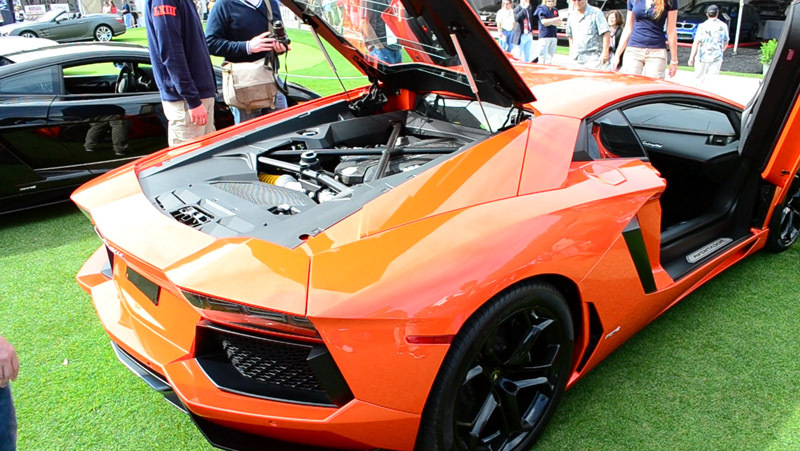 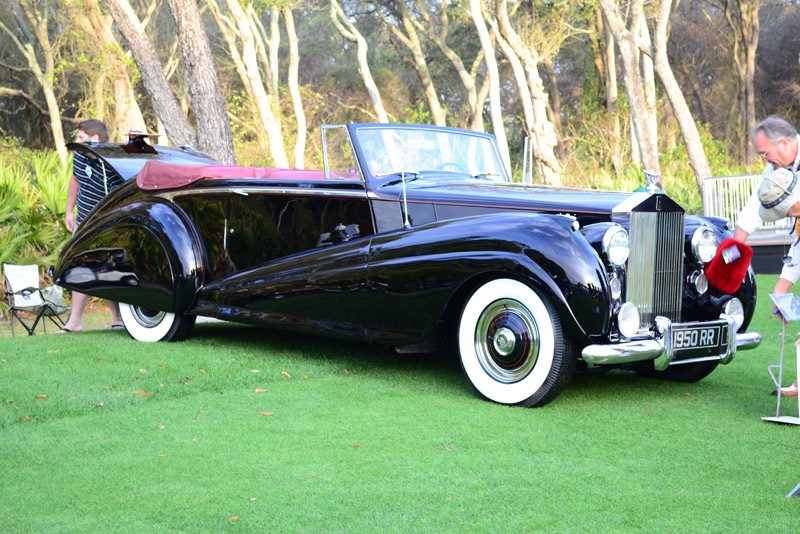 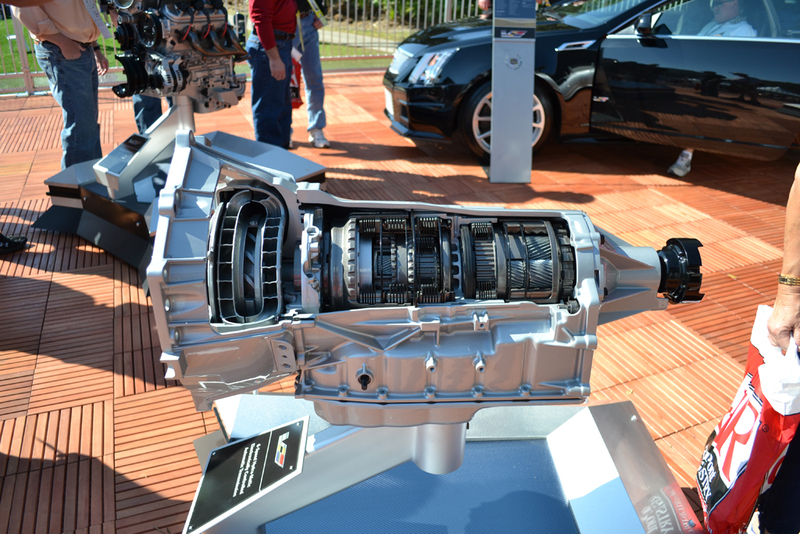 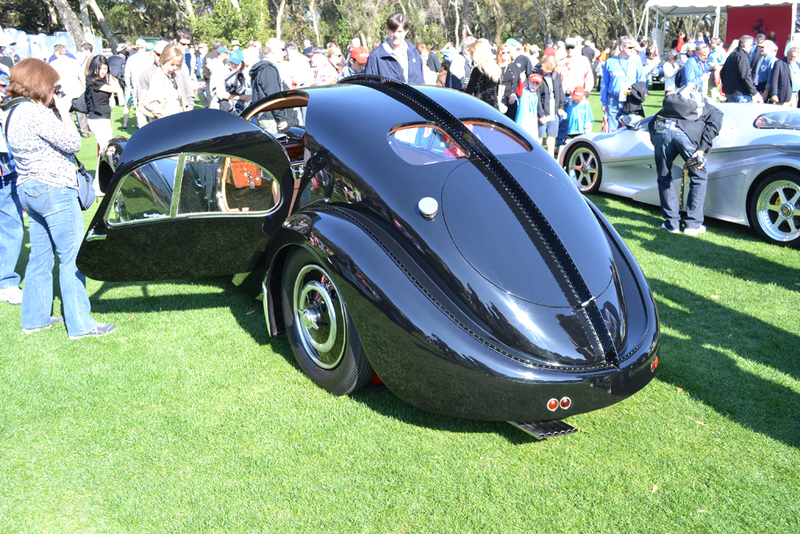 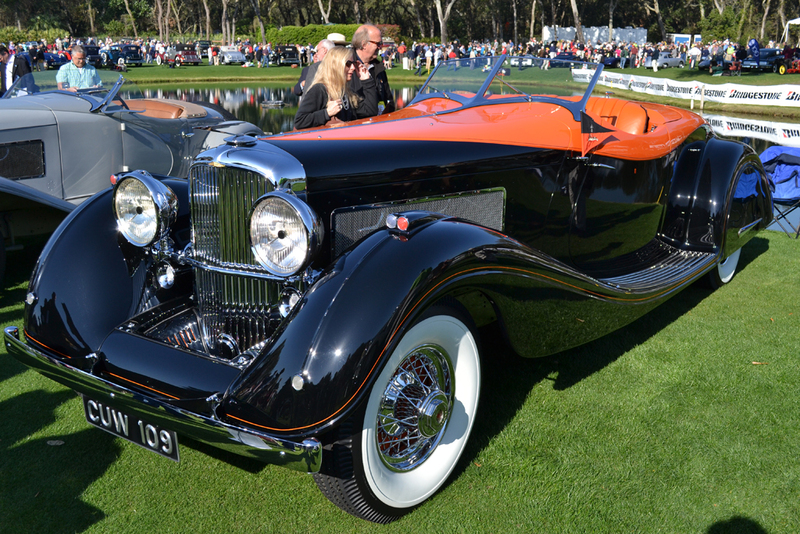 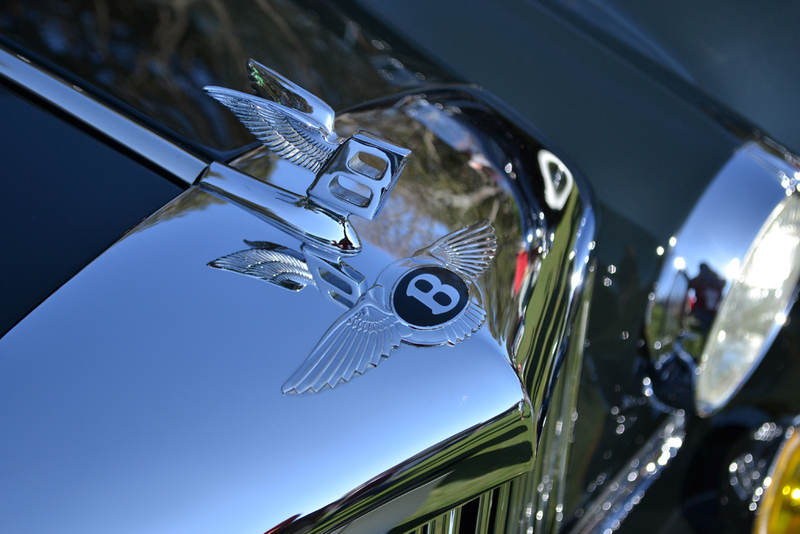 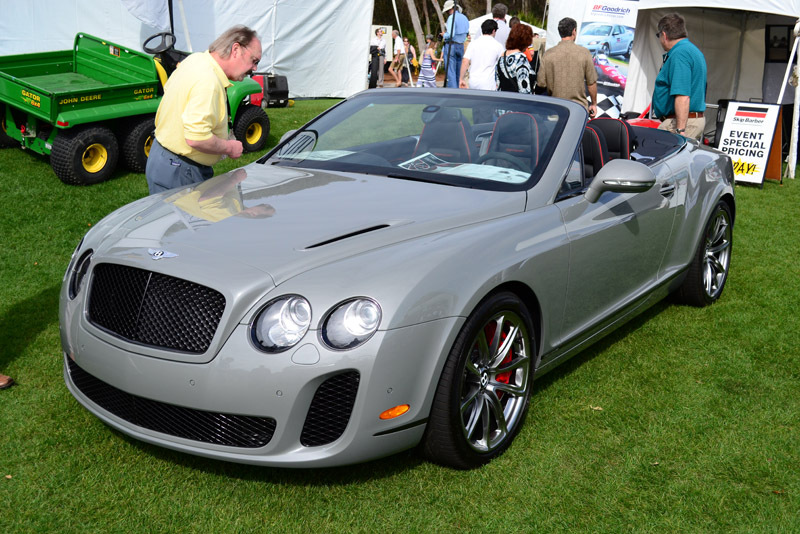 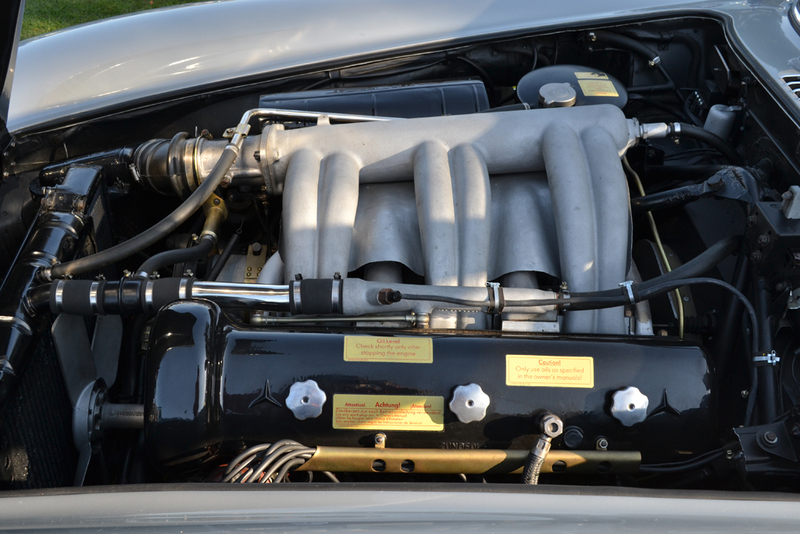 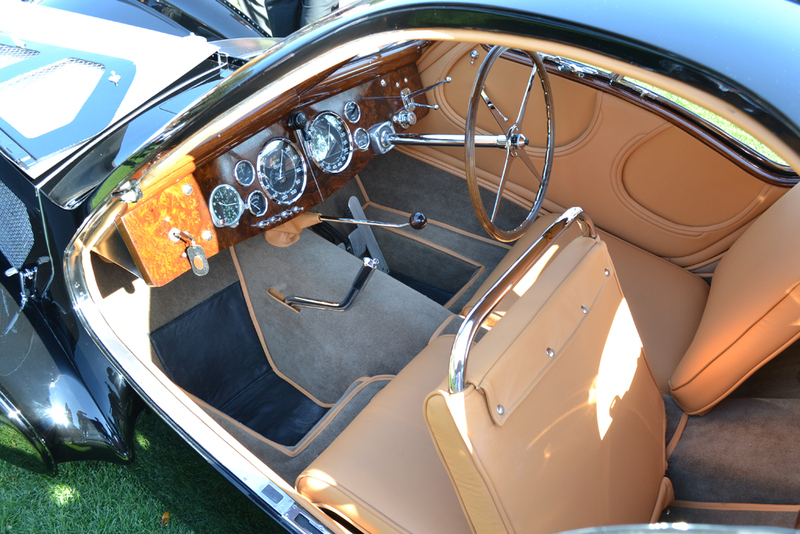 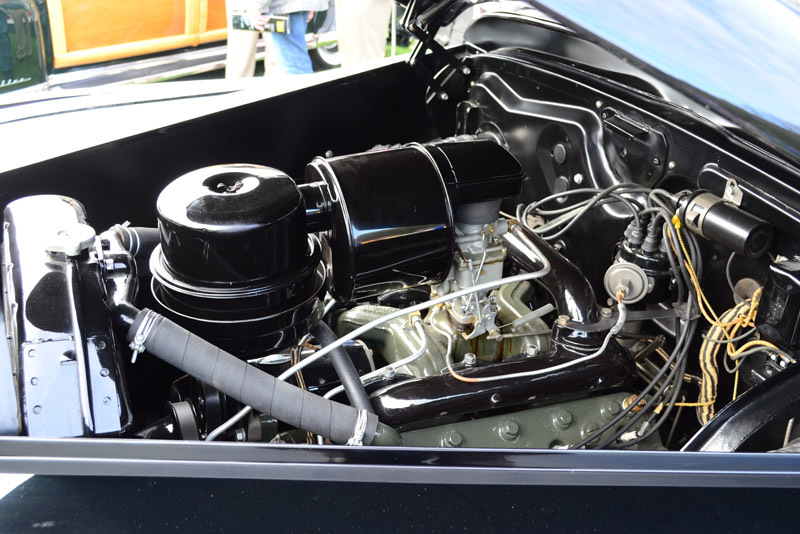 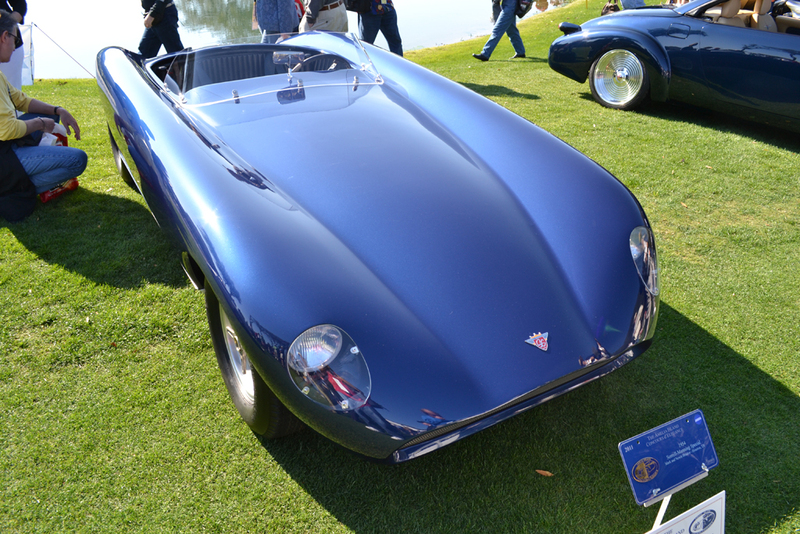 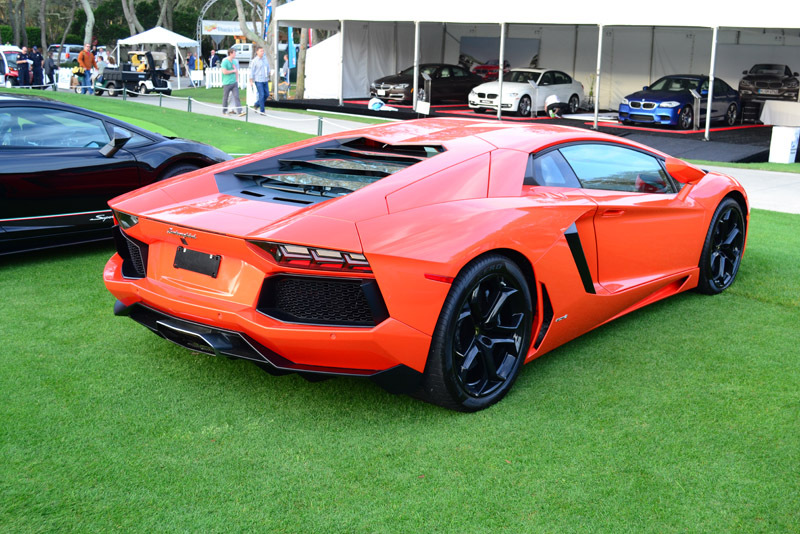 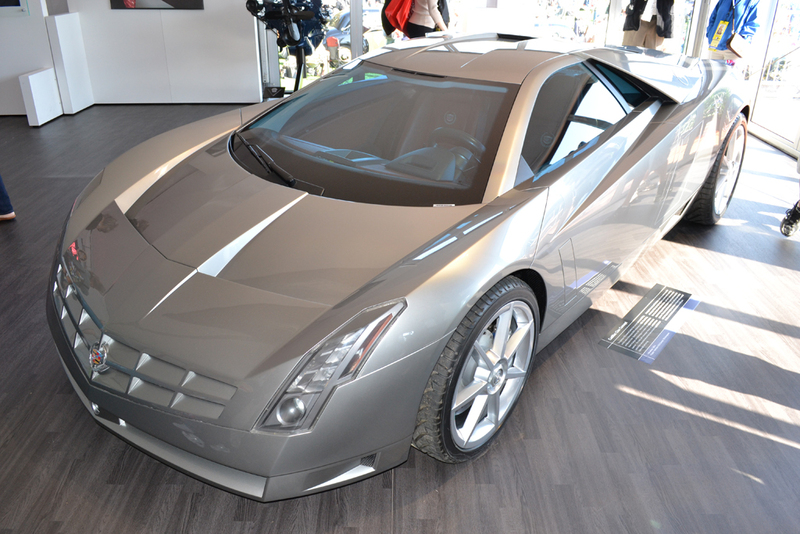 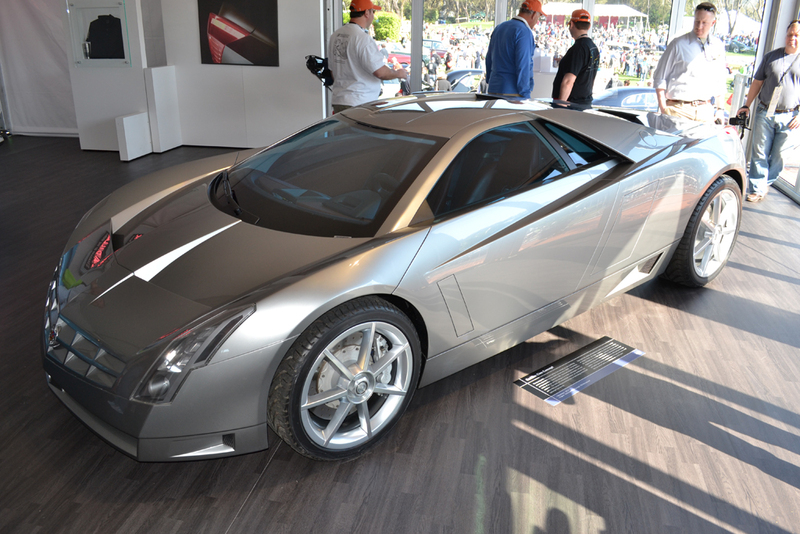 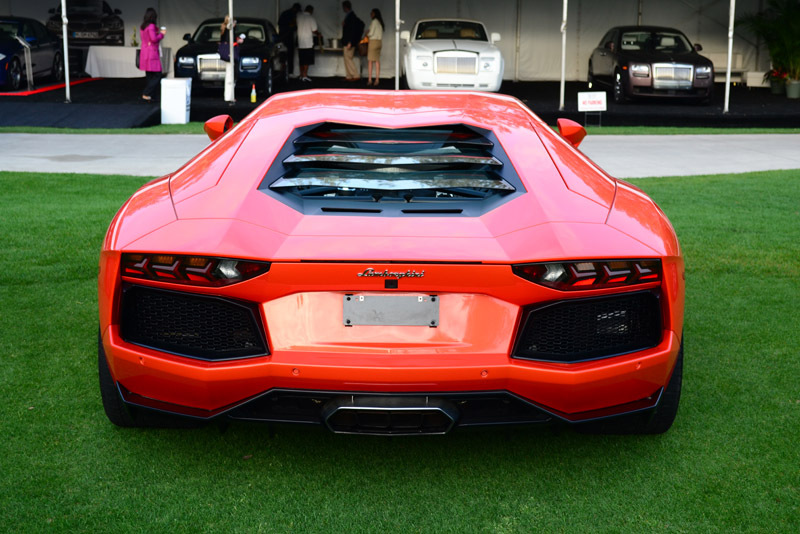 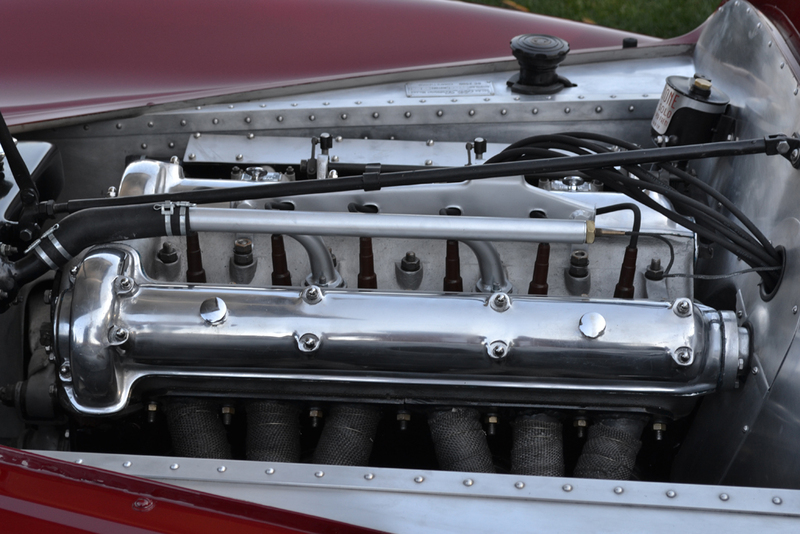 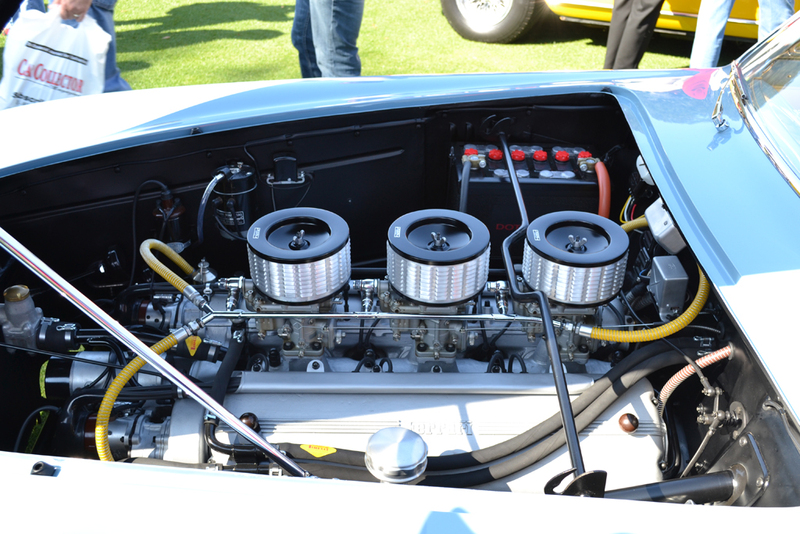 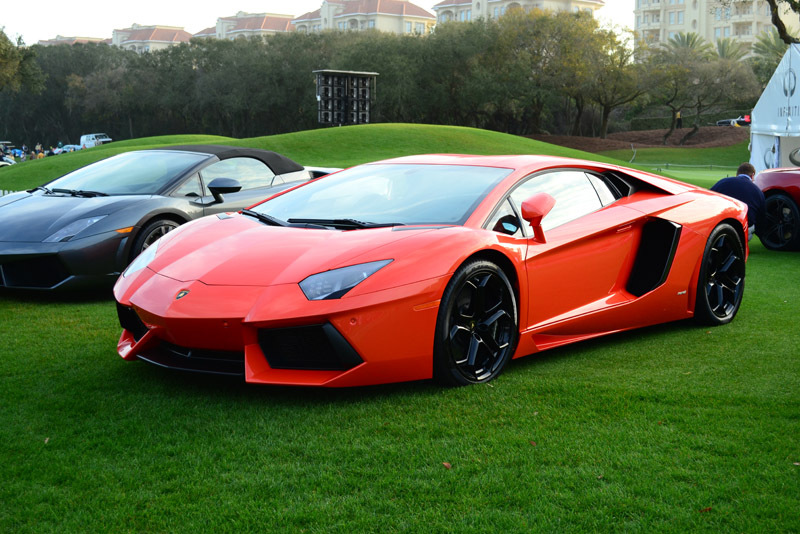 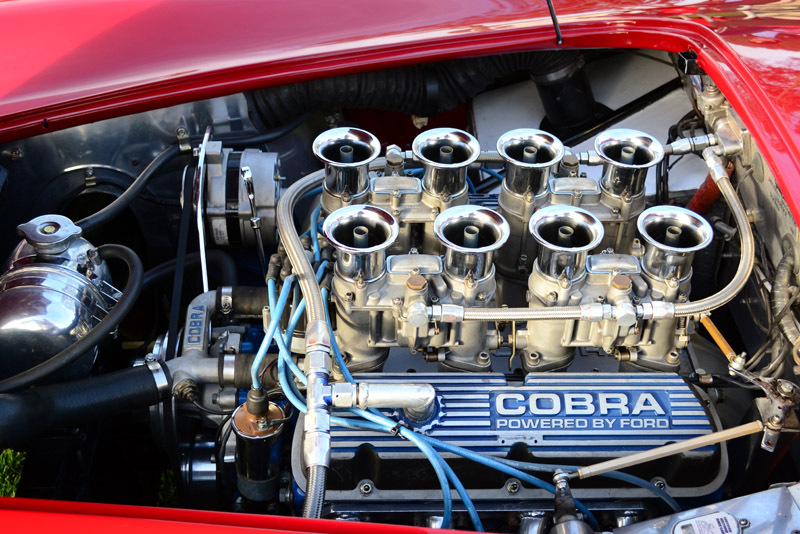 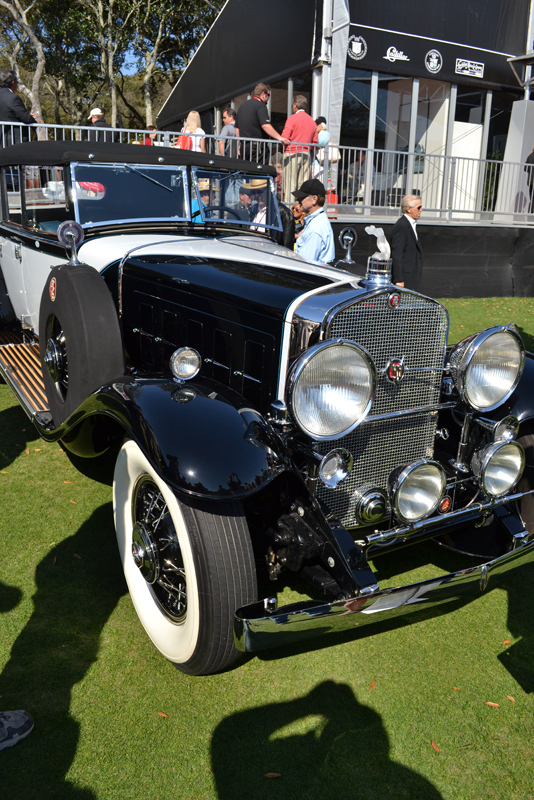 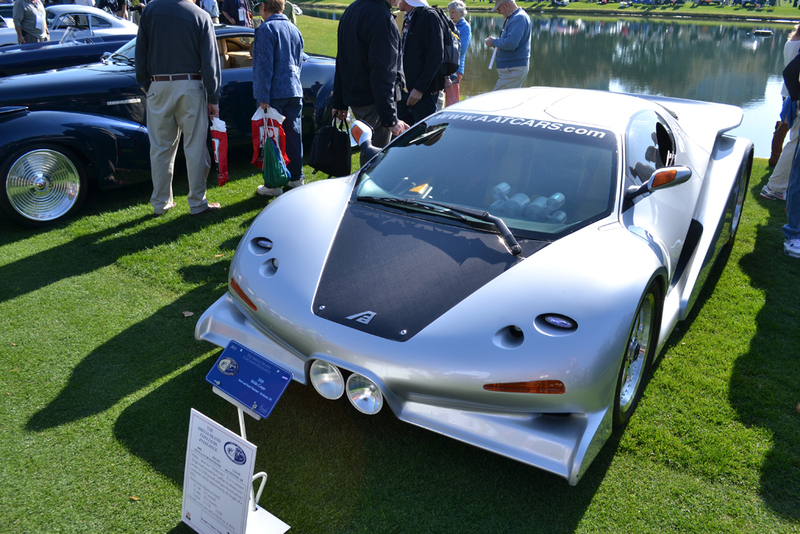 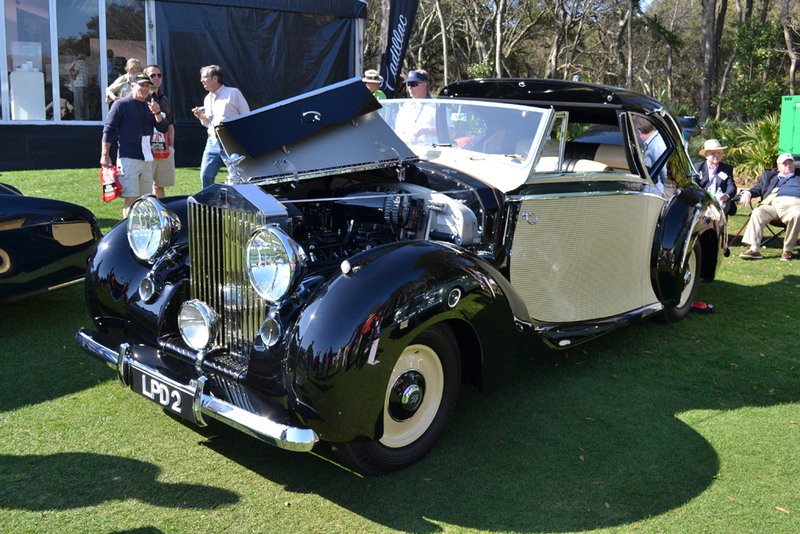 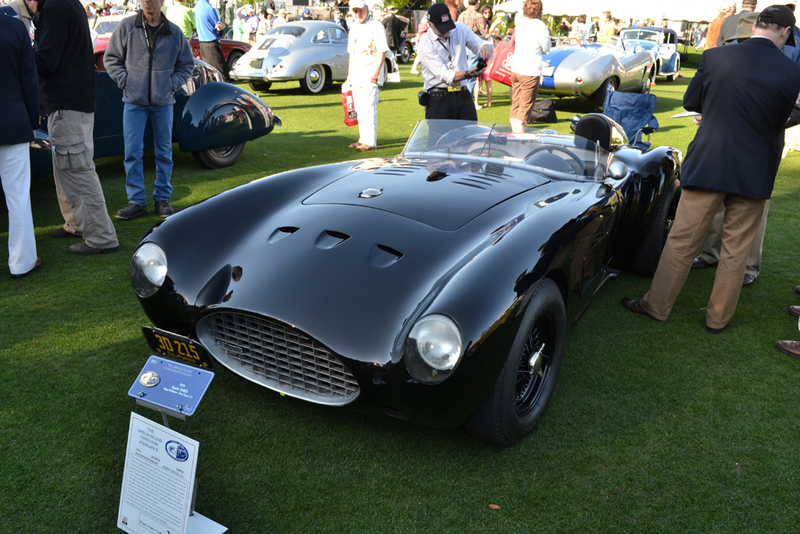 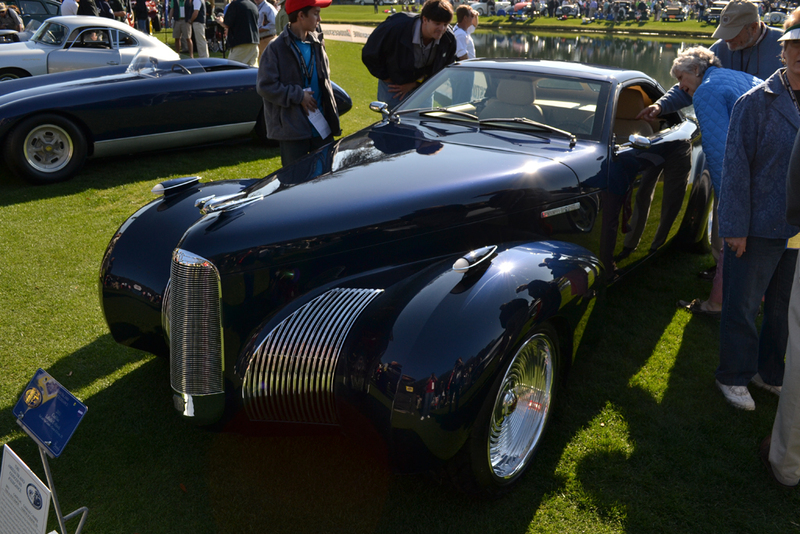 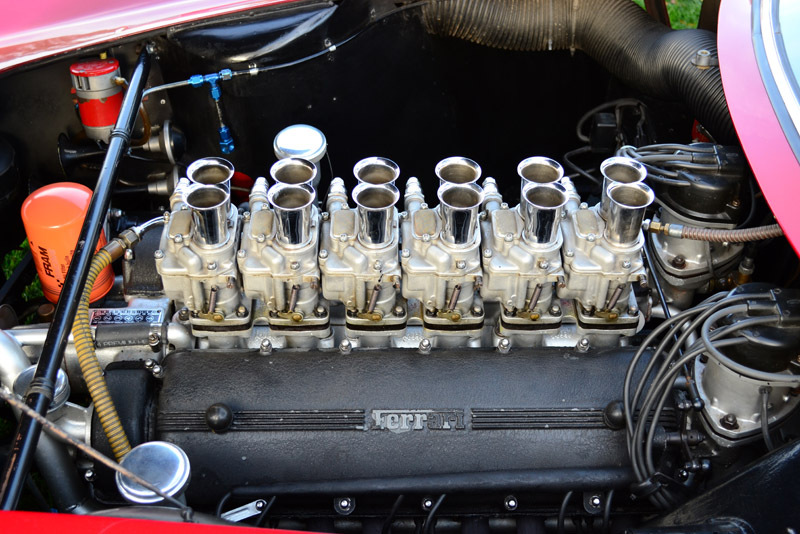 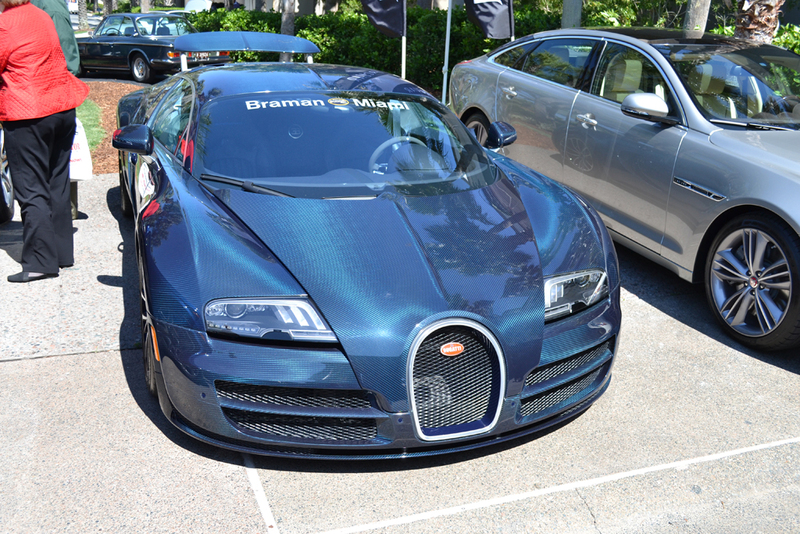 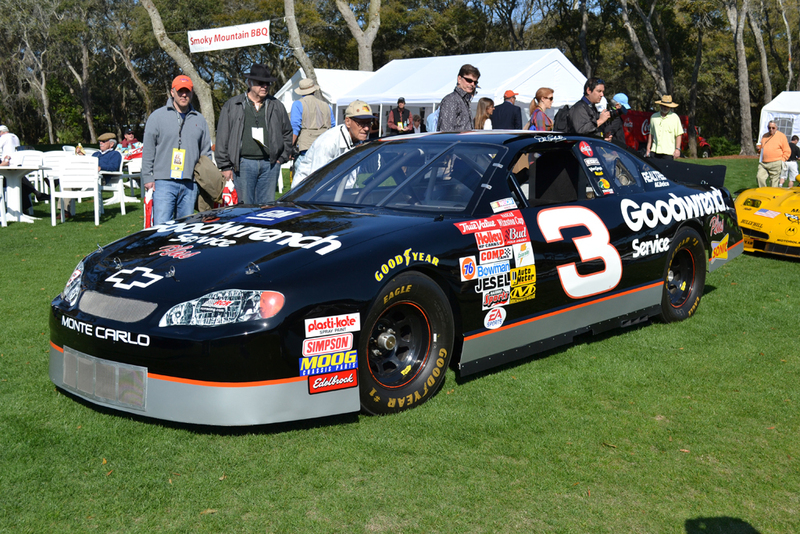 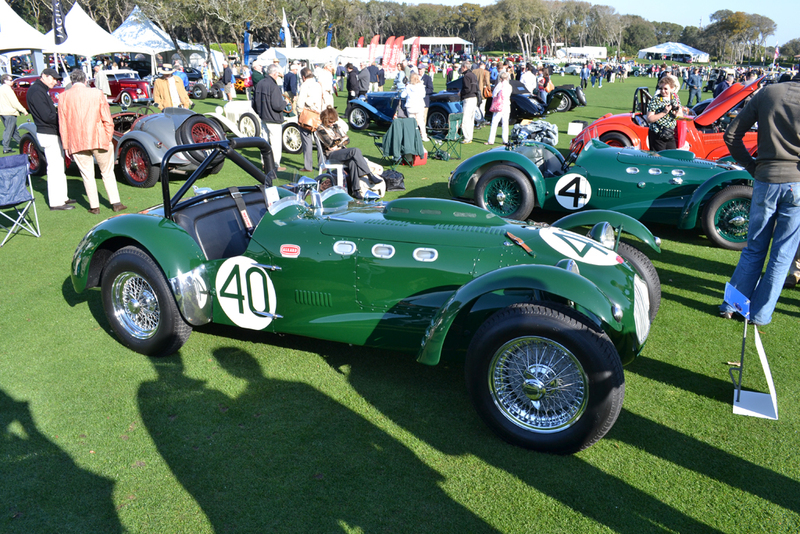 This year the Amelia Island Concours d’Elegance featured some of the most intricate and expensive cars in the world. 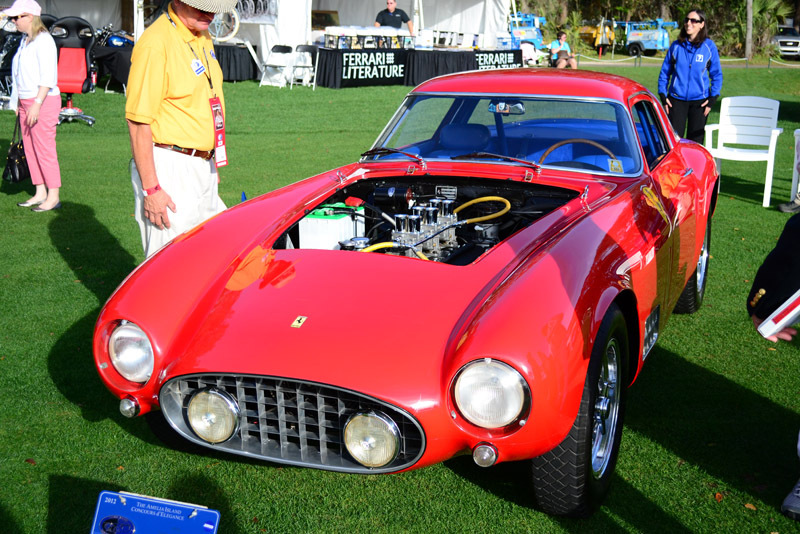 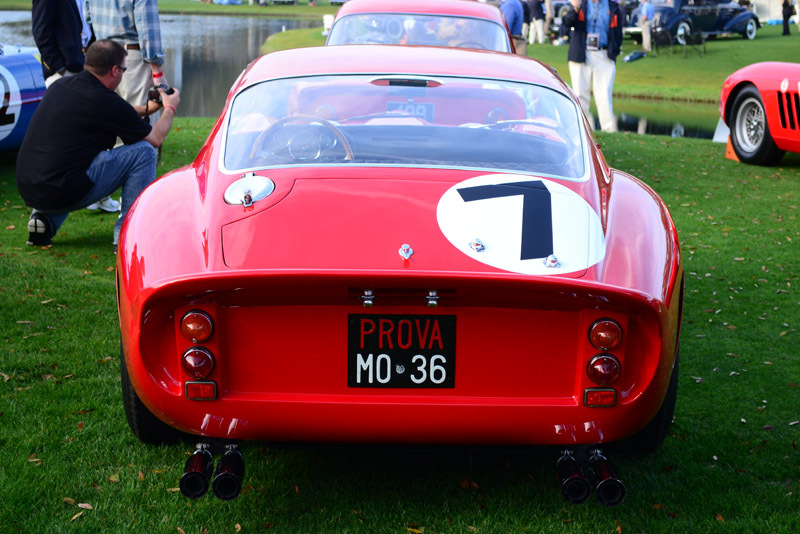 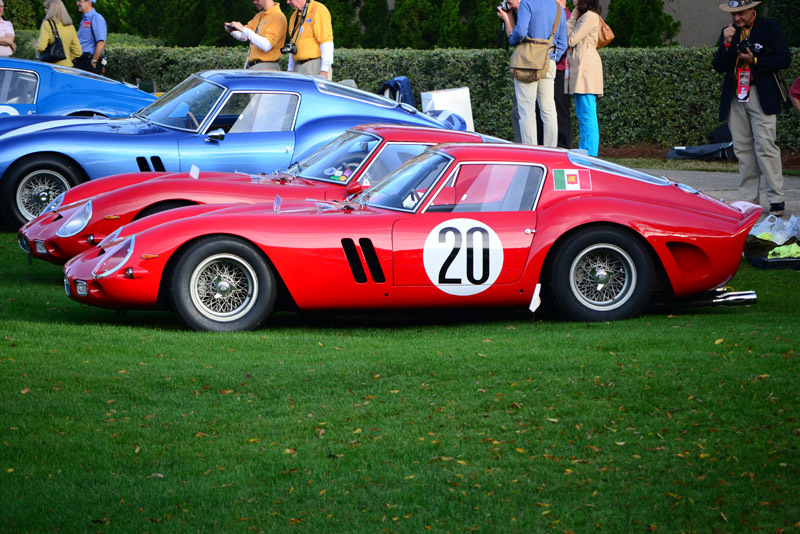 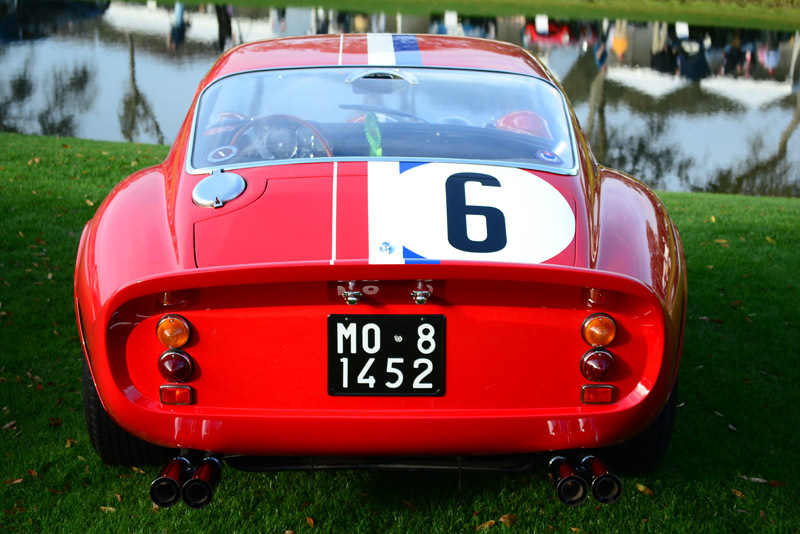 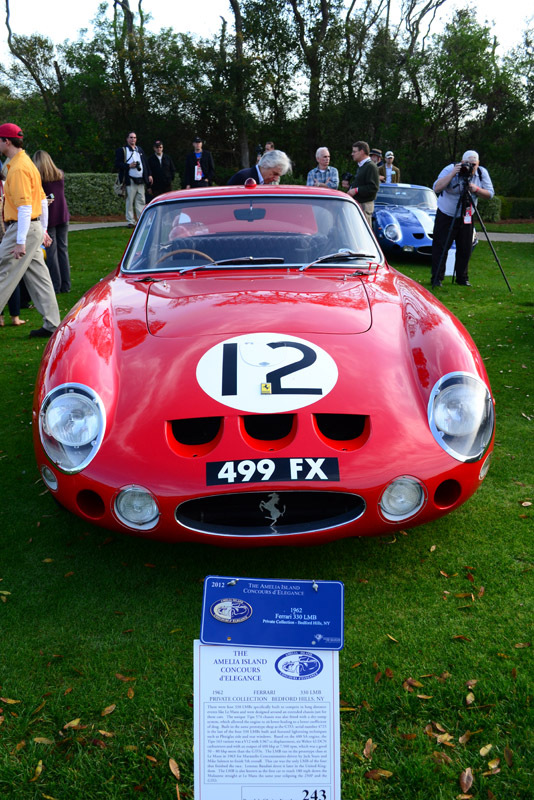 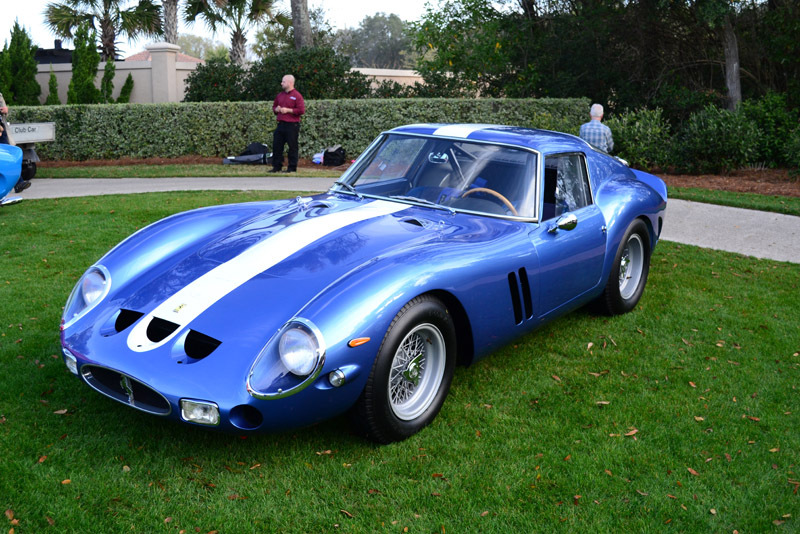 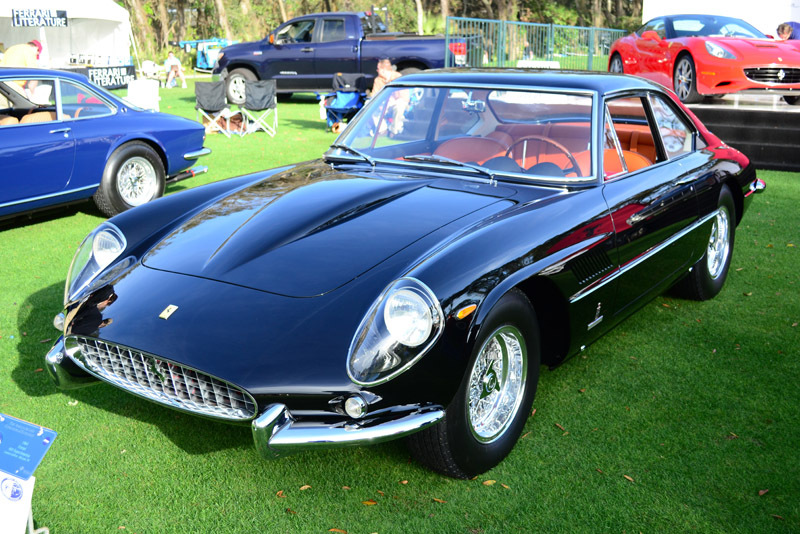 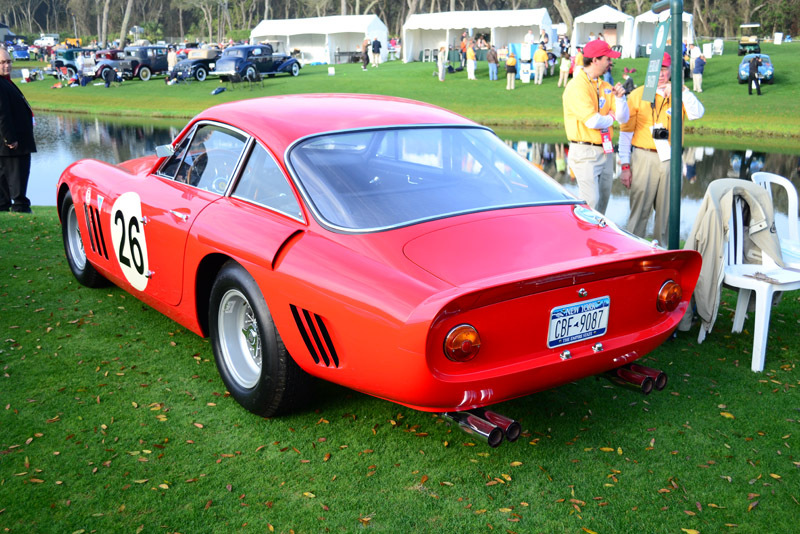 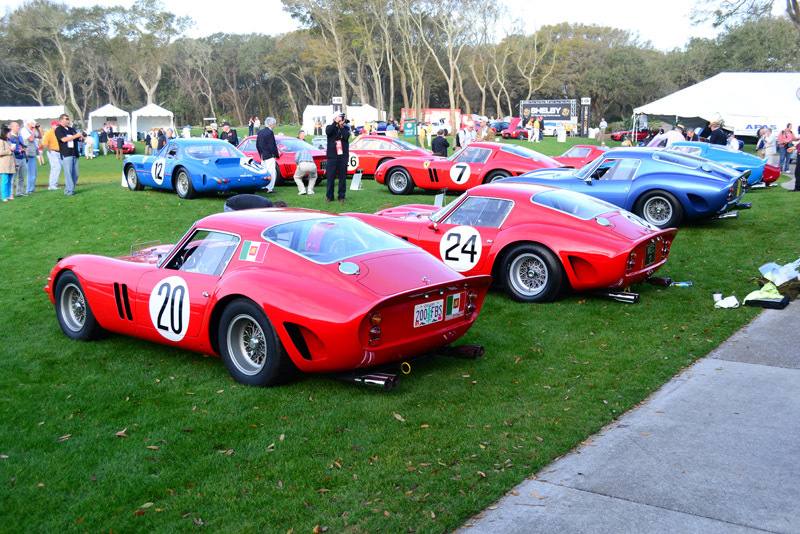 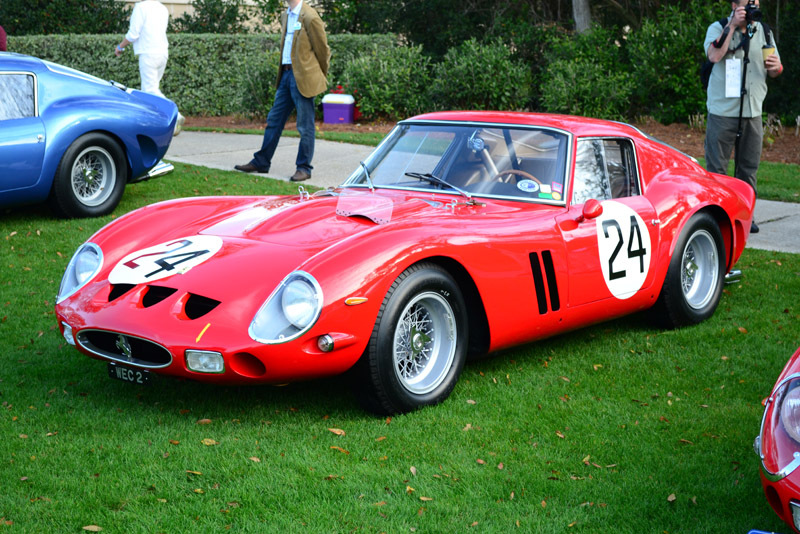 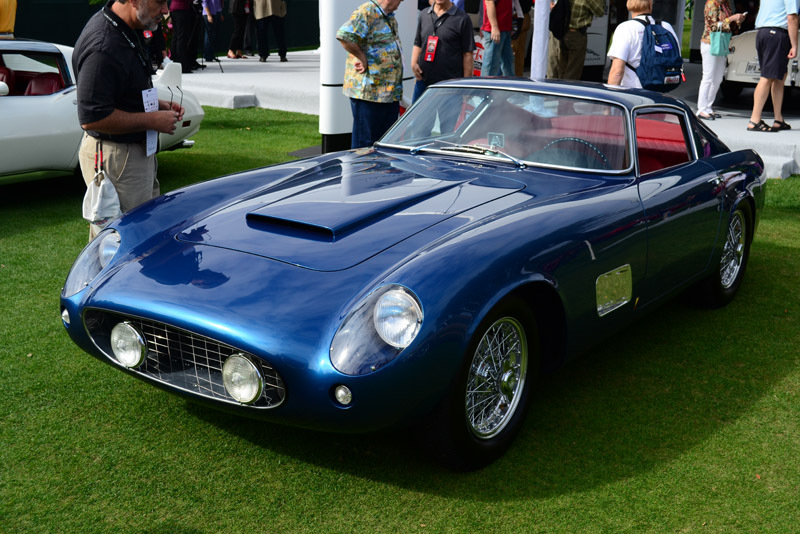 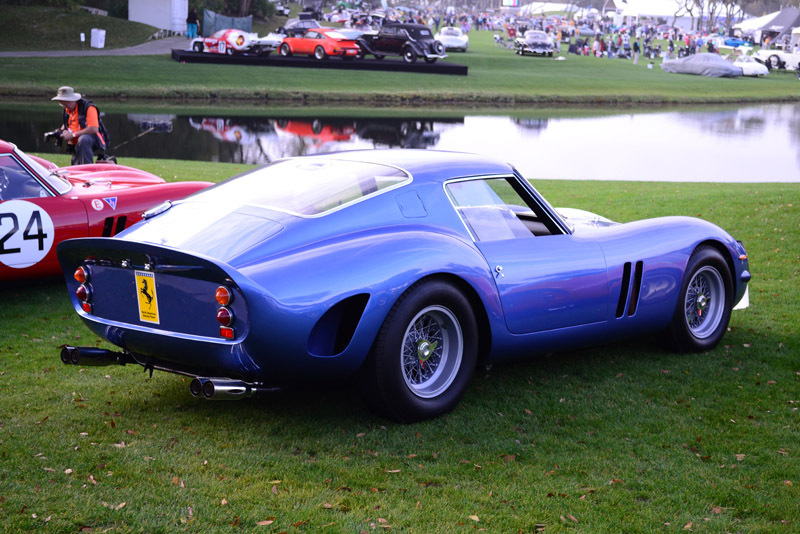 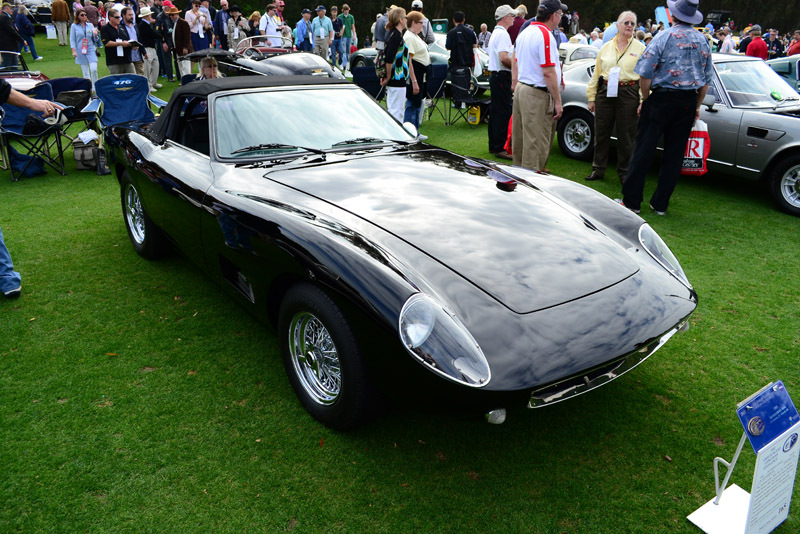 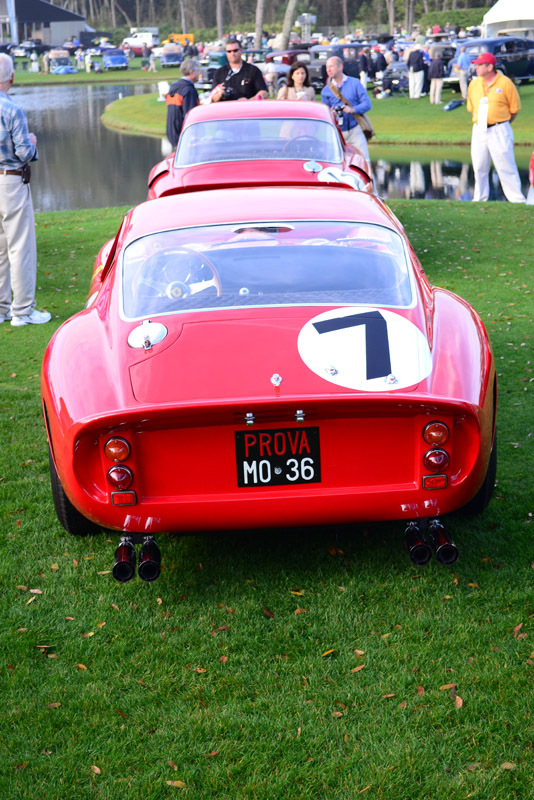 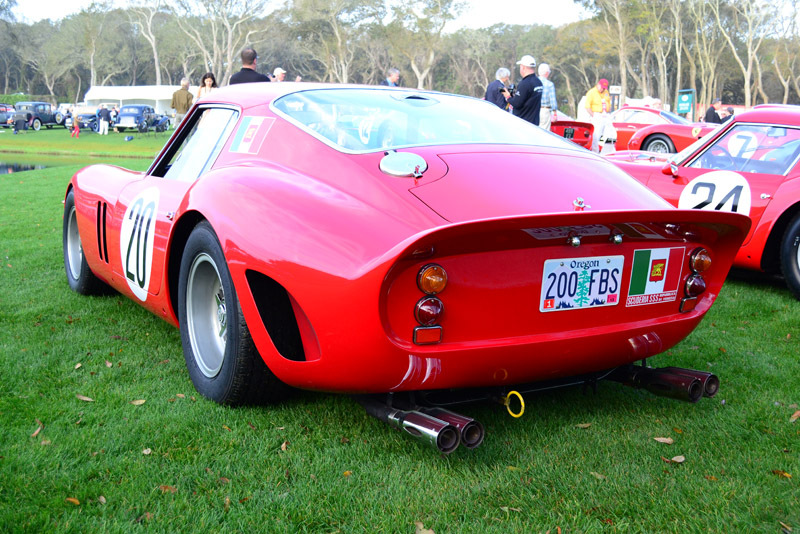 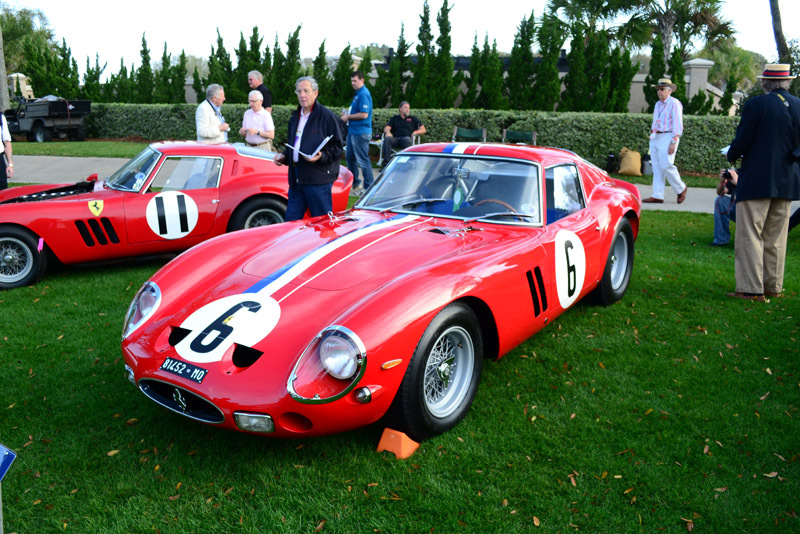 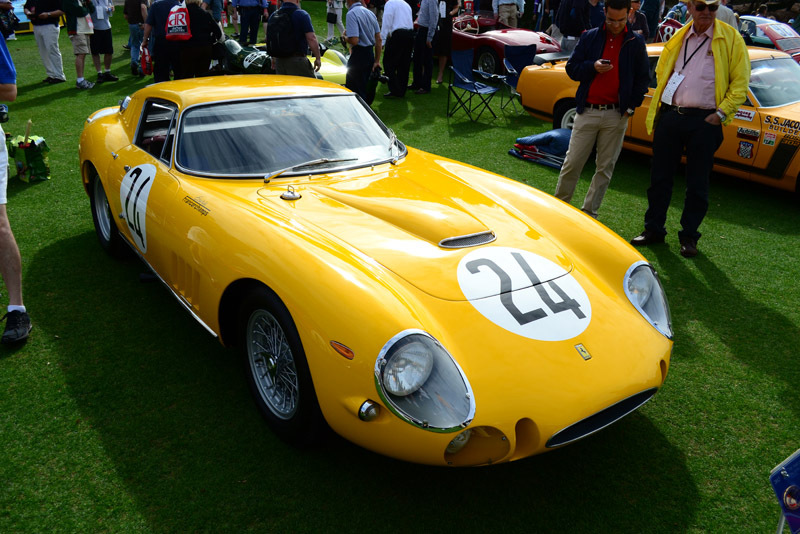 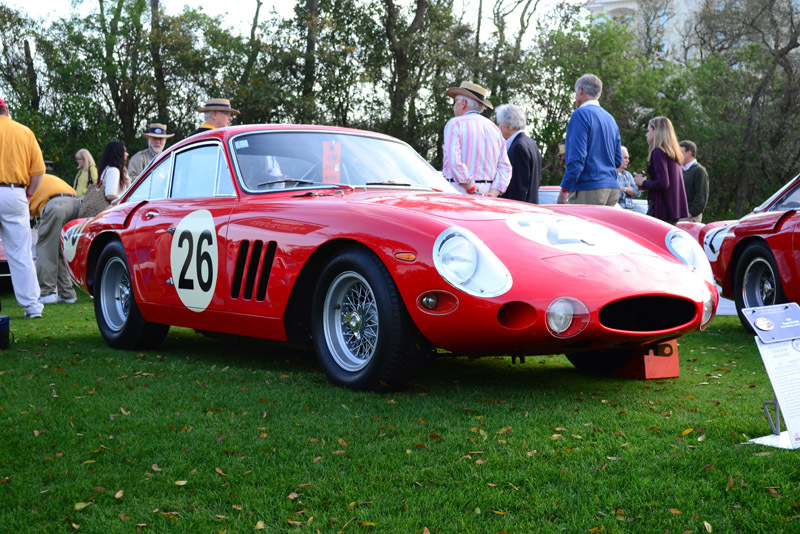 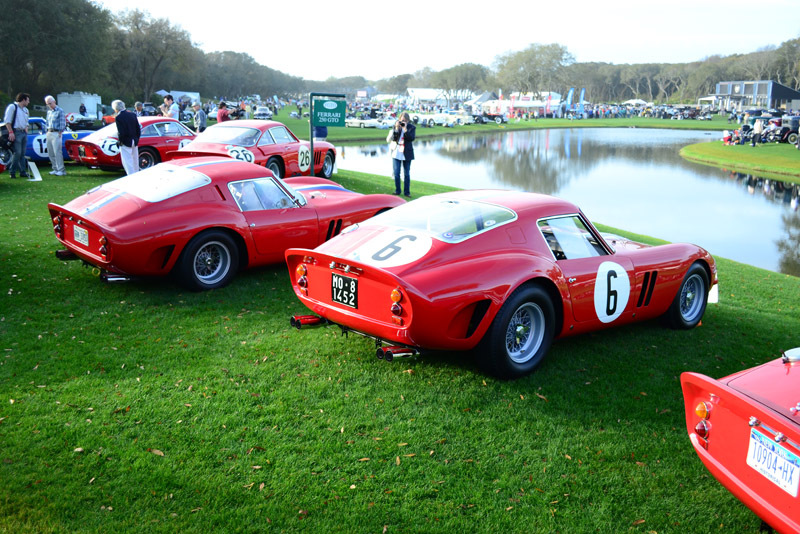 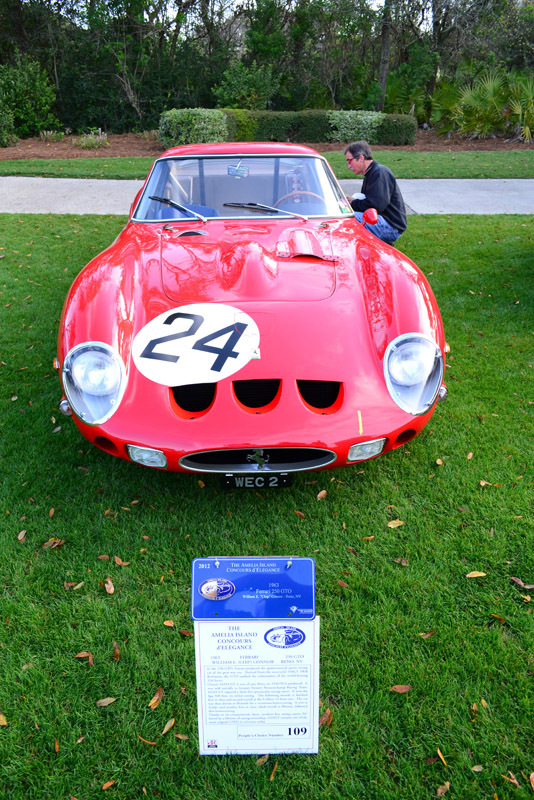 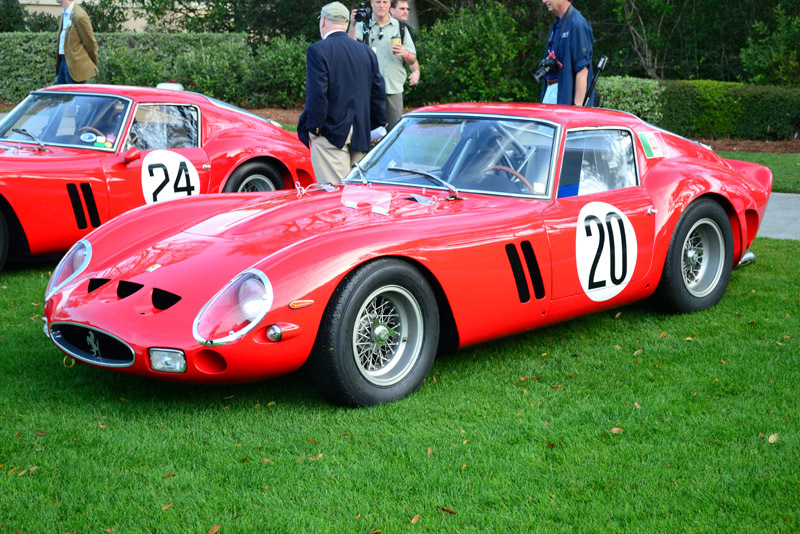 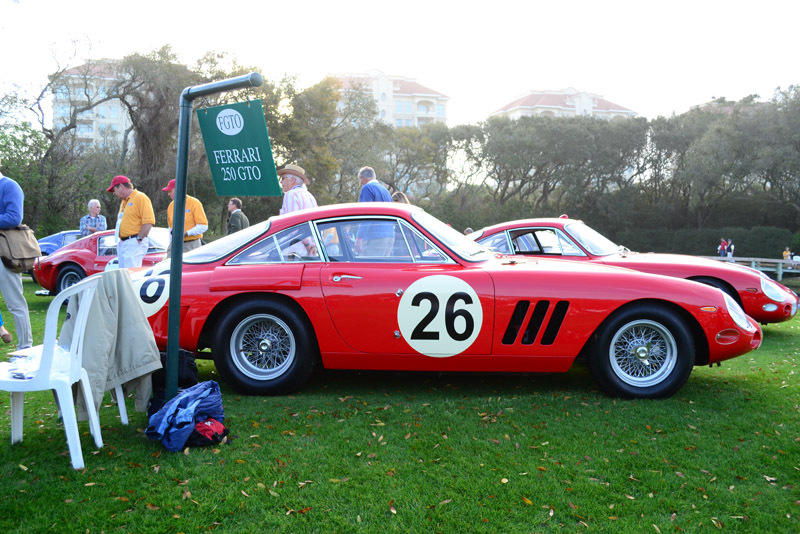 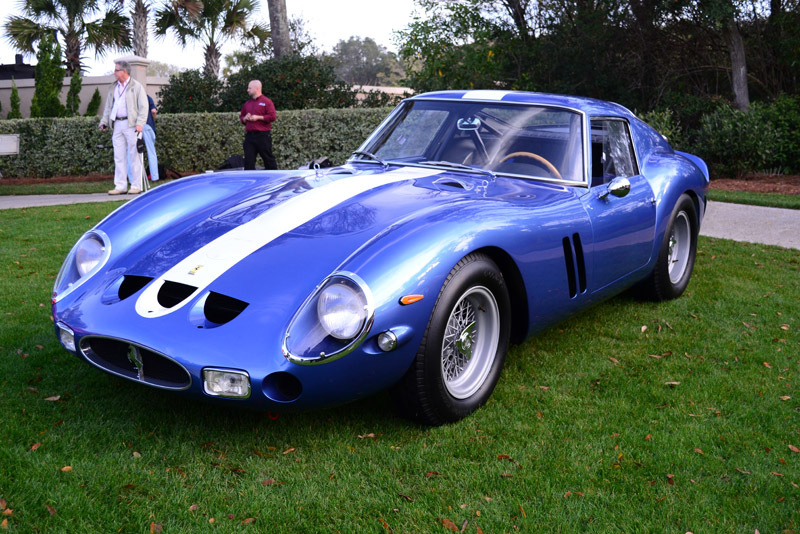 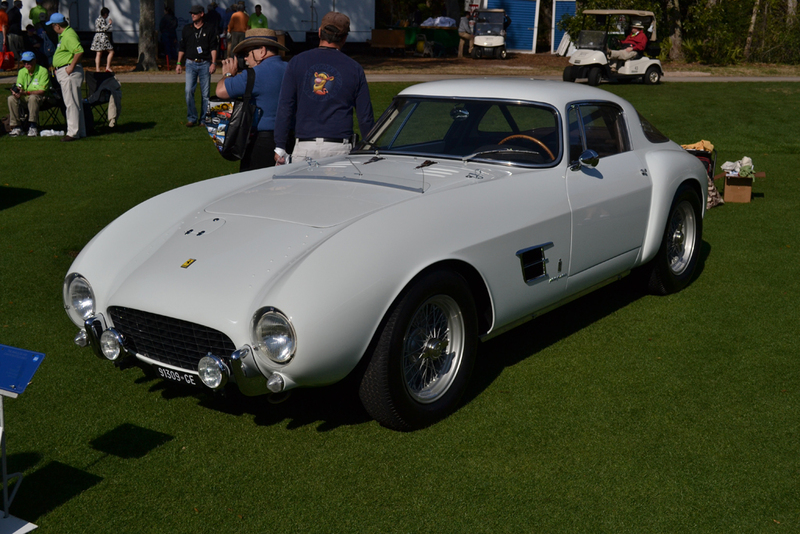 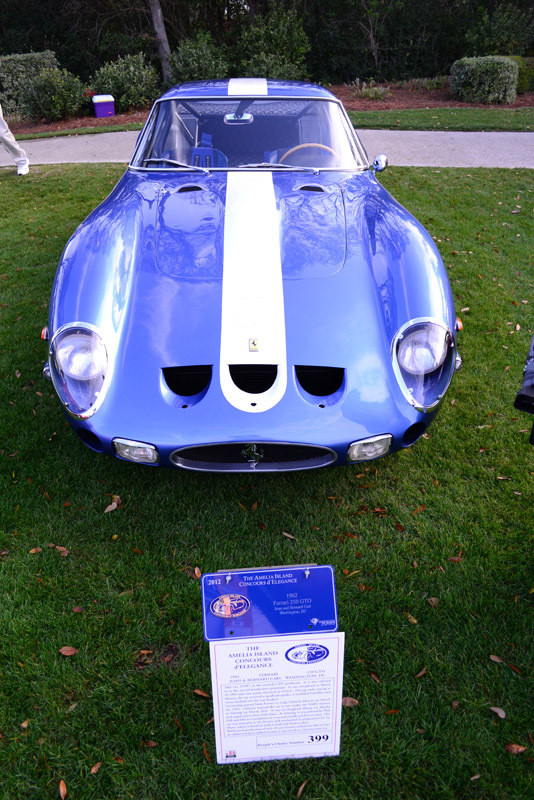 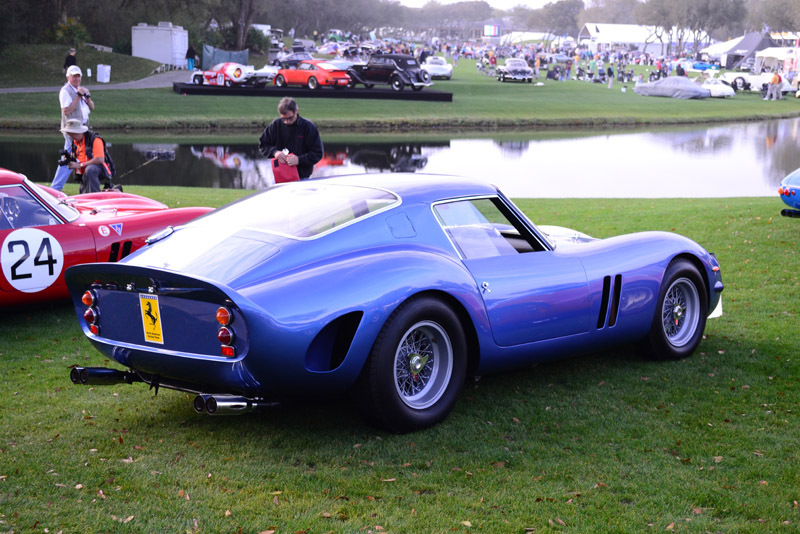 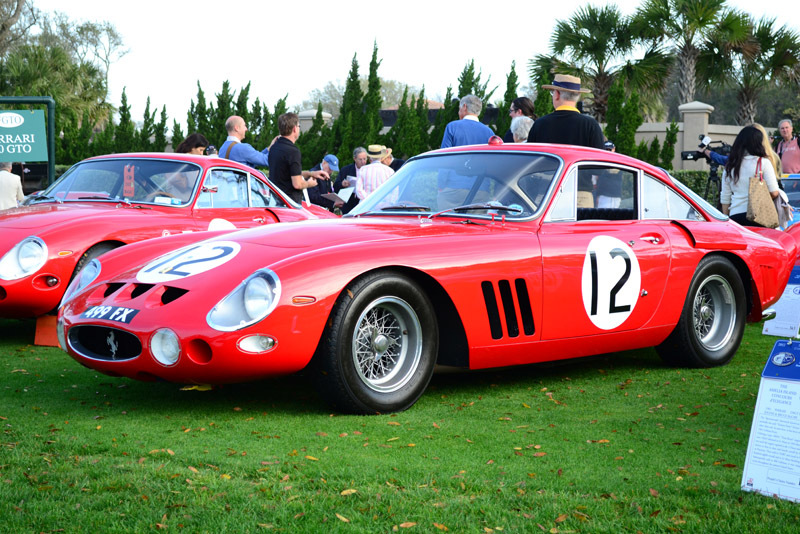 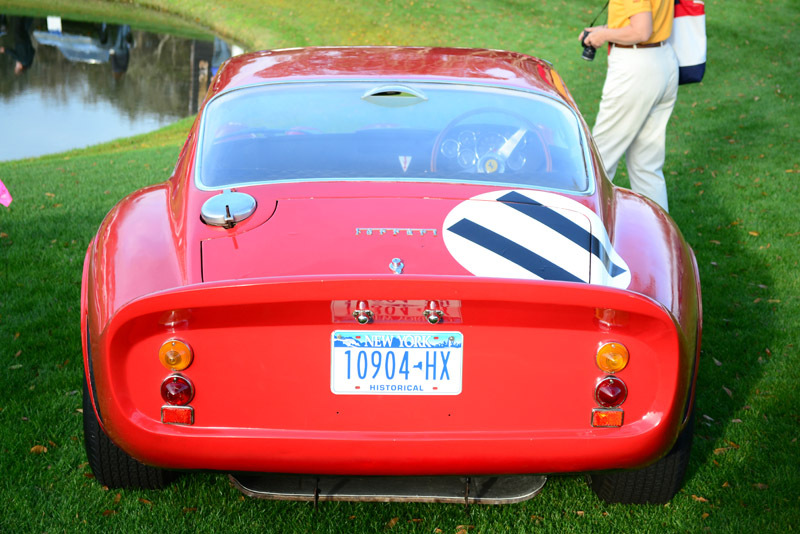 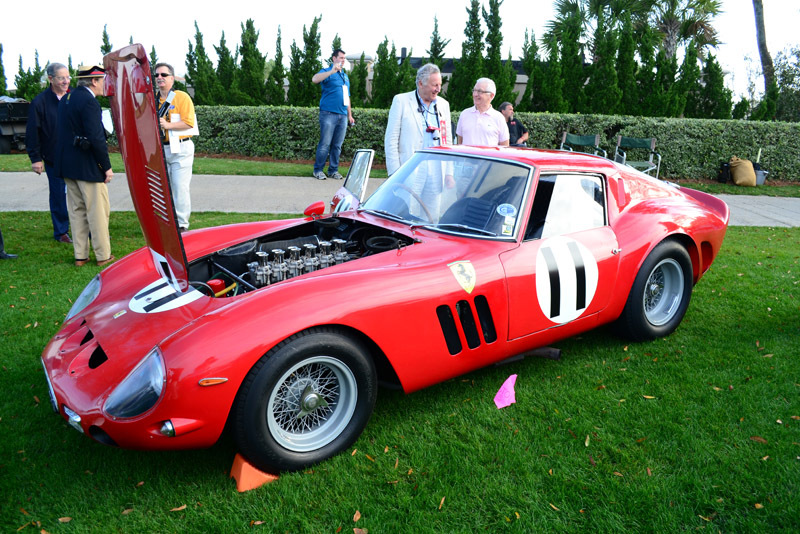 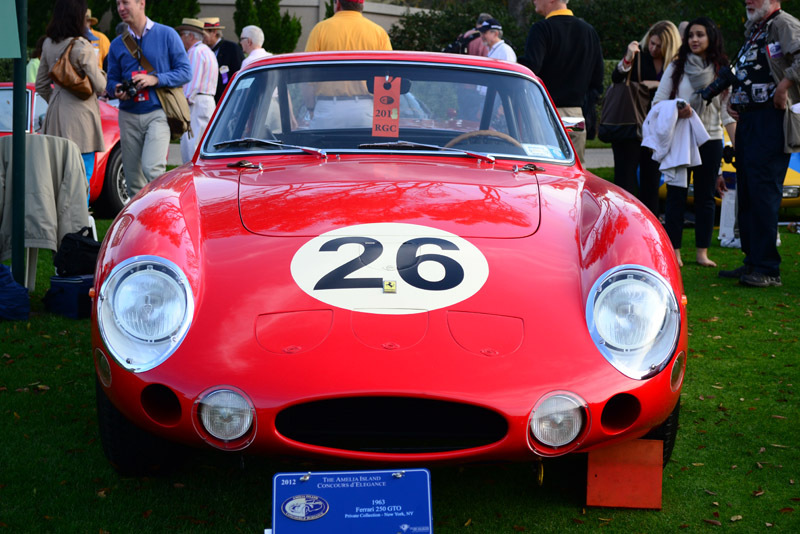 One particular group of vehicles present at the 17th Annual Amelia Island Concours d’Elegance, was about 12 Ferrari 250 GTOs. 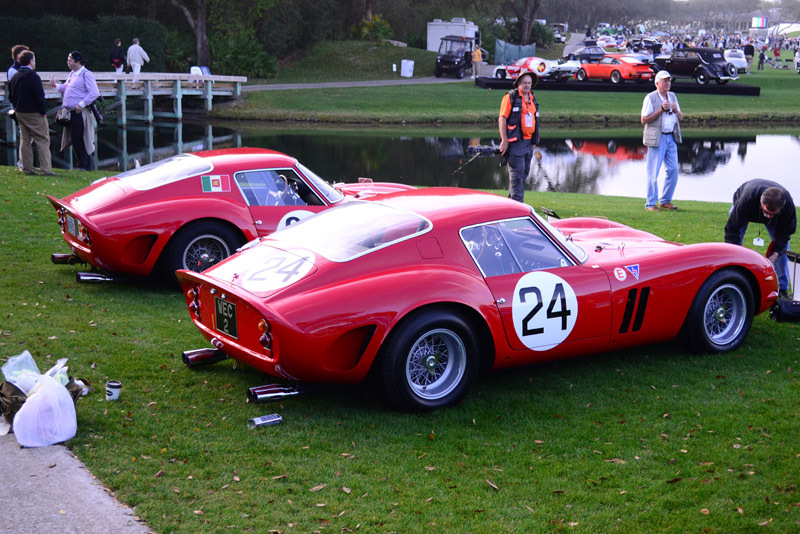 This group of cars represented the pinnacle of automotive perfection. 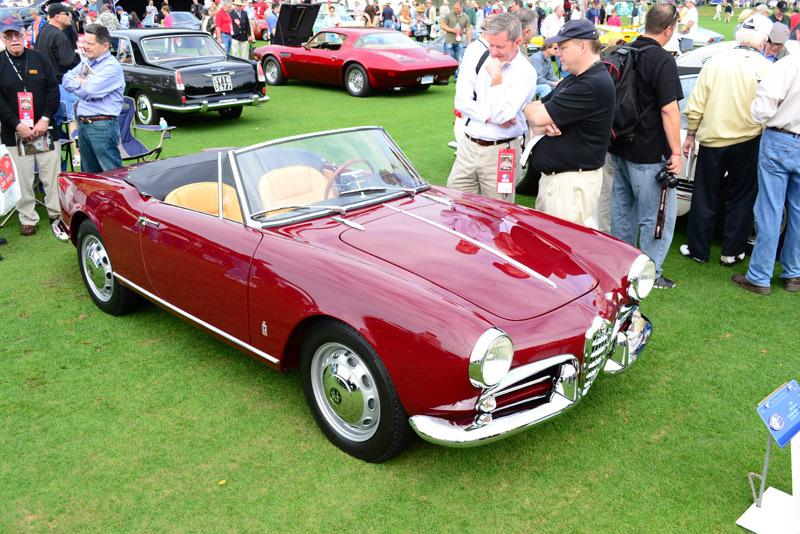 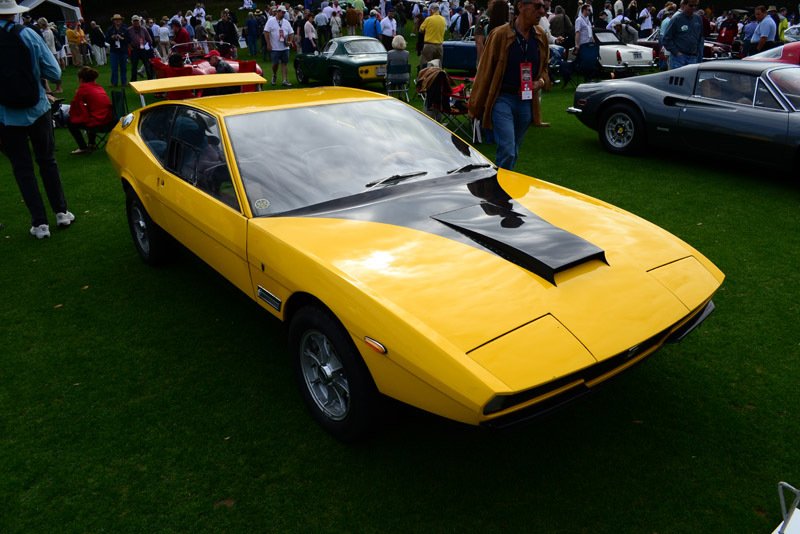 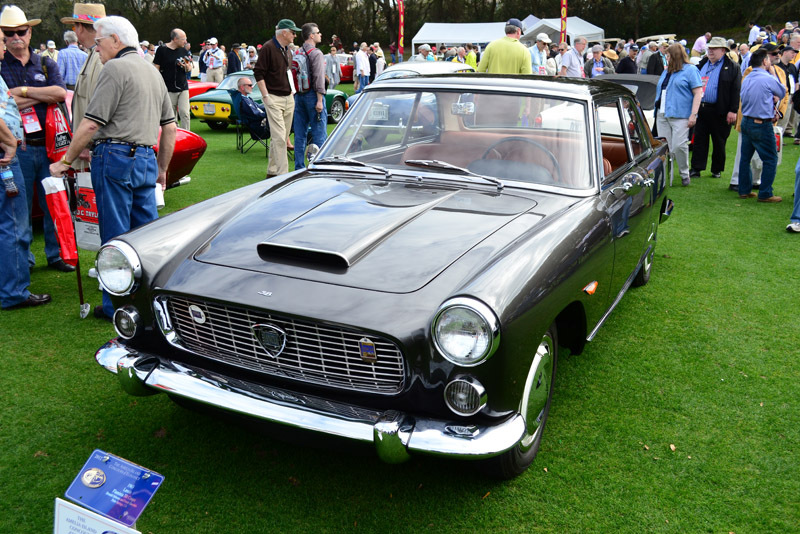 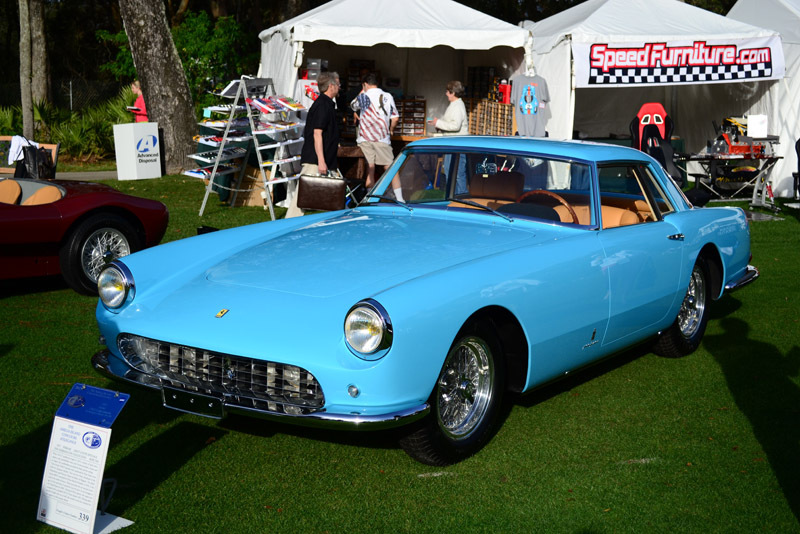 For a fine handmade Italian vehicle produced between 1962 and 1964 (only 39 examples), where some examples captured over $30 million at recent auctions, the display at Amelia Island Concours d’Elegance was one-of-a-kind. 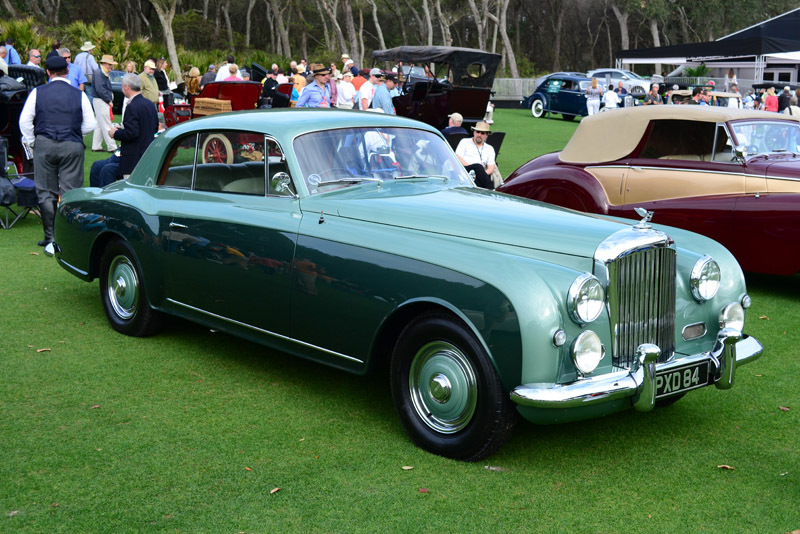 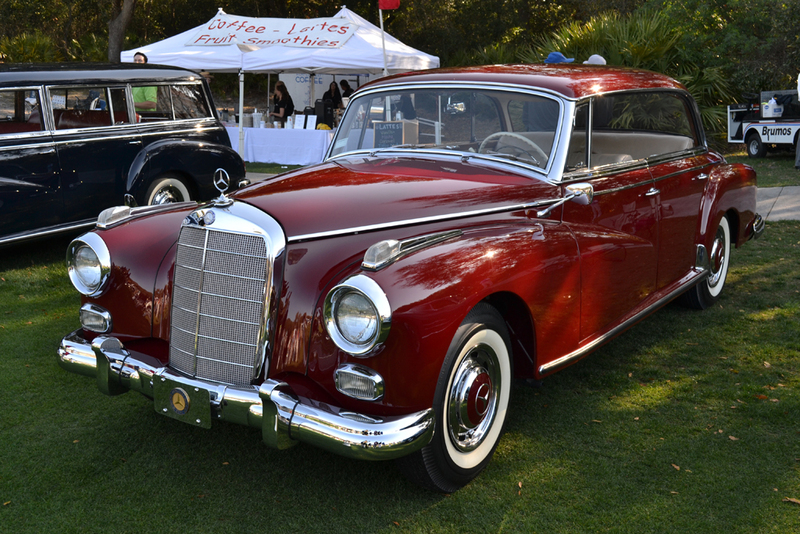 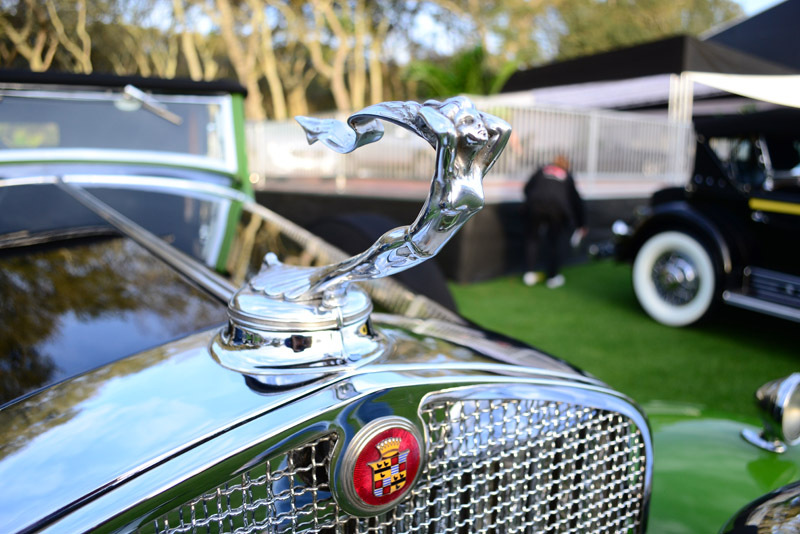 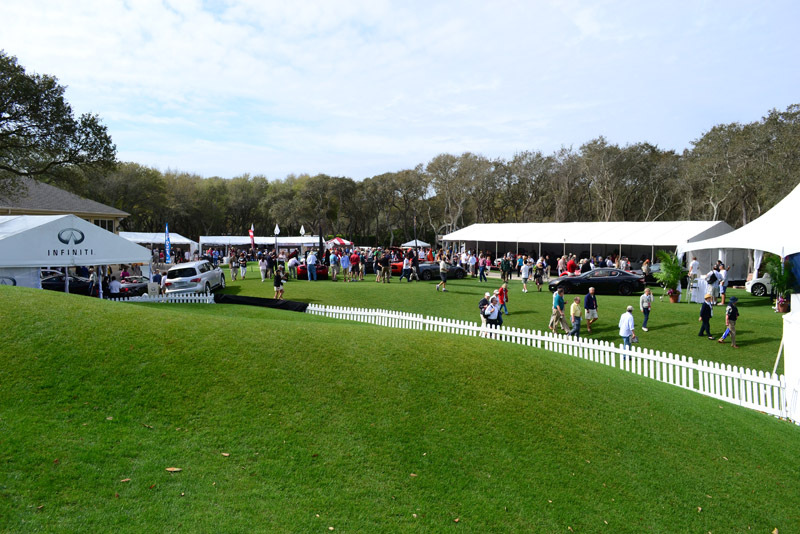 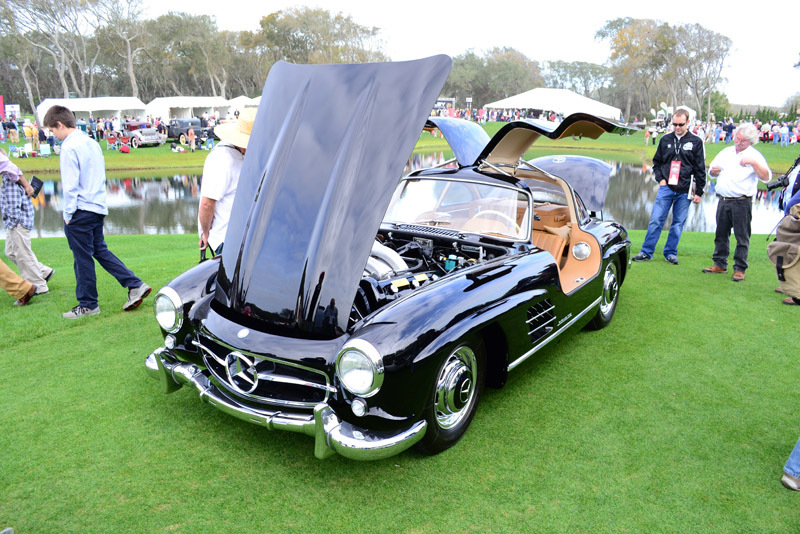 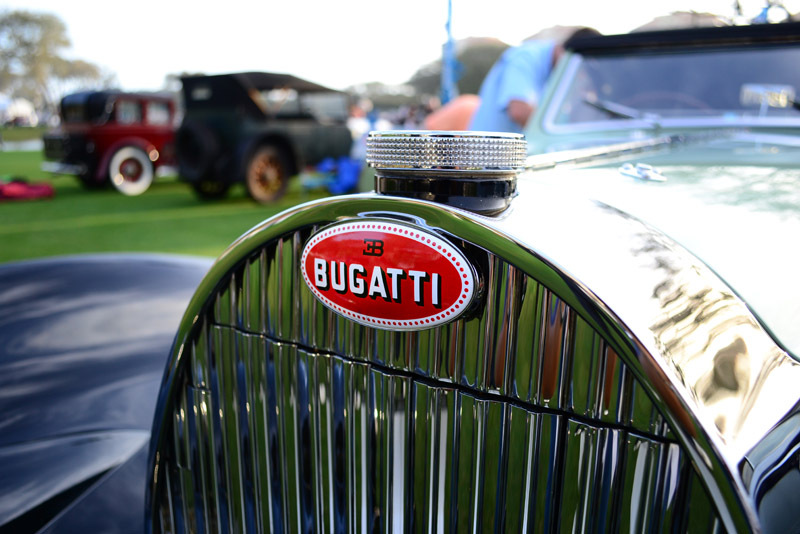 Every year the Amelia Island Concours d’Elegance brings about automotive enthusiasts from all over the world to not only show off fine automobiles, but partake in the exclusive festivities that make Concours events the most prestigious automotive shows in the world. 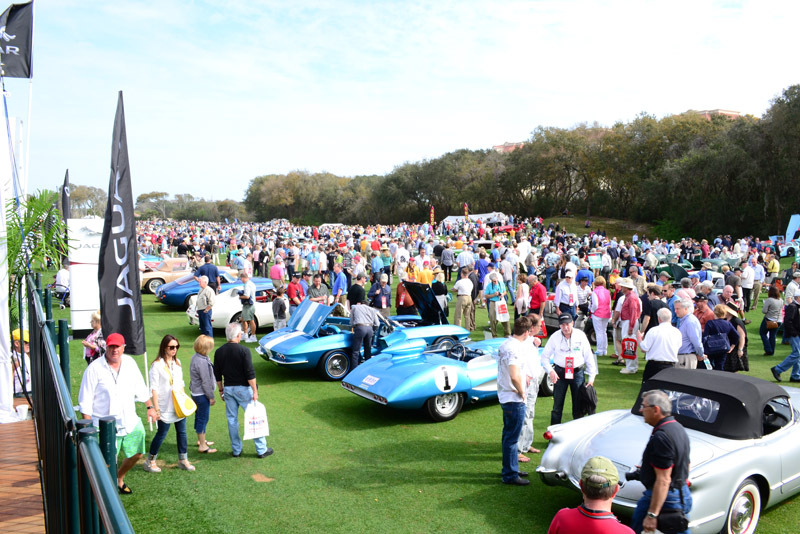 Additionally, thousands of googly-eyed spectators laced the Ritz Carlton lawn as early as 8am in the morning to capture what may be considered a once-in-a-lifetime montage of automotive history and creation. 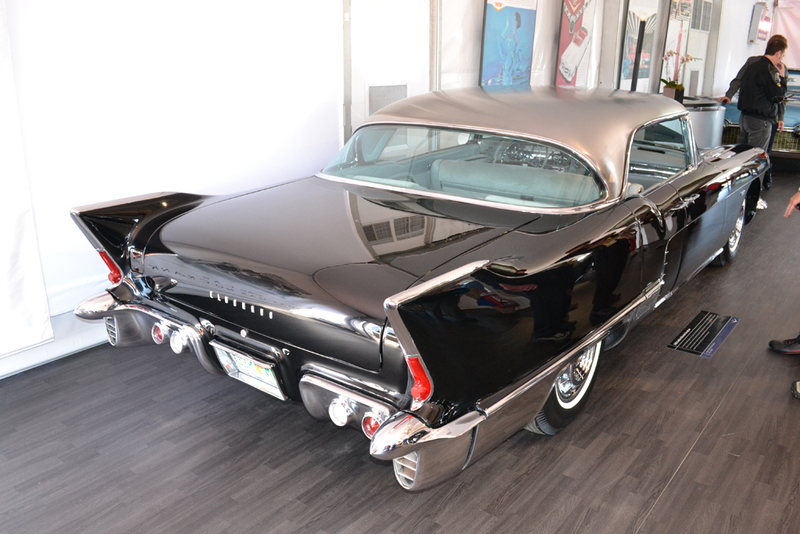 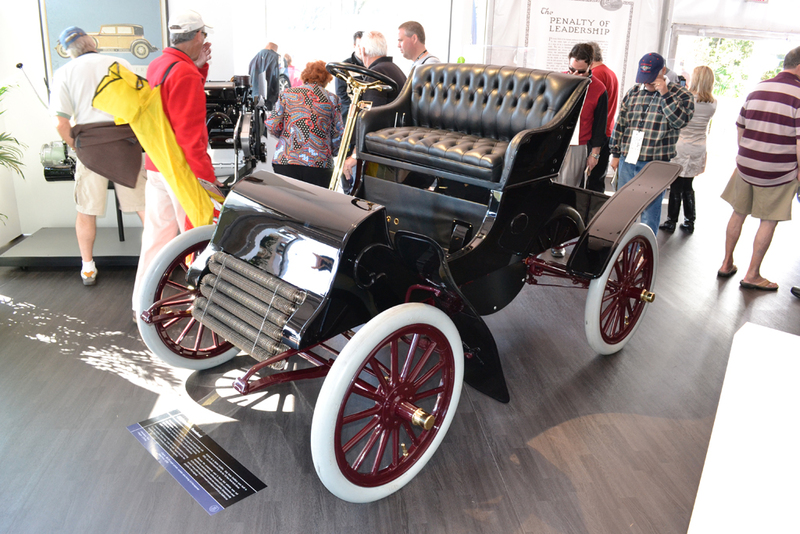 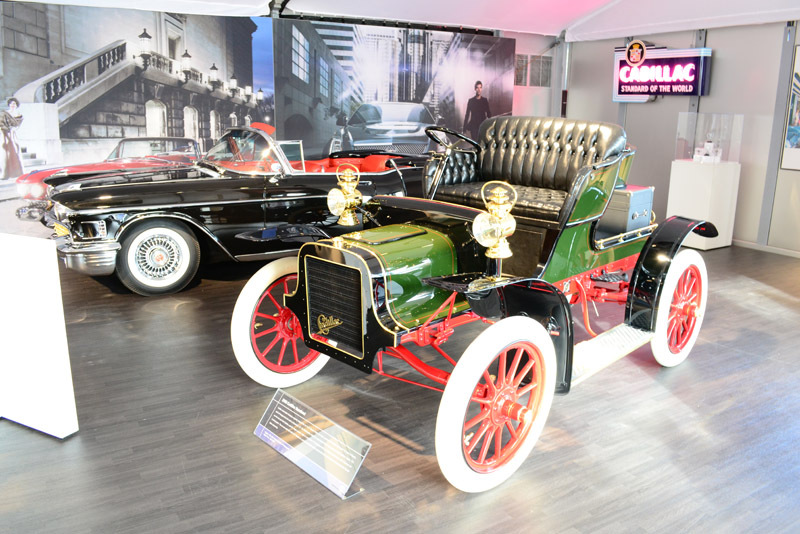 Encompassing the remainder of the field where various makes and models of automobiles dating back to the late 1800’s all the way to present day. 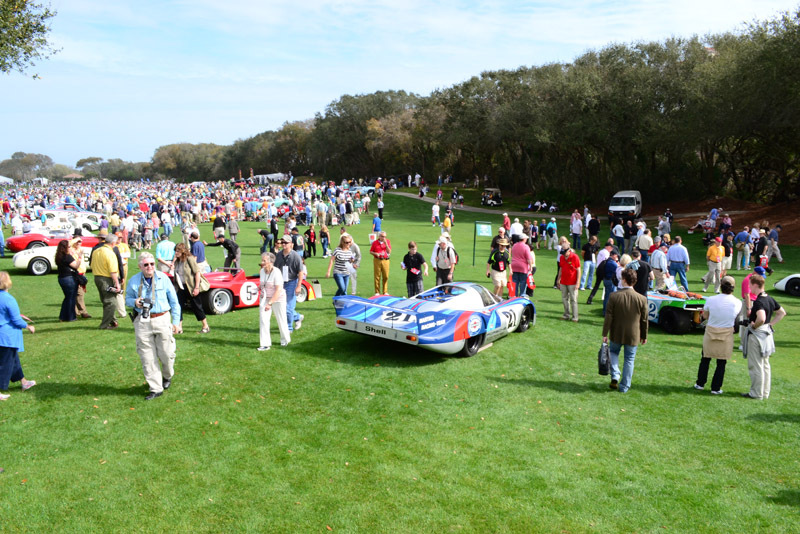 We welcome you to view our photos below capturing many of the vehicles on display at this year’s 17th Annual Amelia Island Concours d’Elegance – 2012. 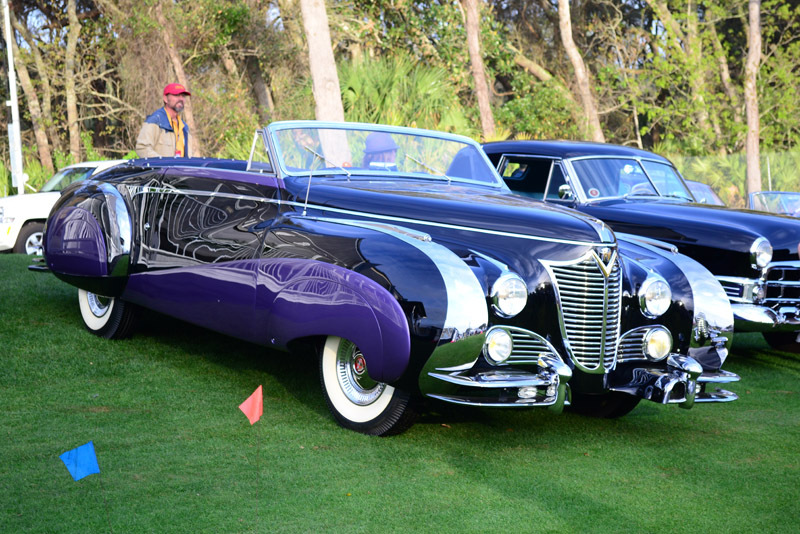 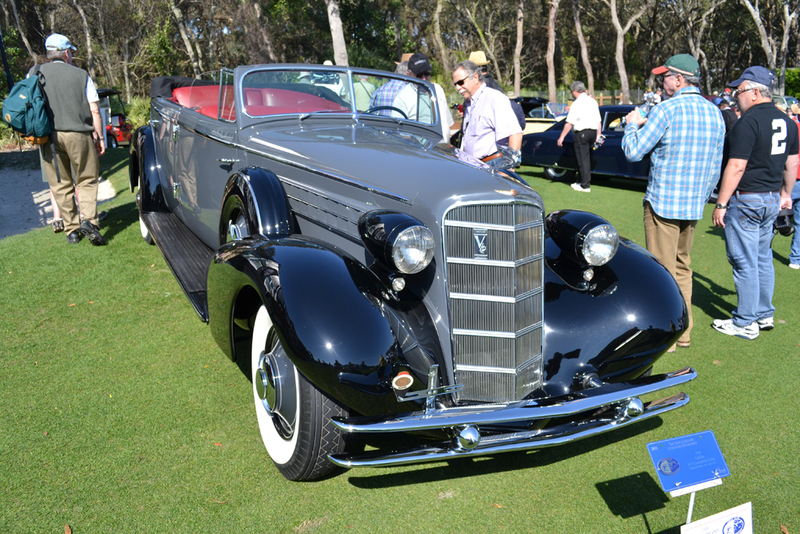 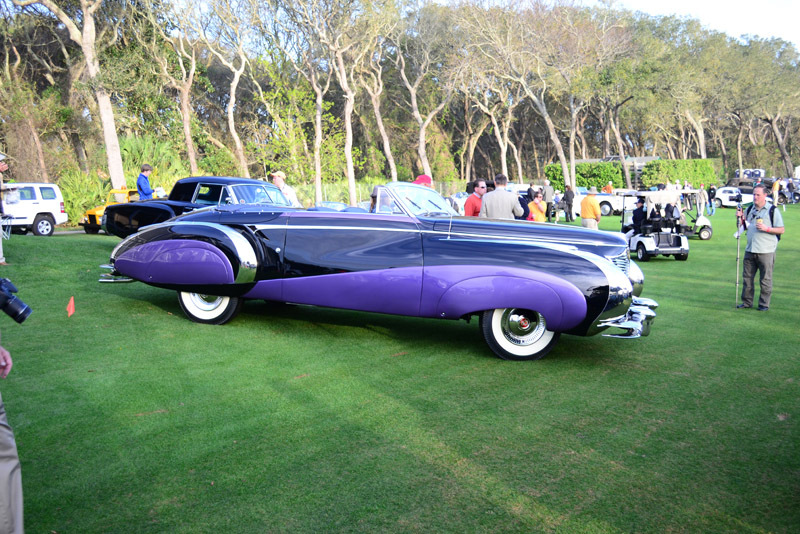 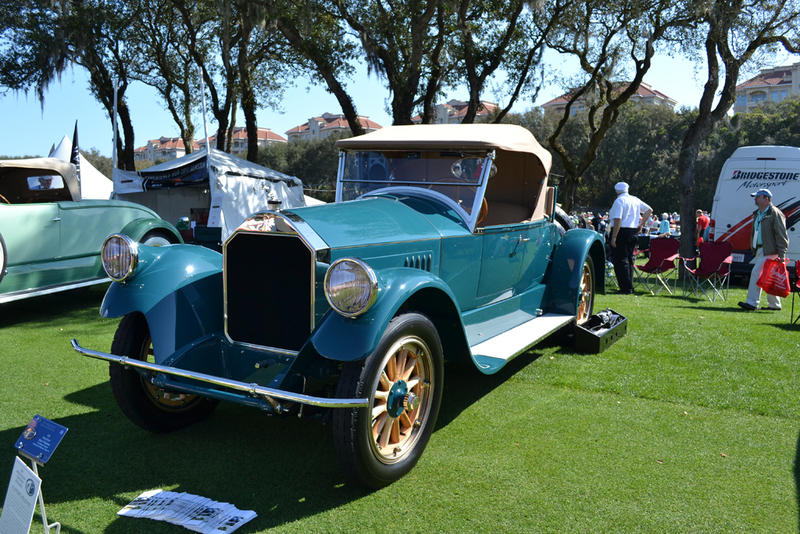 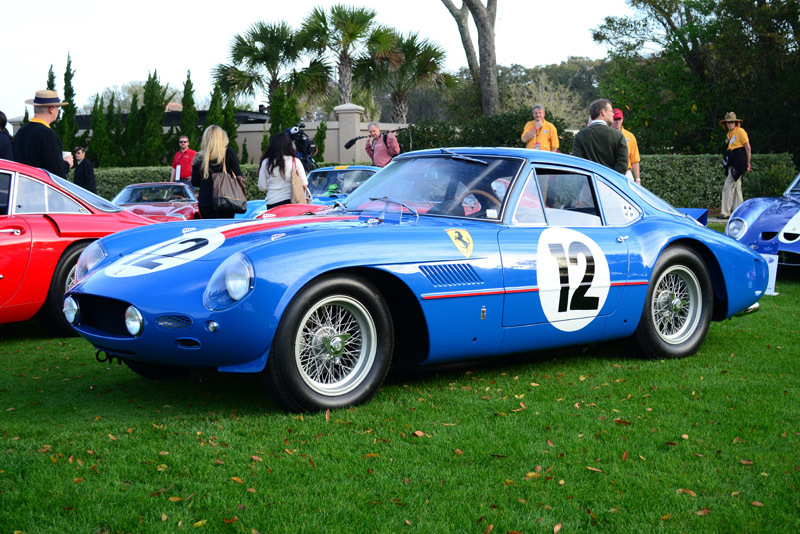 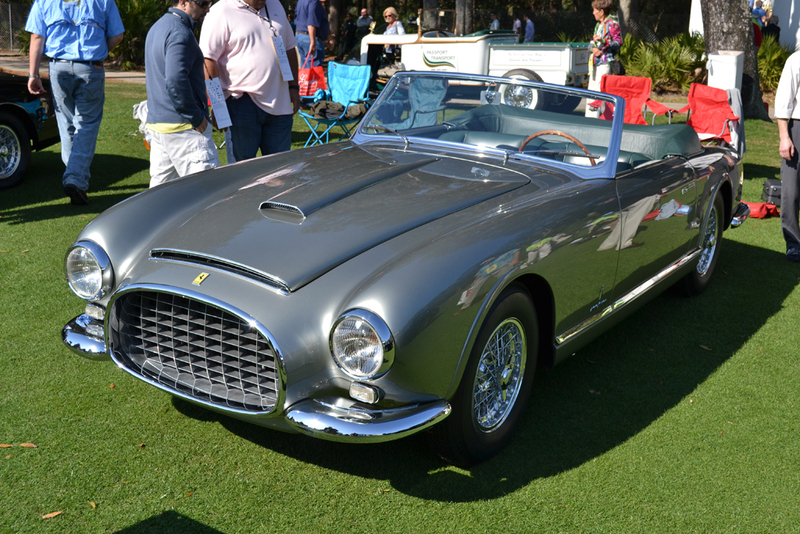 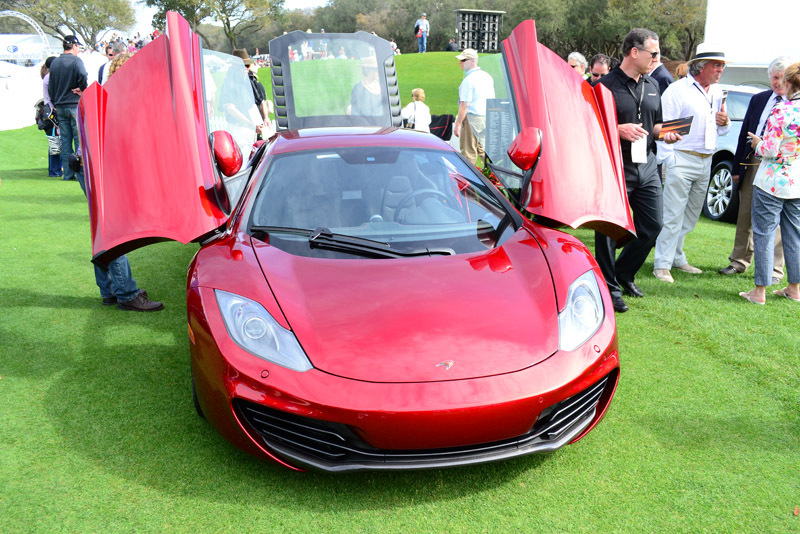 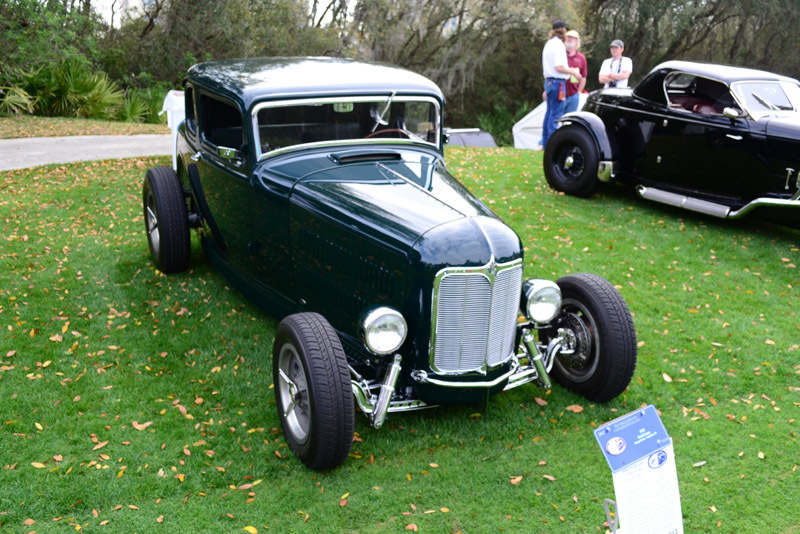 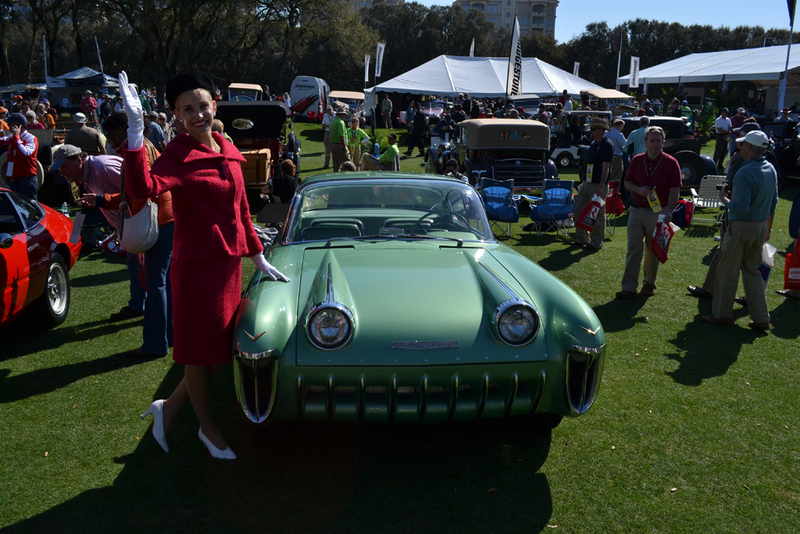 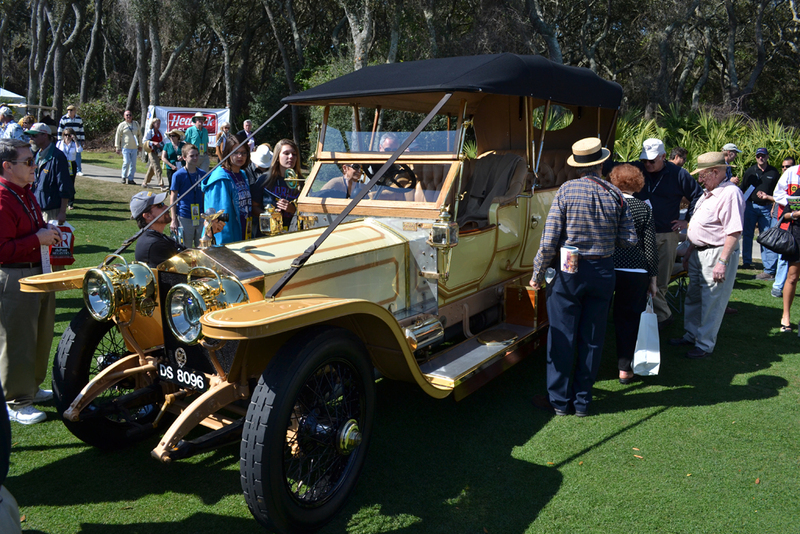 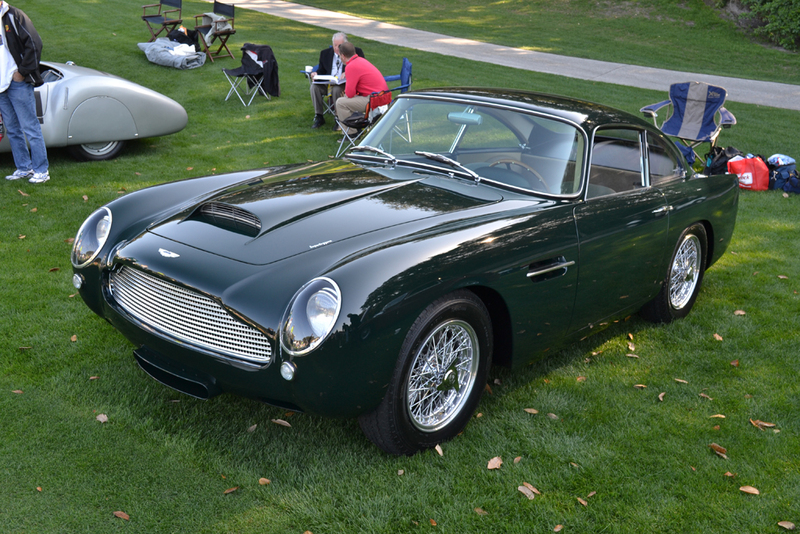 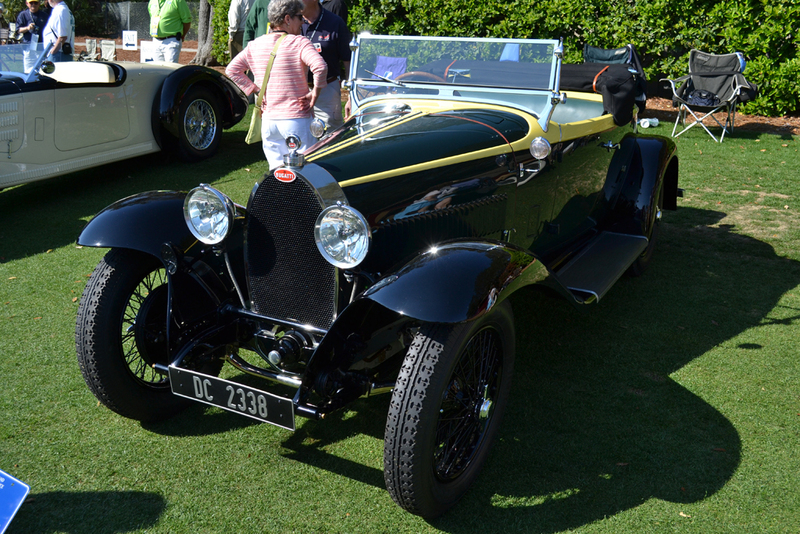 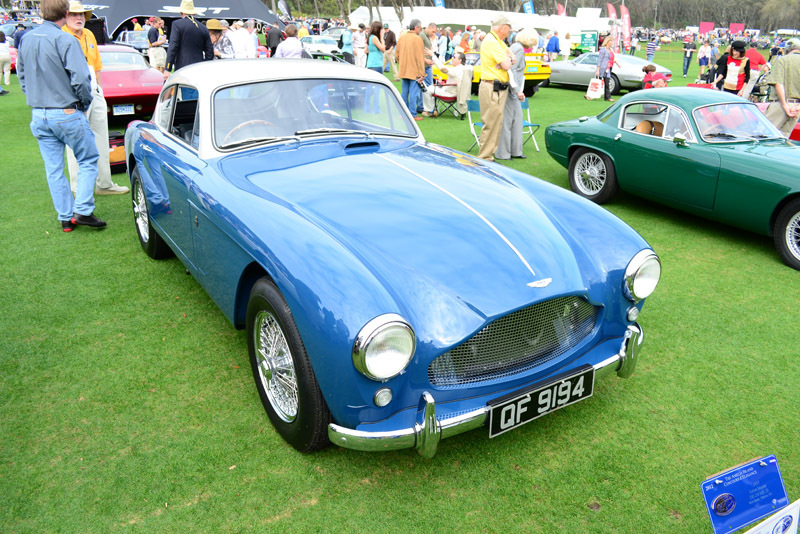 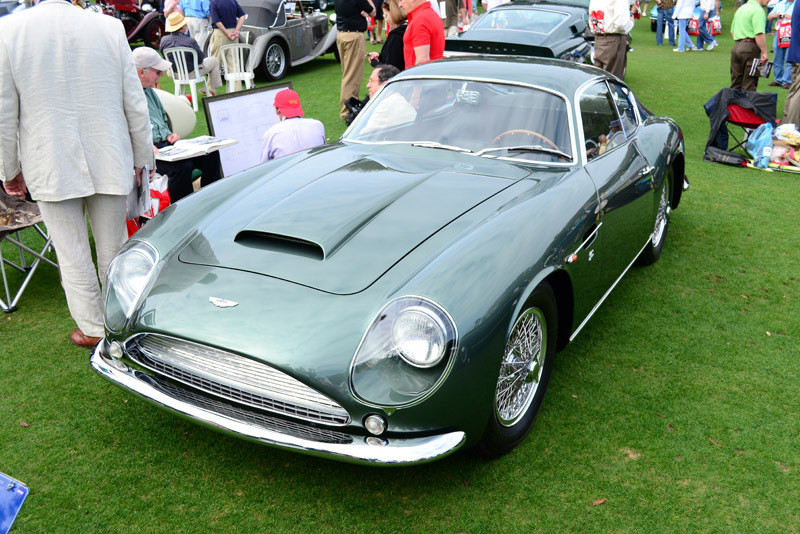 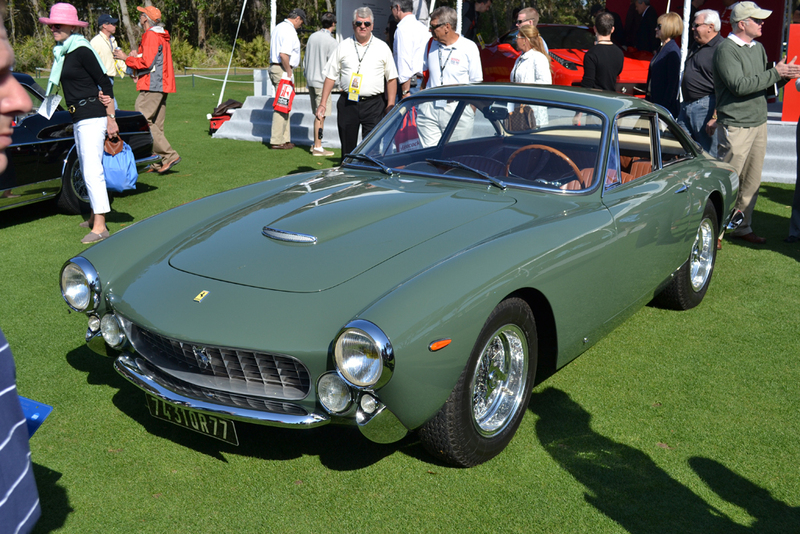 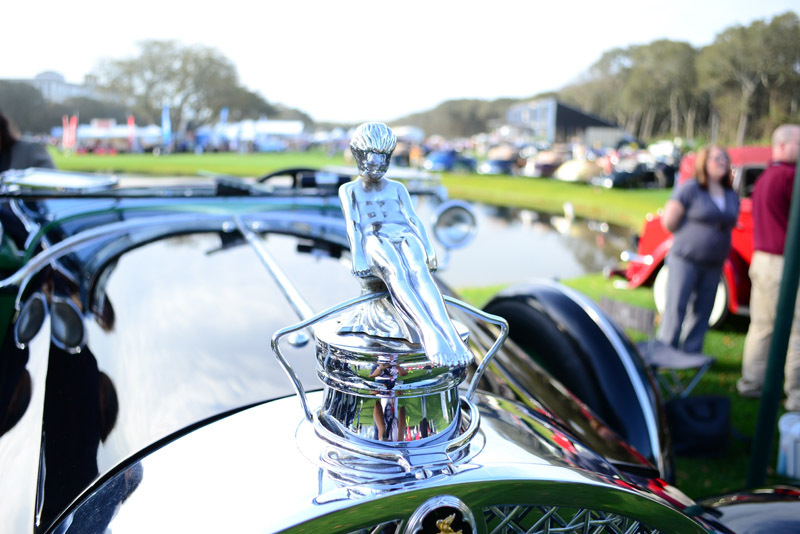 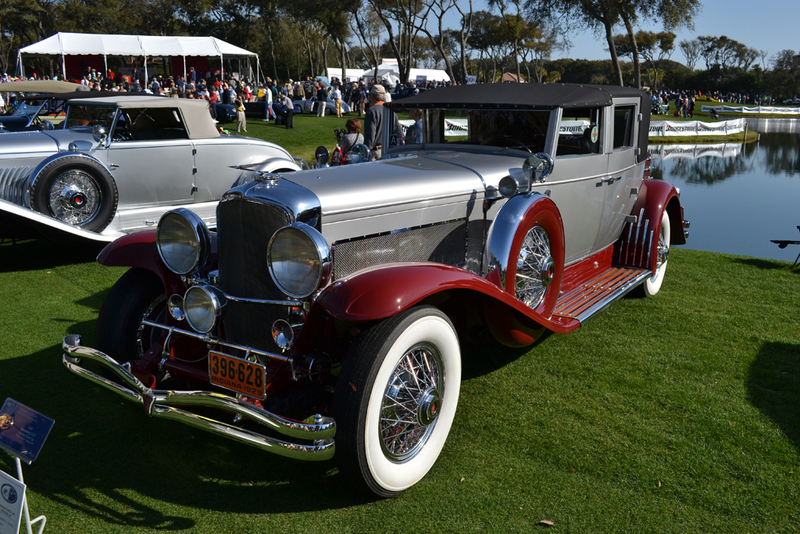 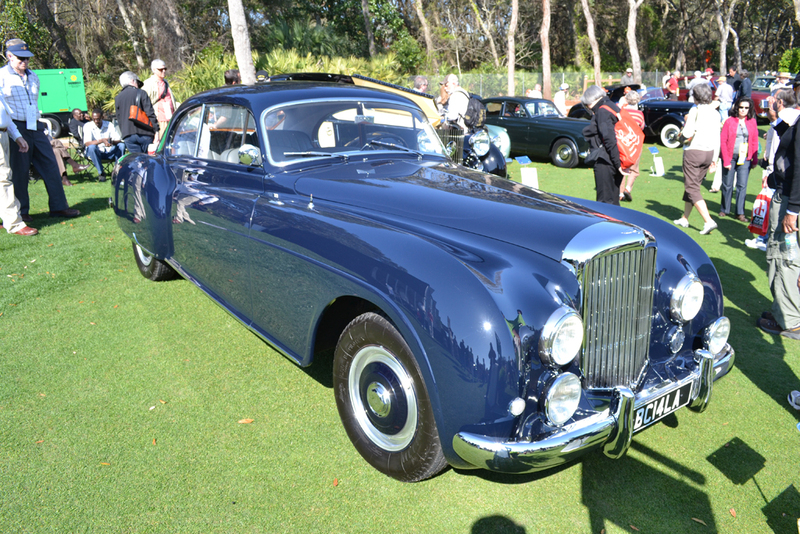 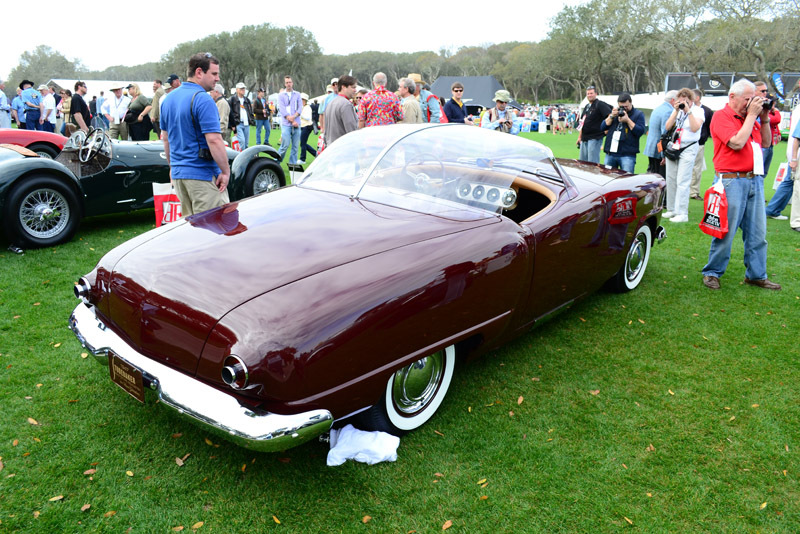 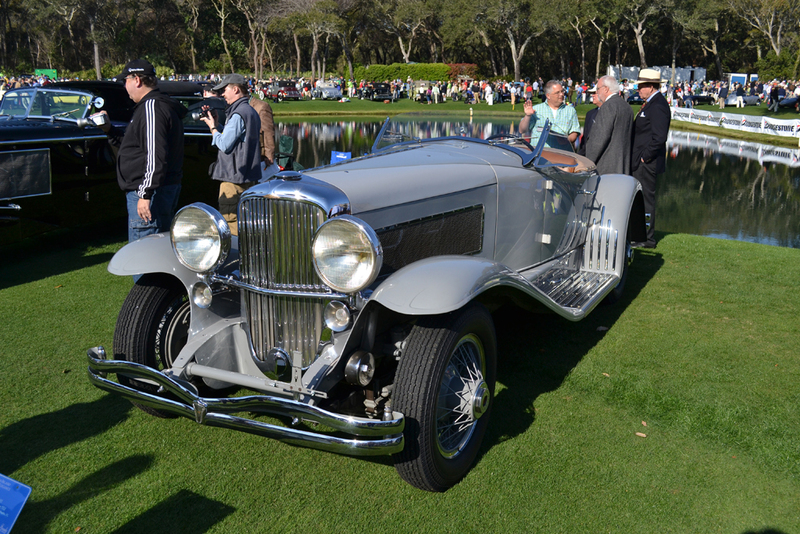 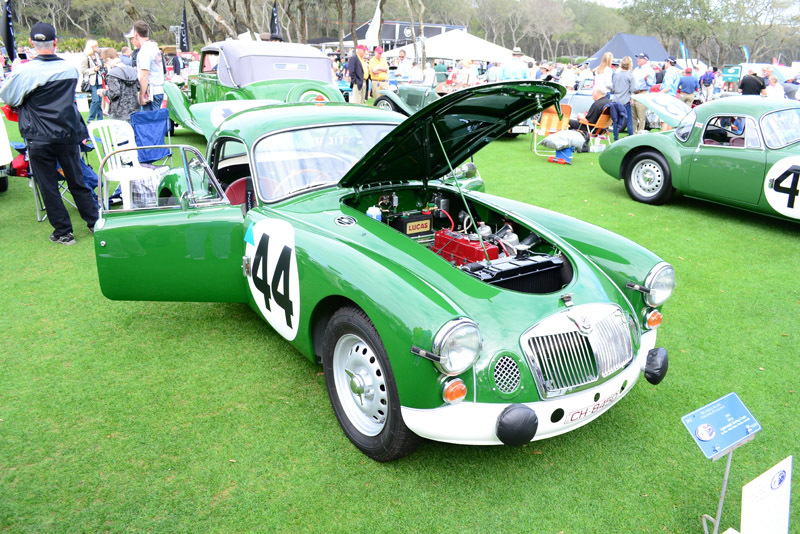 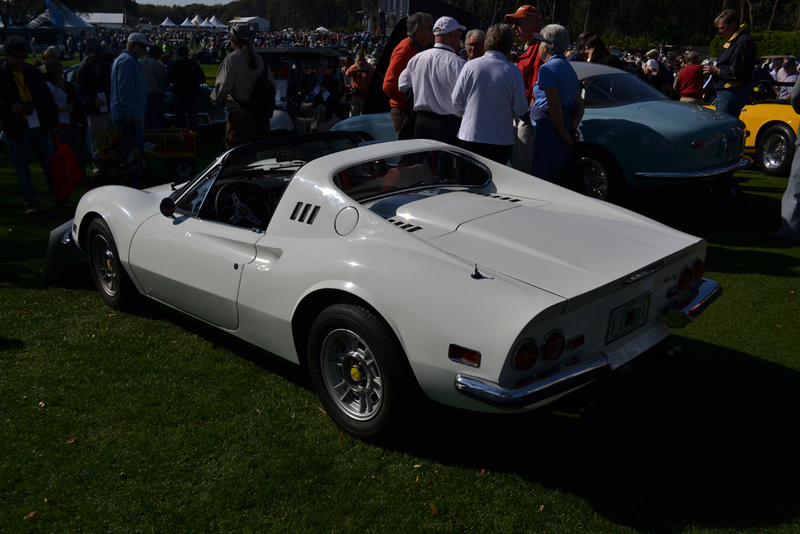 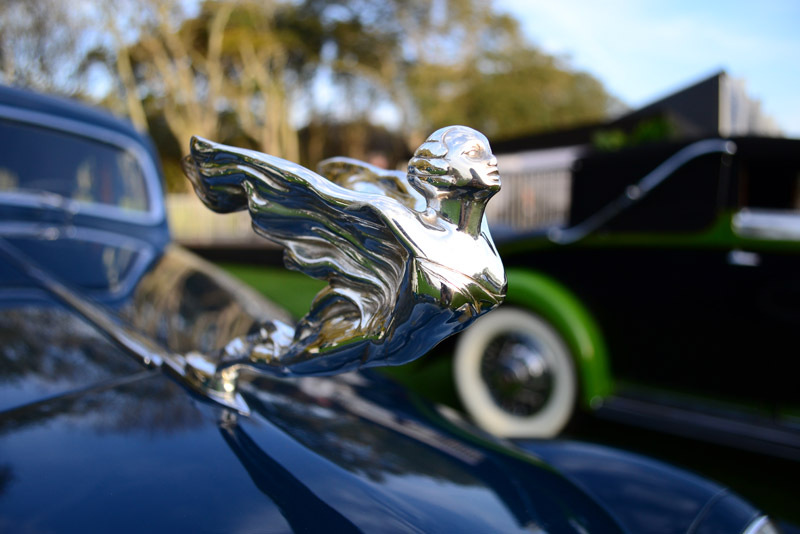 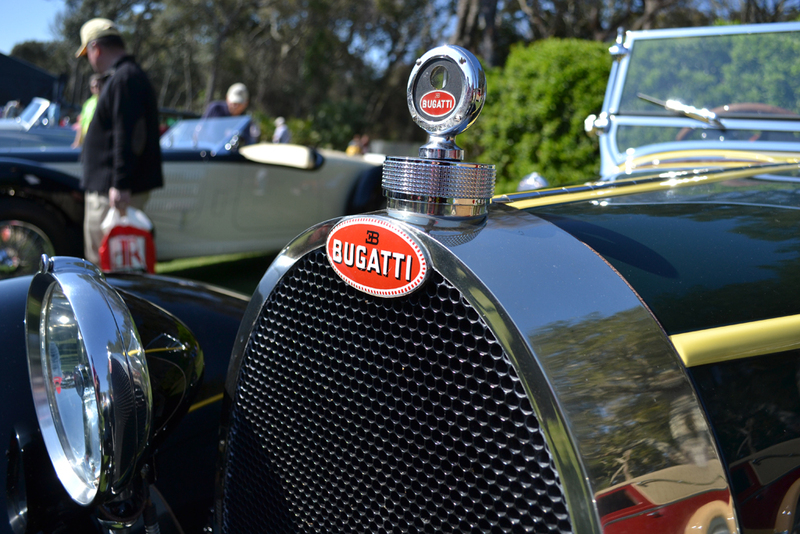 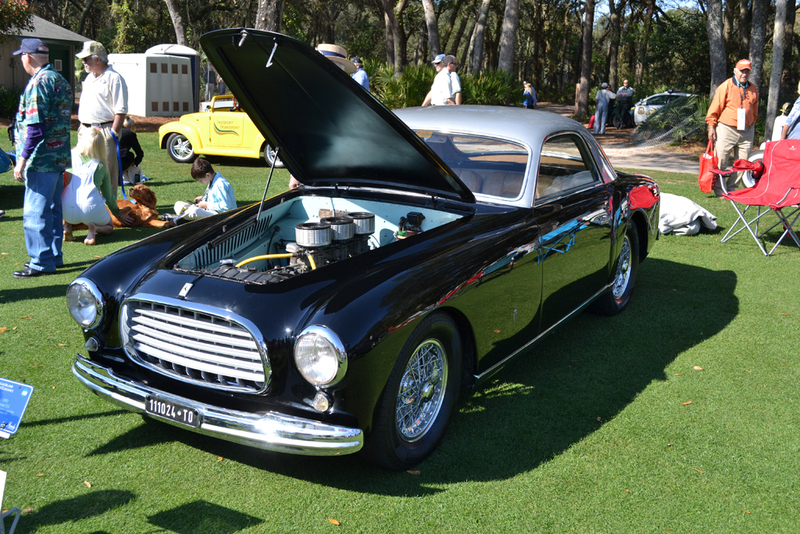 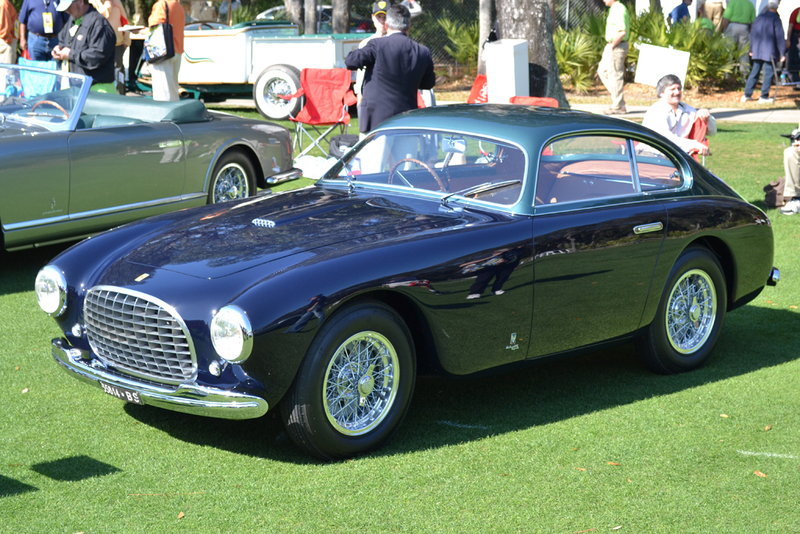 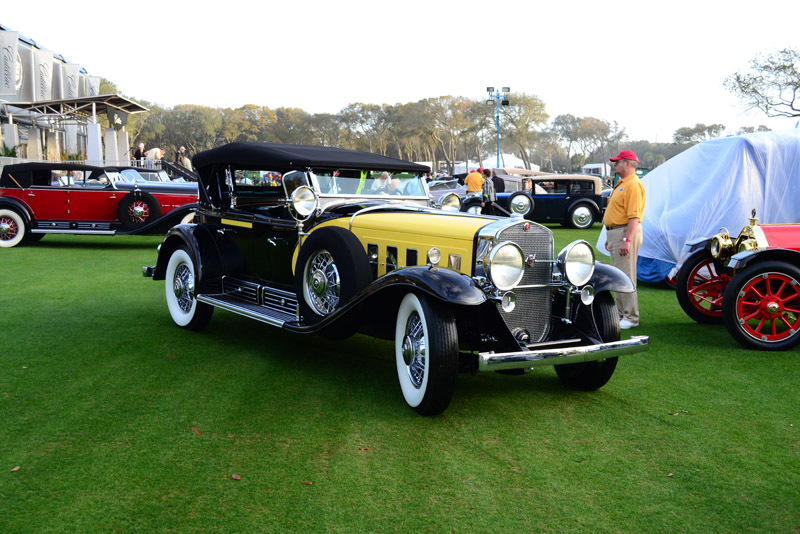 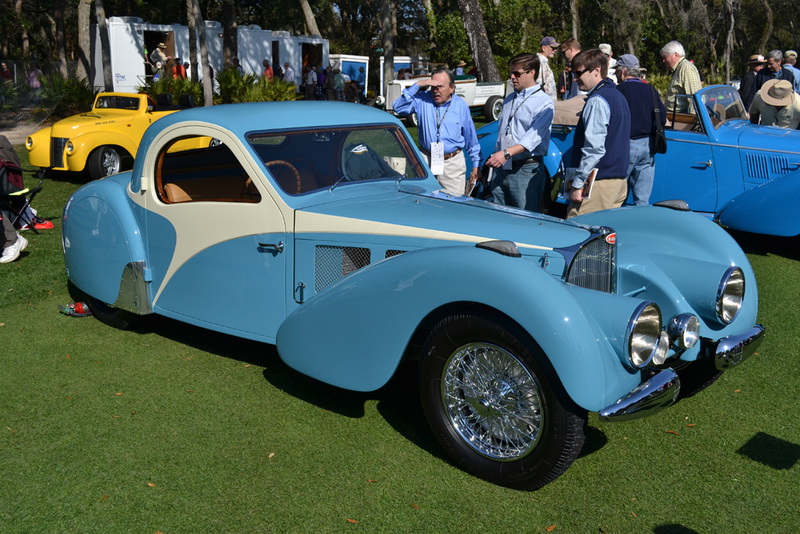 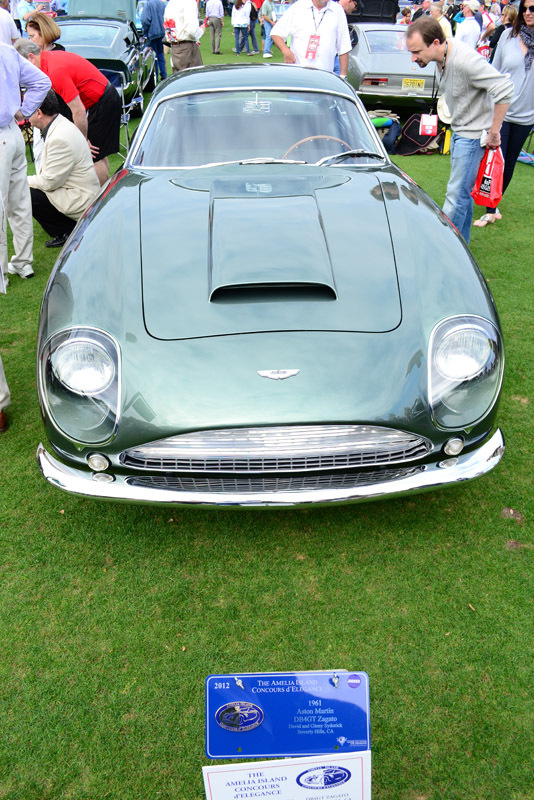 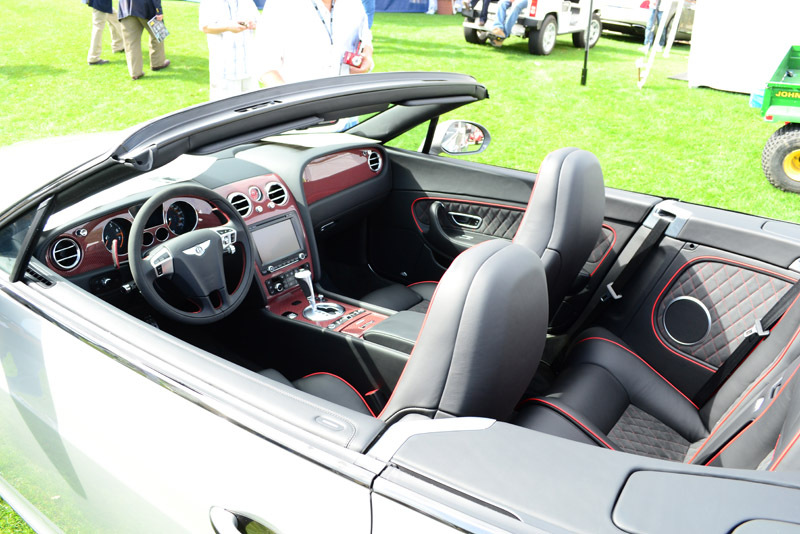 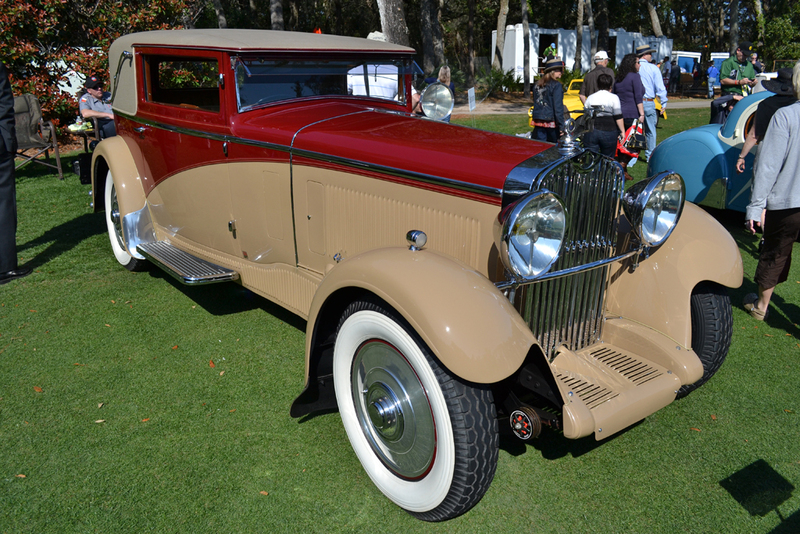 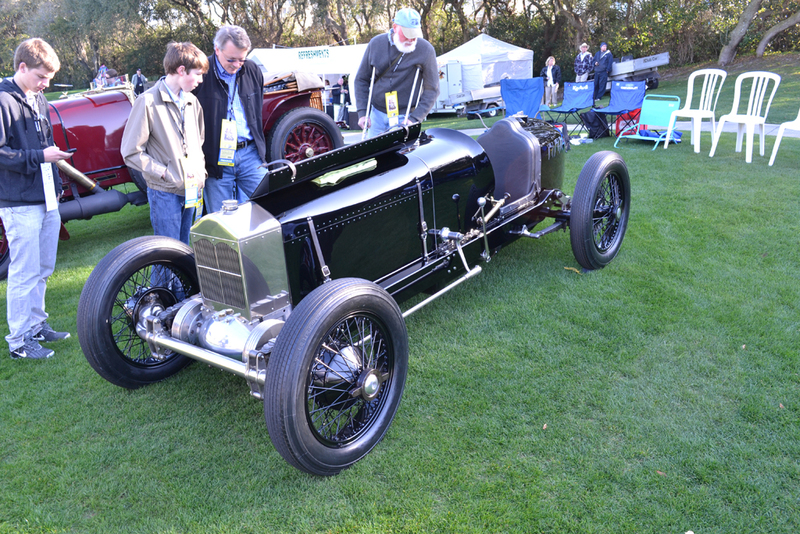 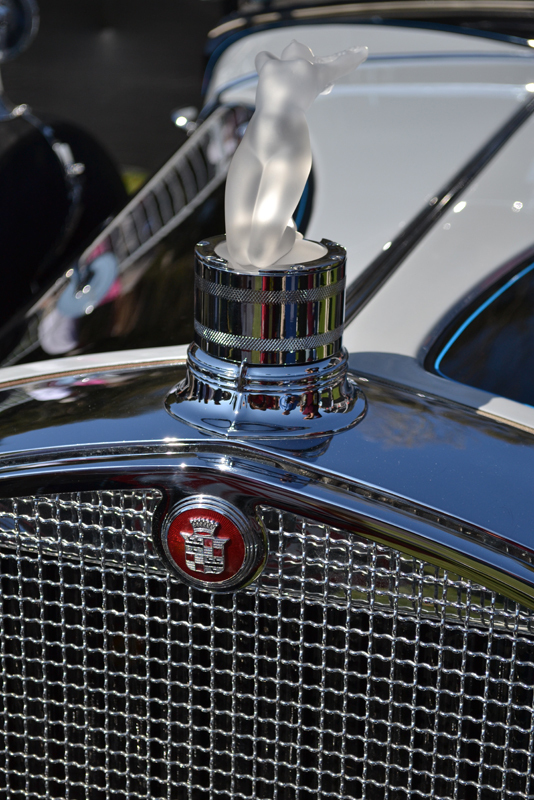 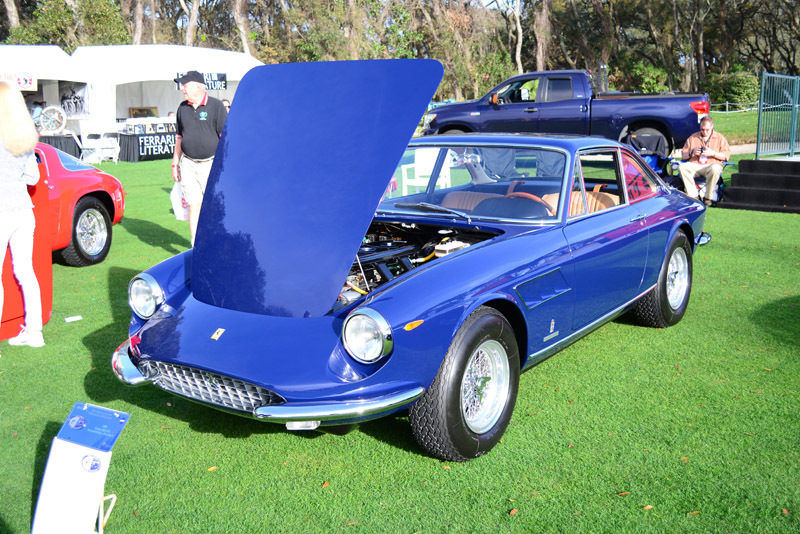 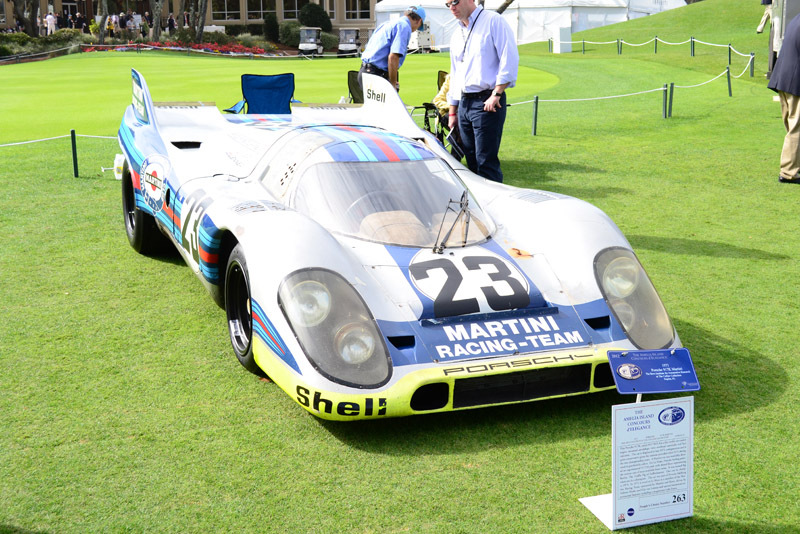 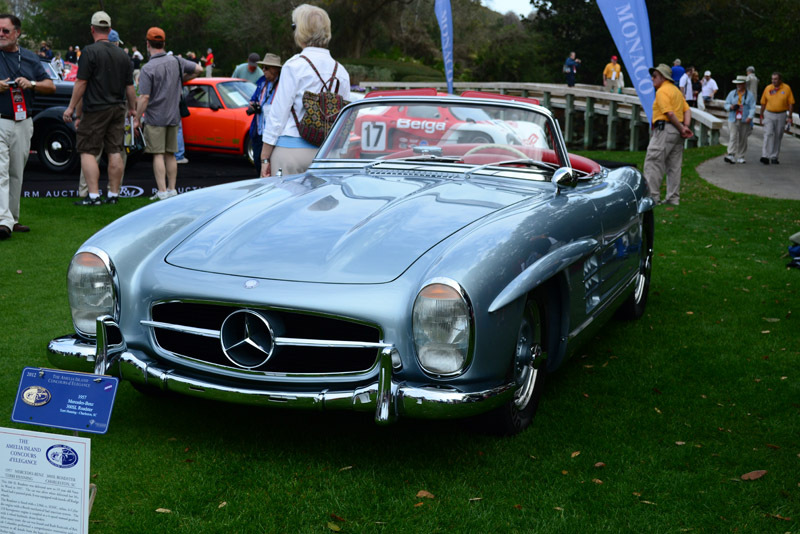 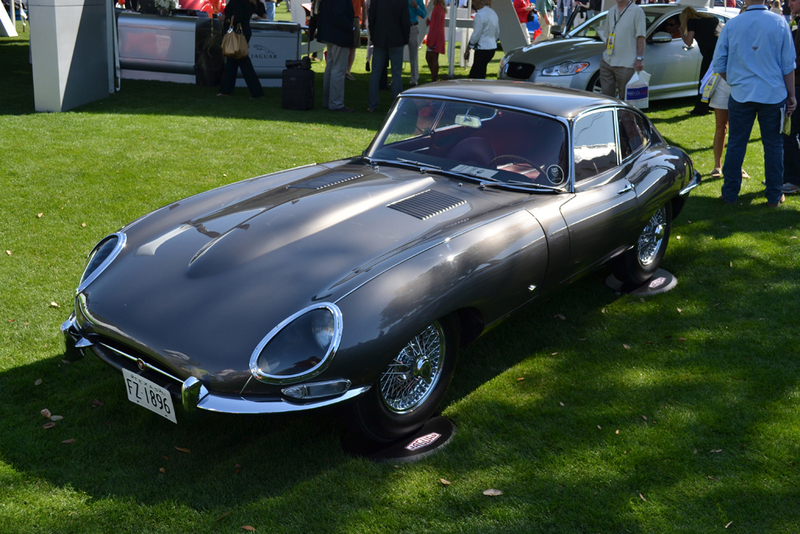 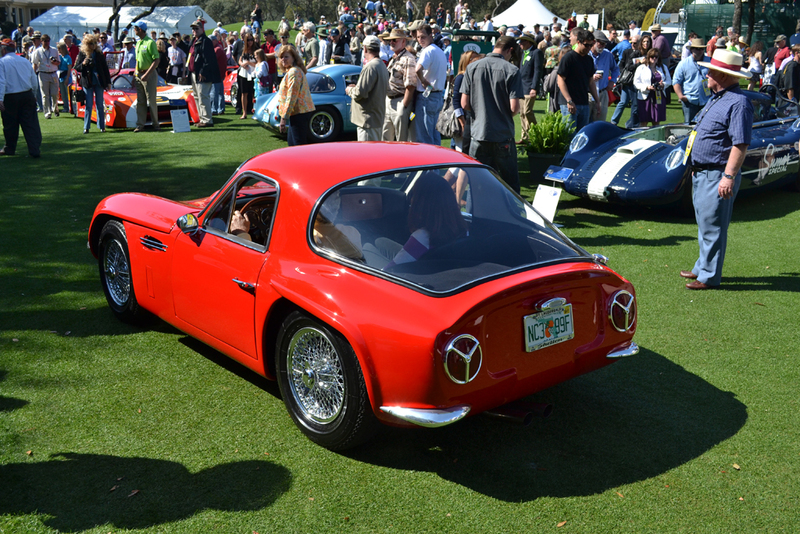 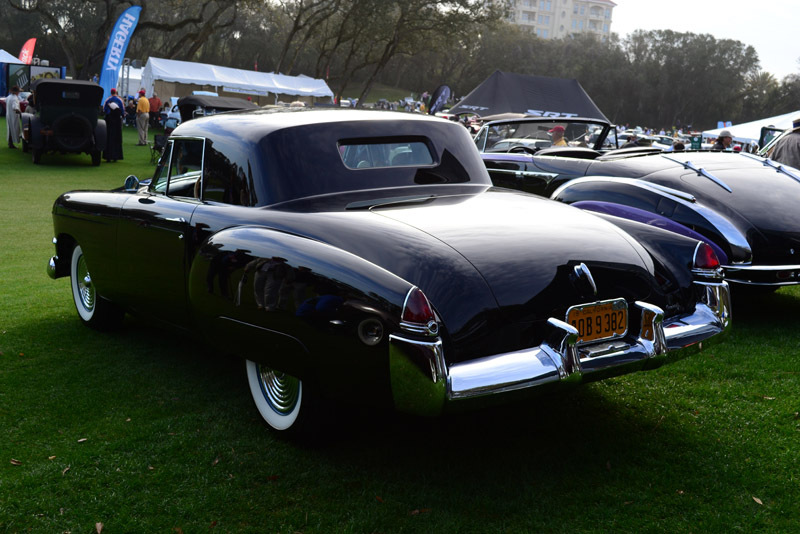 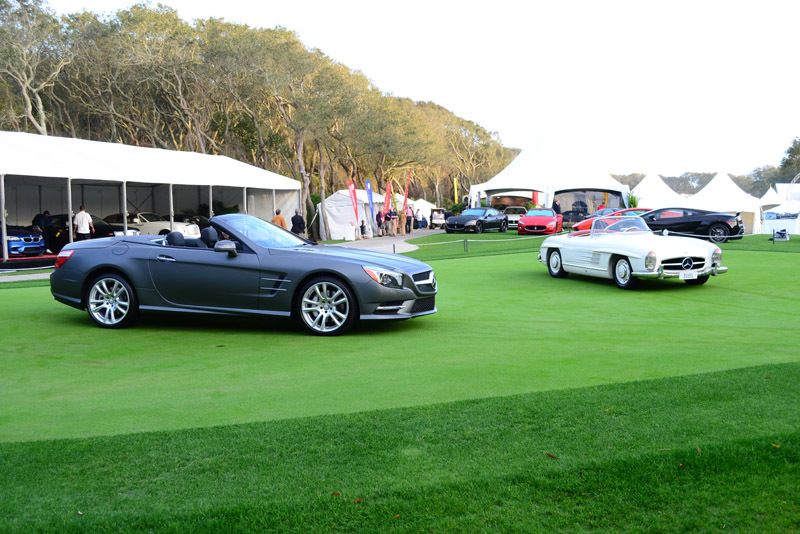 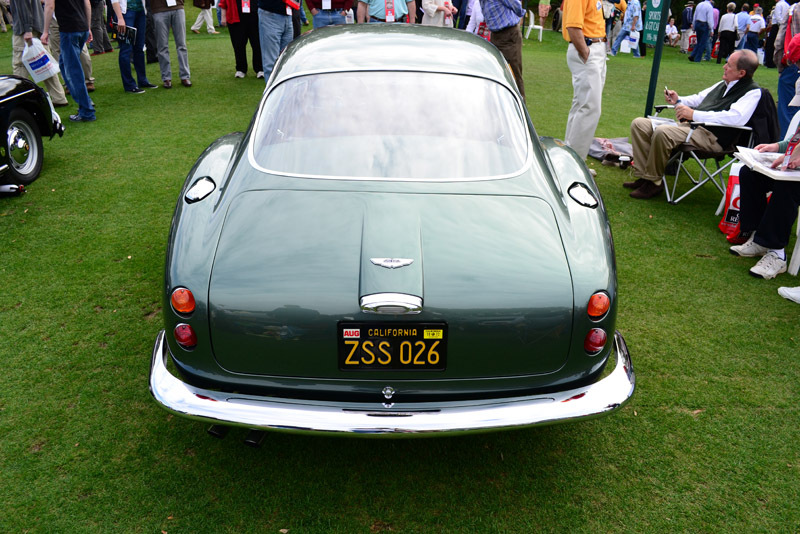 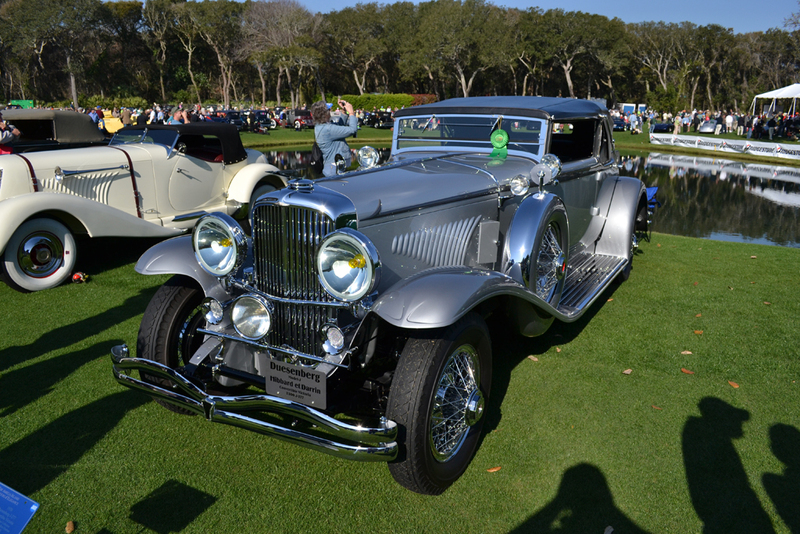 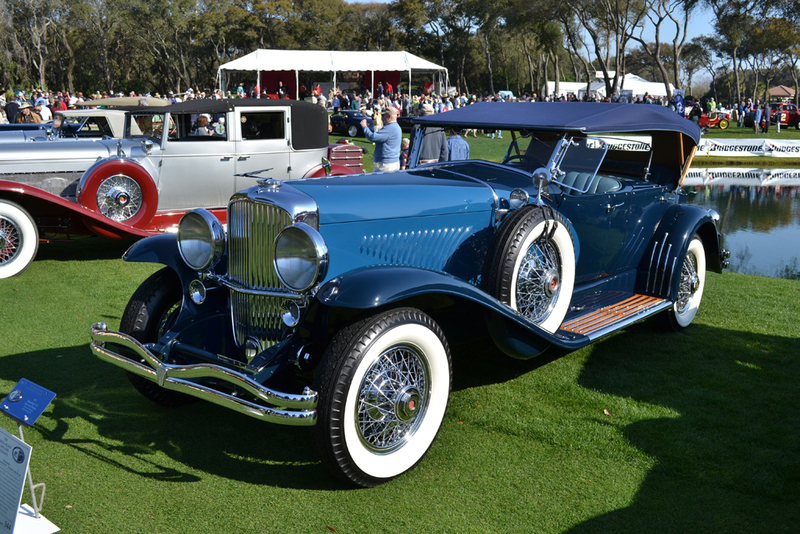 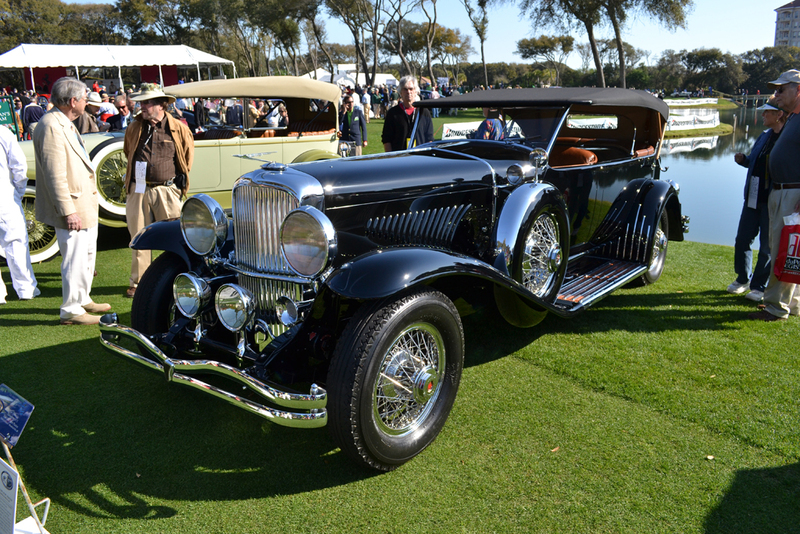 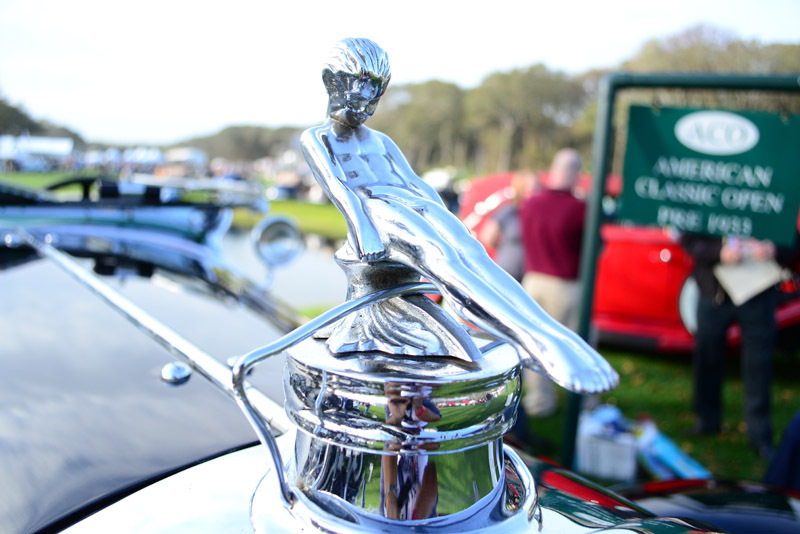 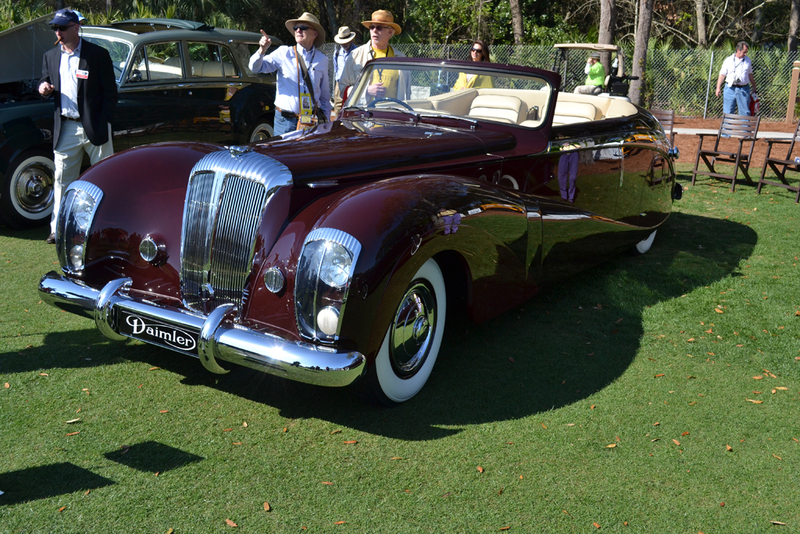 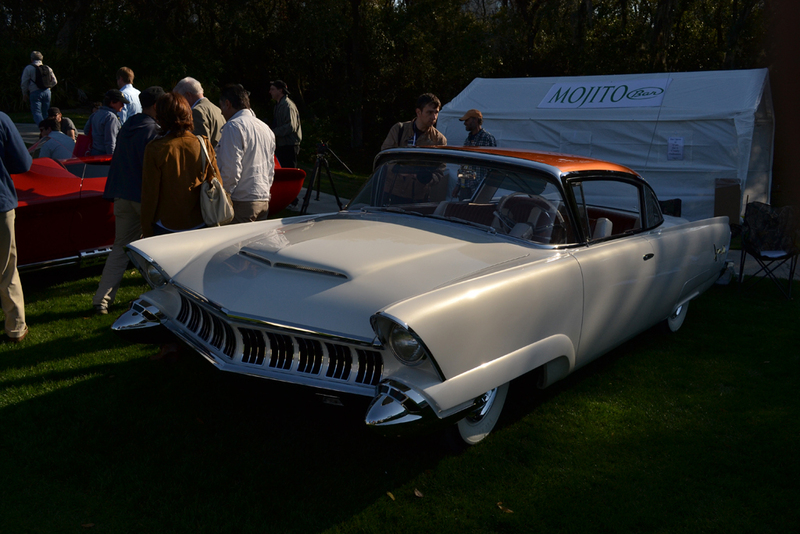 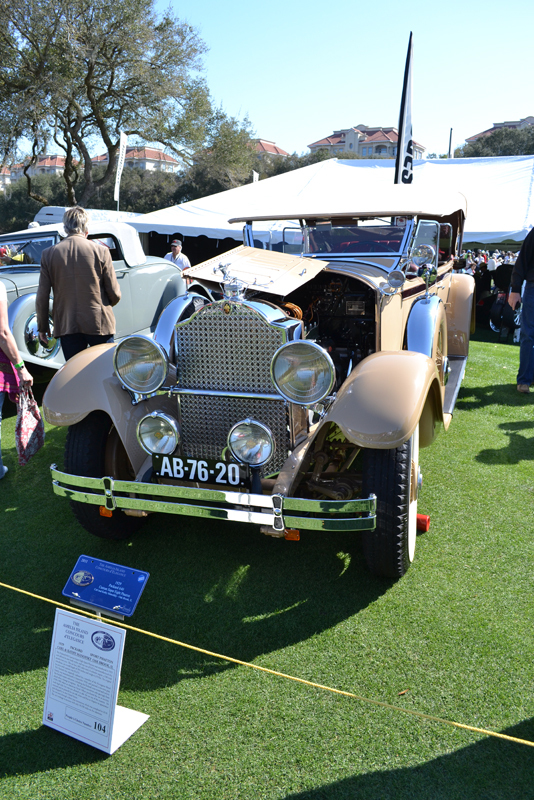 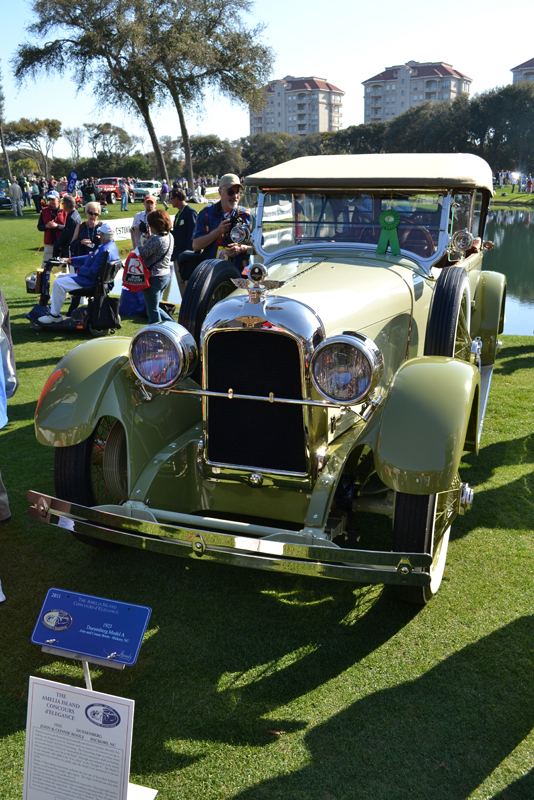 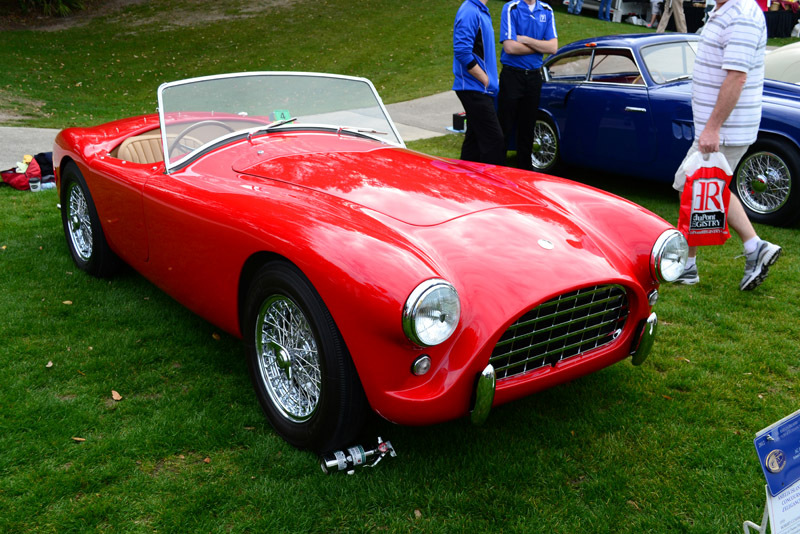 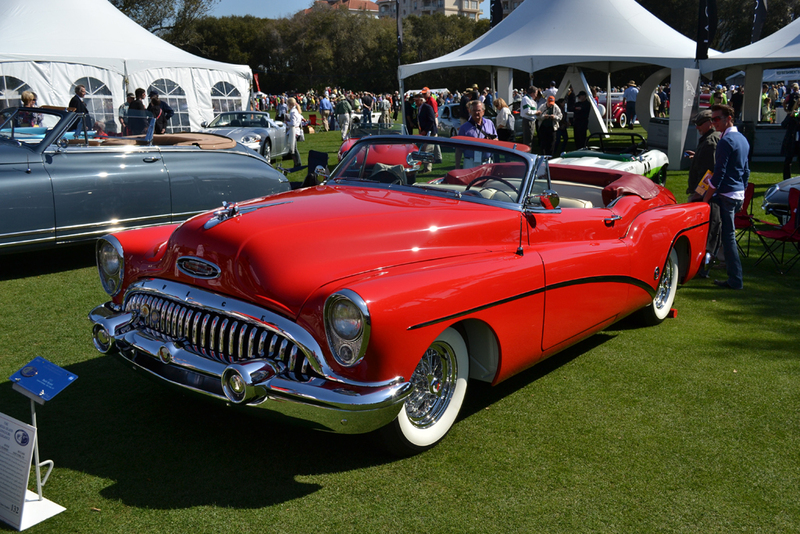 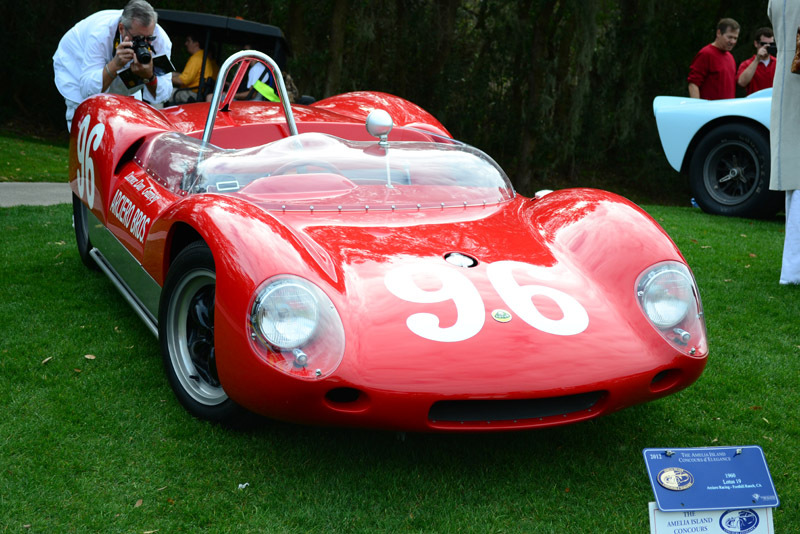 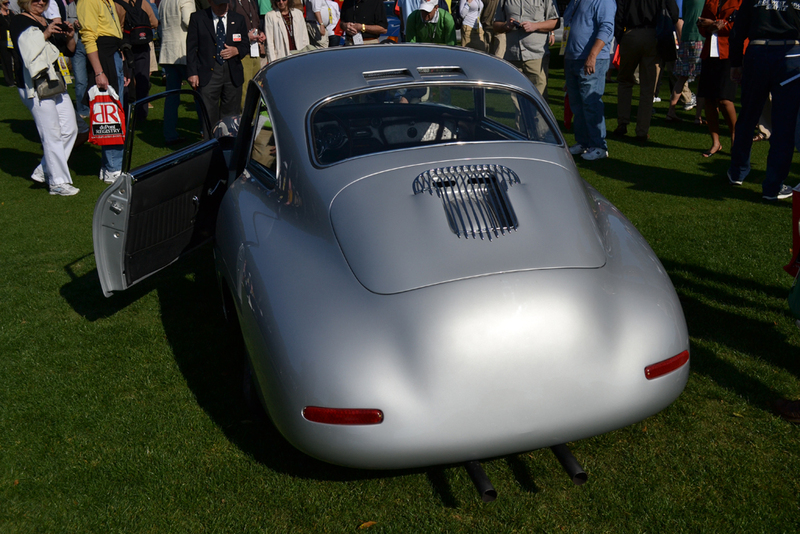 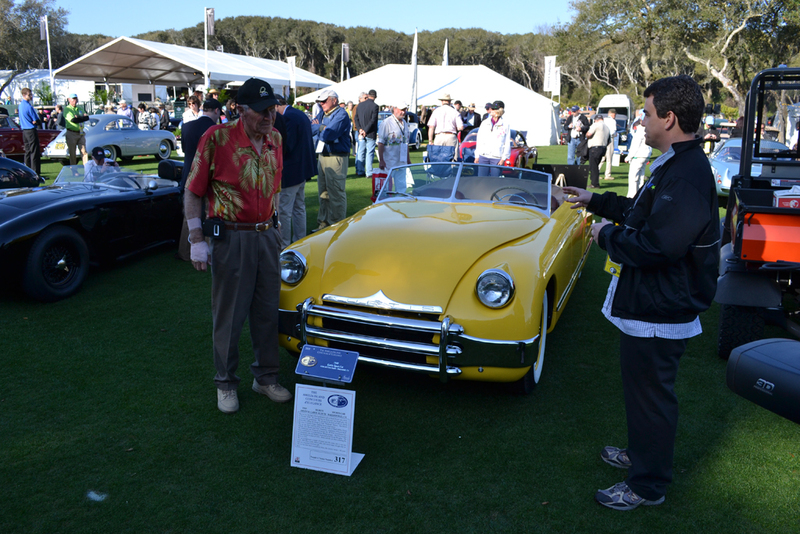 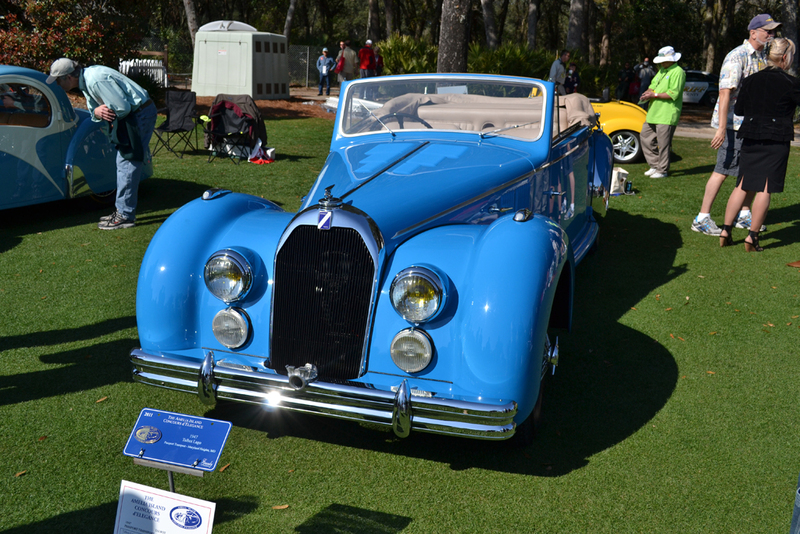 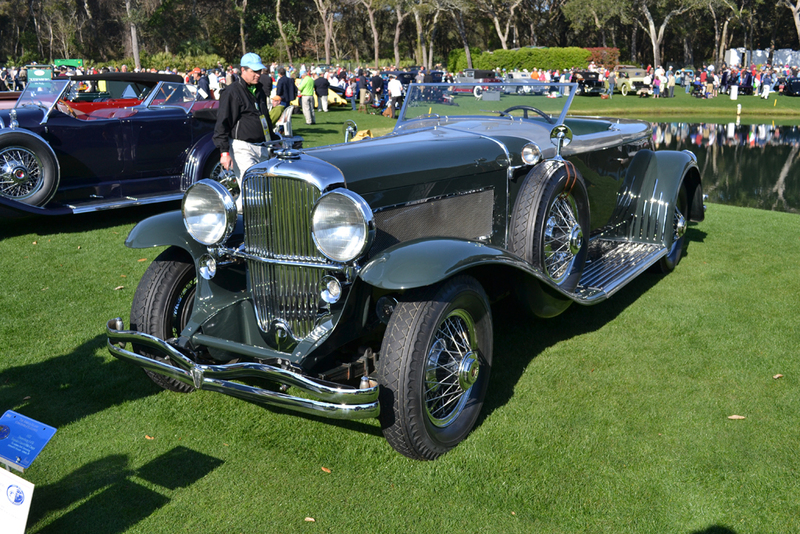 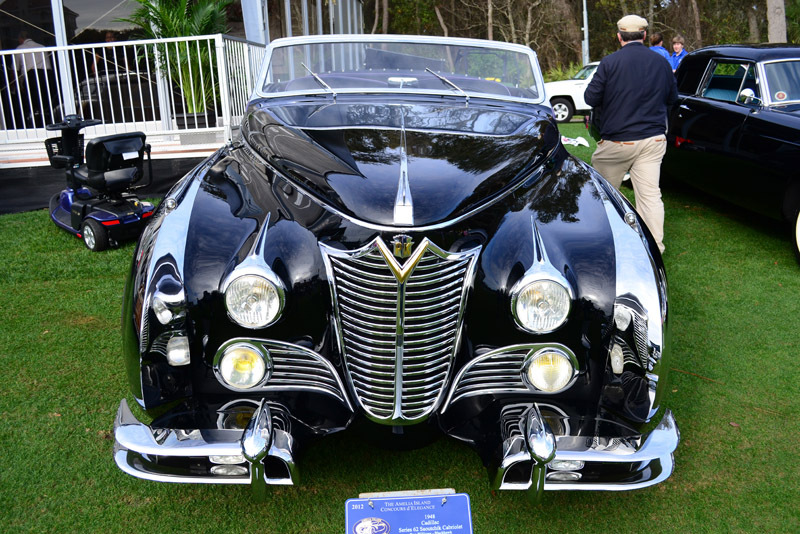 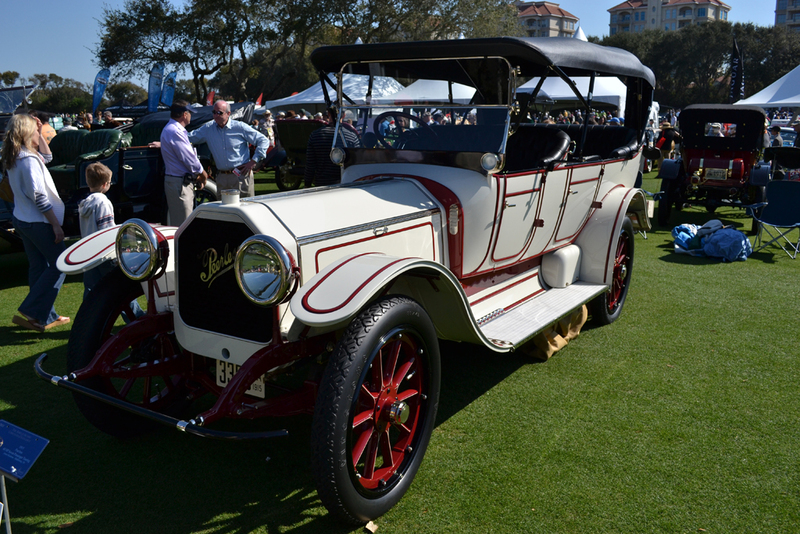 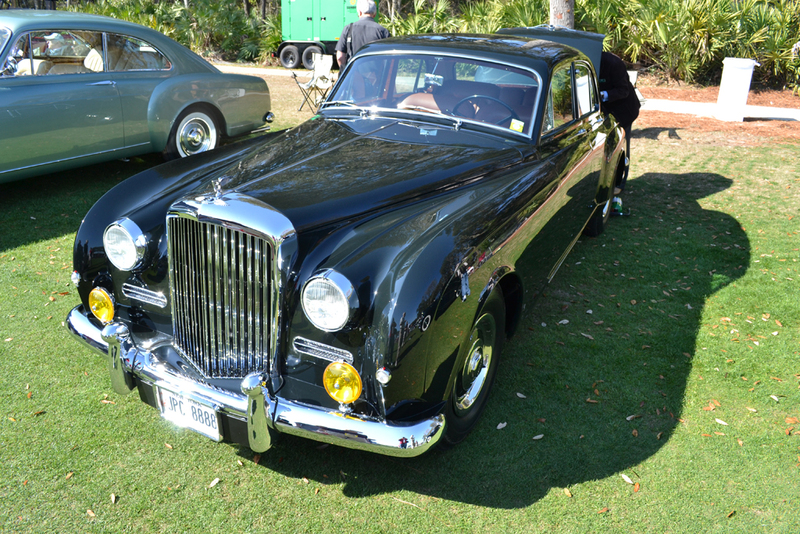 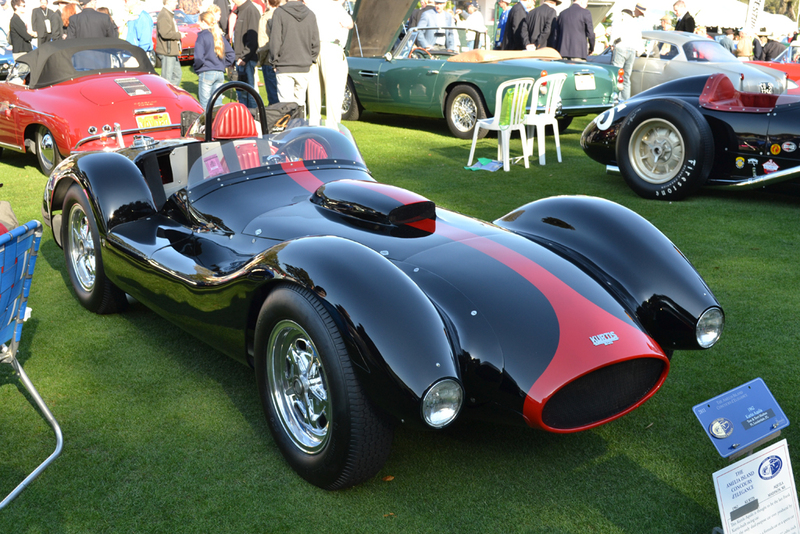 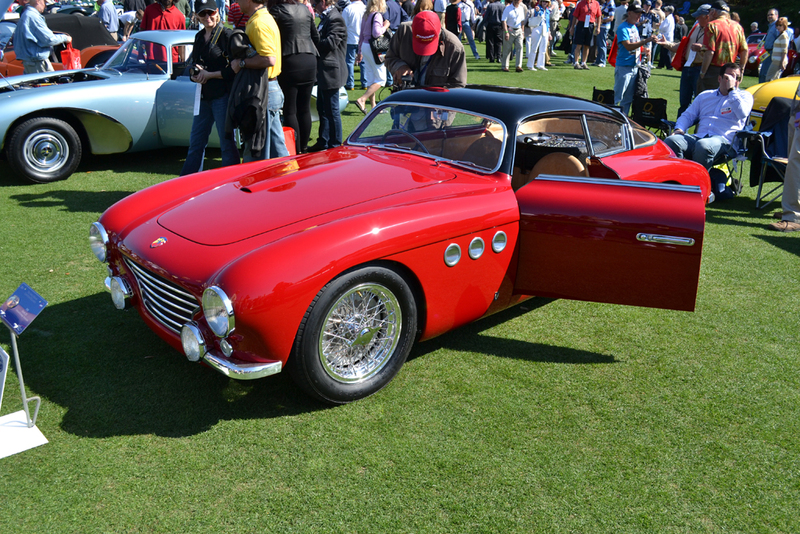 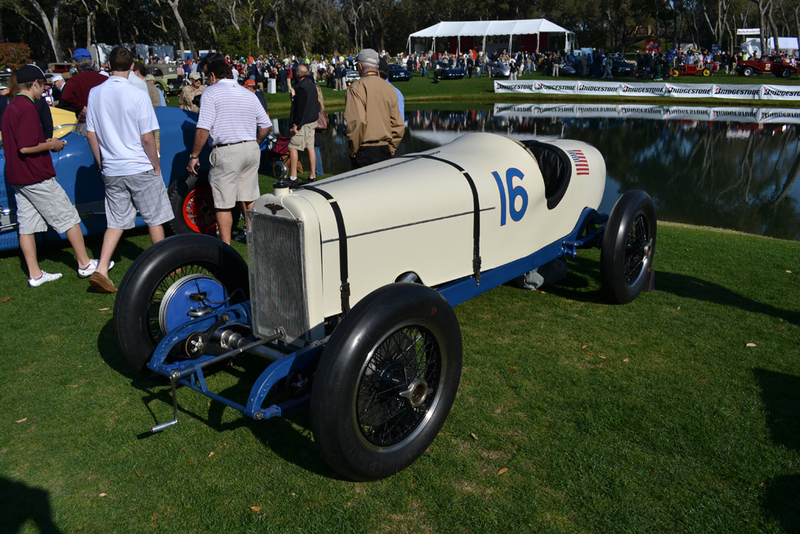 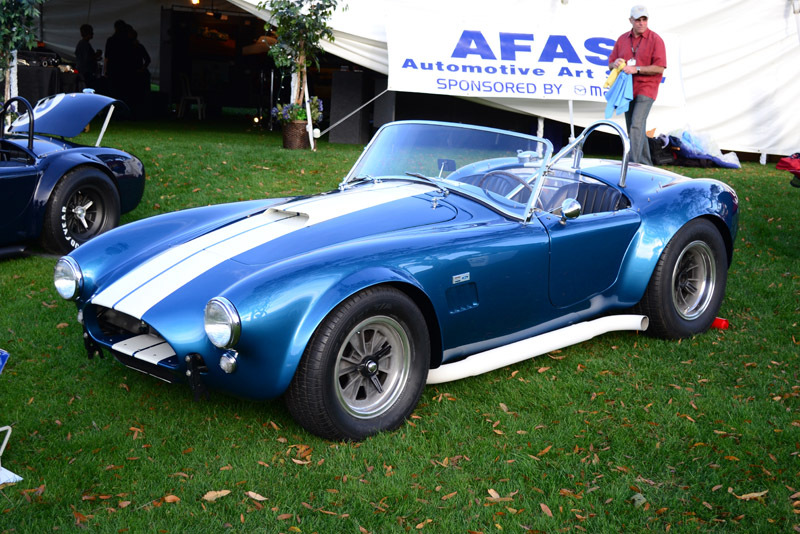 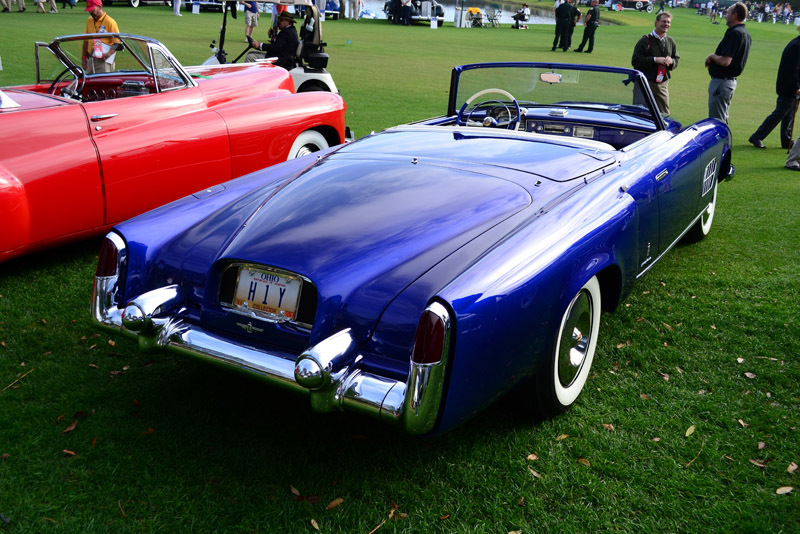 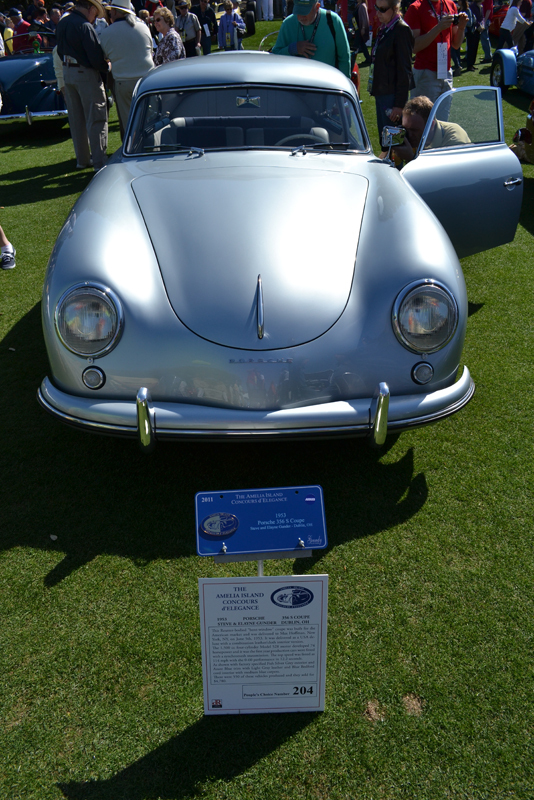 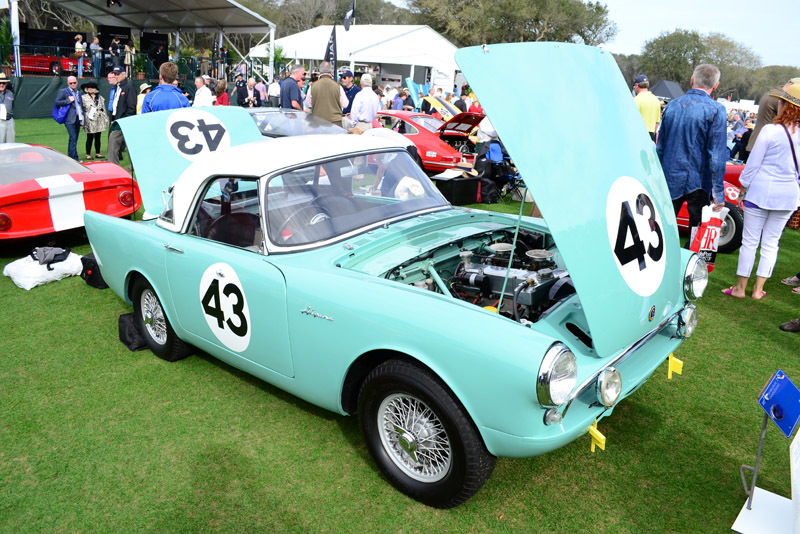 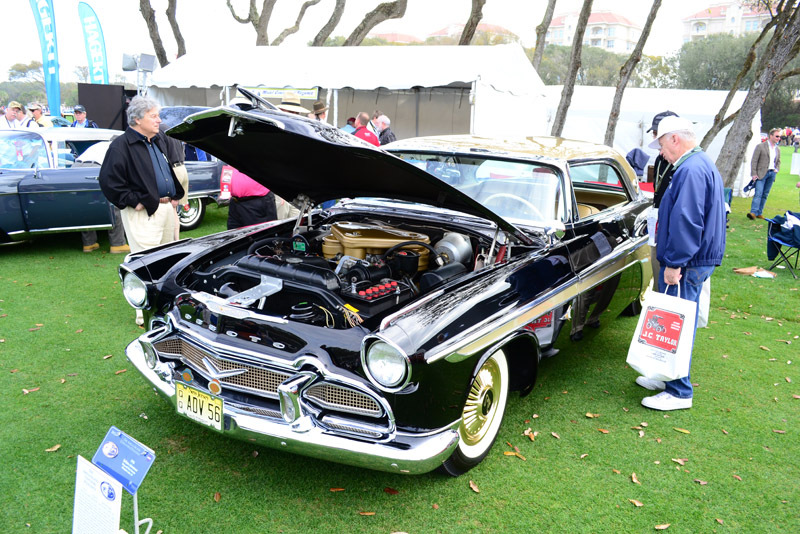 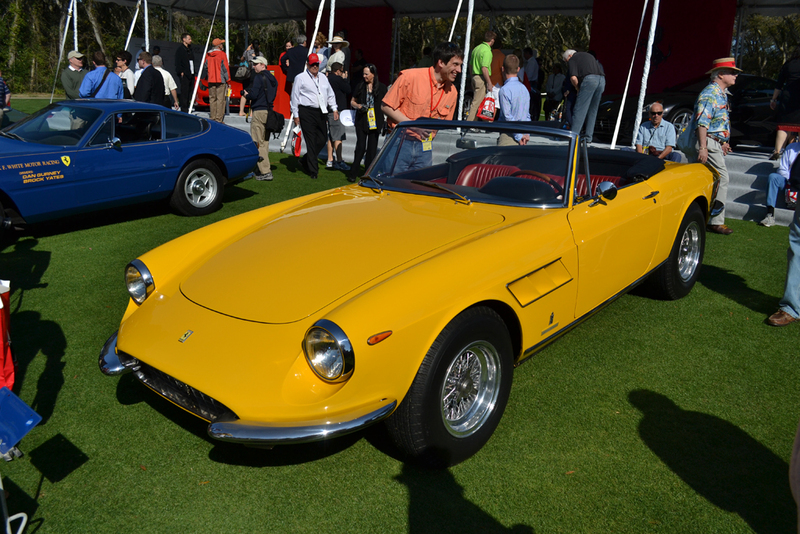 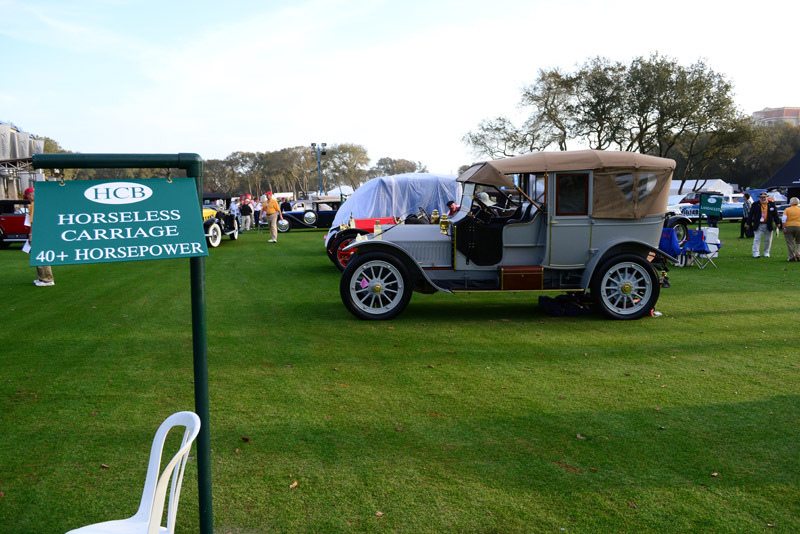 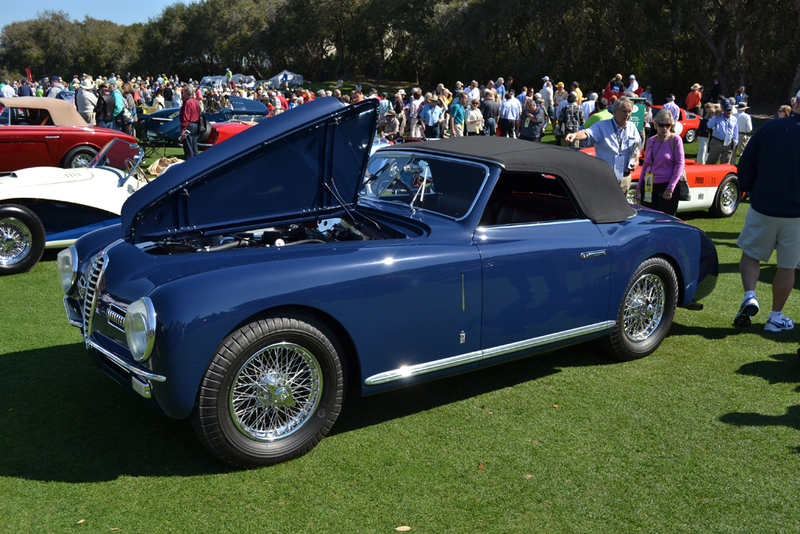 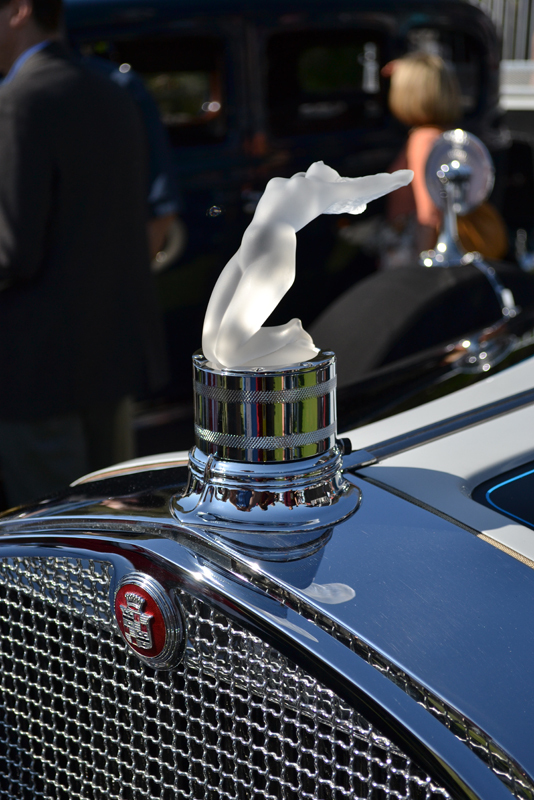 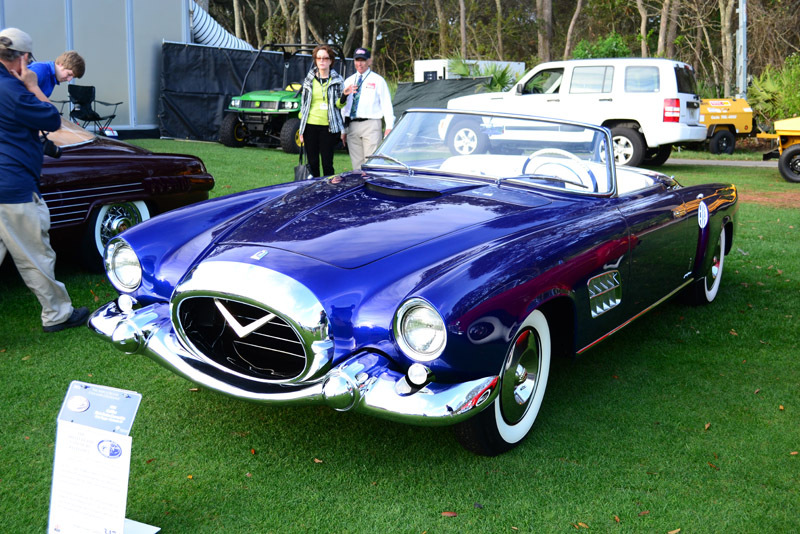 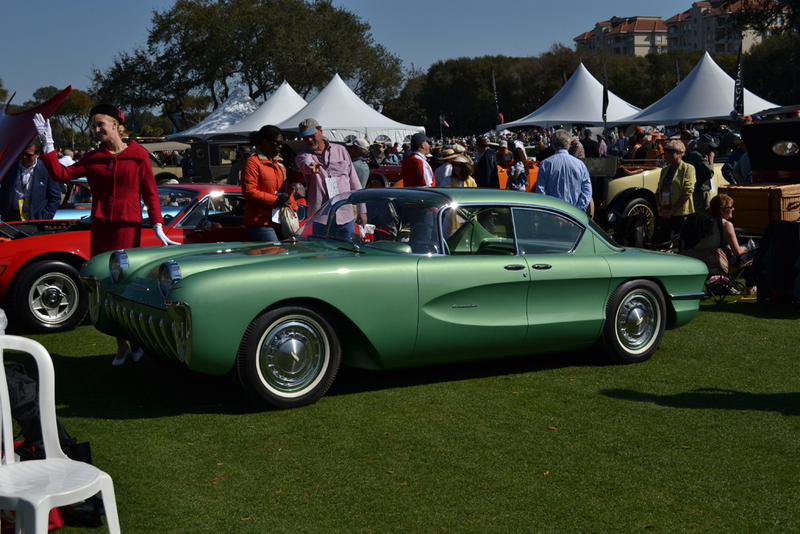 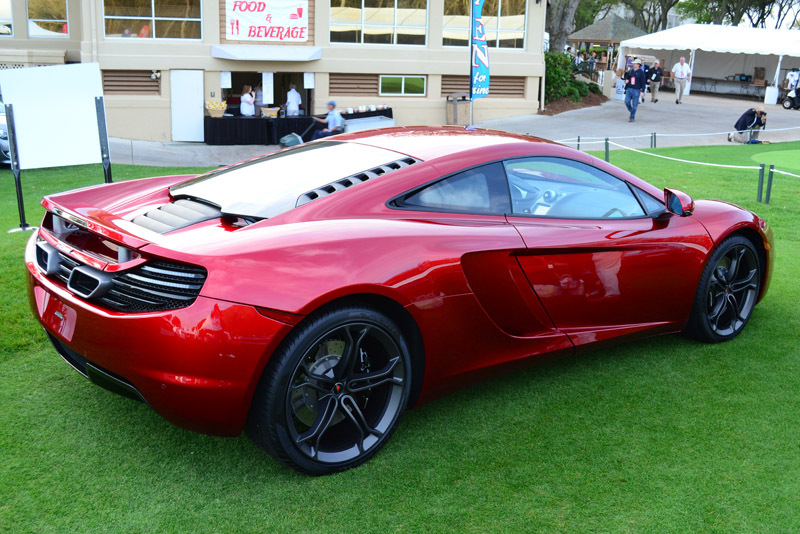 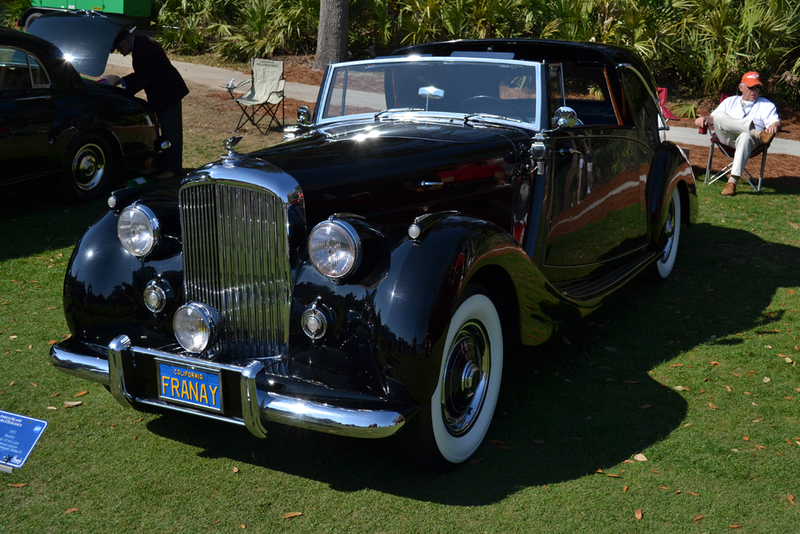 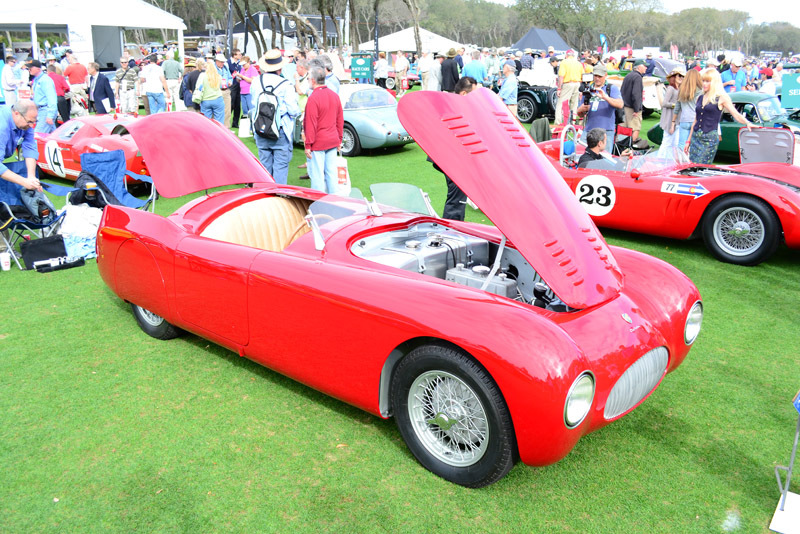 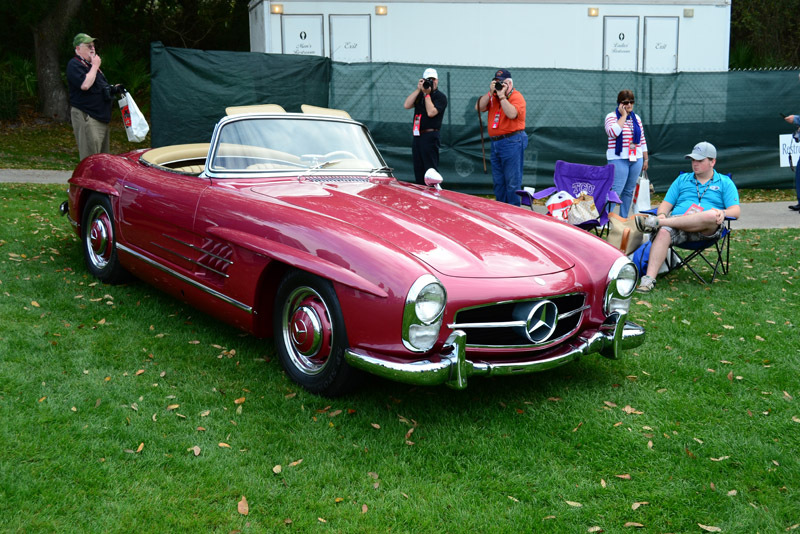 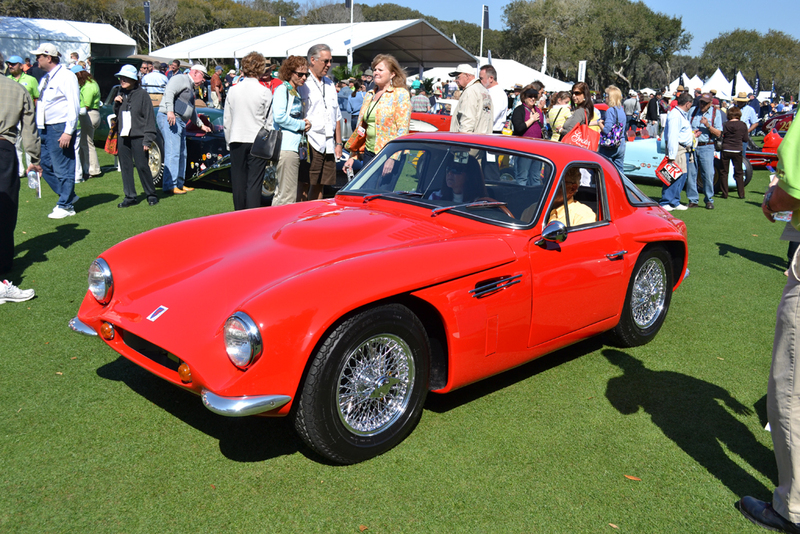 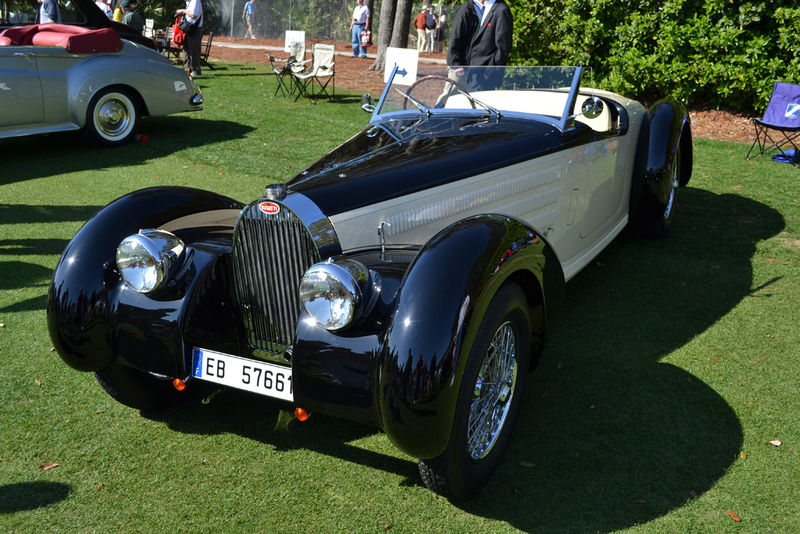 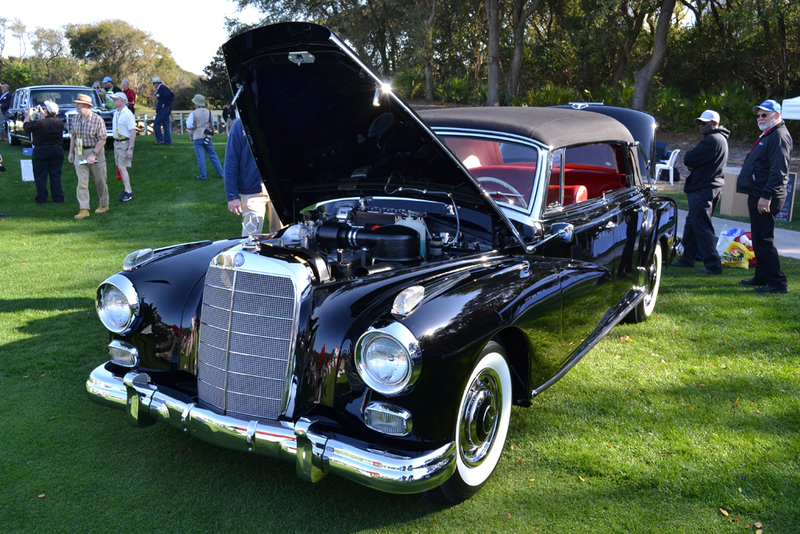 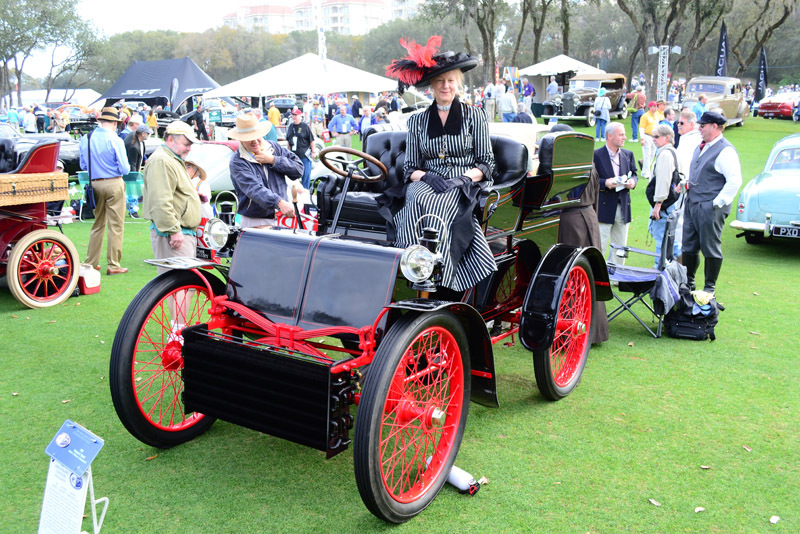 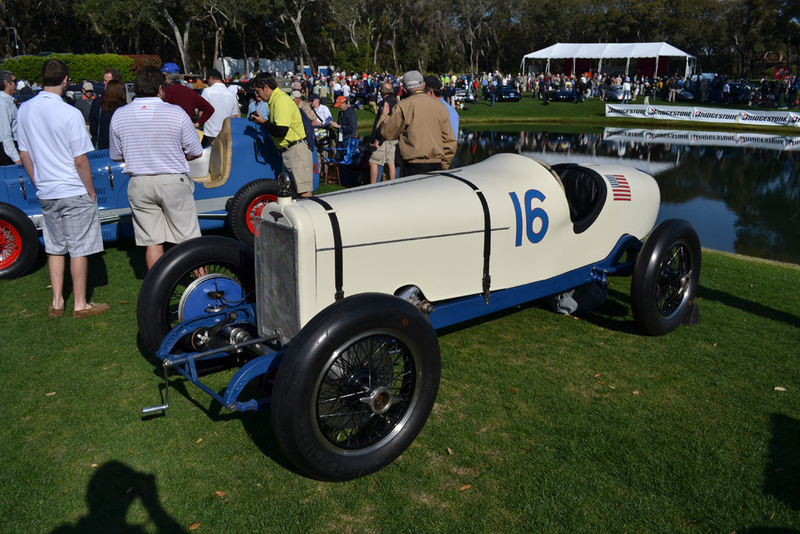 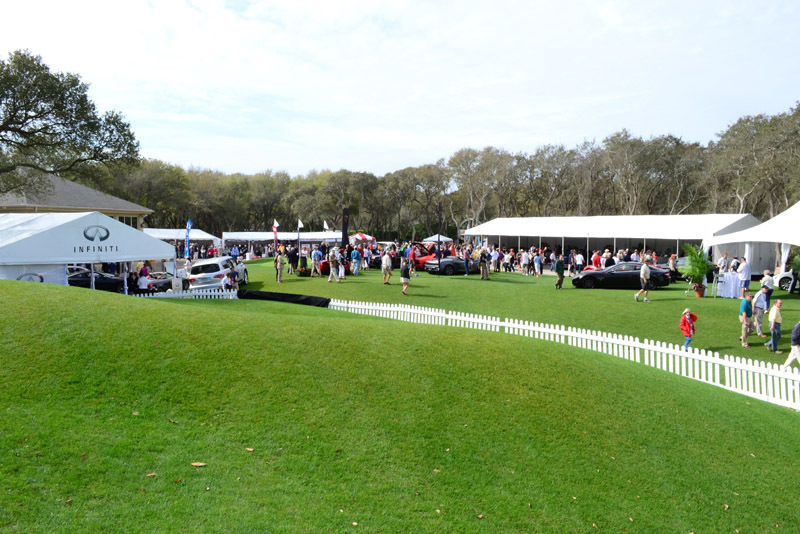 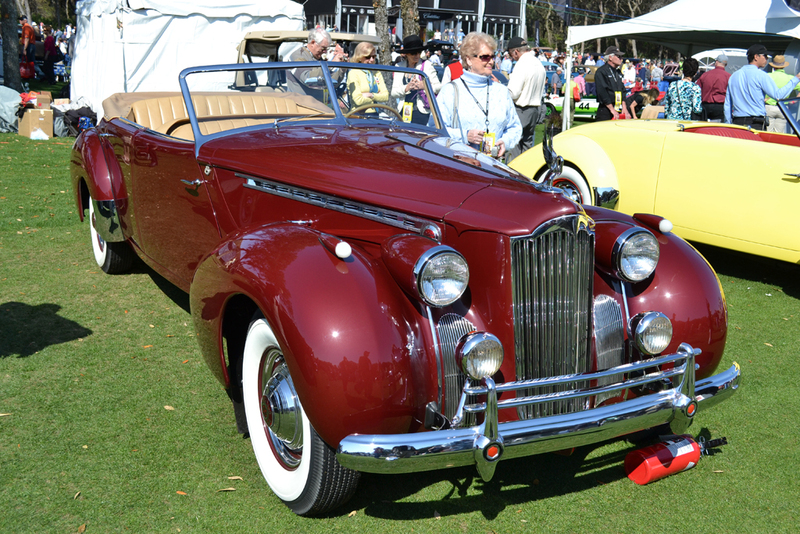 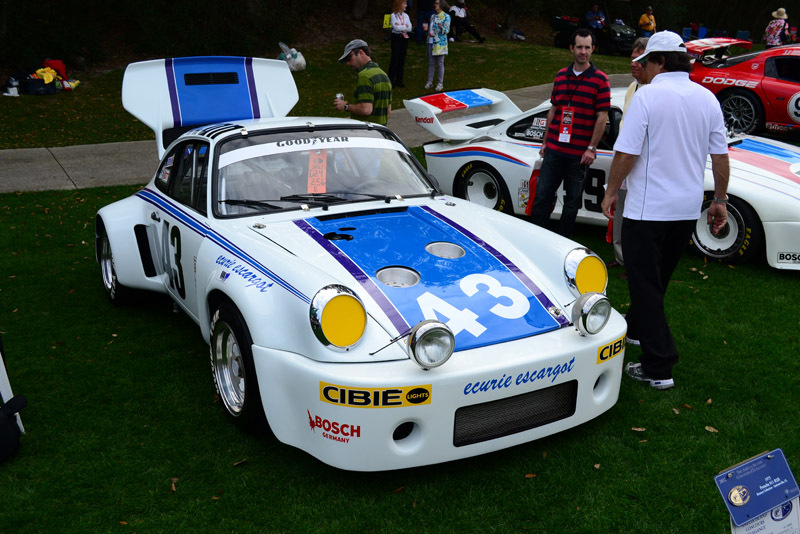 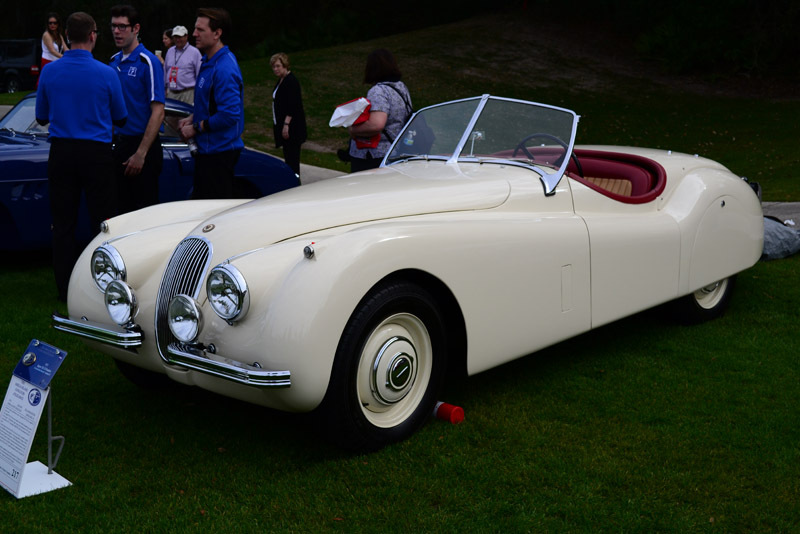 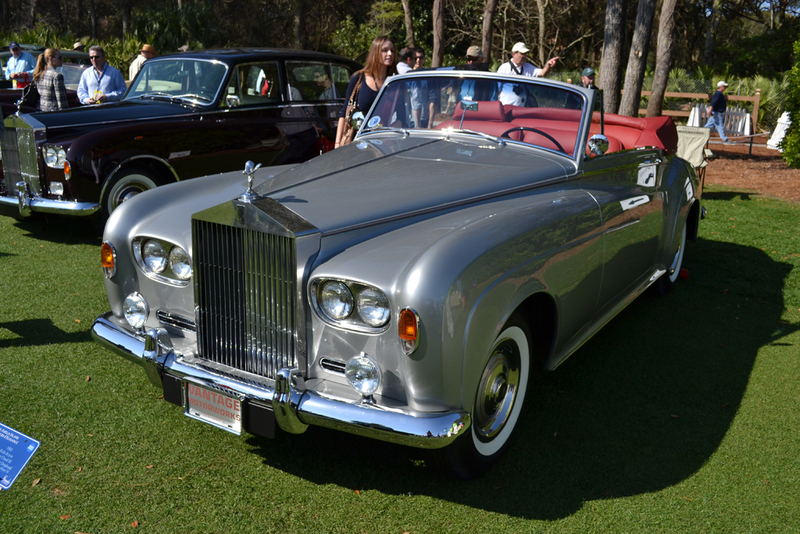 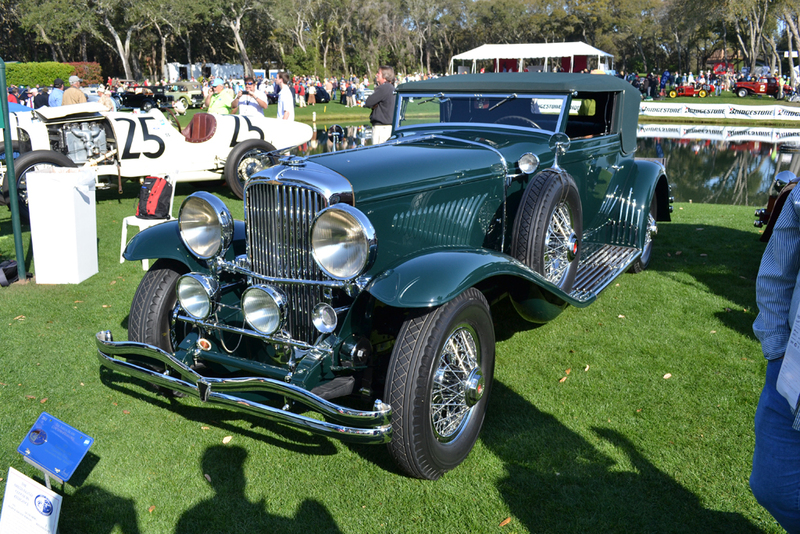 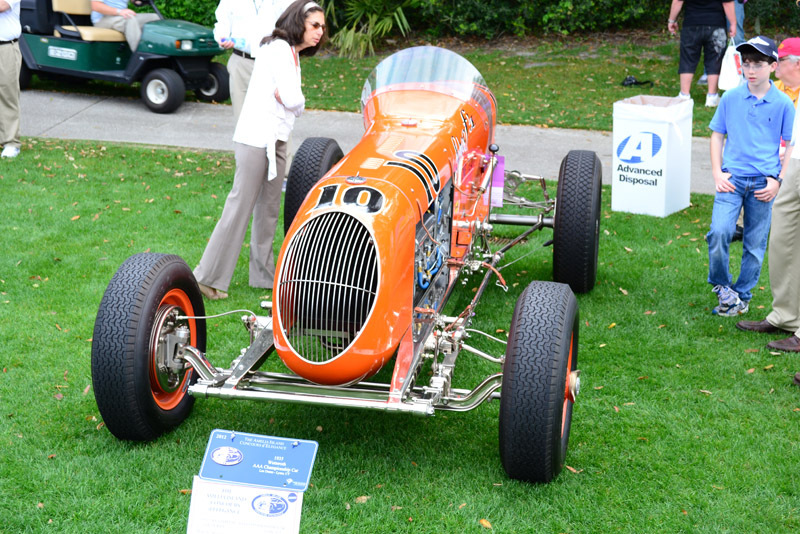 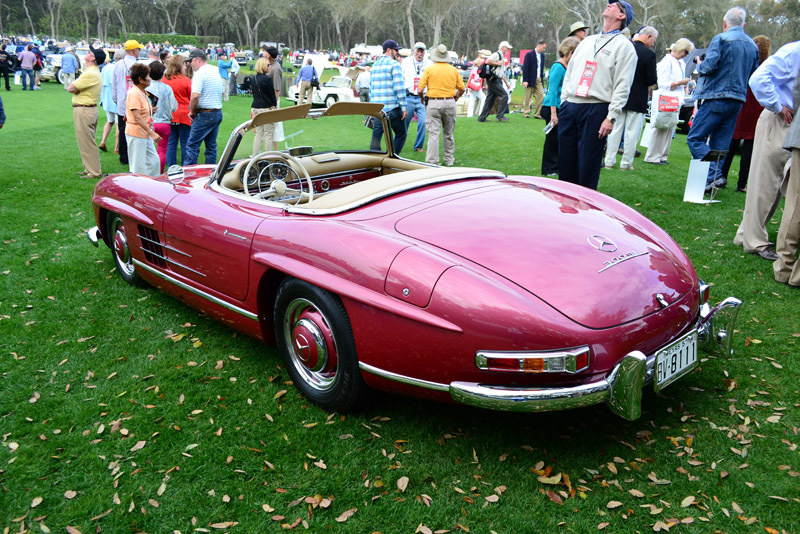 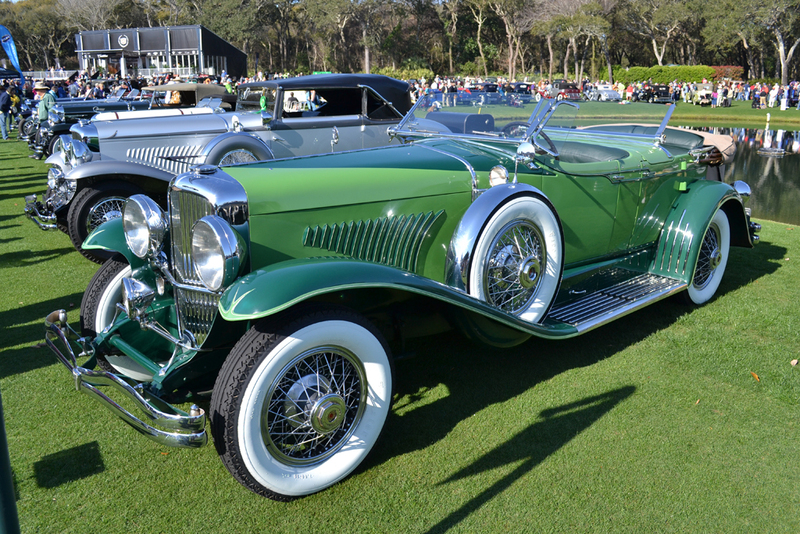 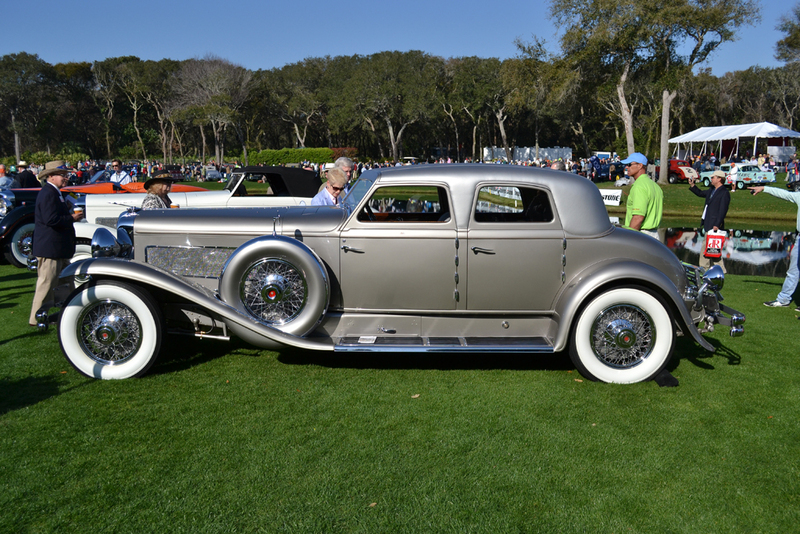 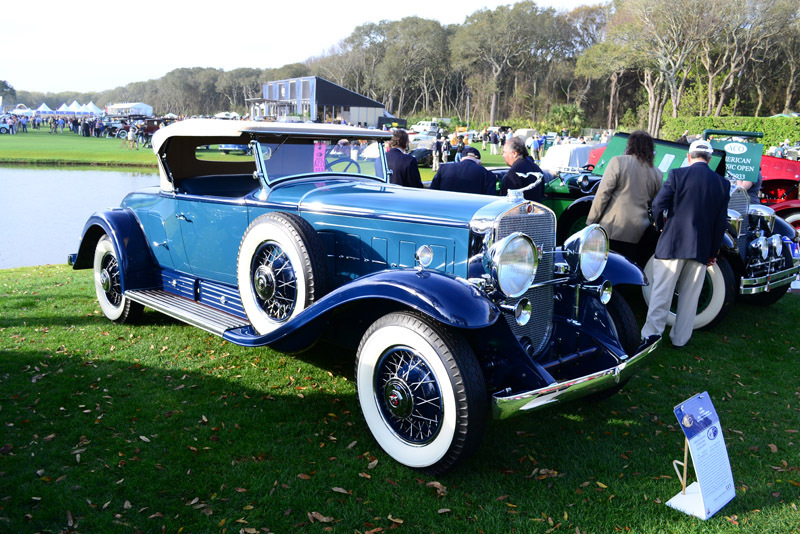 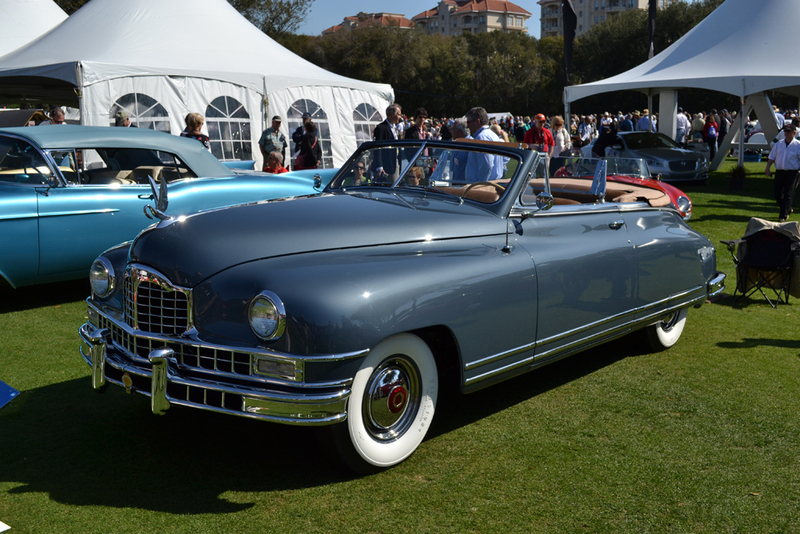 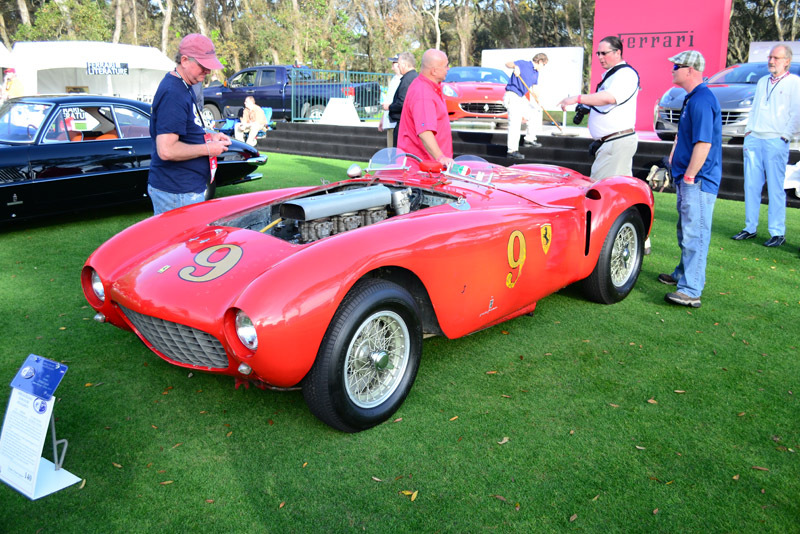 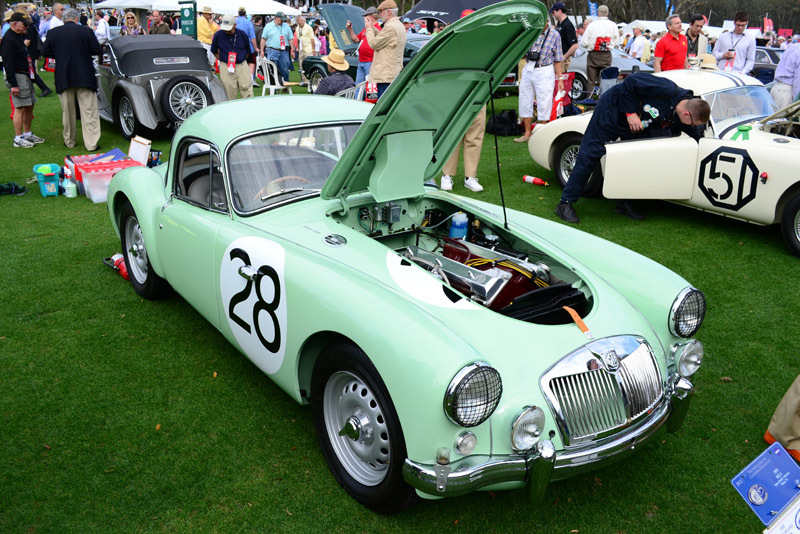 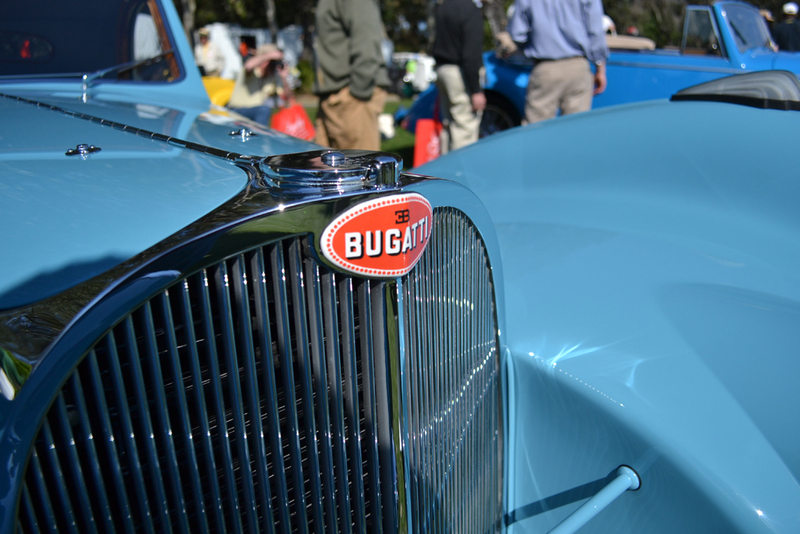 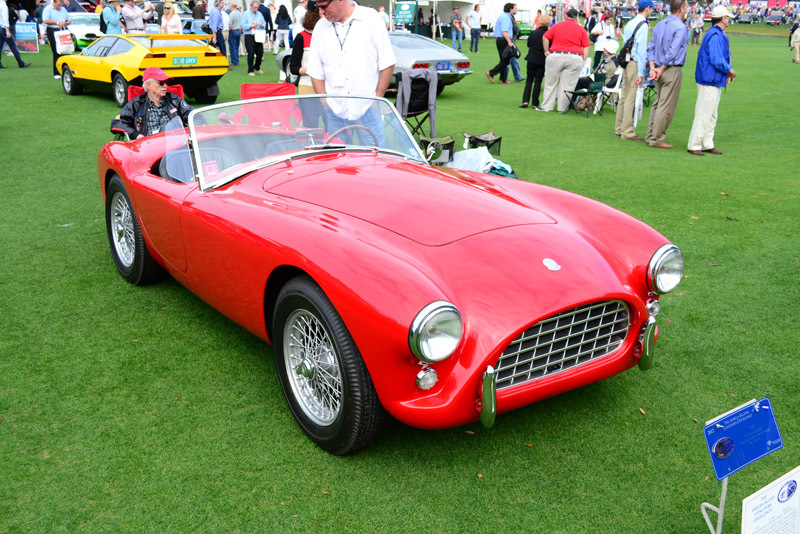 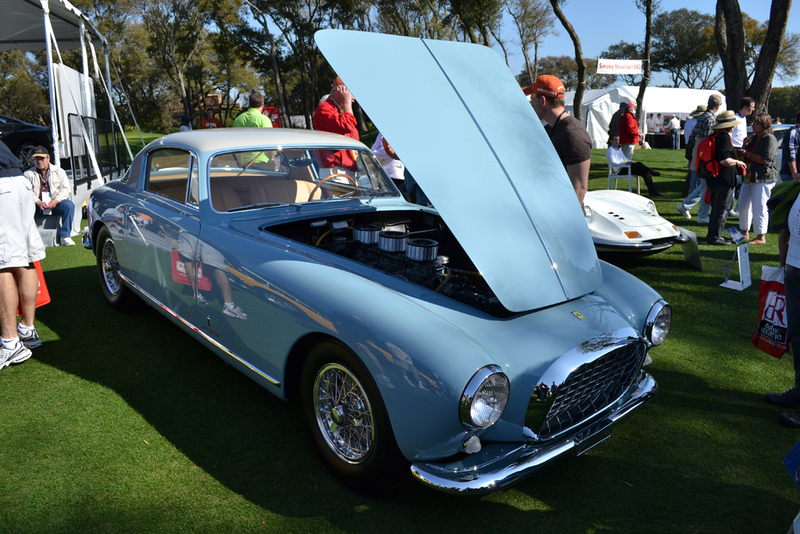 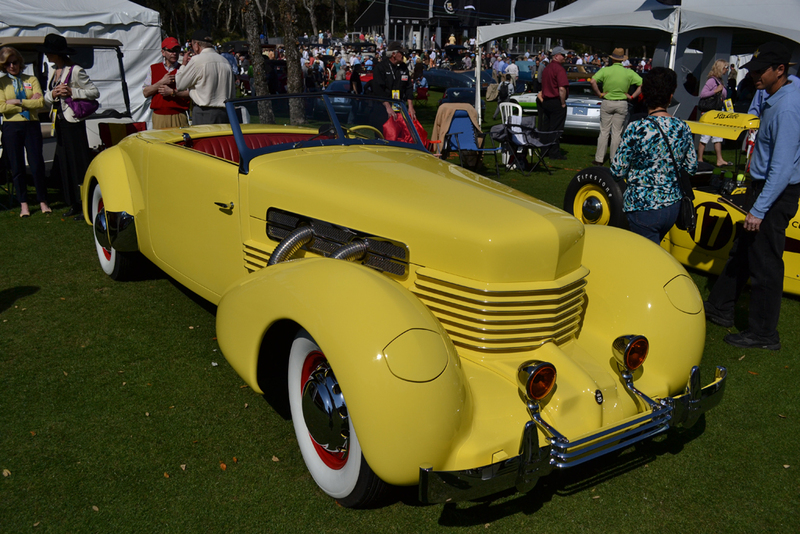 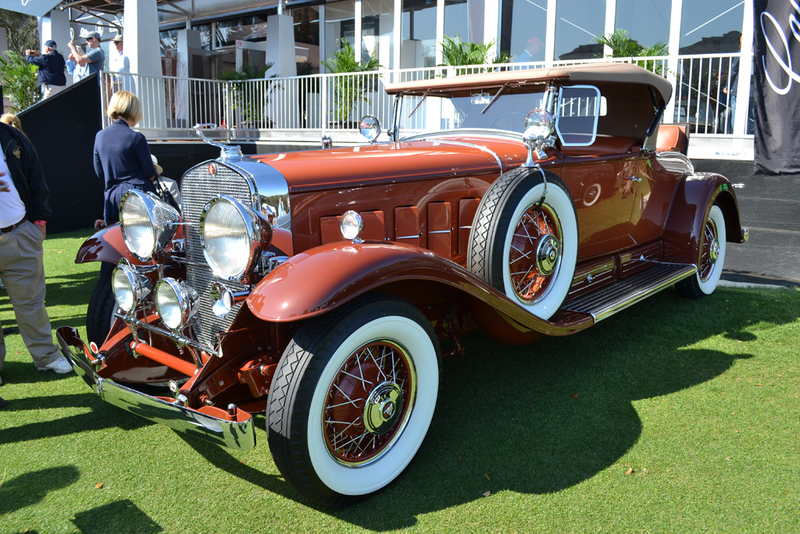 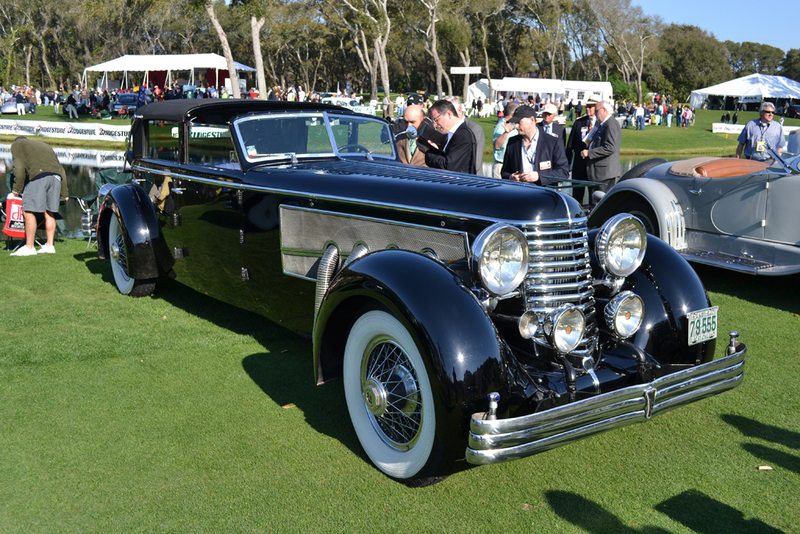 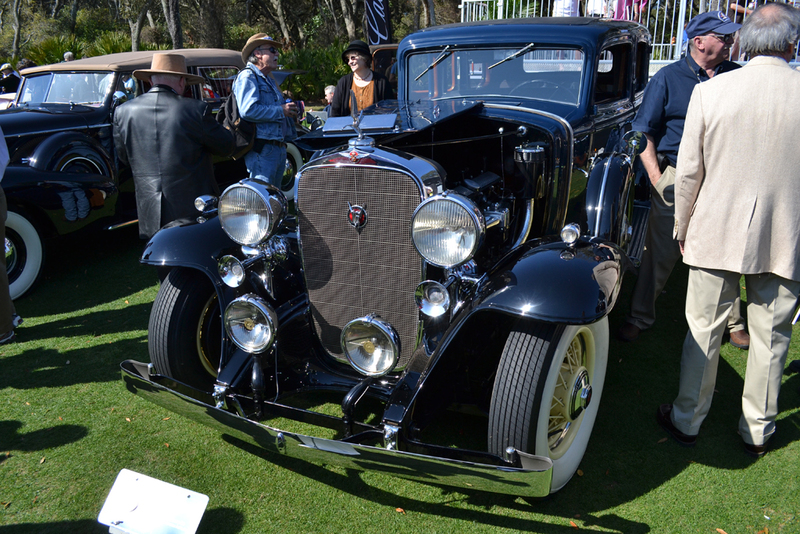 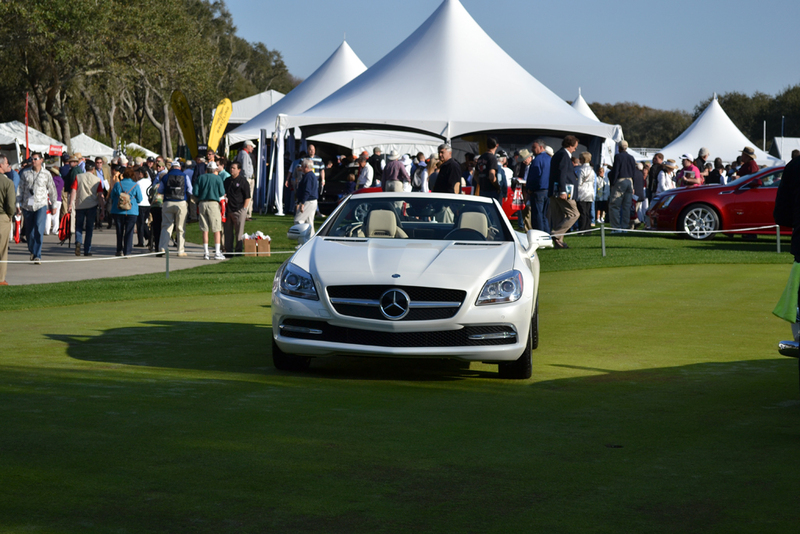 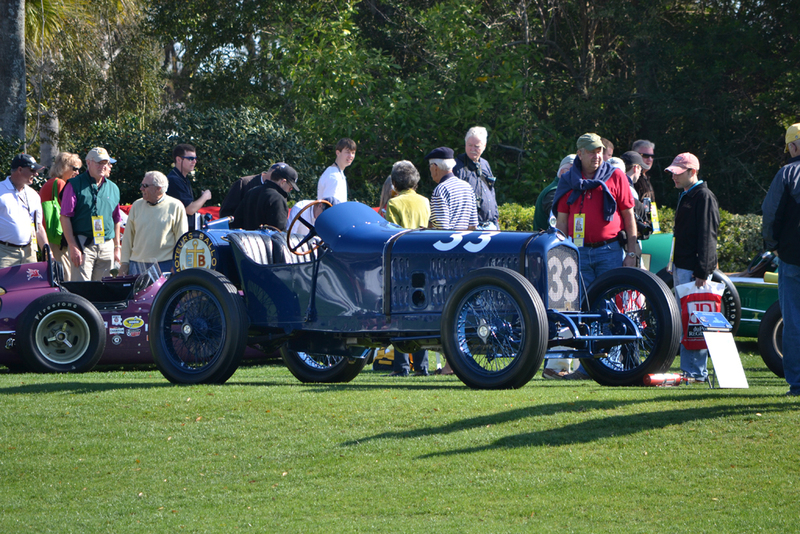 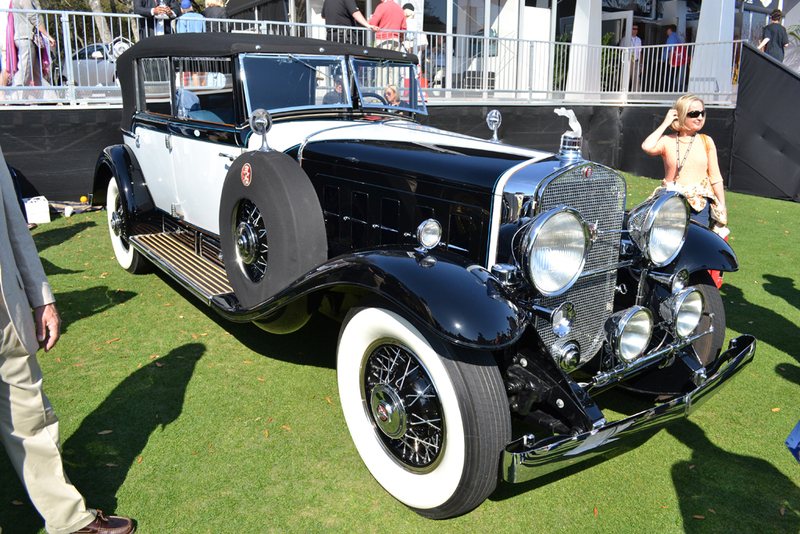 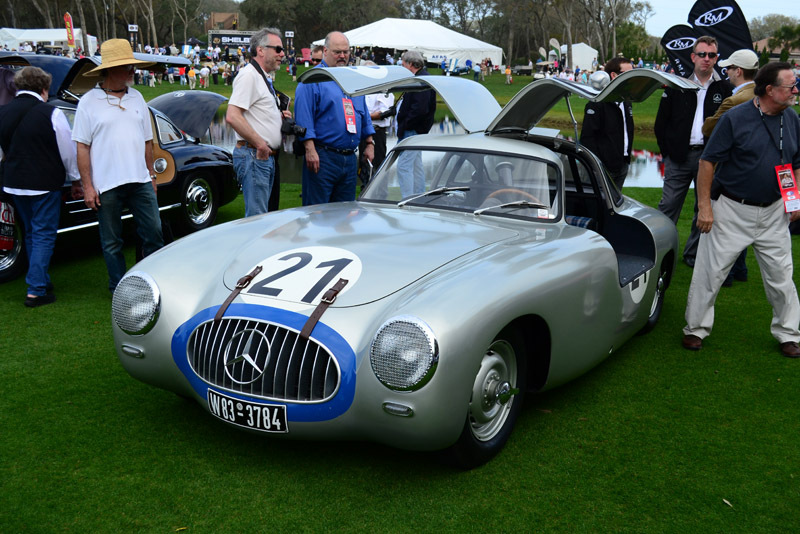 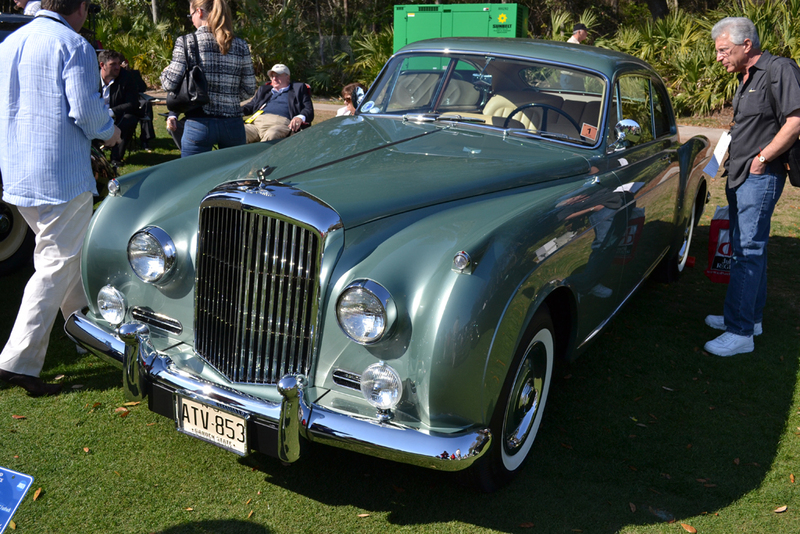 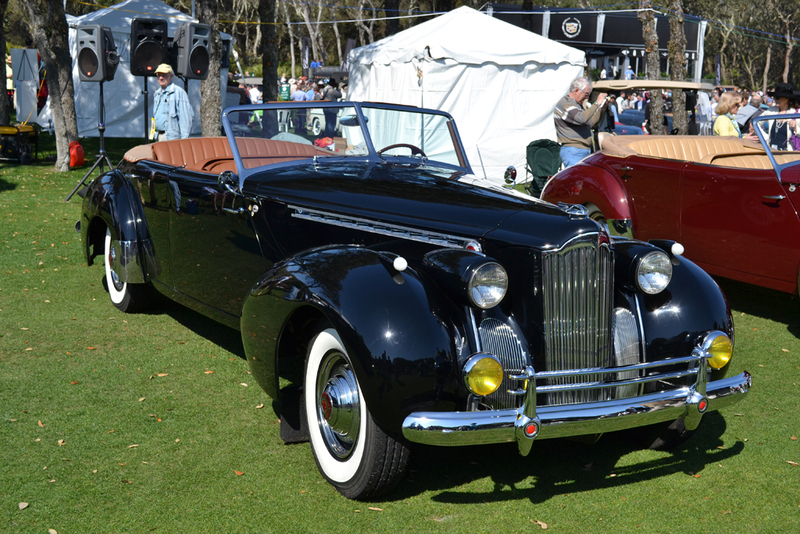 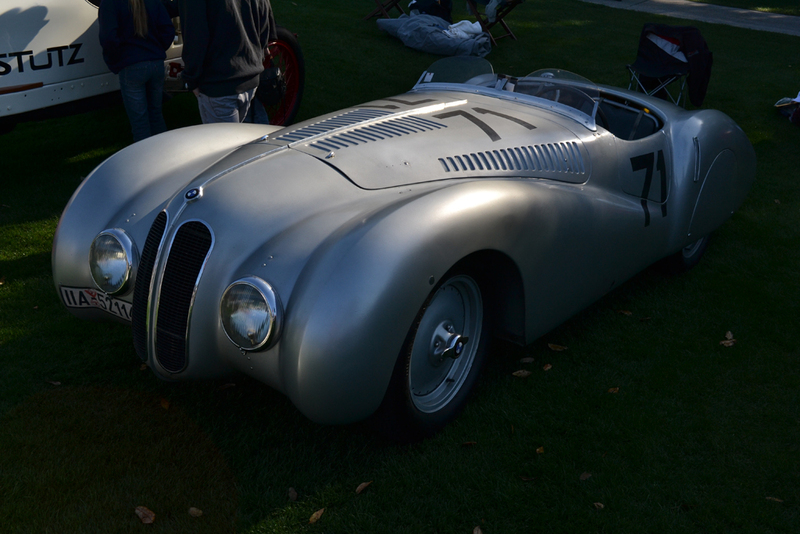 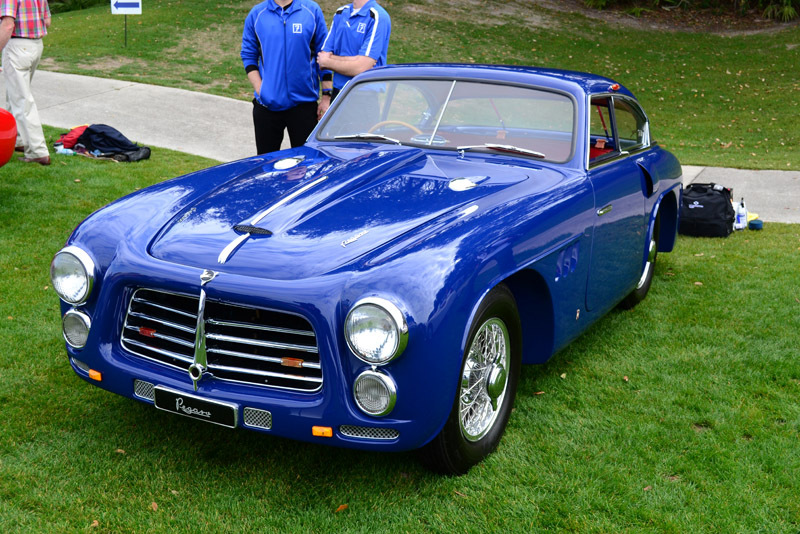 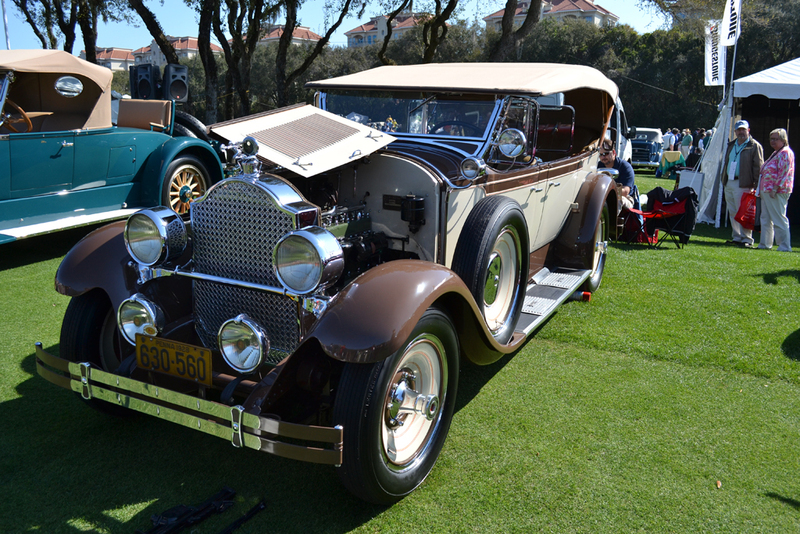 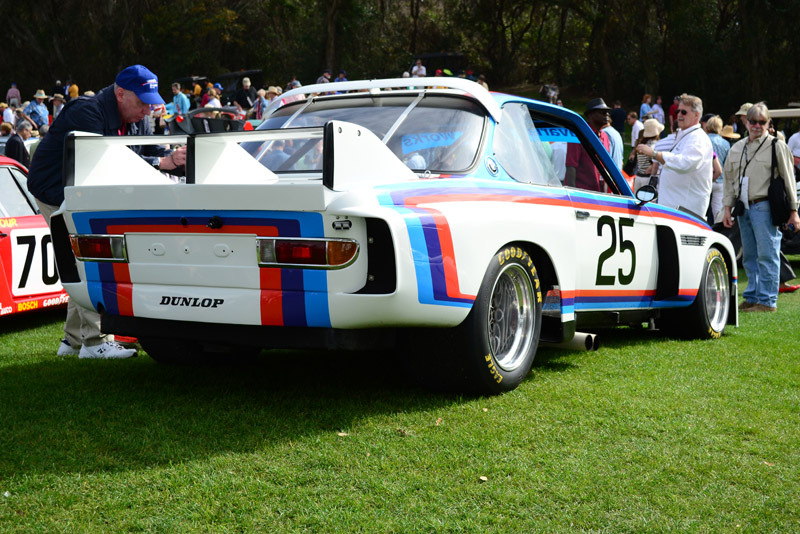 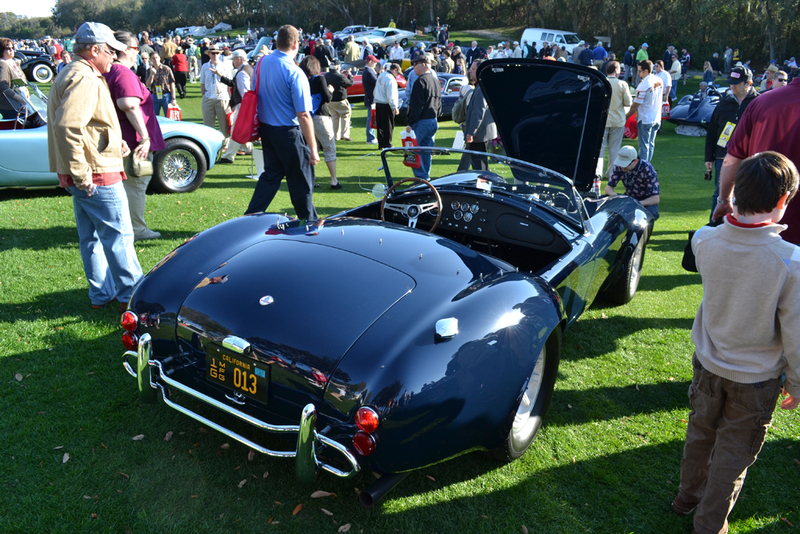 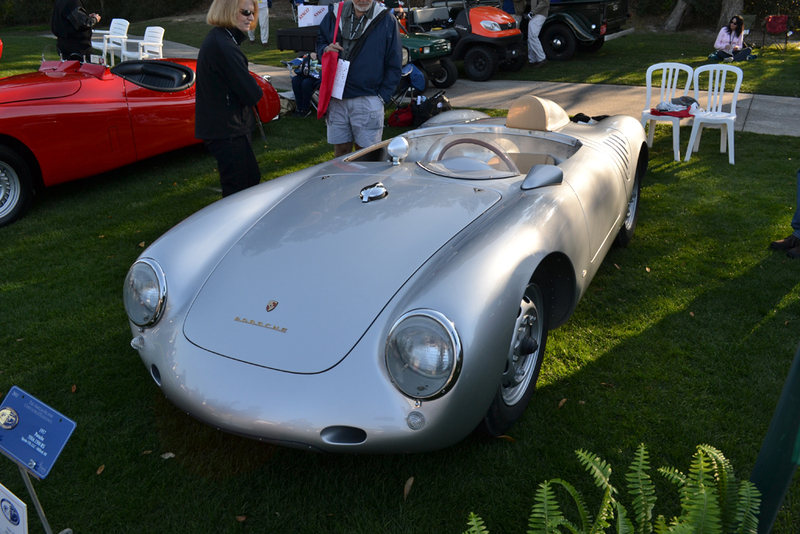 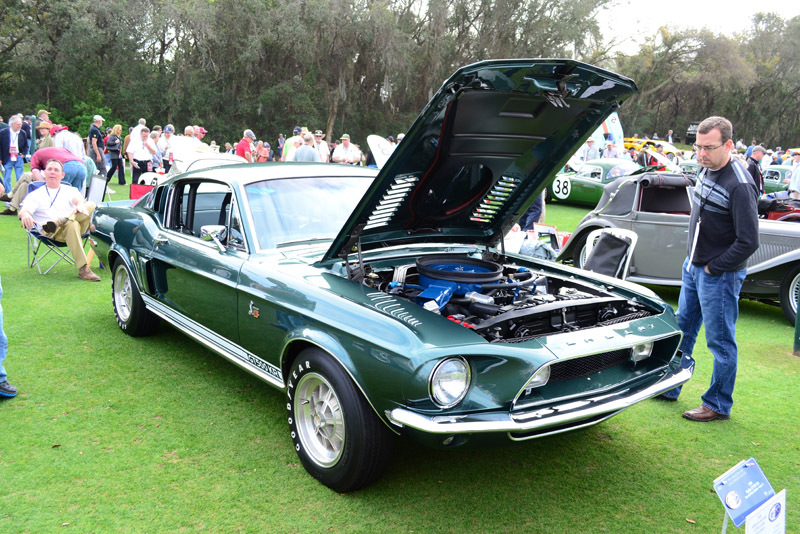 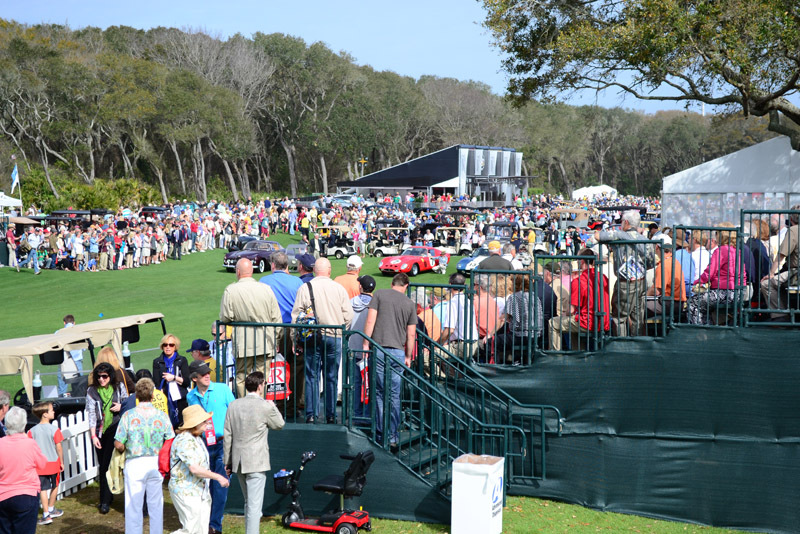 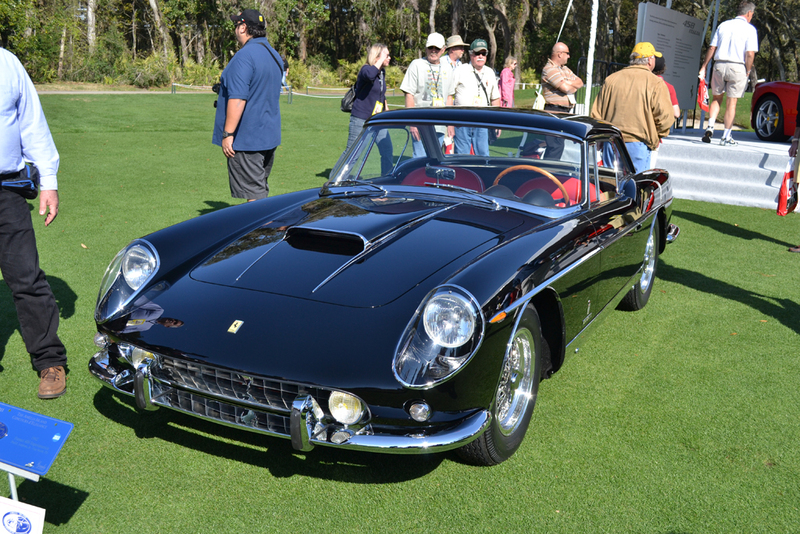 This year’s Amelia Island Concours d’Elegance was a big hit. 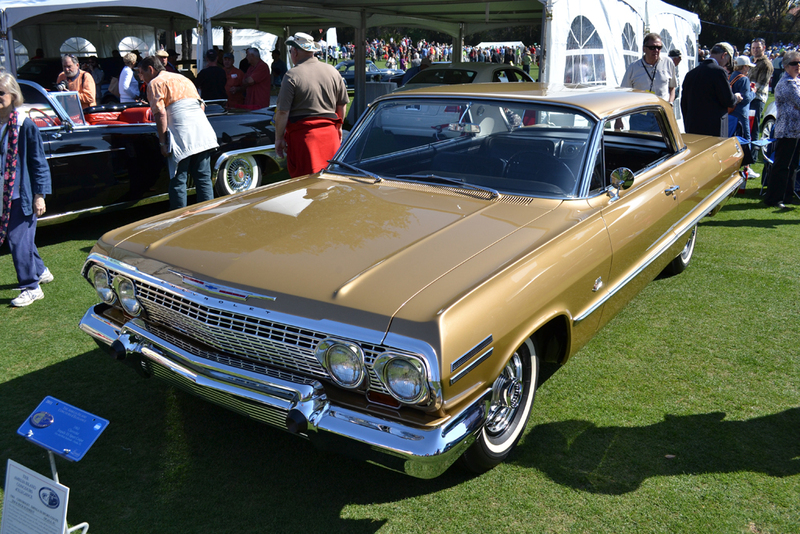 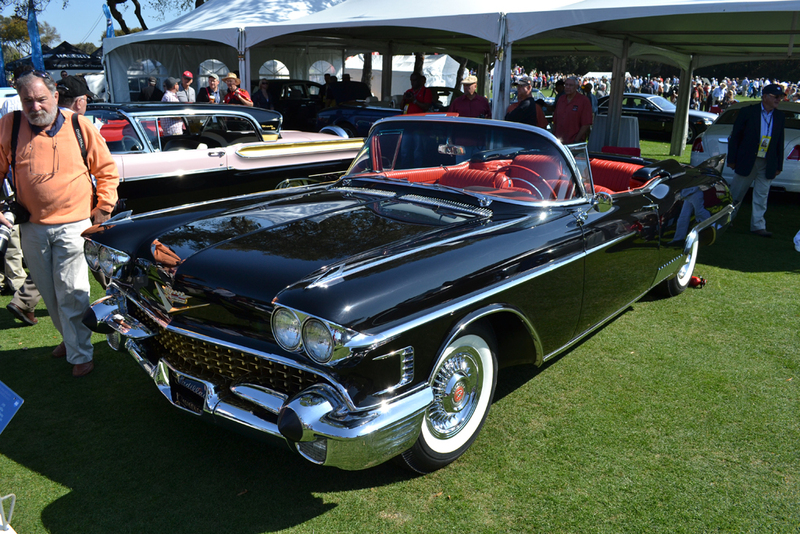 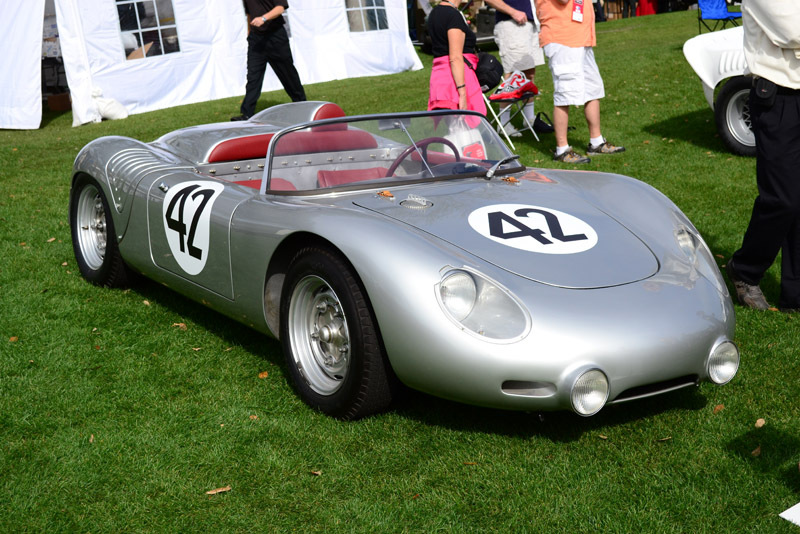 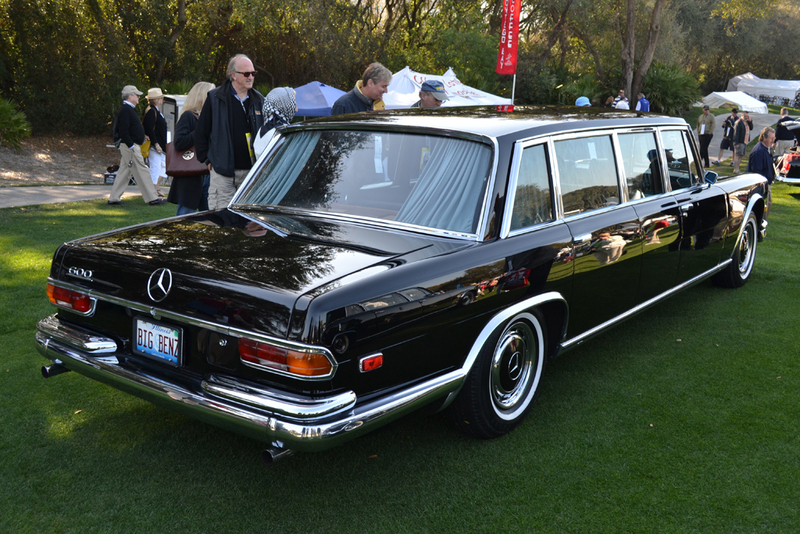 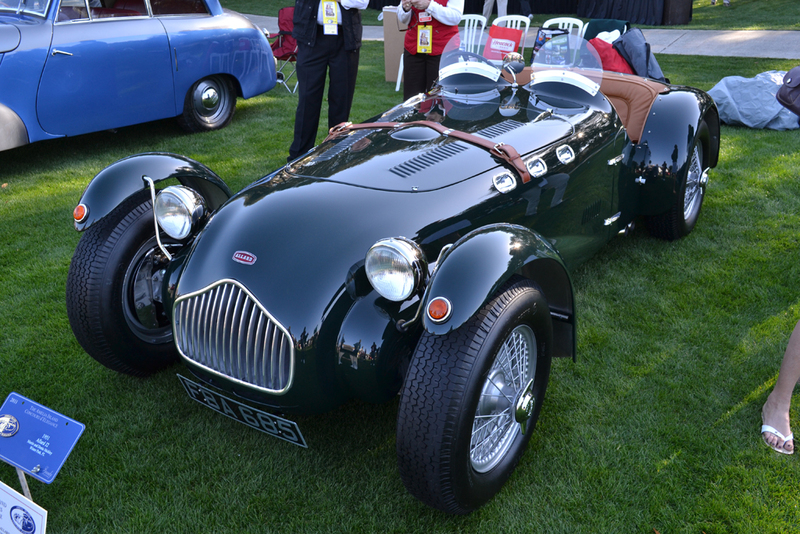 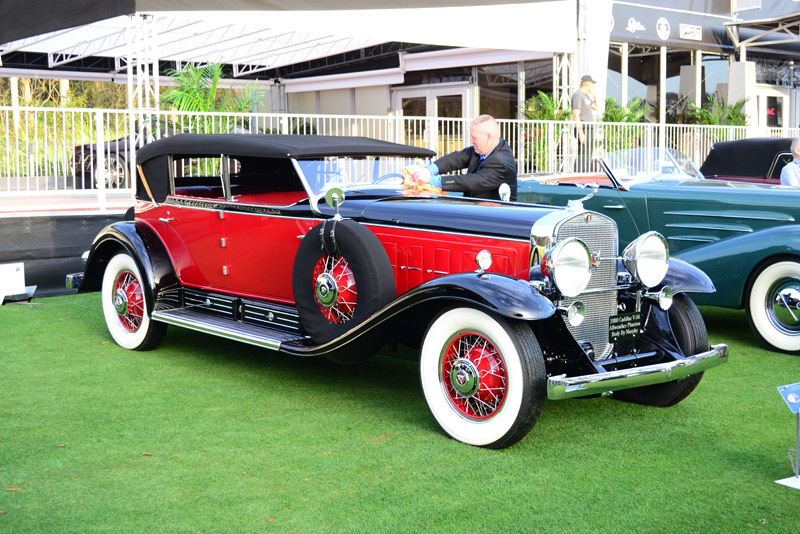 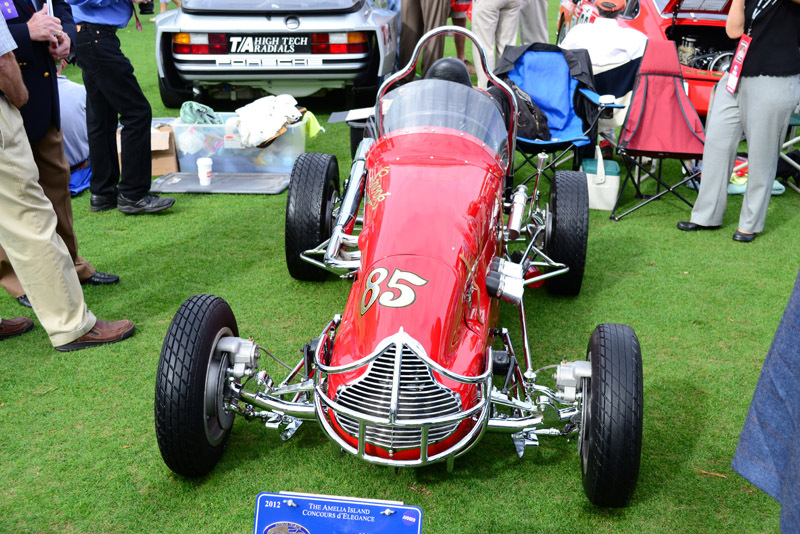 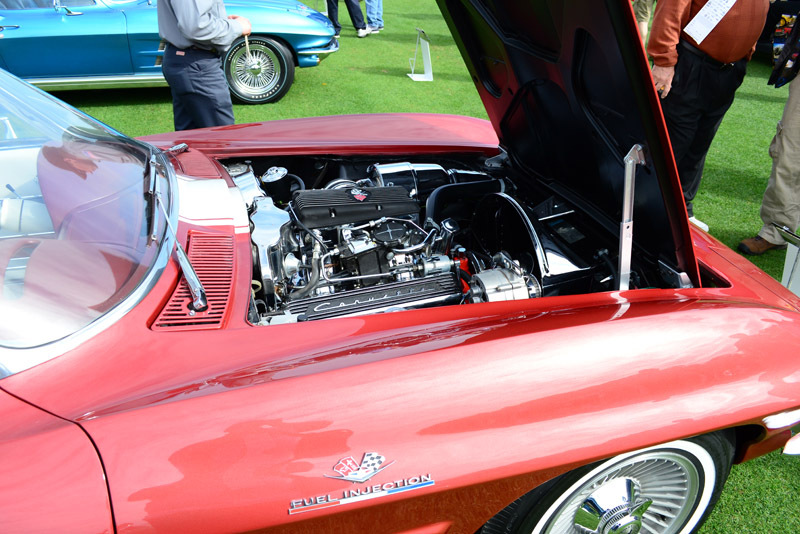 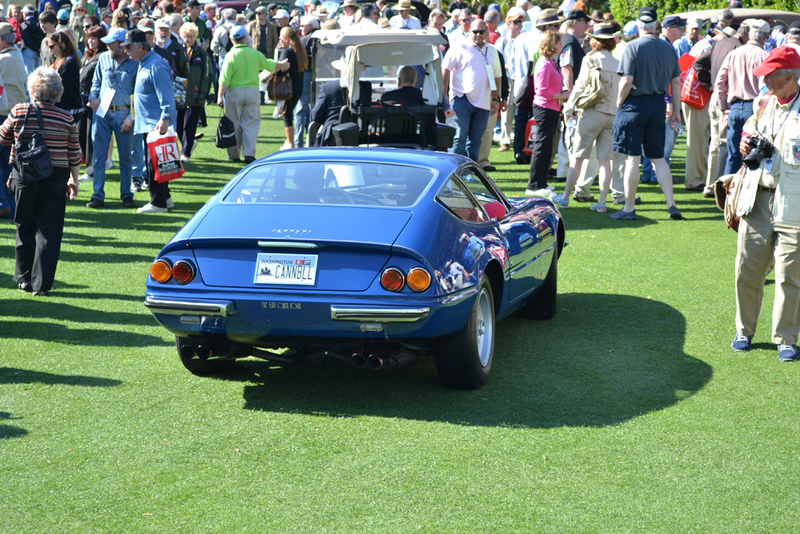 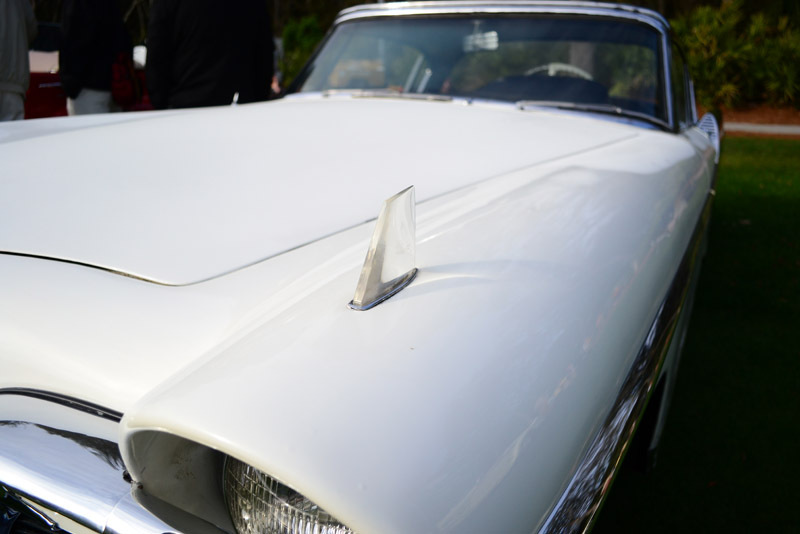 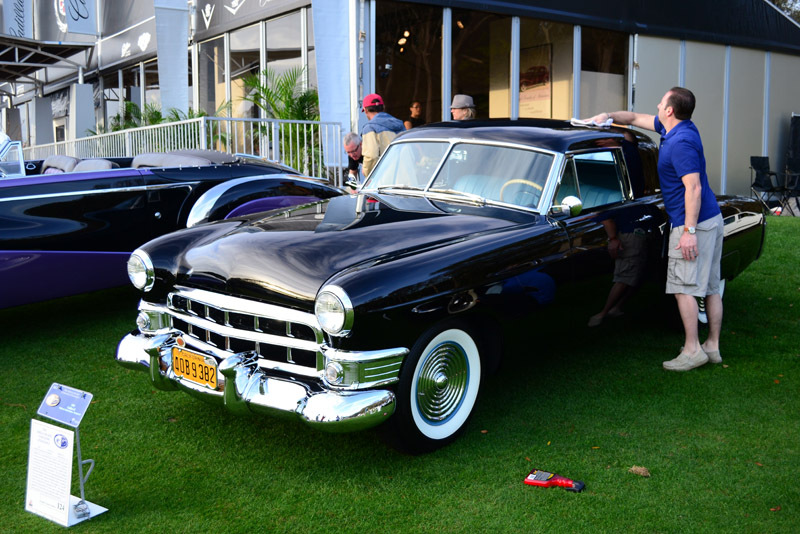 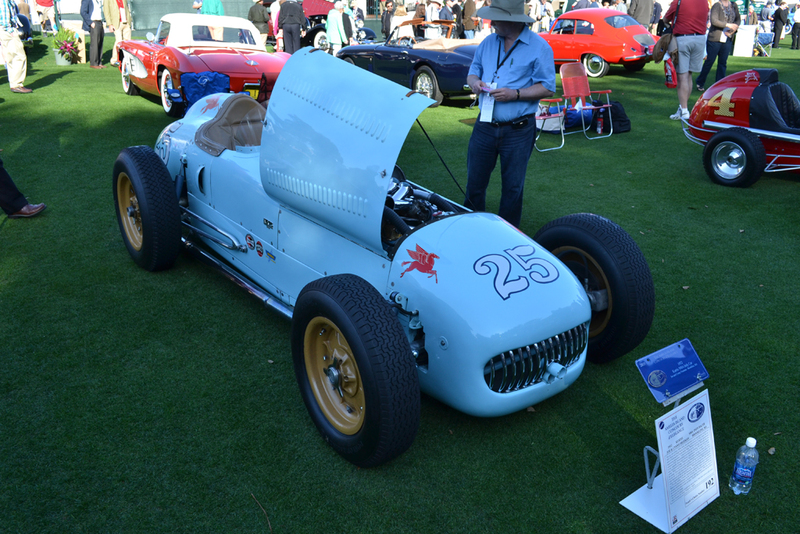 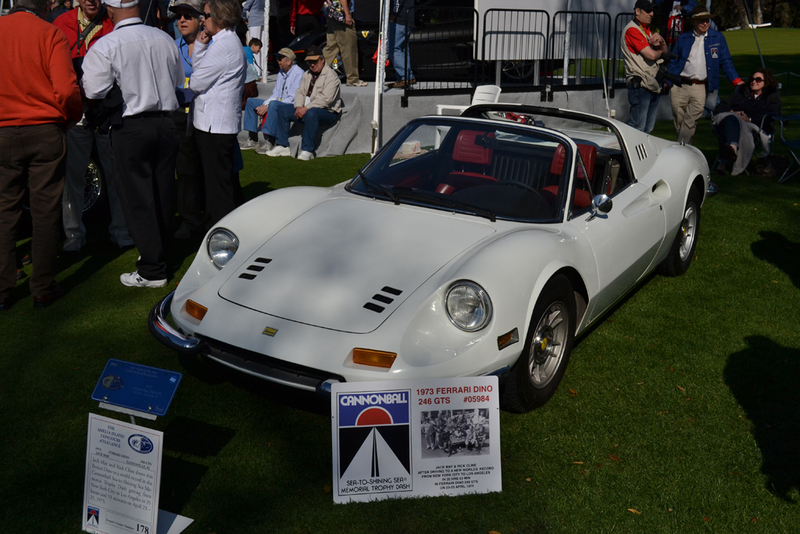 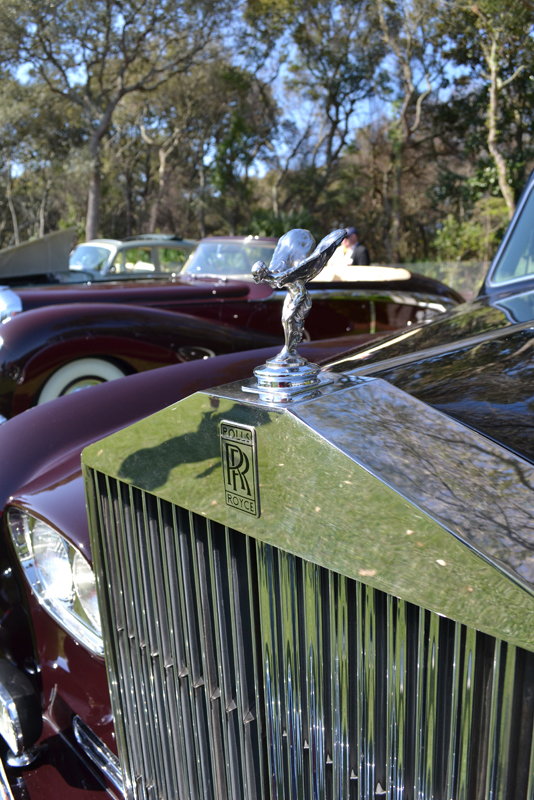 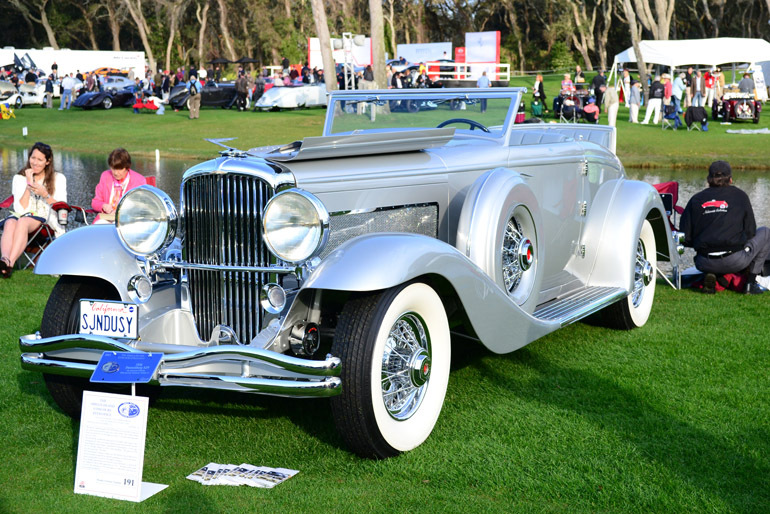 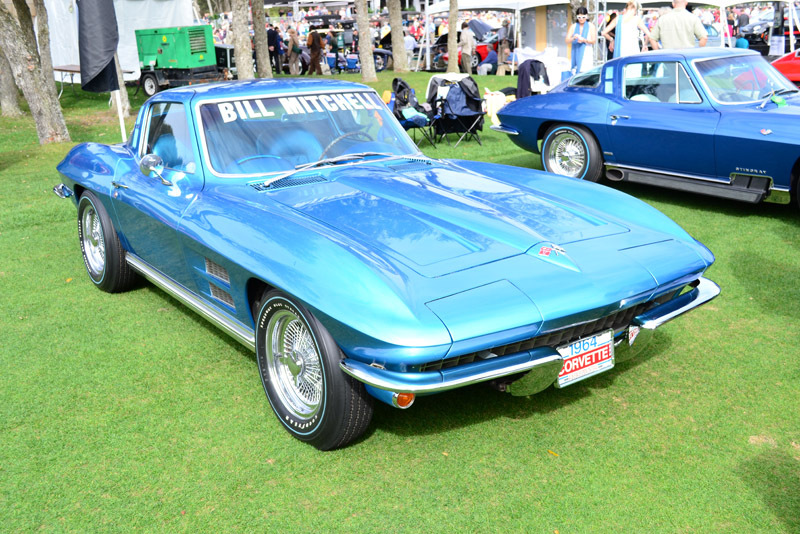 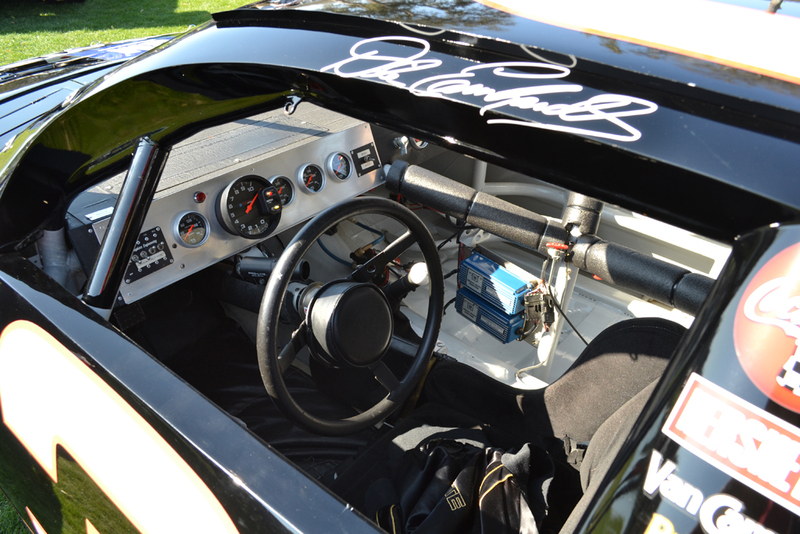 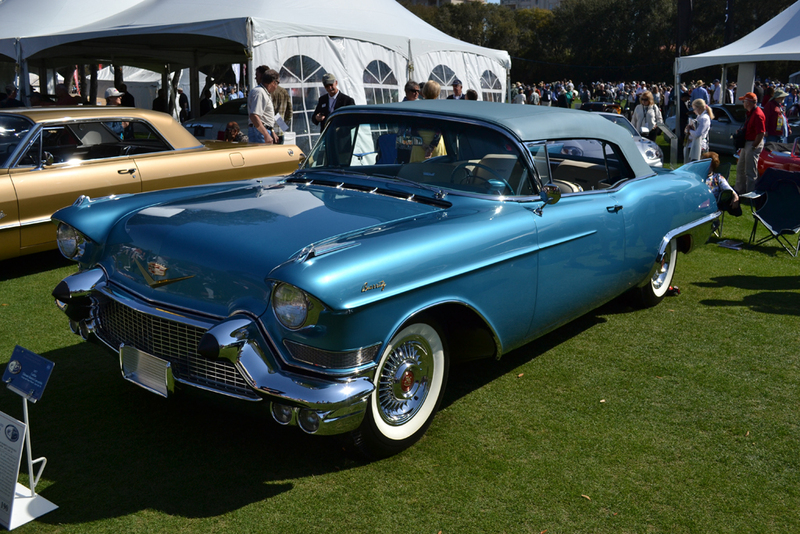 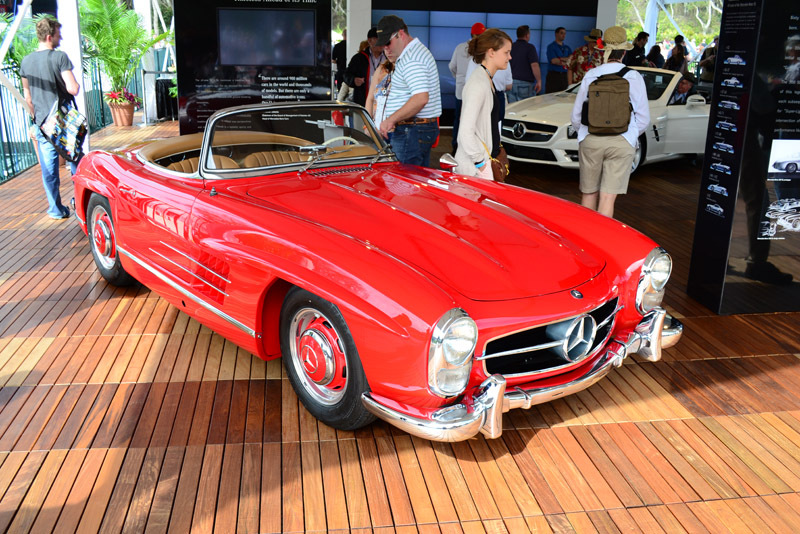 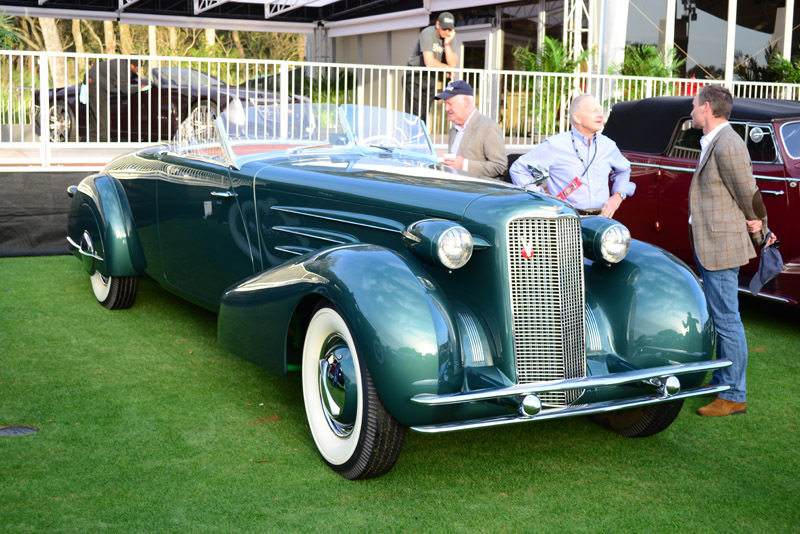 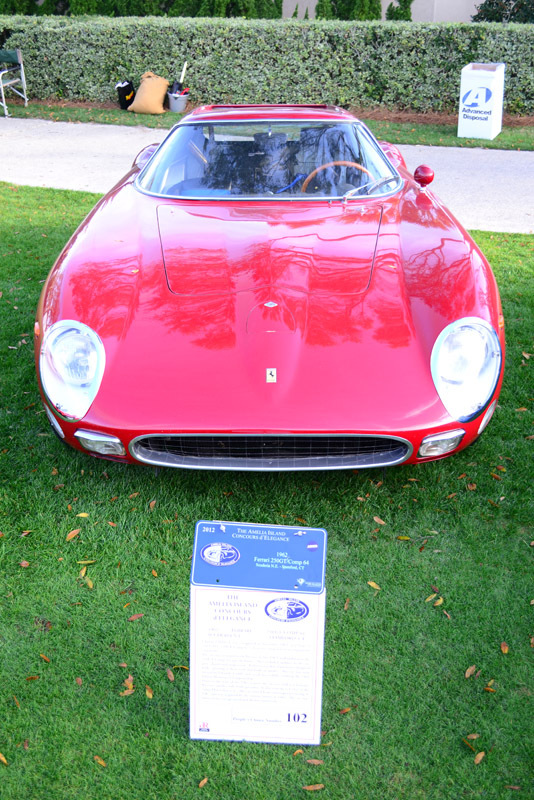 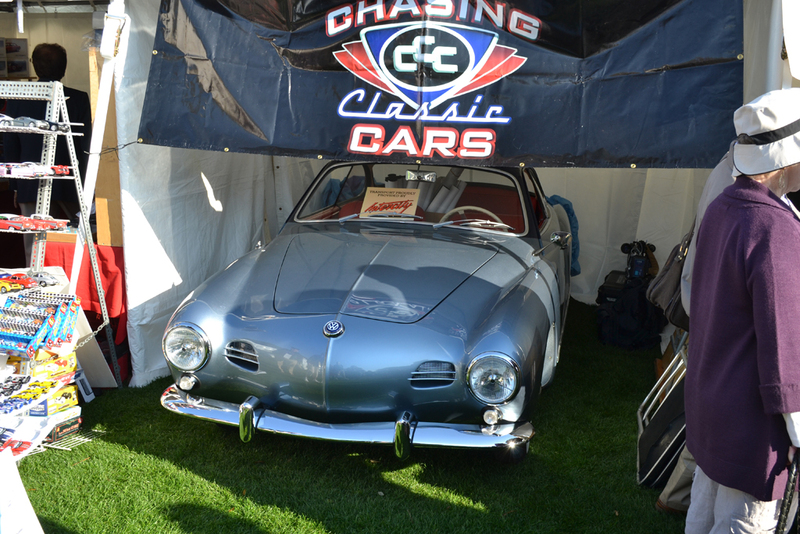 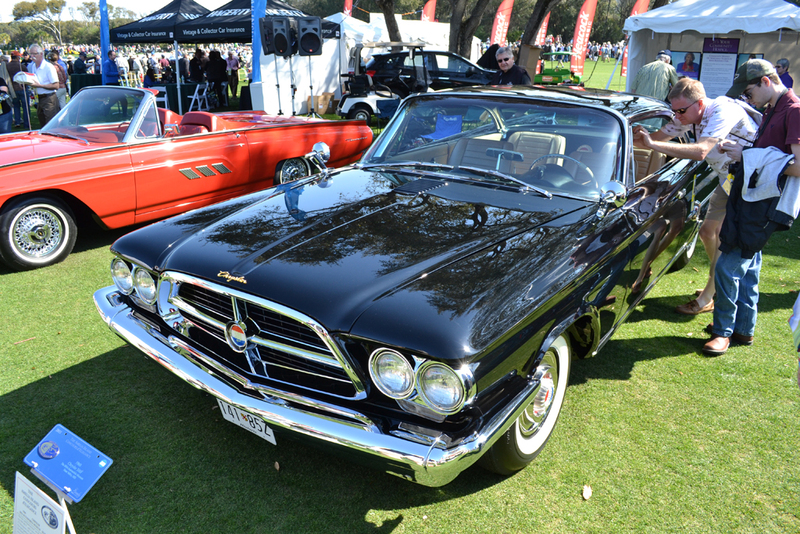 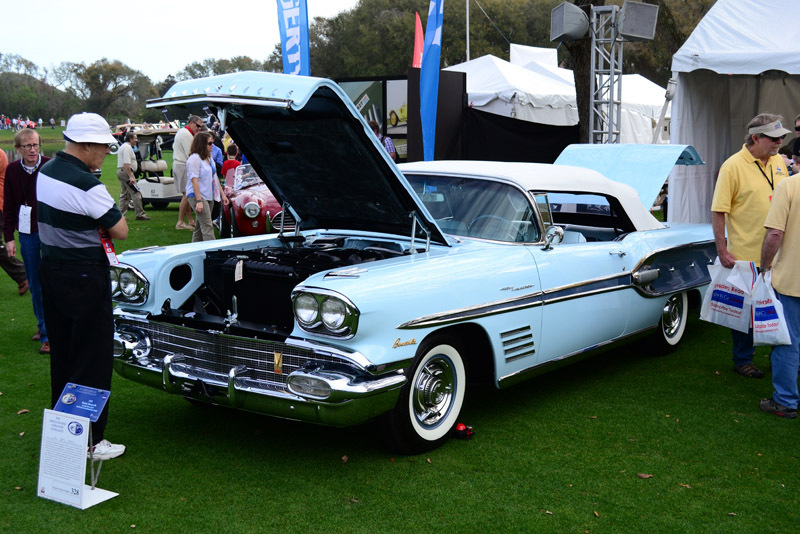 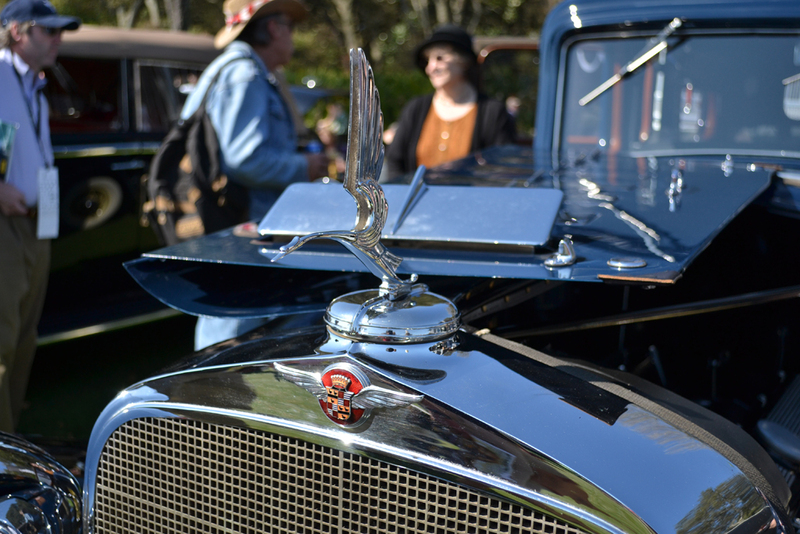 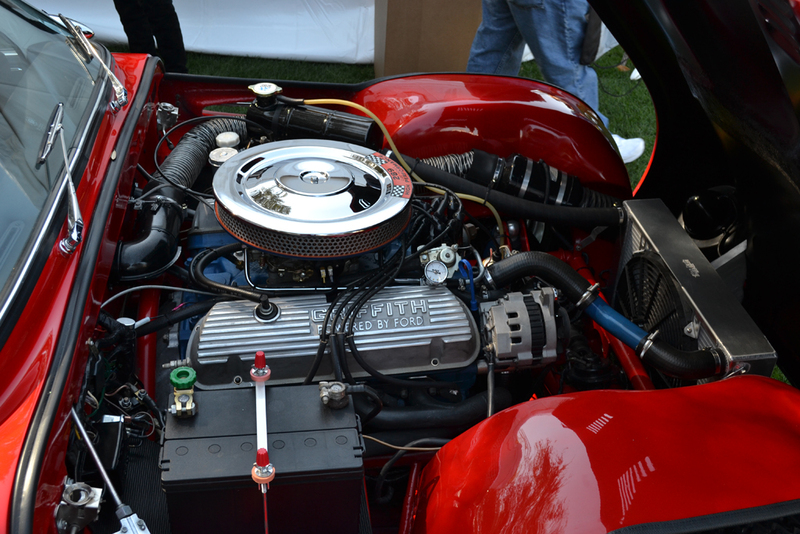 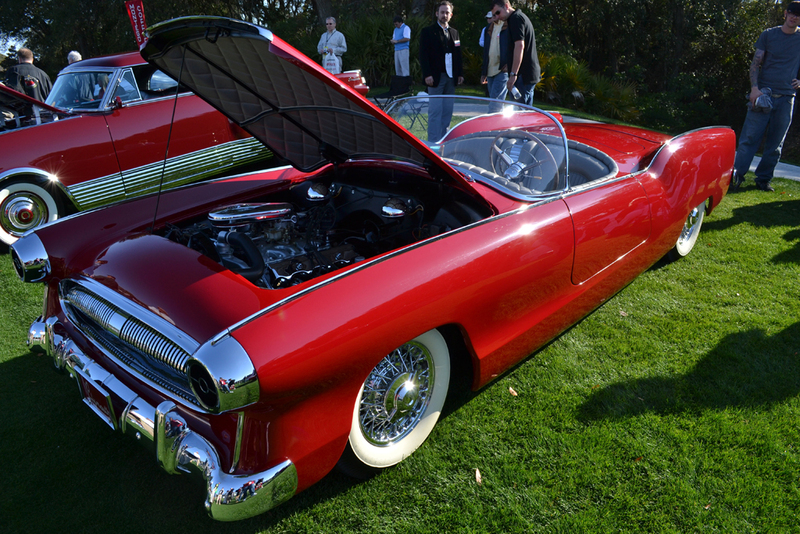 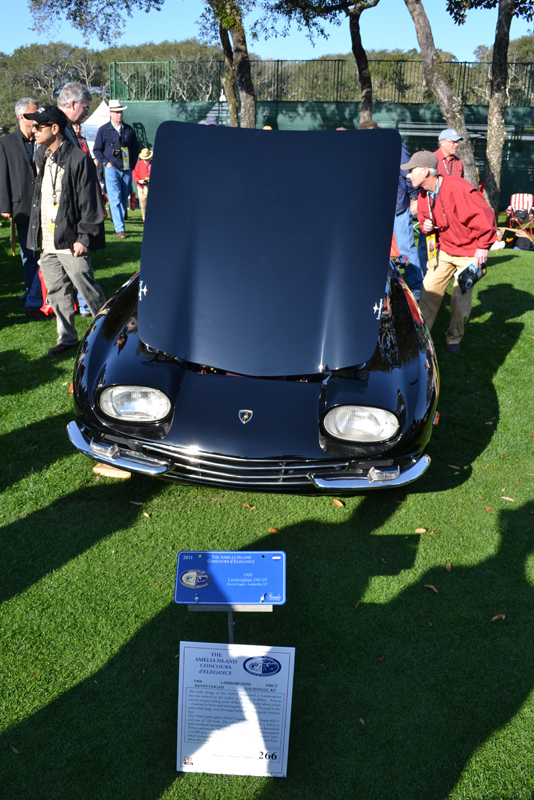 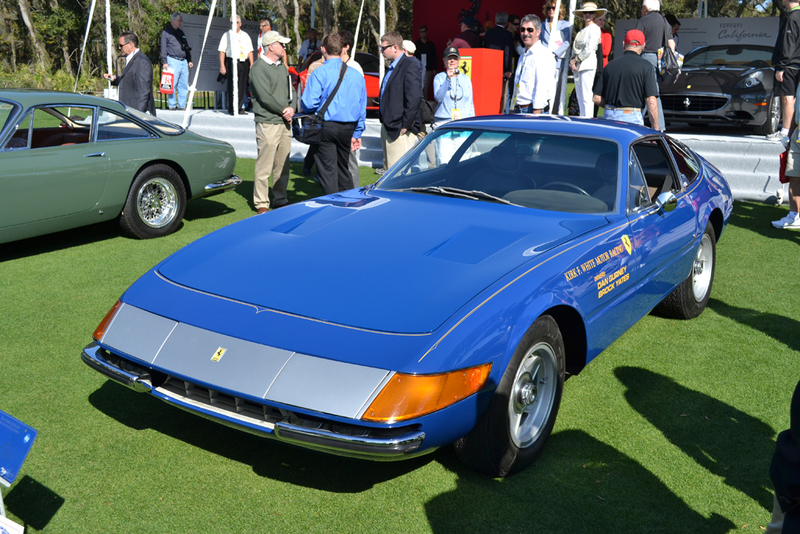 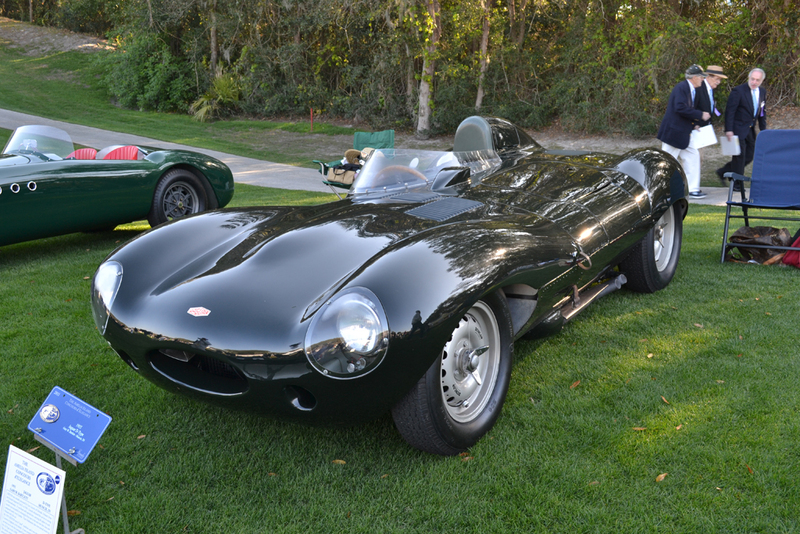 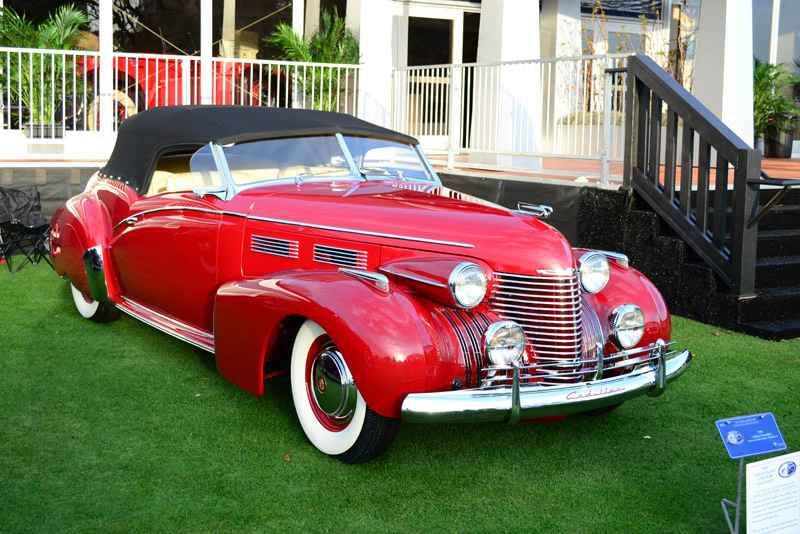 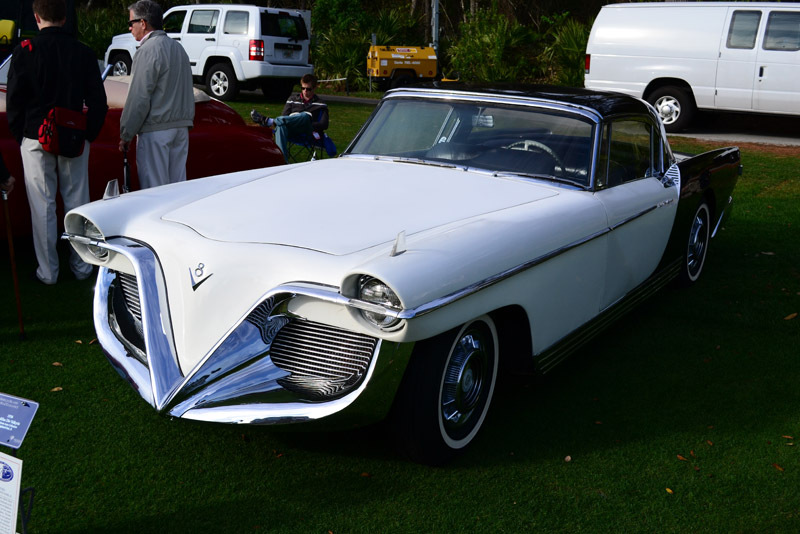 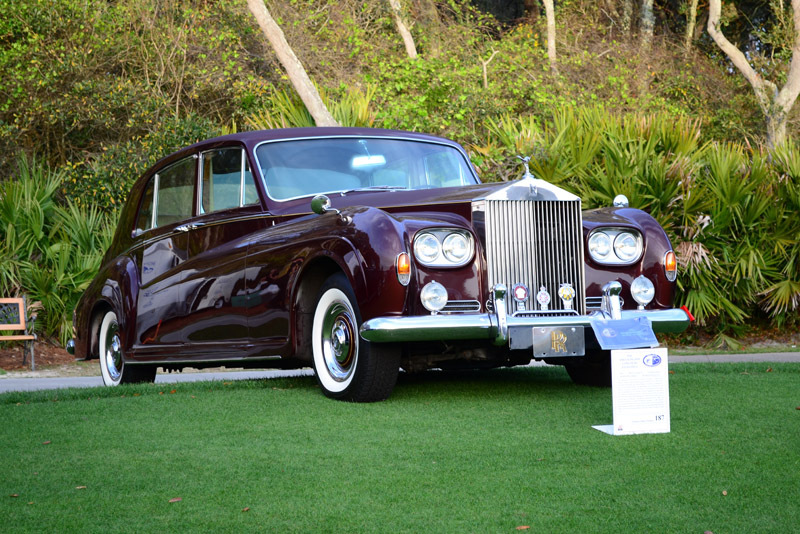 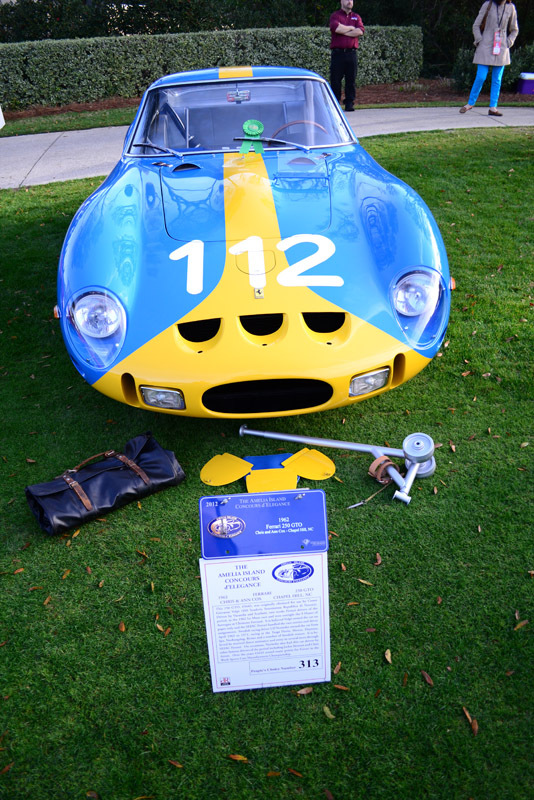 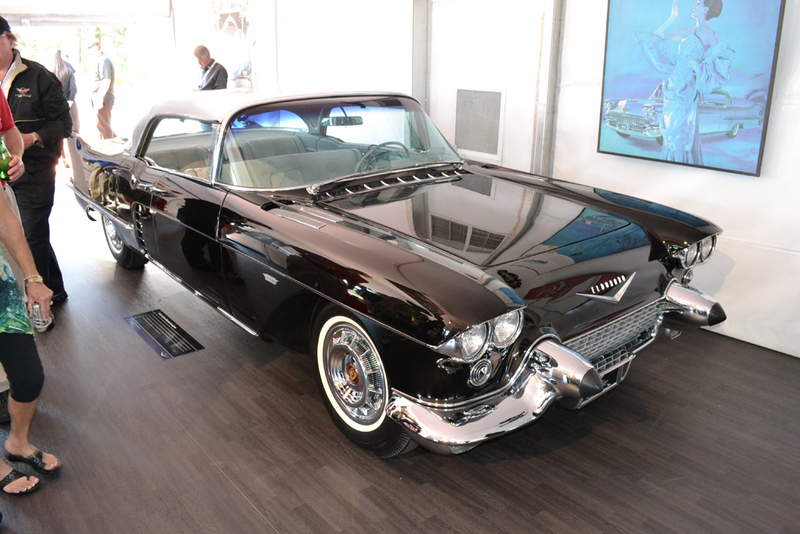 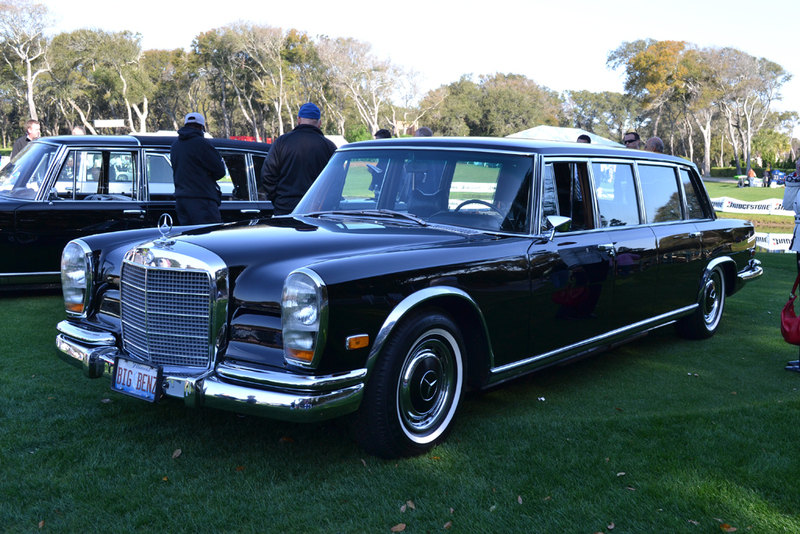 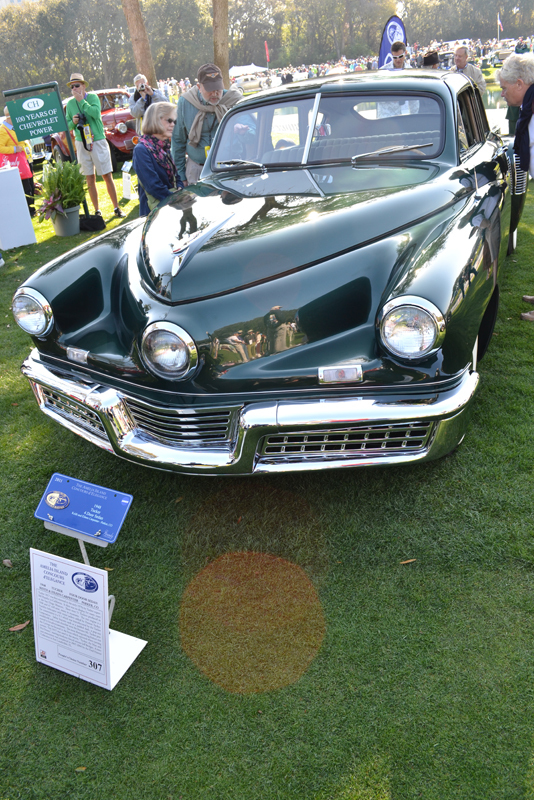 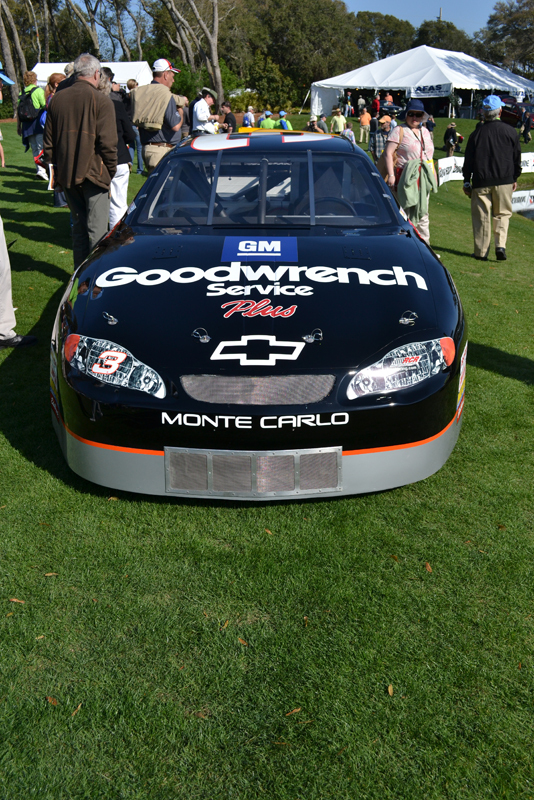 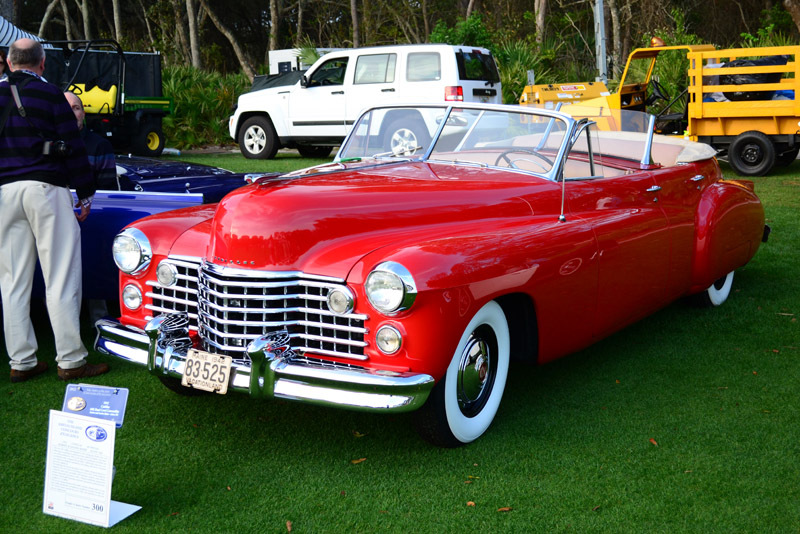 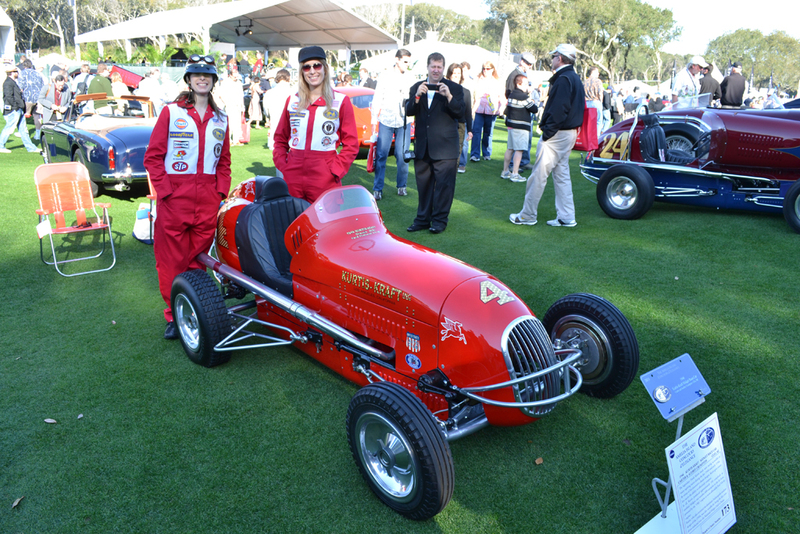 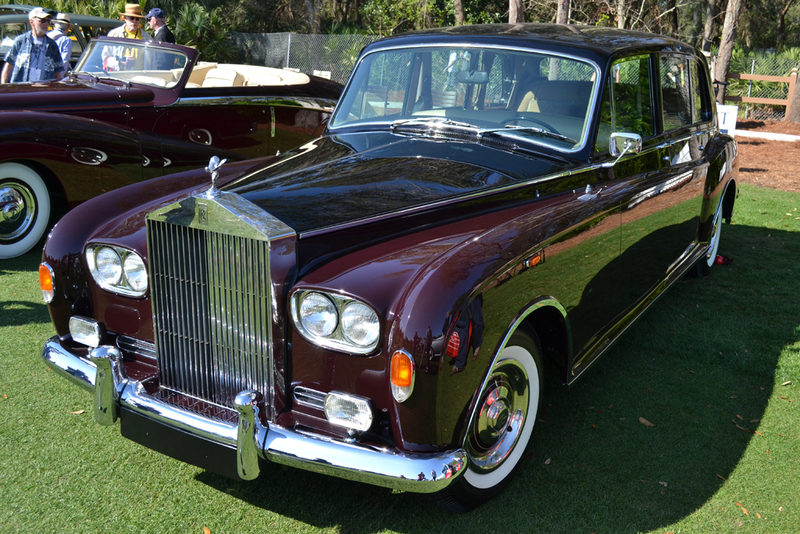 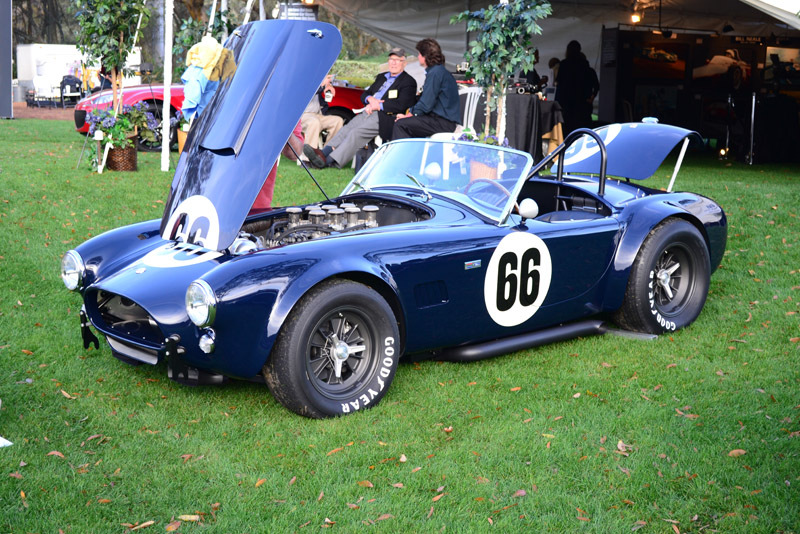 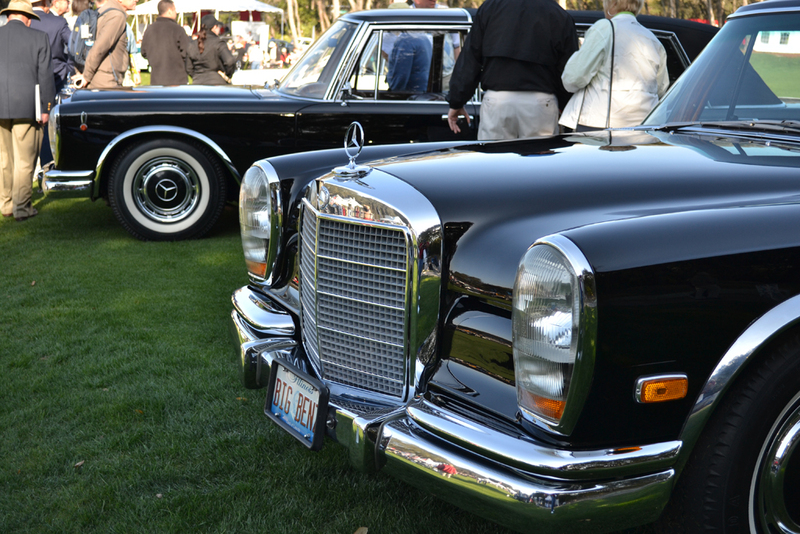 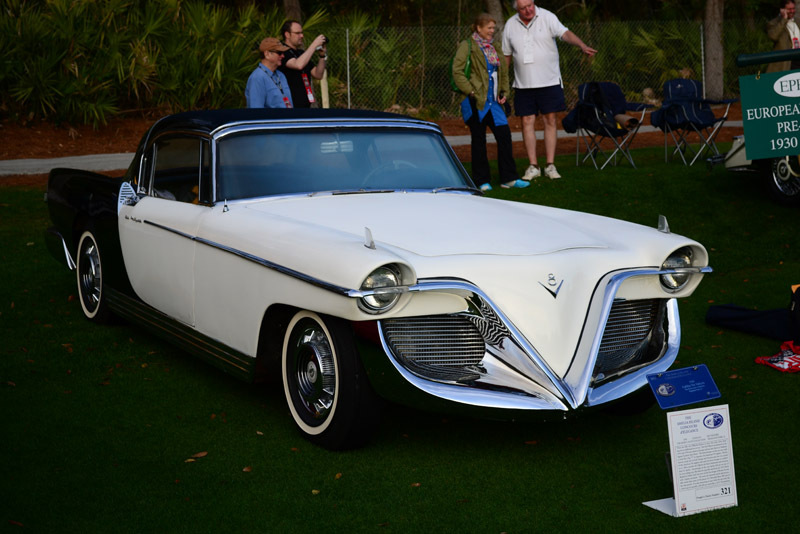 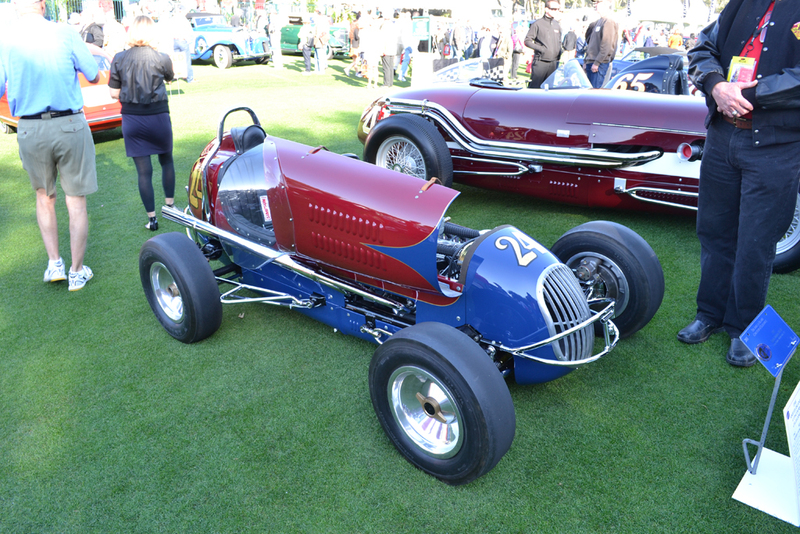 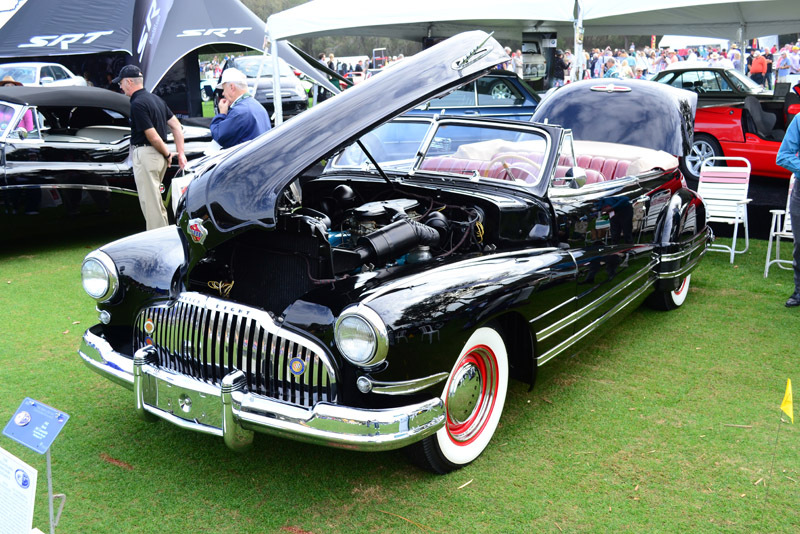 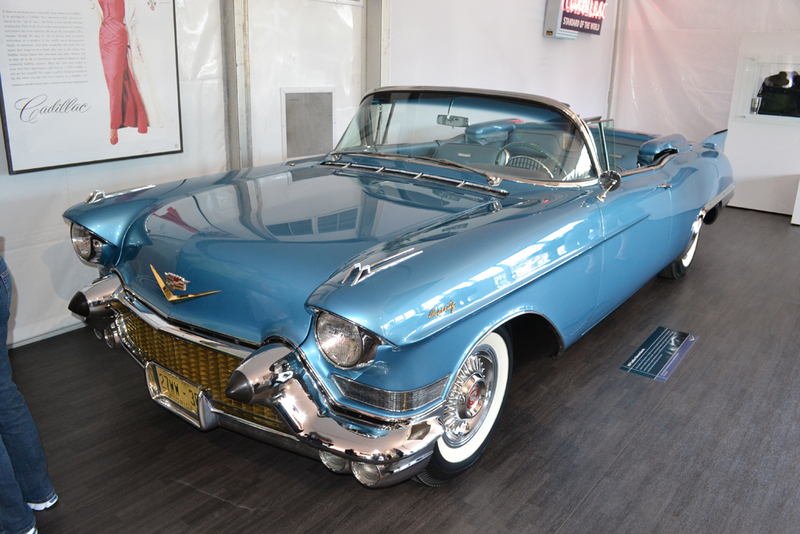 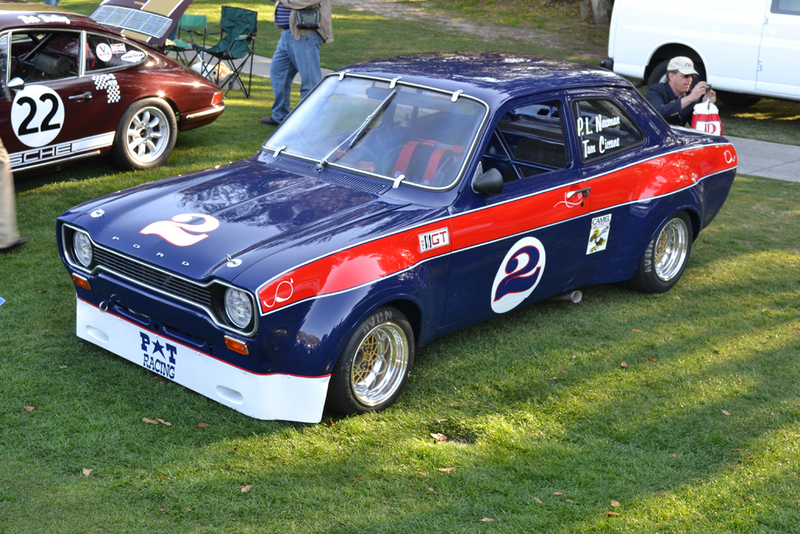 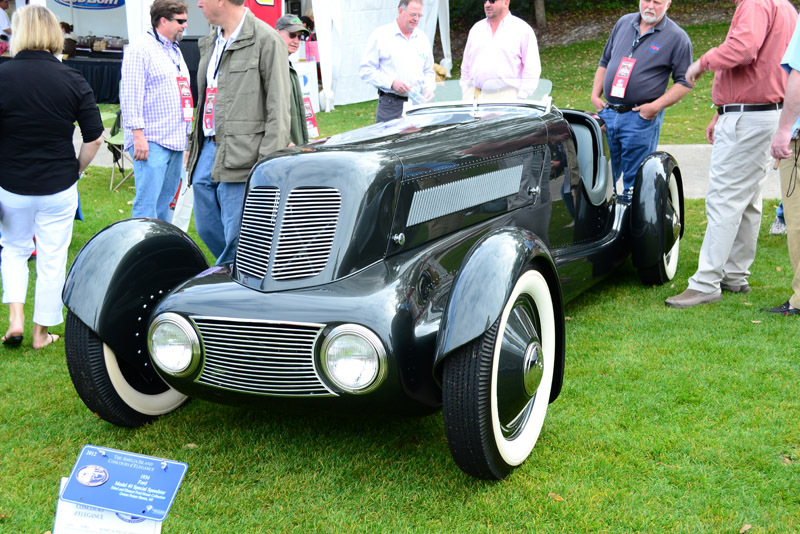 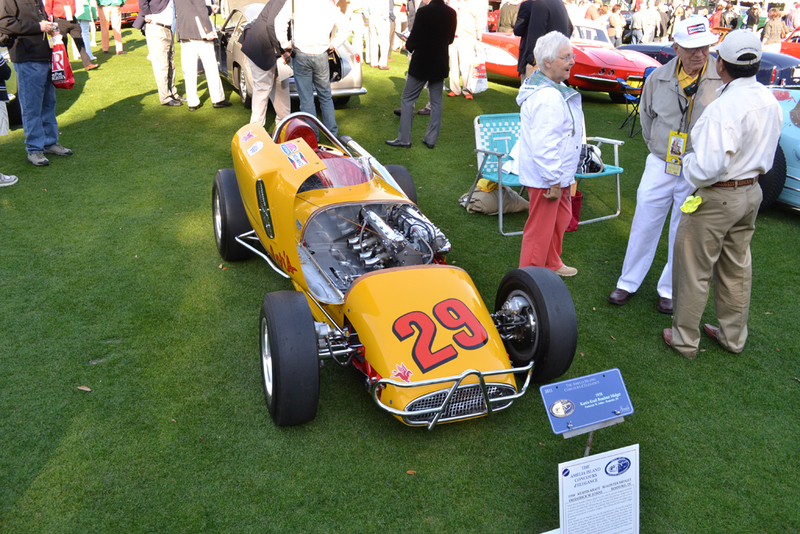 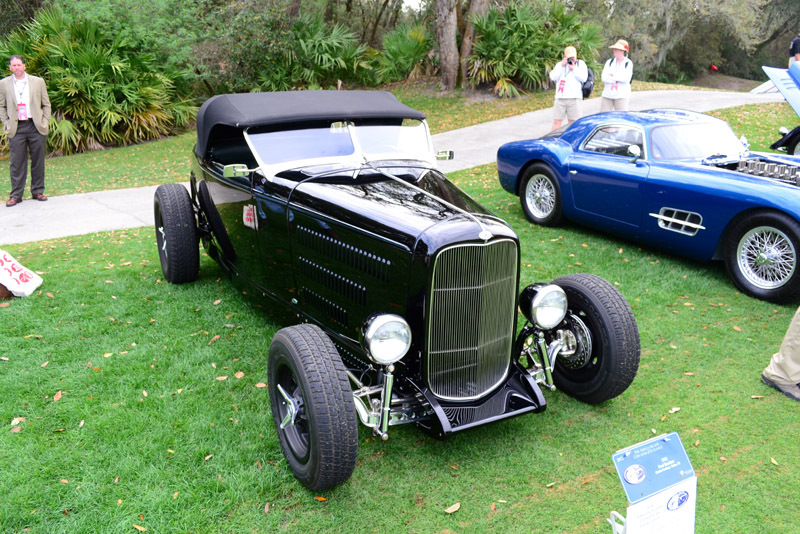 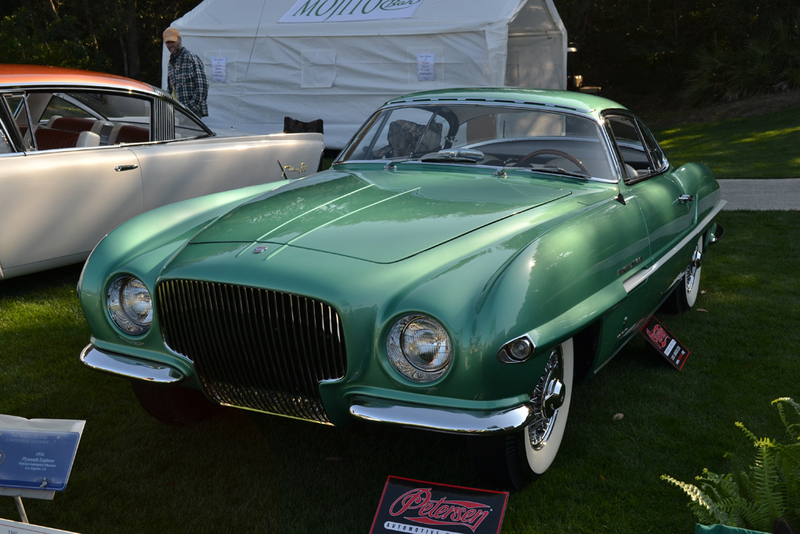 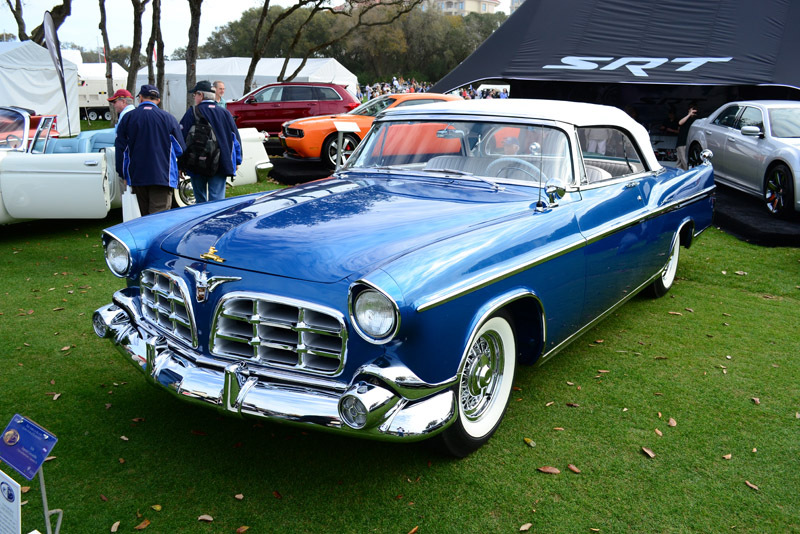 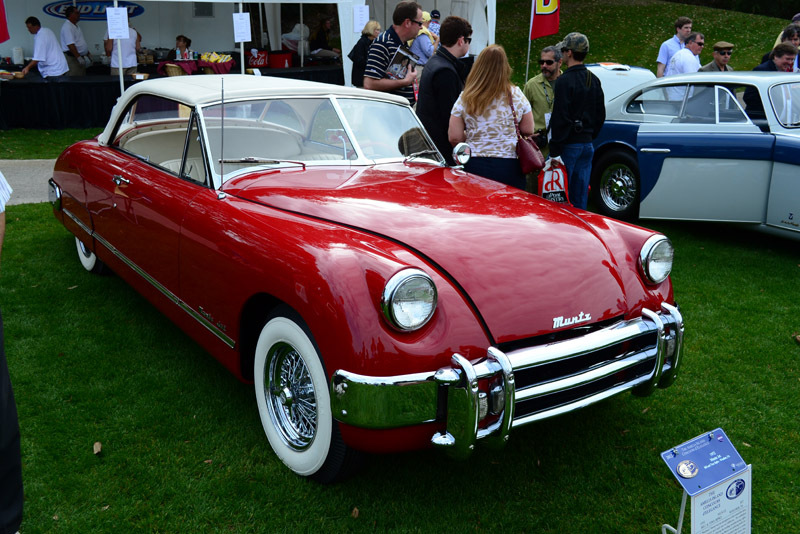 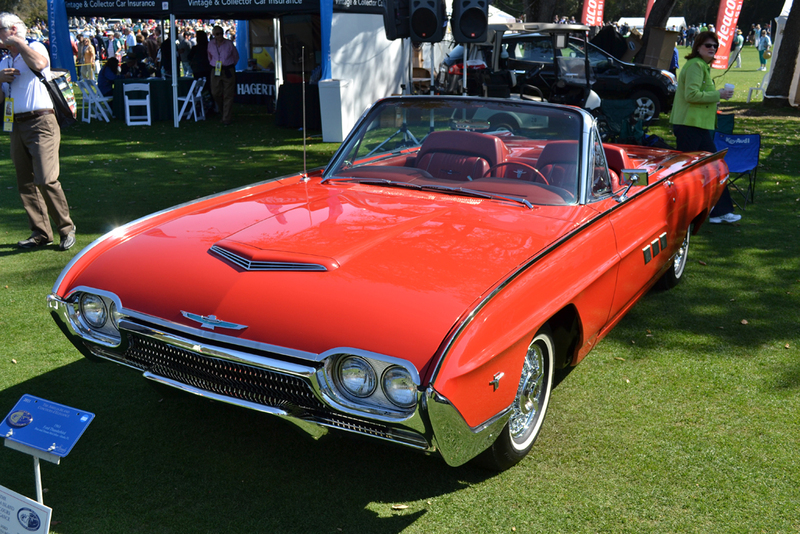 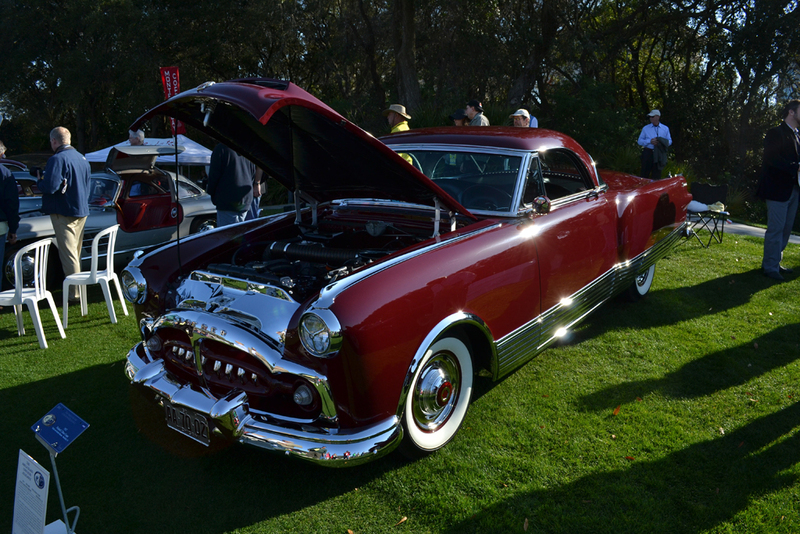 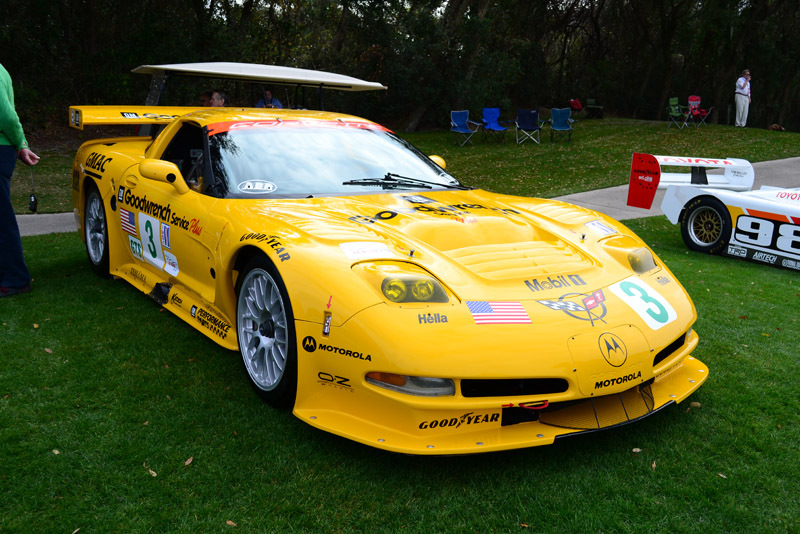 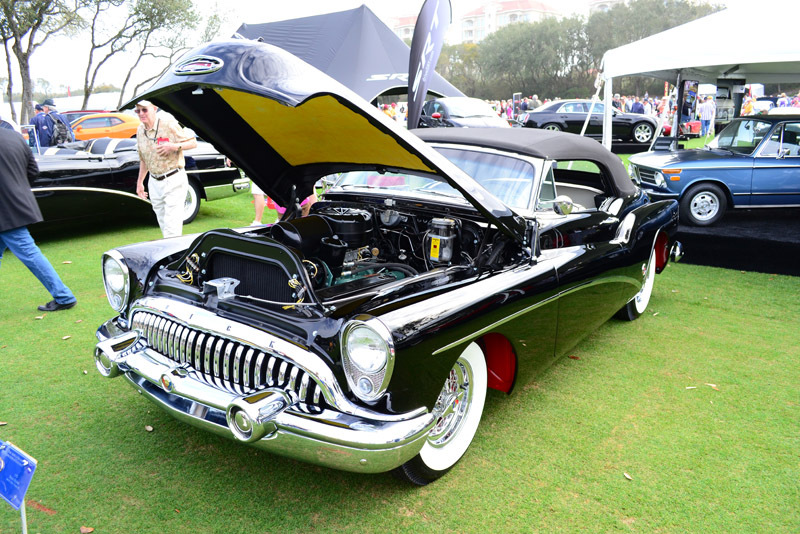 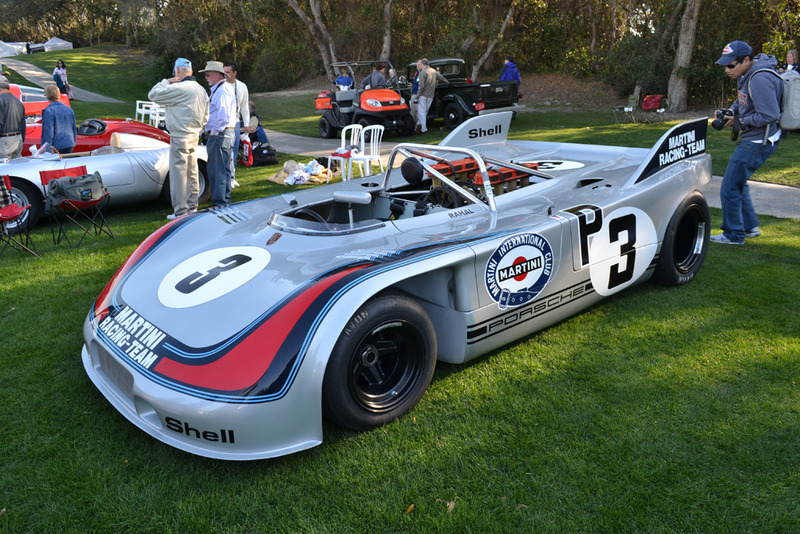 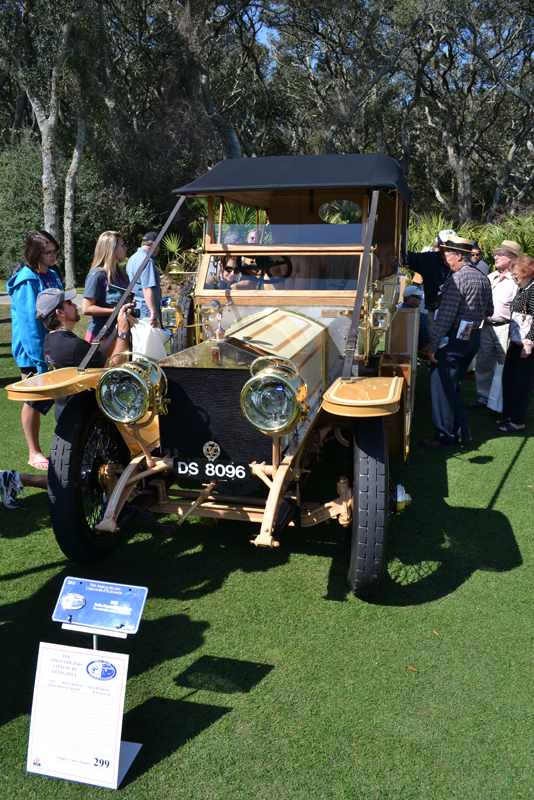 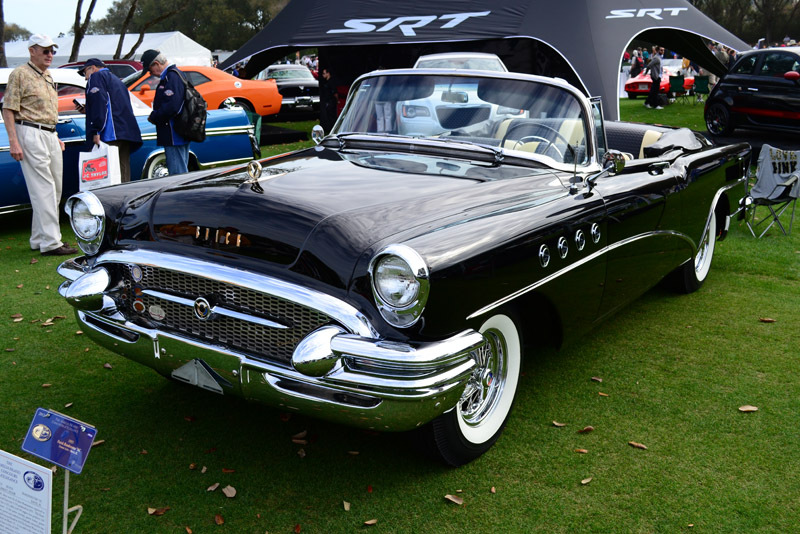 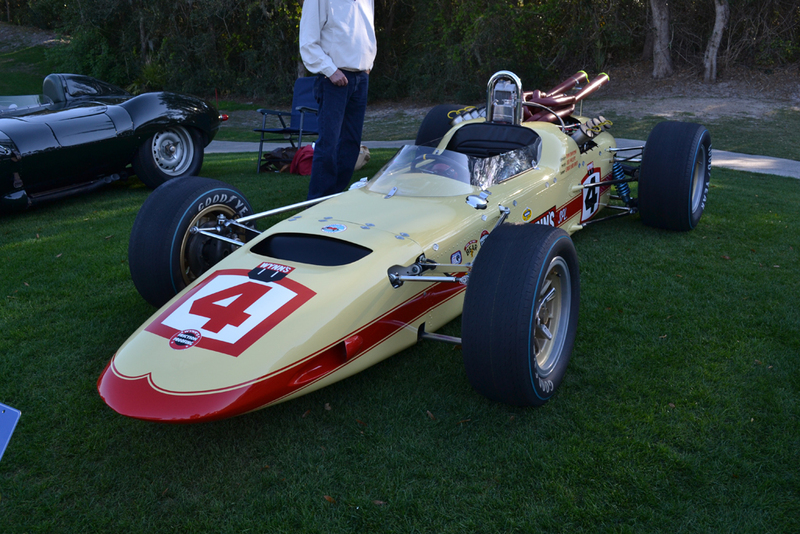 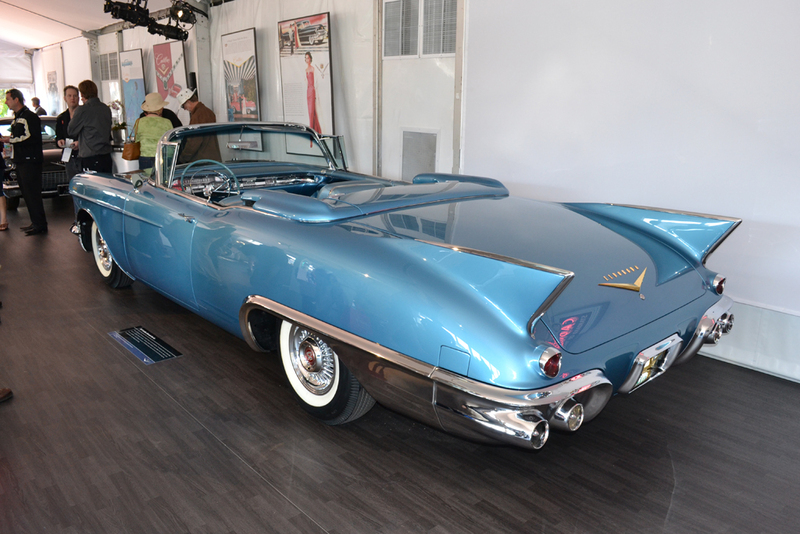 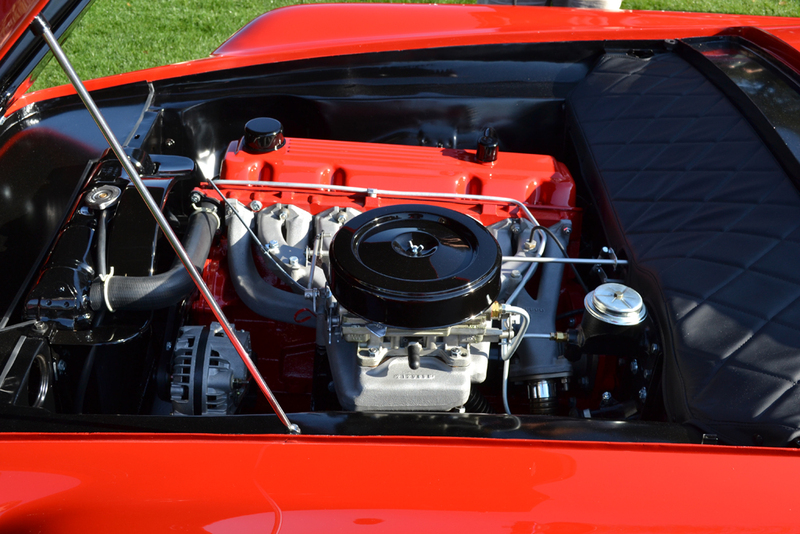 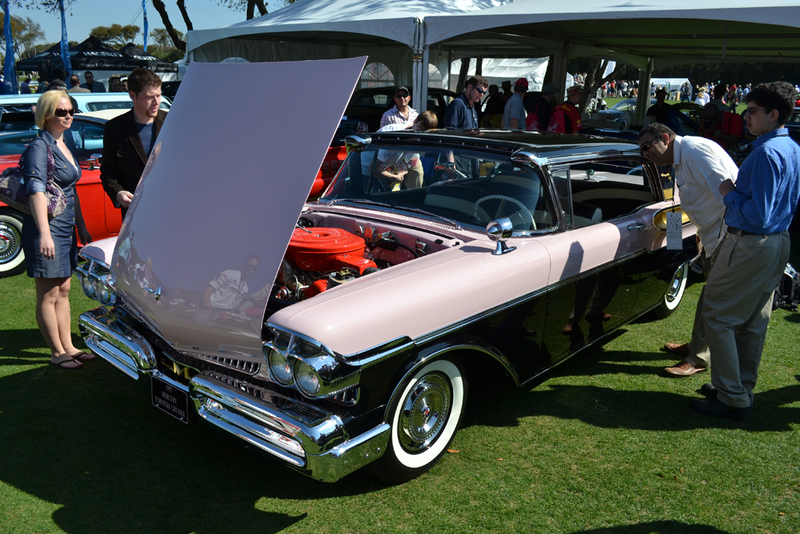 The many highlights were this year’s honorary chairman Bobby Rahal and all of the participating timeless vehicles found on the Ritz-Carlton lawn. 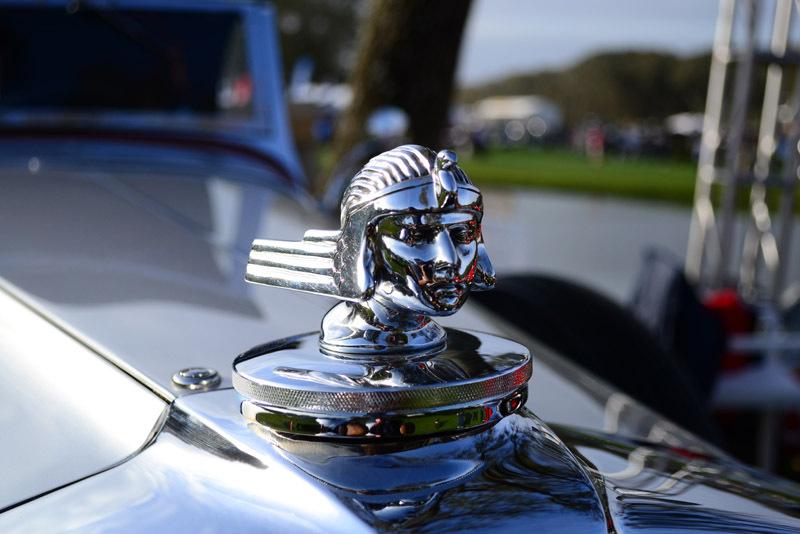 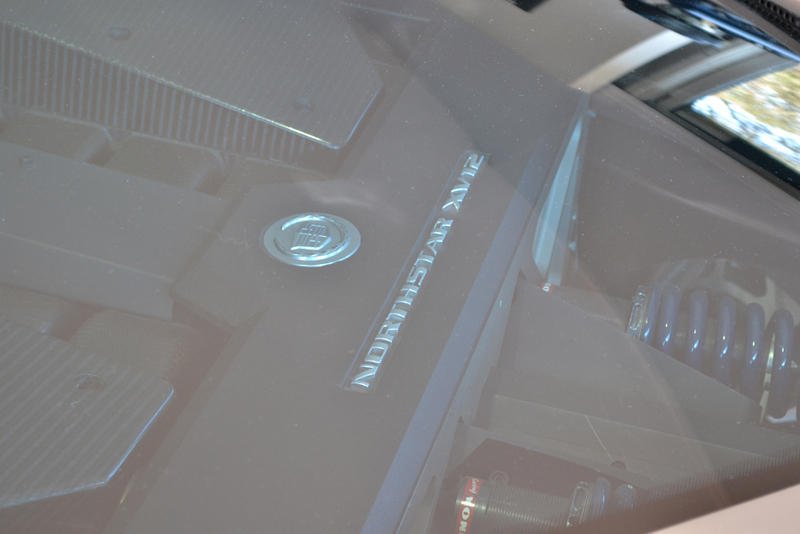 Some of the more notable modern day vehicles in the luxury and exotic realm were from Mereceds-Benz, BMW, Porsche, Aston Martin, Jaguar, Maserati, Ferrari, Rolls Royce, Cadillac, Infiniti and Bentley. 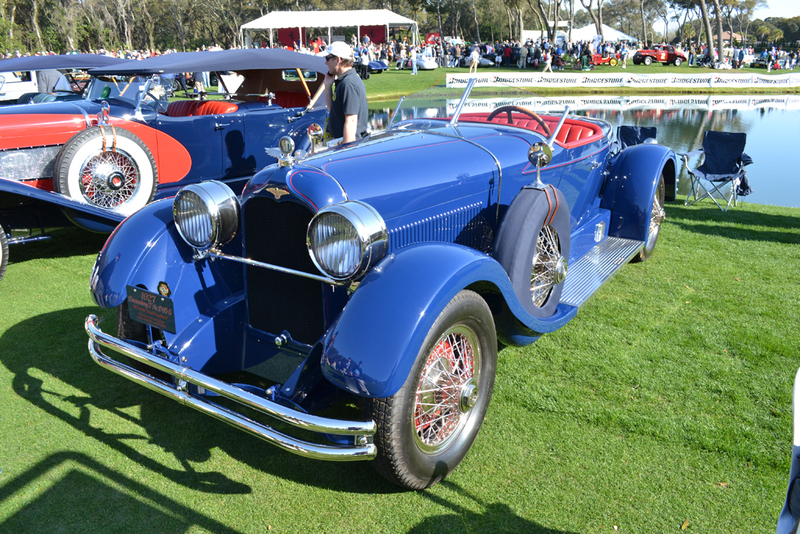 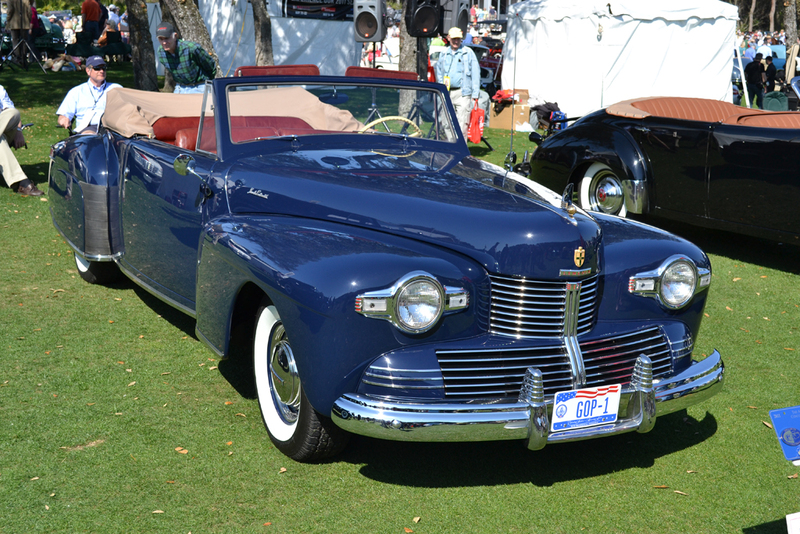 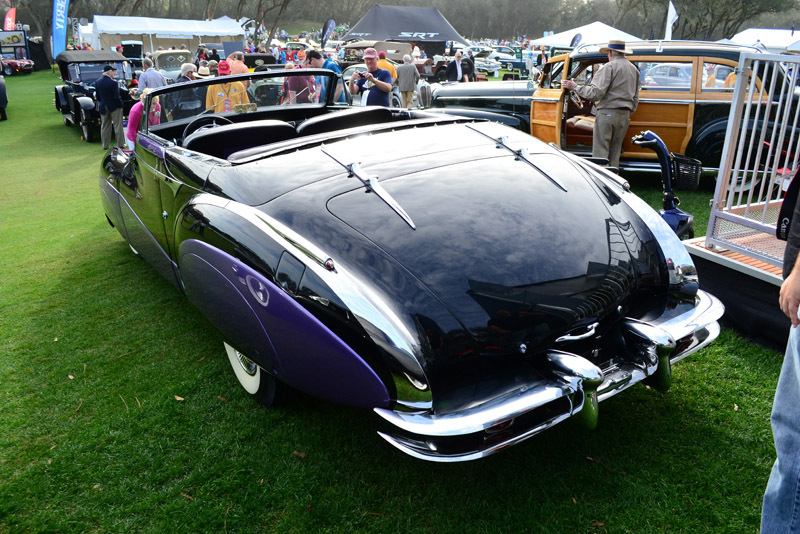 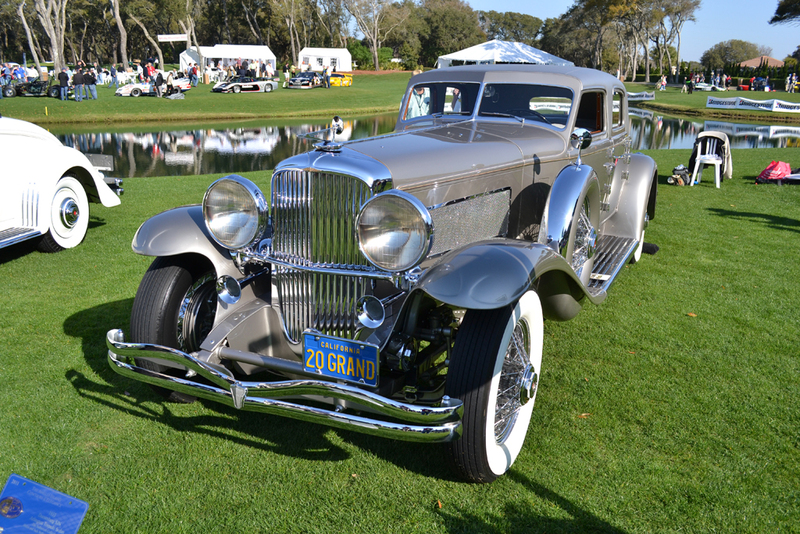 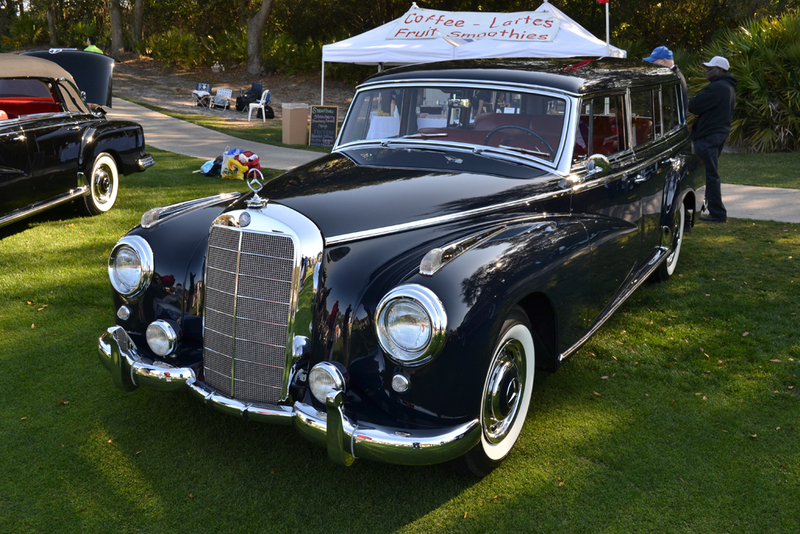 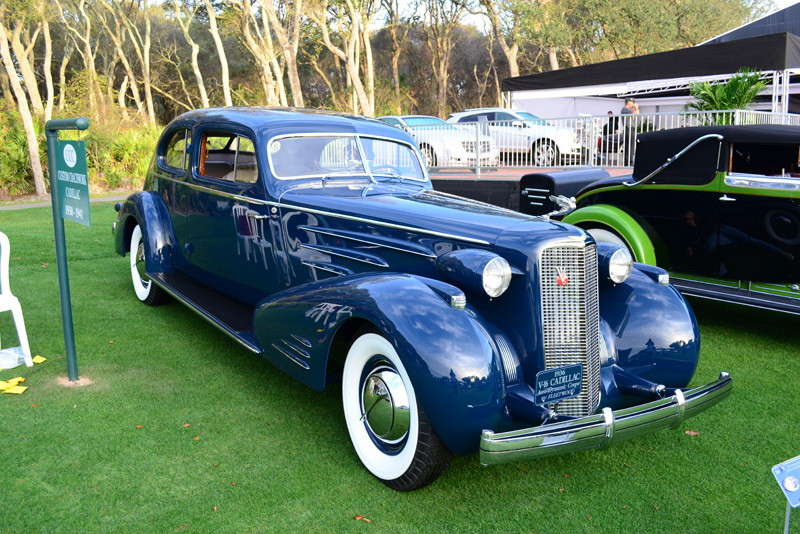 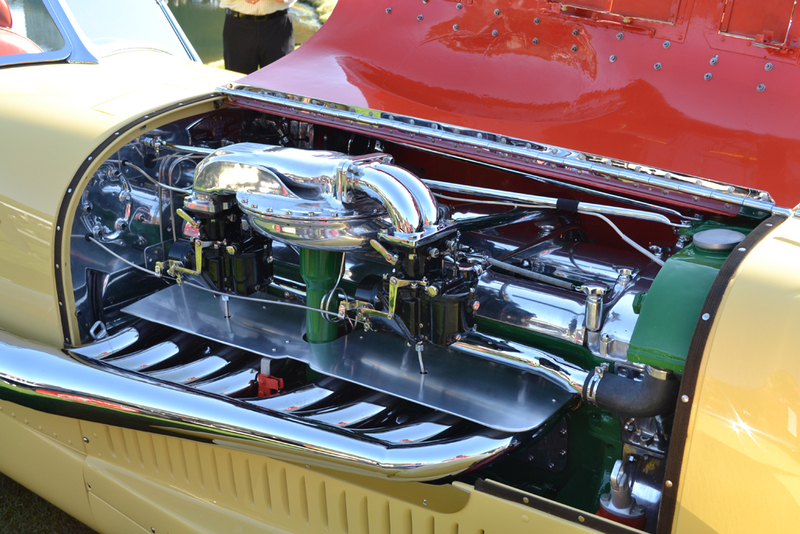 A wide array of classics dominated the field from the likings of Bugatti, Duesenberg, Rolls Royce, Allard, Cadillac, Lincoln, Chevrolet, Kurtis, Packard, Plymouth, Tucker and several others totaling to over 300 cars in all. 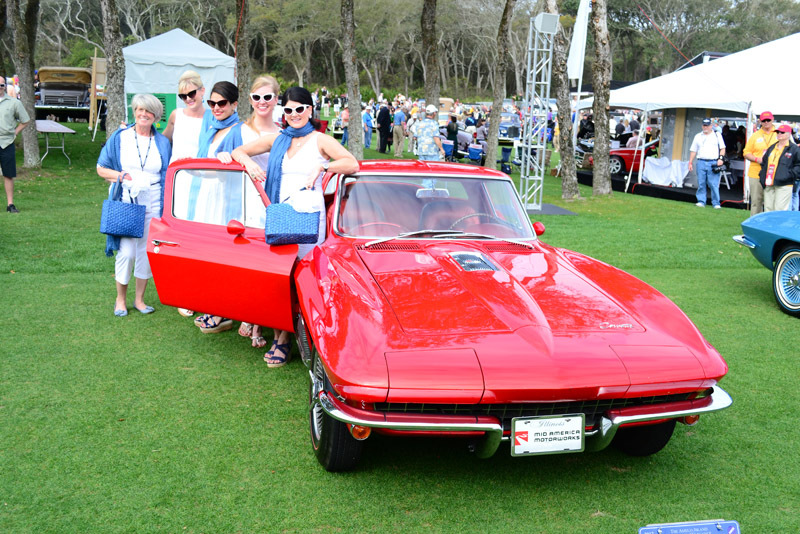 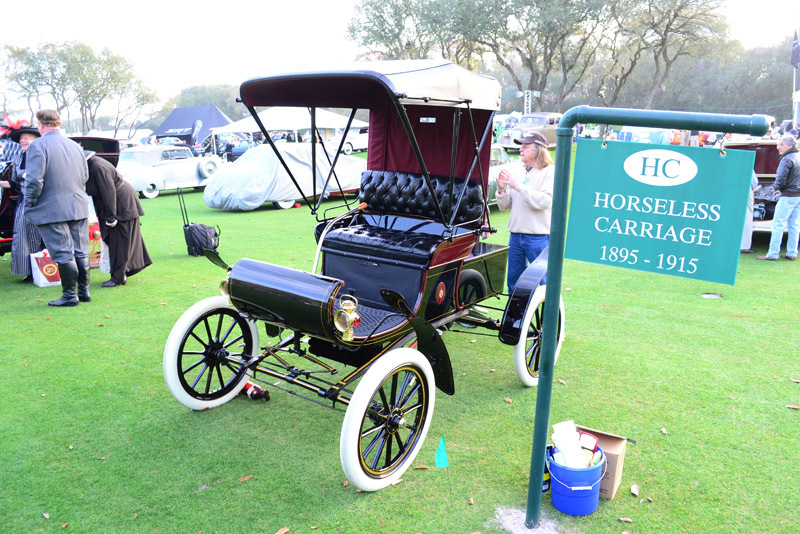 For 2011 the Amelia Island Concours d’Elegance benefited Community Hospice of Northeast Florida Inc. Other charities and vendors were on hand to commemorate this truly remarkable event. 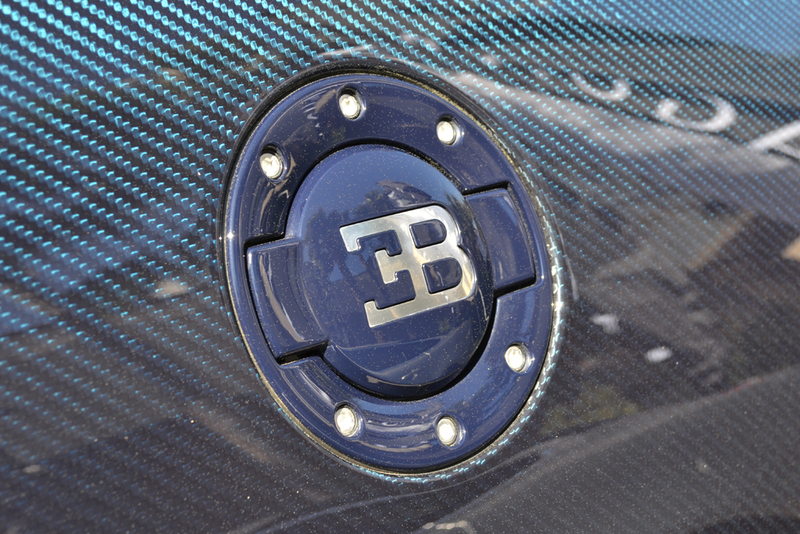 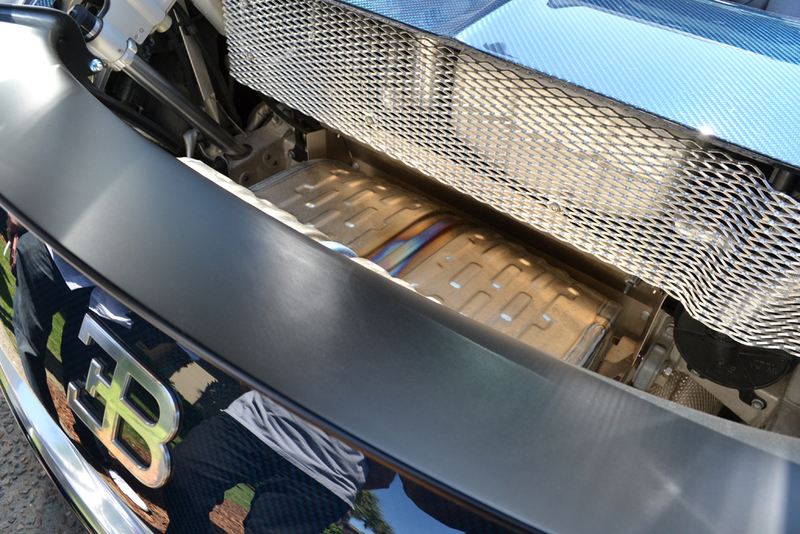 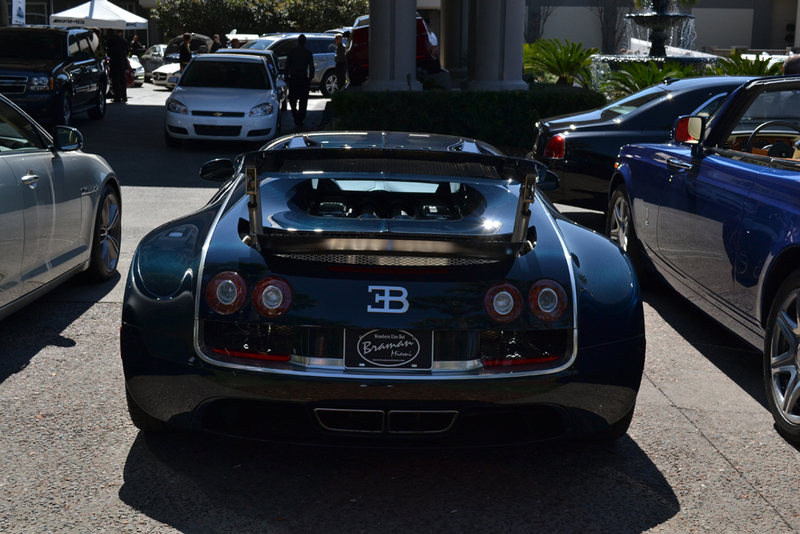 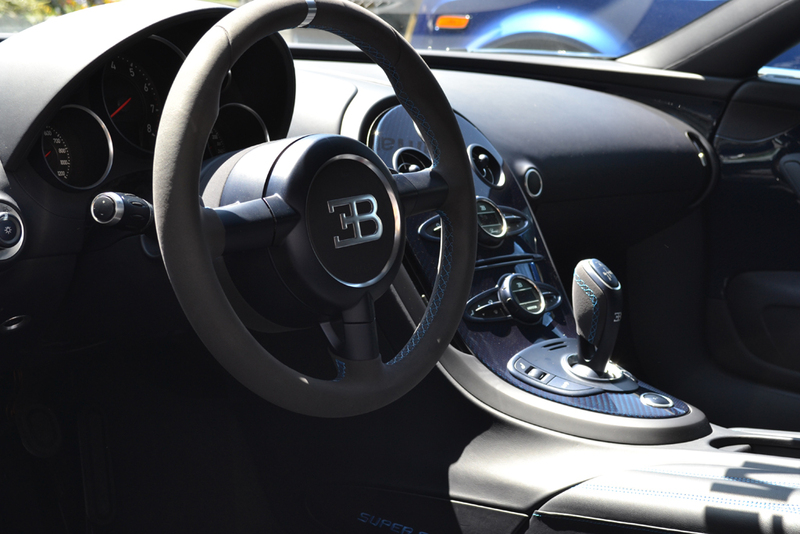 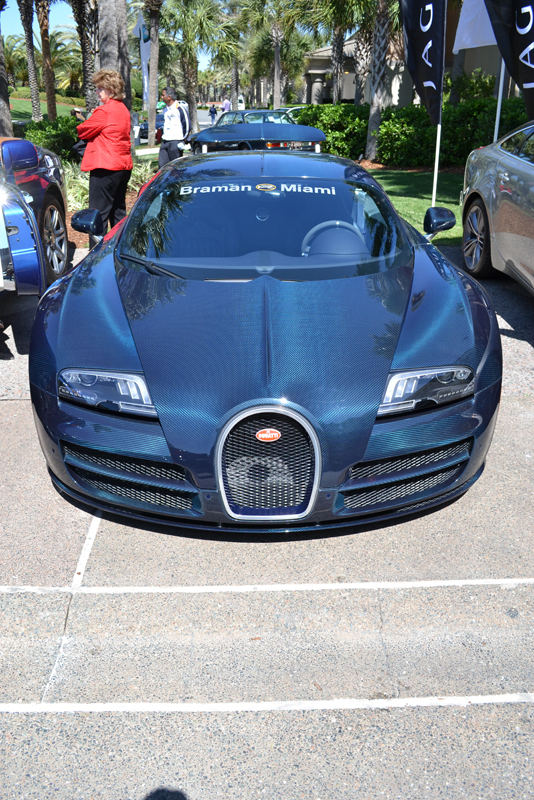 To round out the filed, the new Bugatti Veyron Super Sport made an appearance near the entrance of the Ritz hotel. 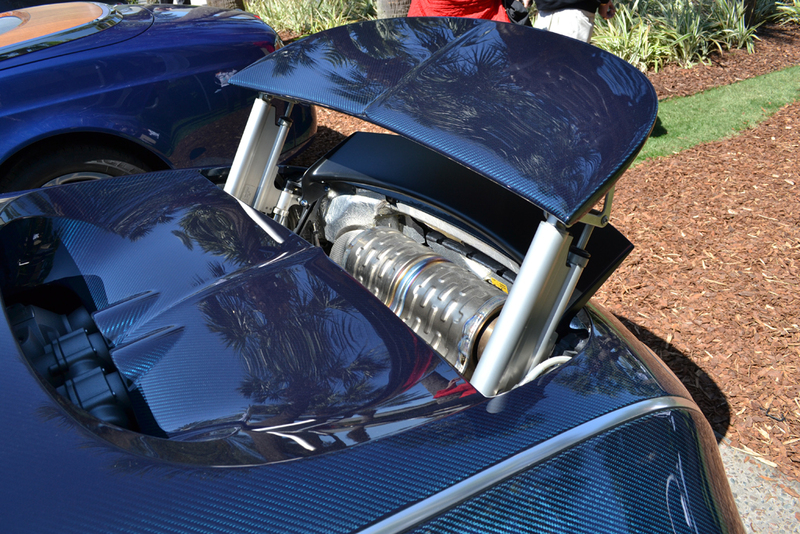 Onlookers were in for a treat as this is touted as the world’s fastest production car clocked at an astonishing 268 miles per hour. 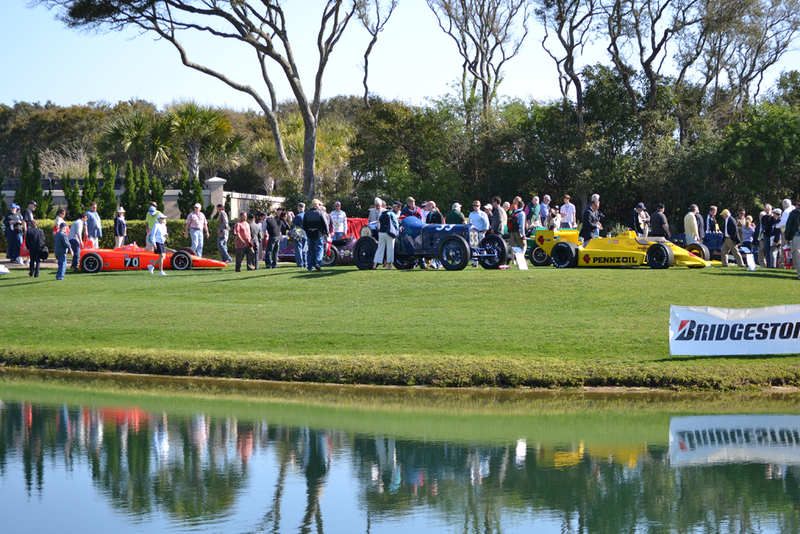 We will continue to look forward to great car events throughout the year as the Amelia Island Concours d’Elegance remains to be one of the more prestigious venues to date. 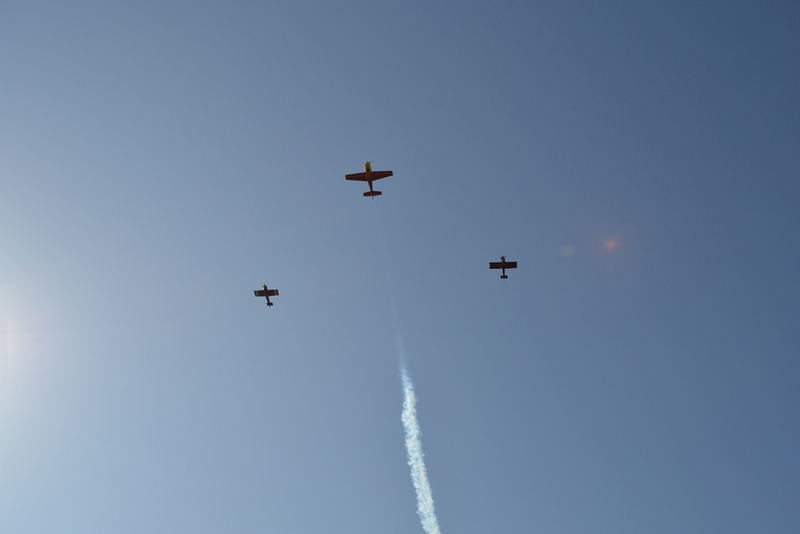 Enjoy the plentiful images that we were able to capture below.